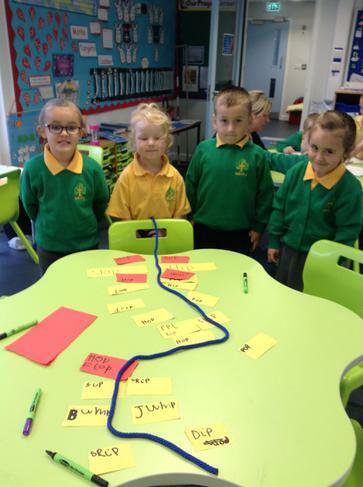 Rabbit Class Spellings - Changes! 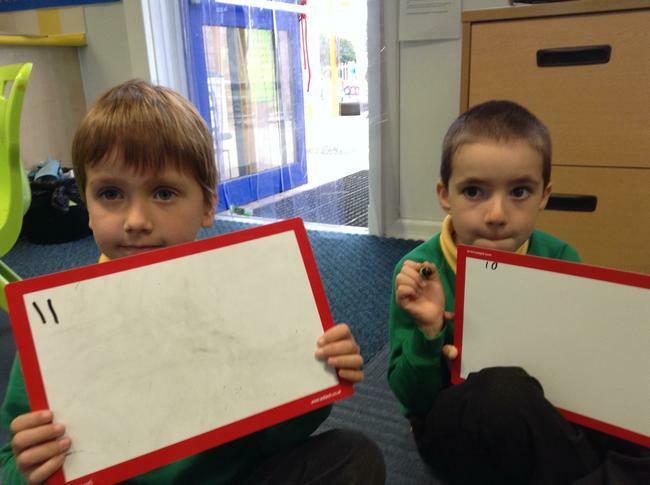 In order to help the children with practicing their spellings regularly we have decided to send home an A4 sheet each week which has their weekly spellings and a space to practice them. 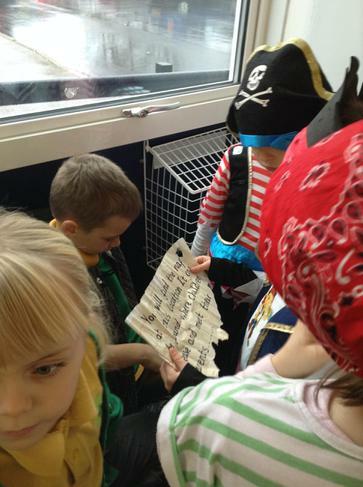 We will be sending this sheet home instead of using the little blue books and expect these spelling sheets to come back the following week. 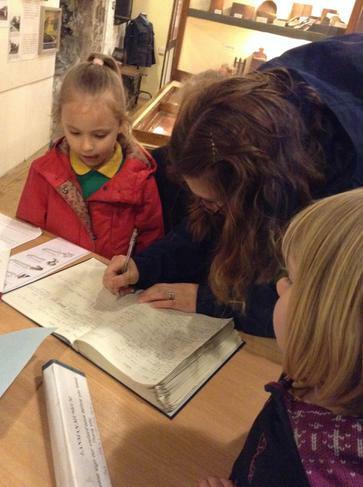 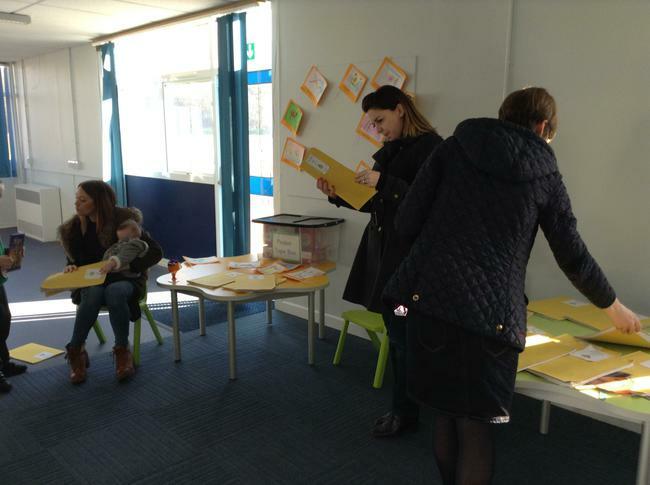 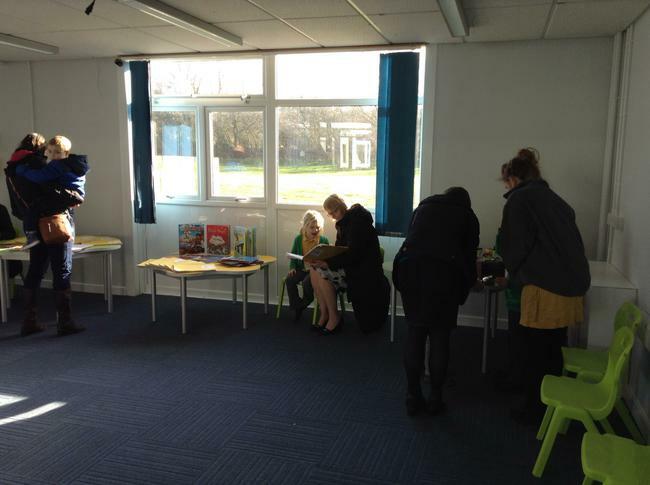 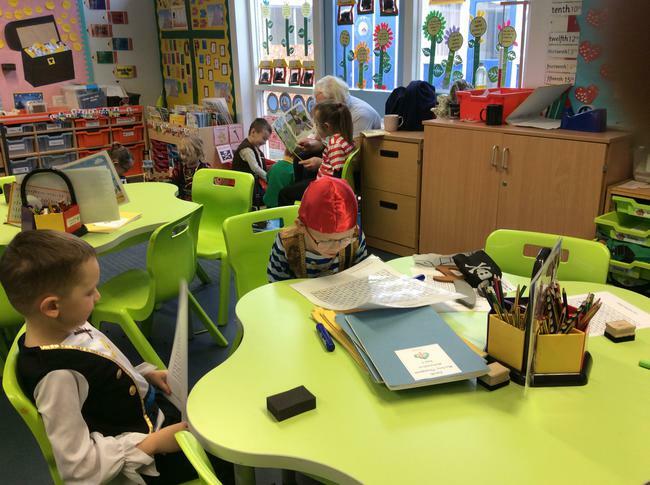 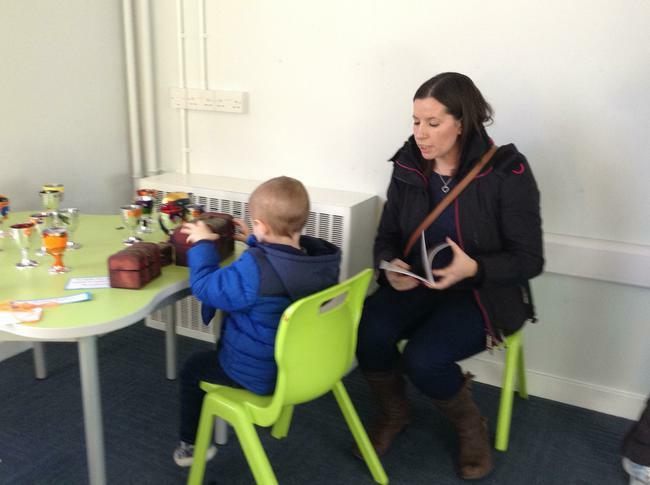 The blue books will still be used to test the children in, so that you can see your child’s score and which spellings they may have got incorrect. 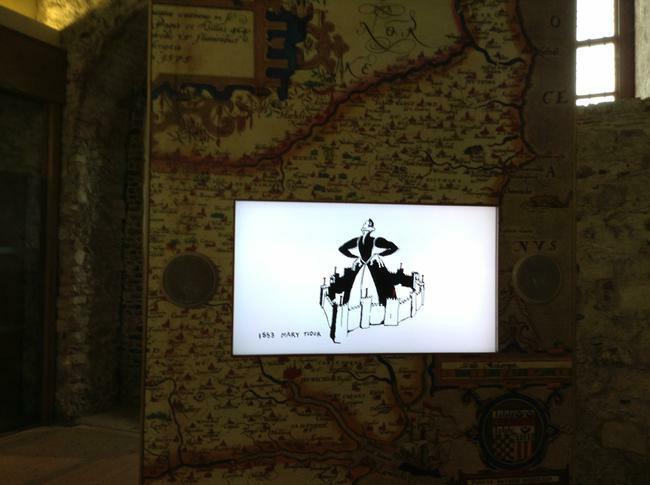 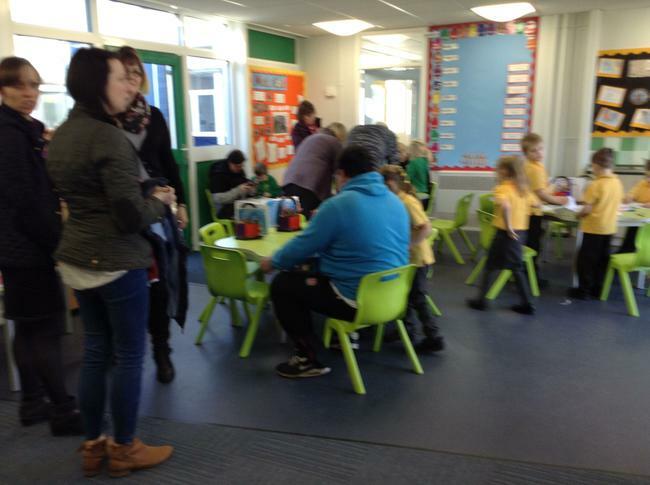 If you have any questions regarding this matter, please do not hesitate to ask. 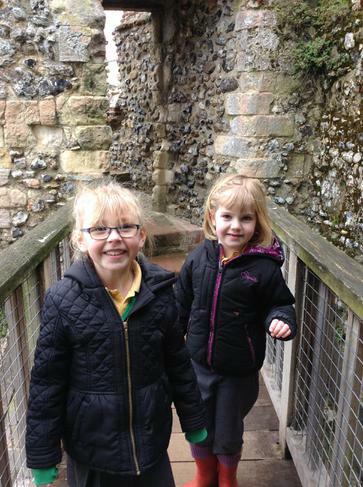 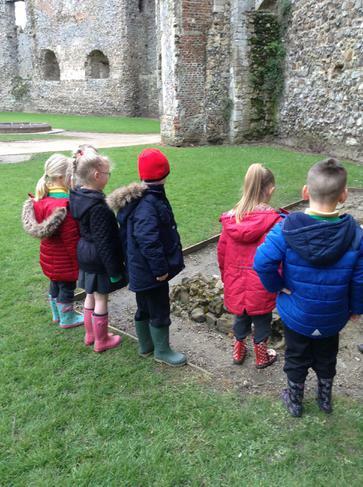 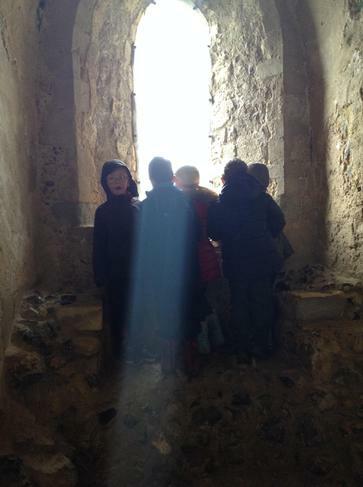 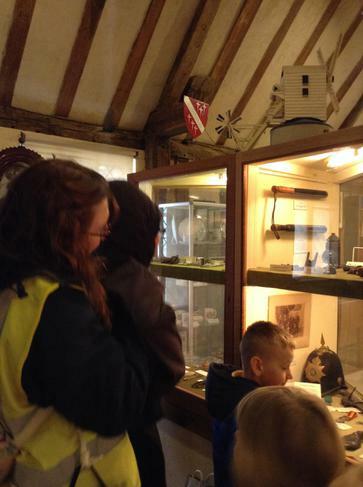 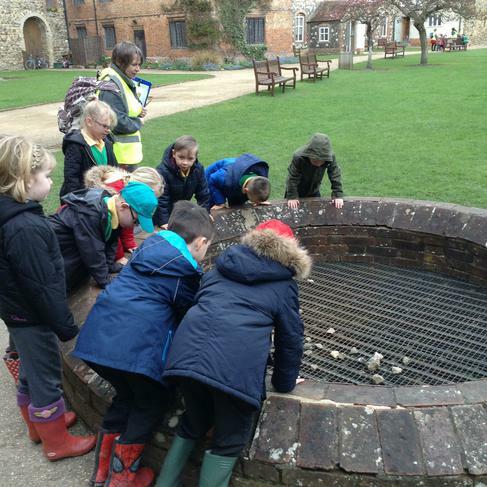 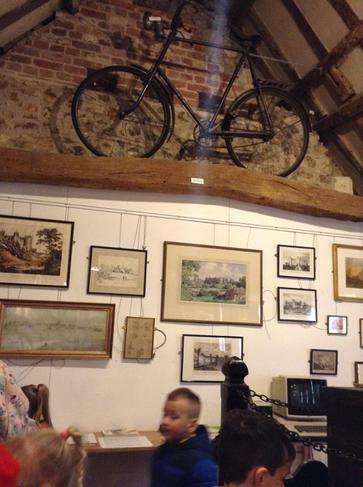 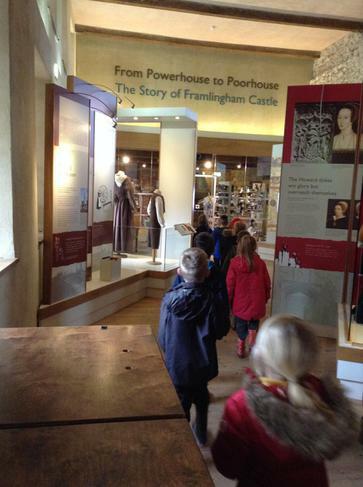 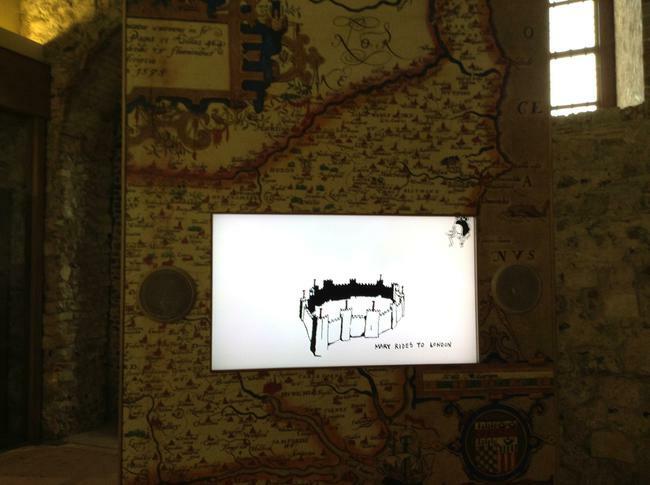 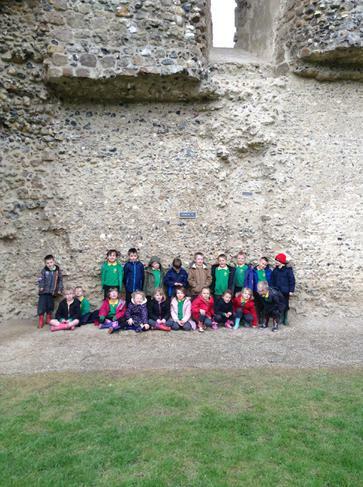 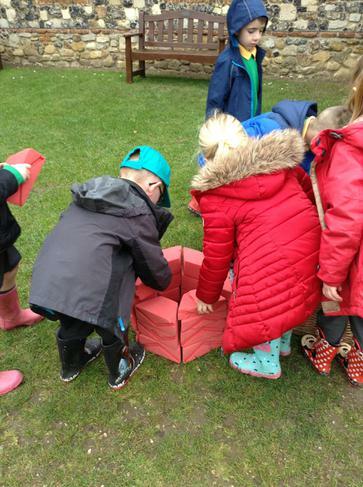 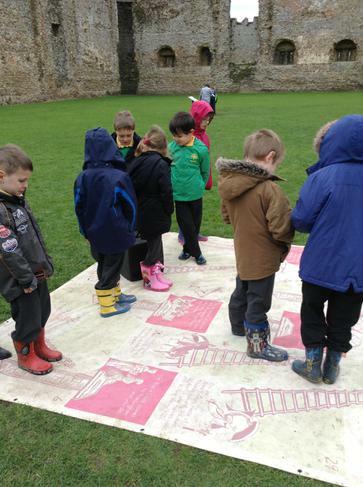 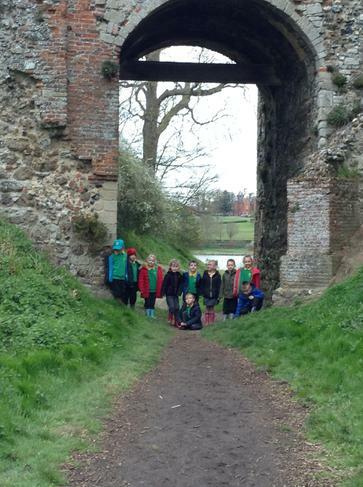 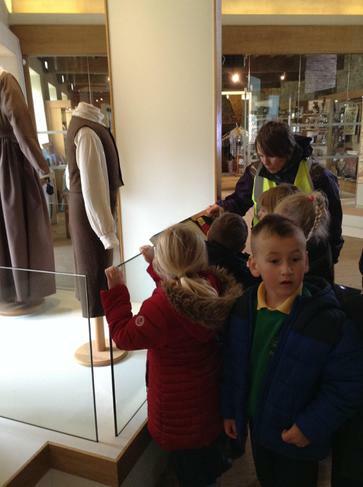 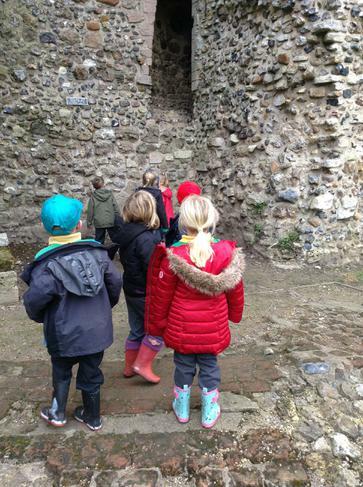 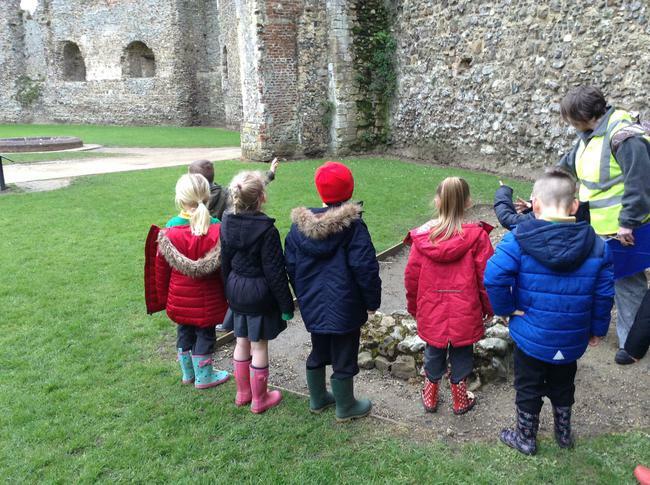 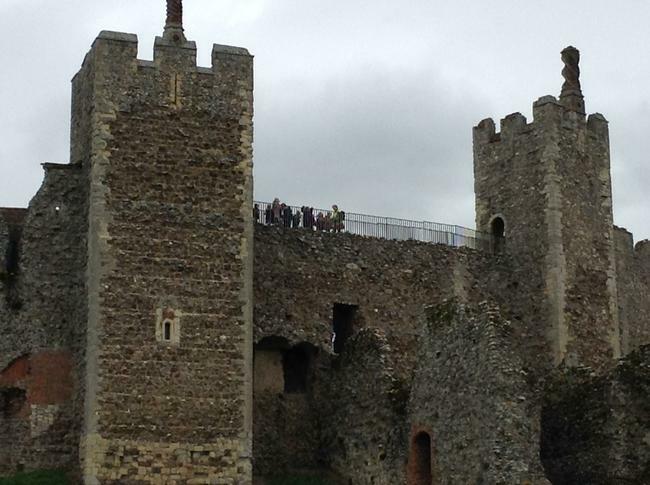 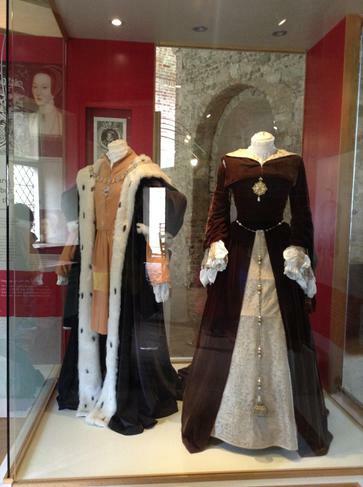 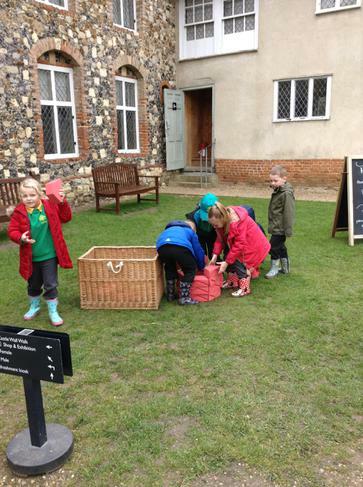 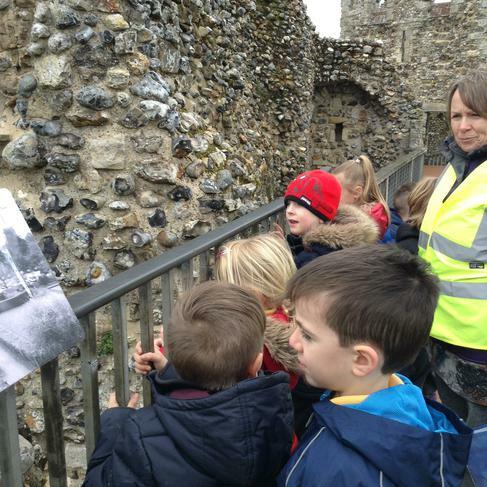 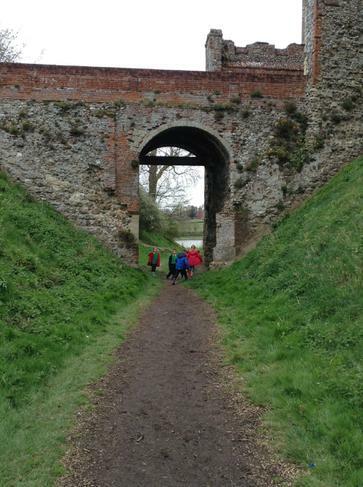 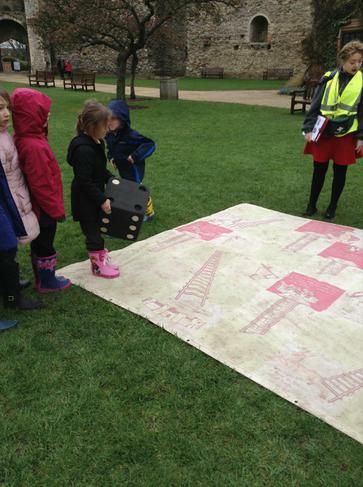 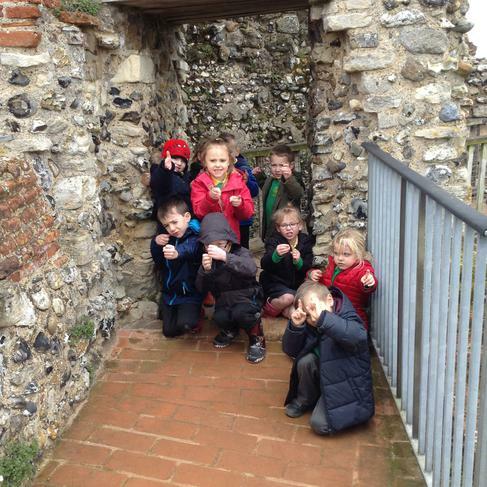 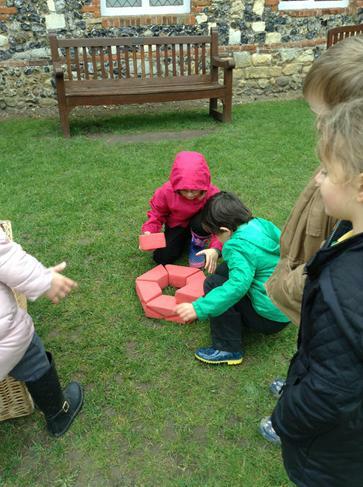 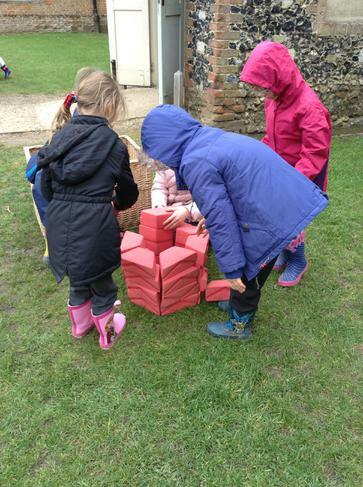 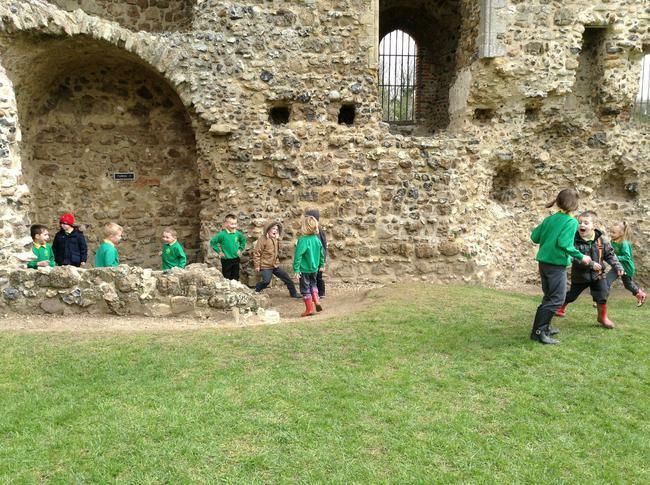 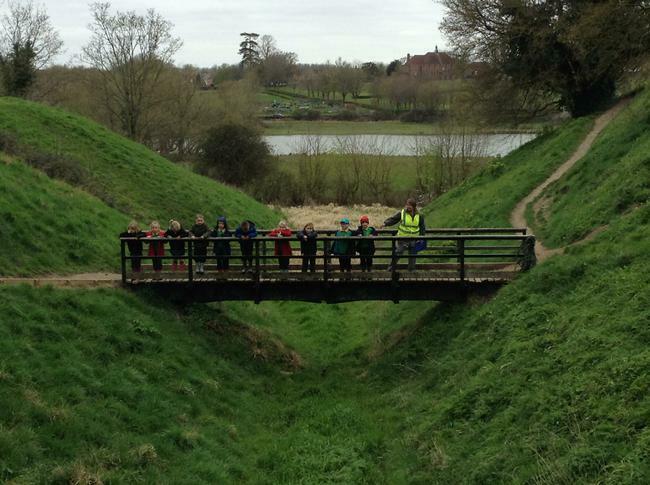 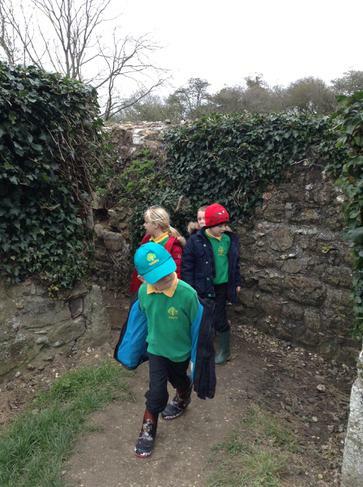 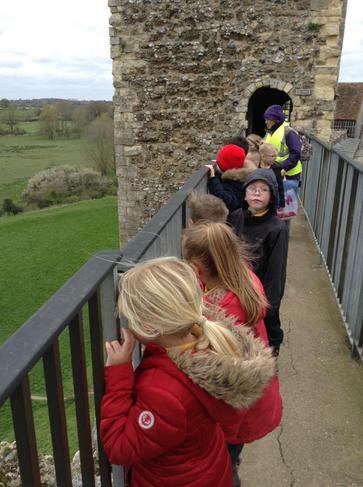 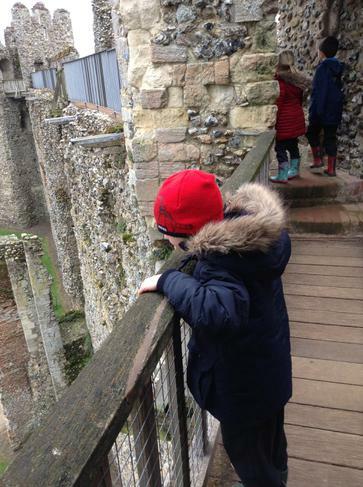 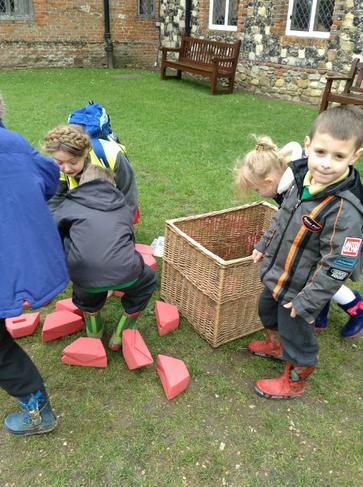 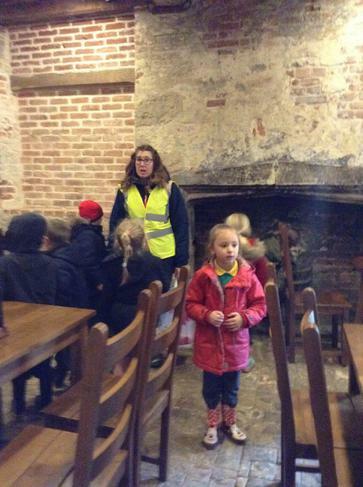 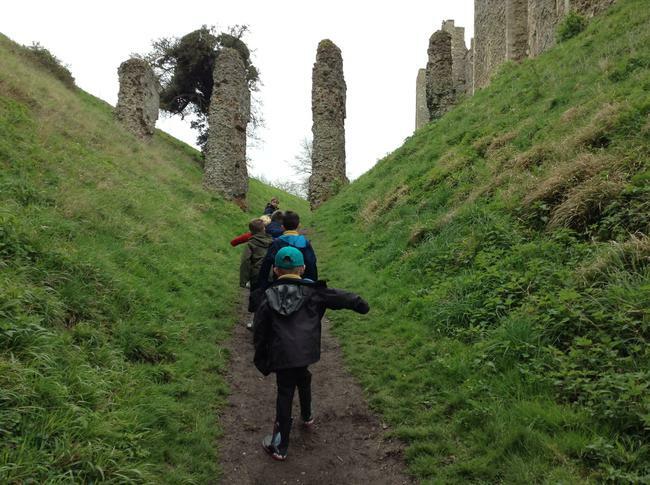 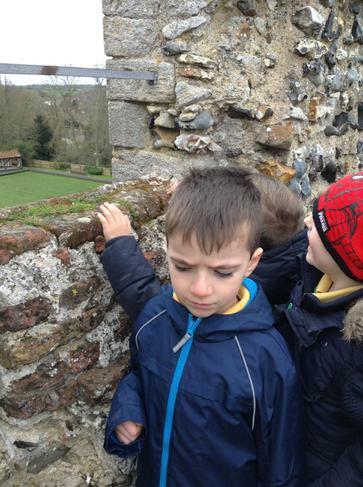 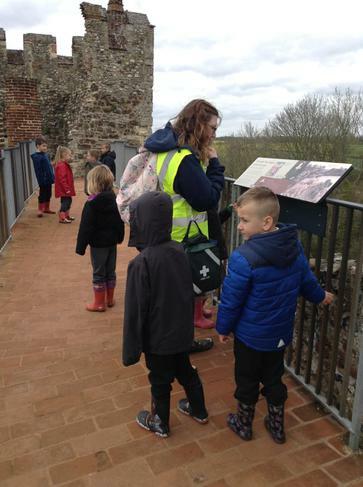 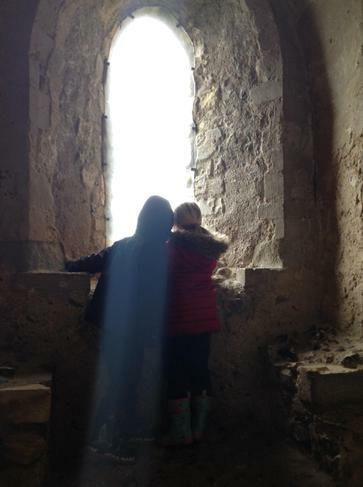 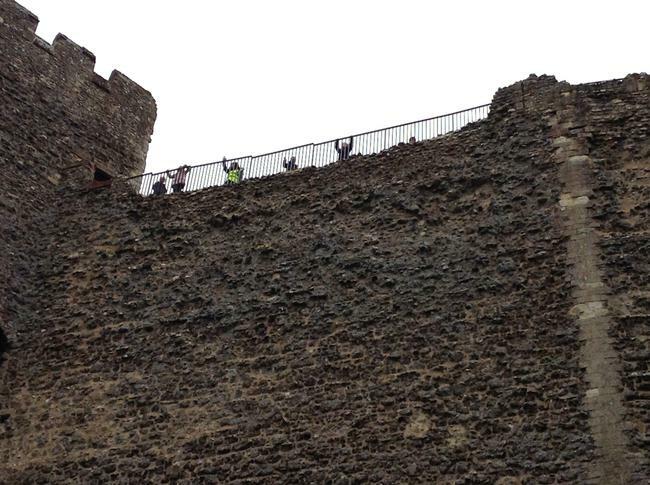 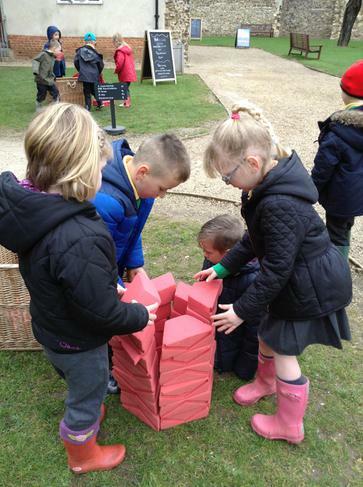 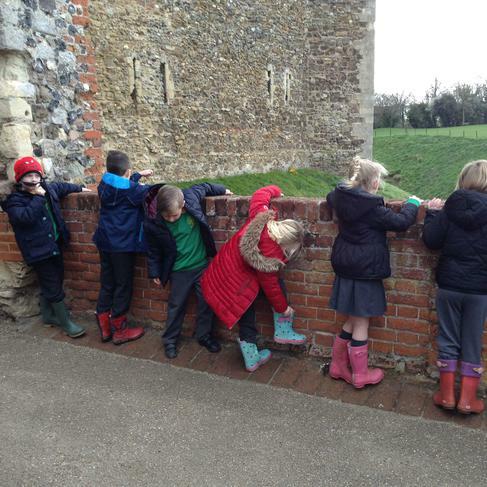 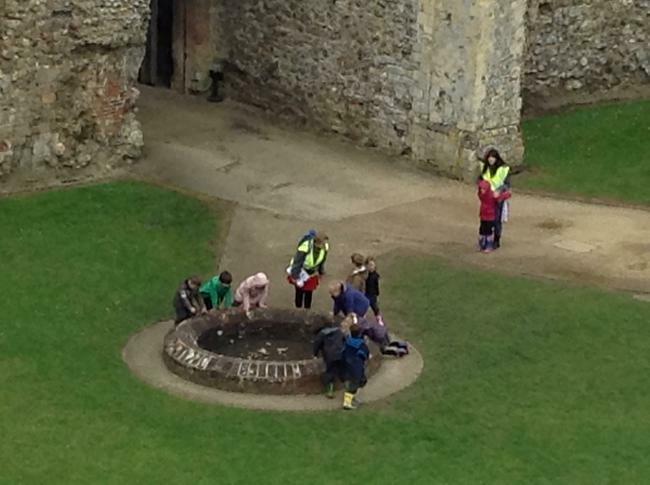 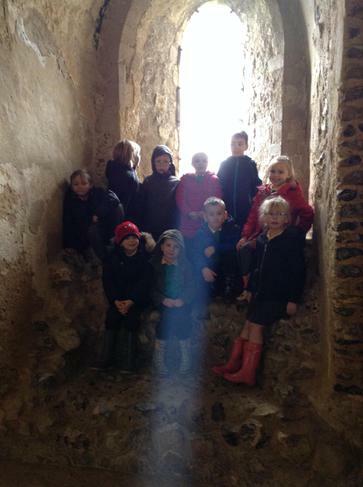 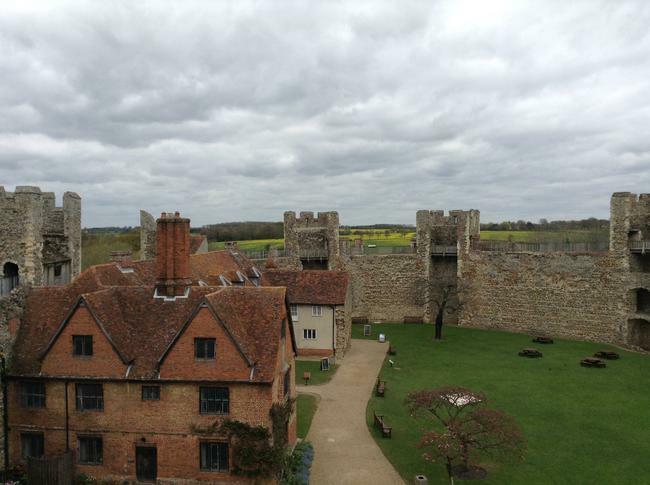 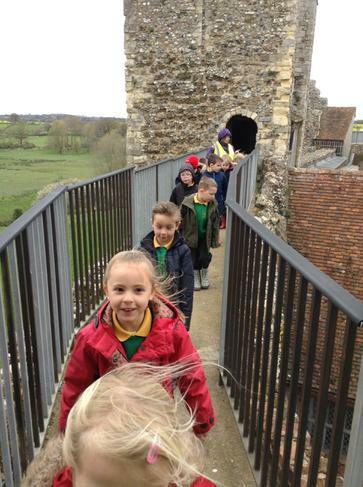 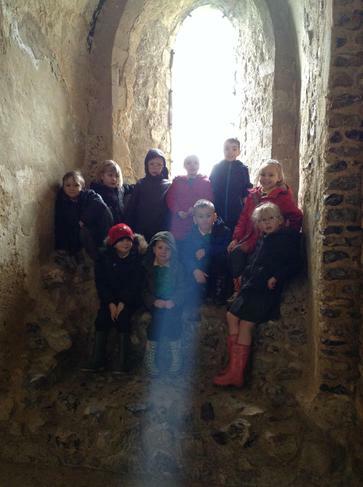 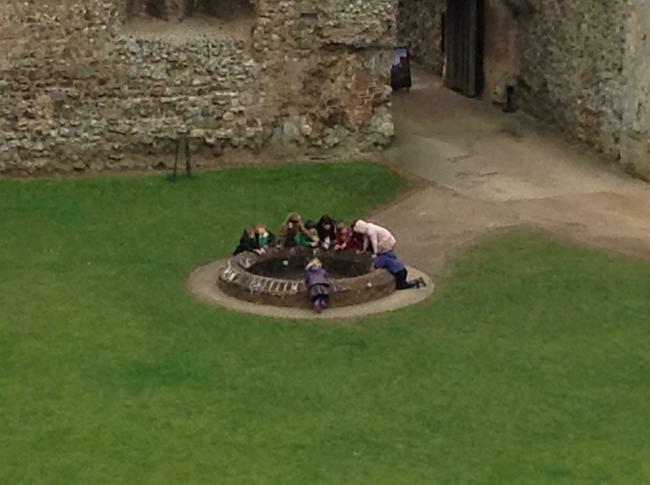 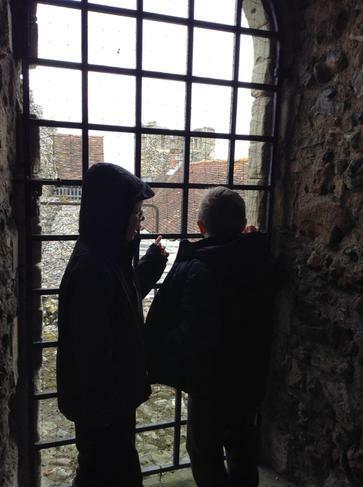 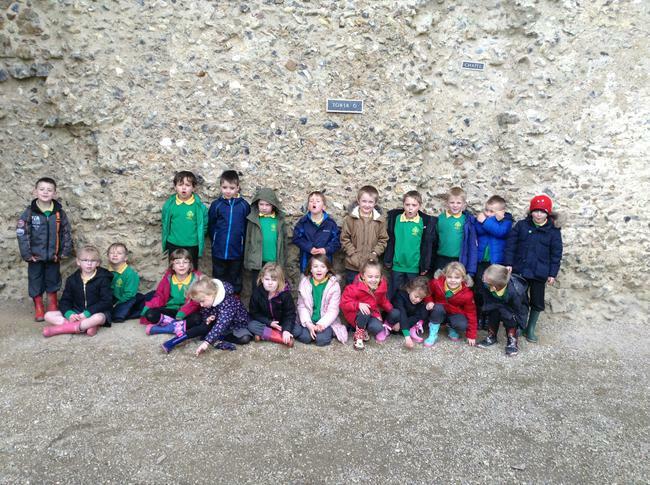 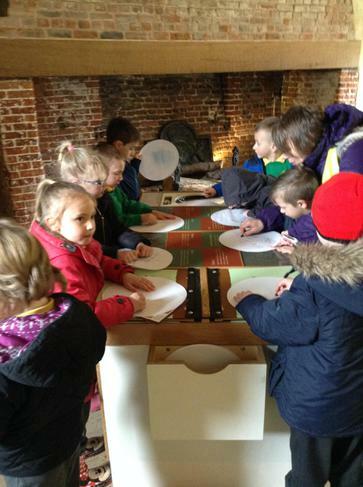 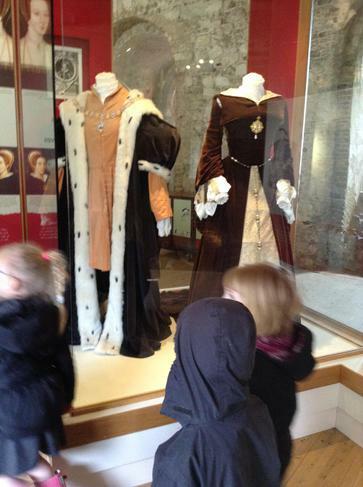 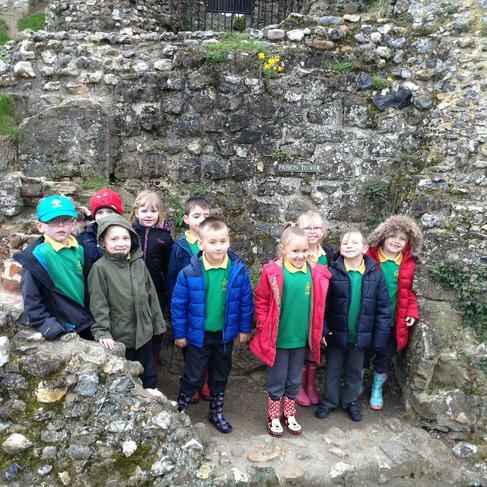 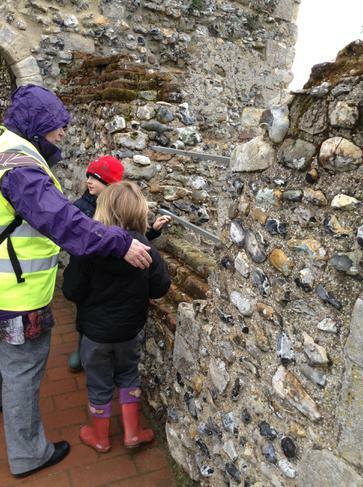 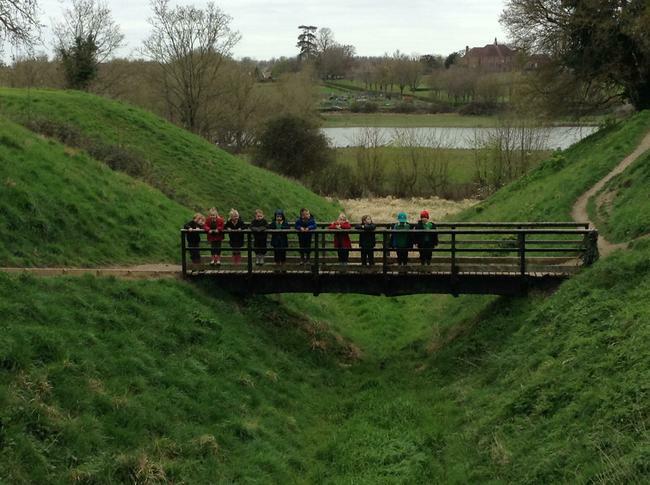 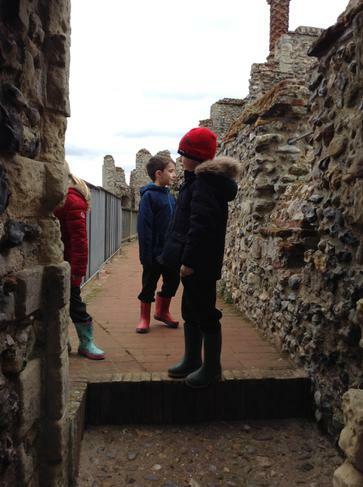 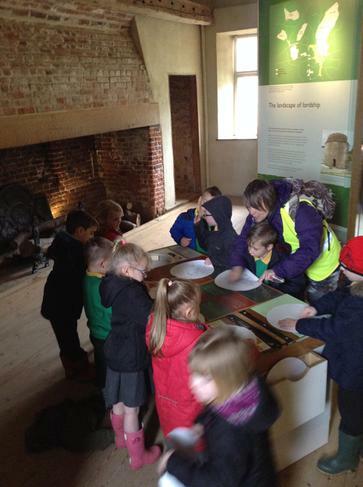 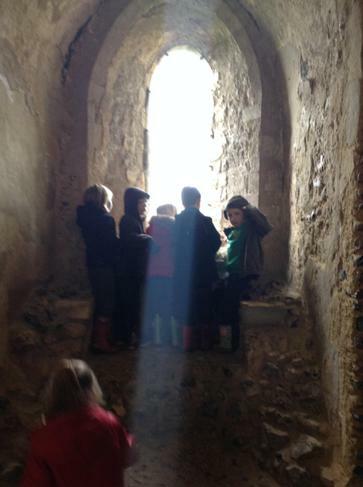 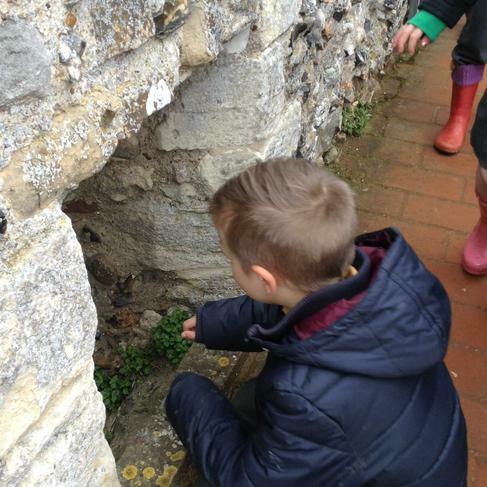 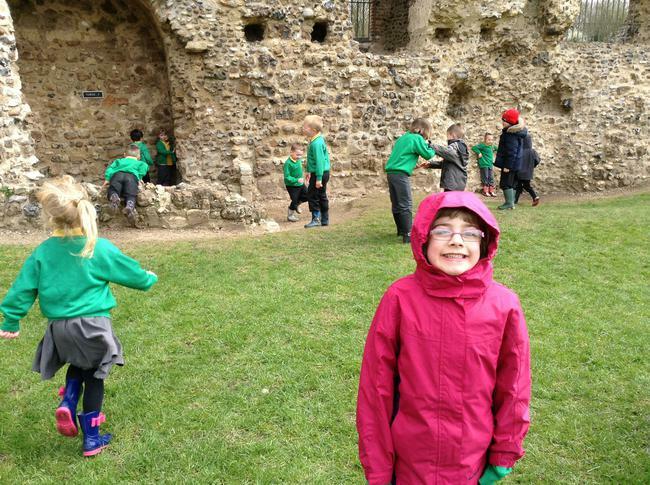 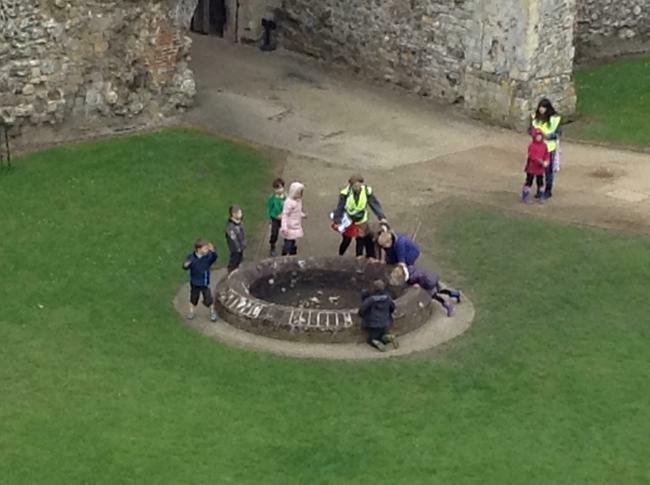 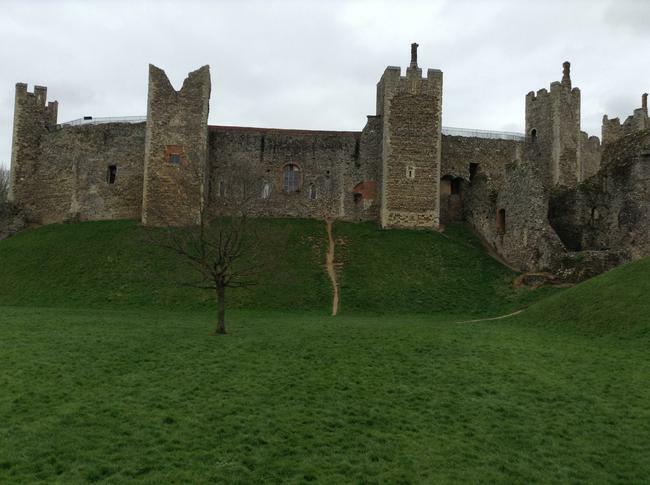 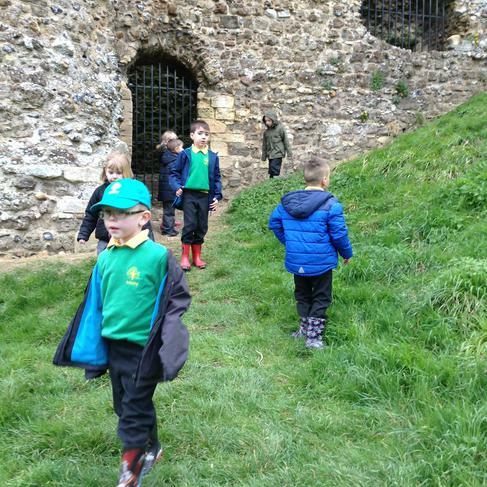 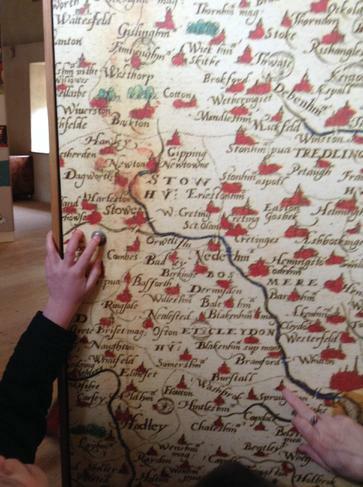 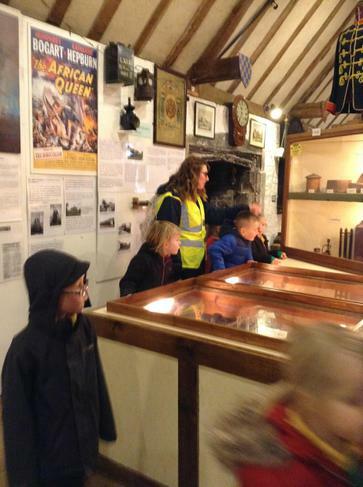 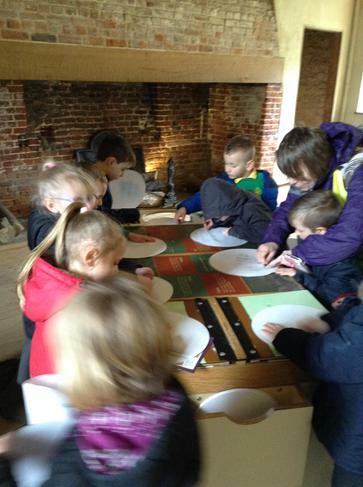 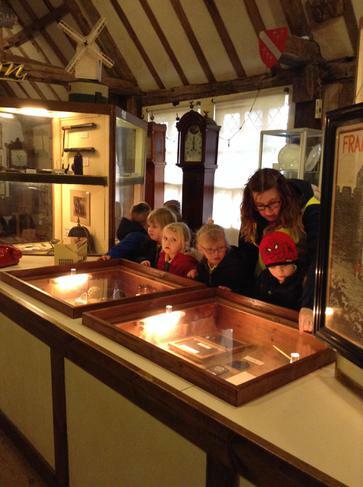 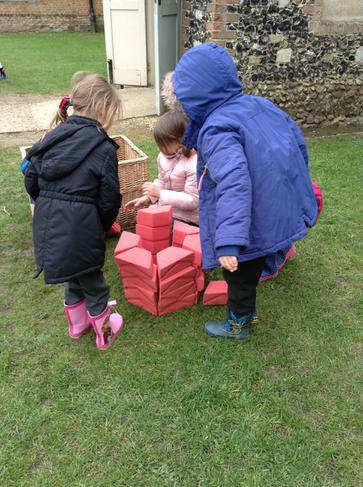 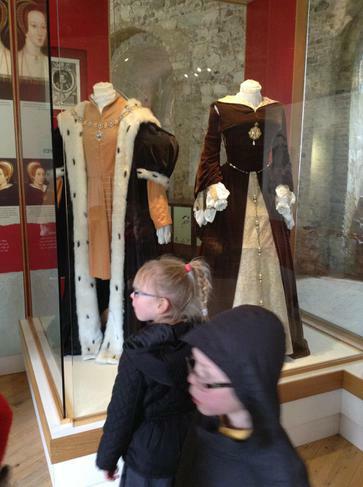 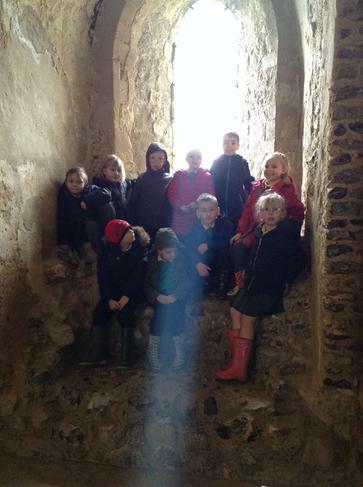 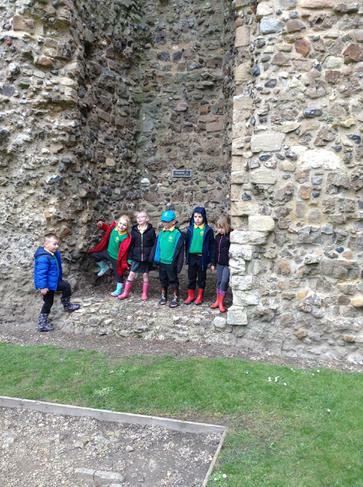 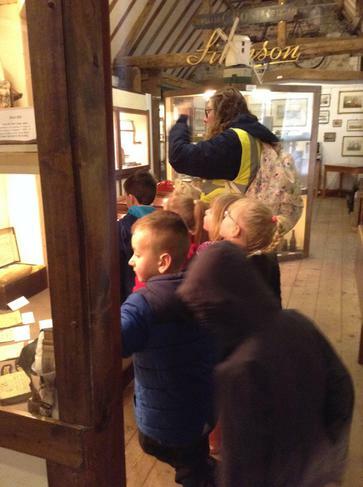 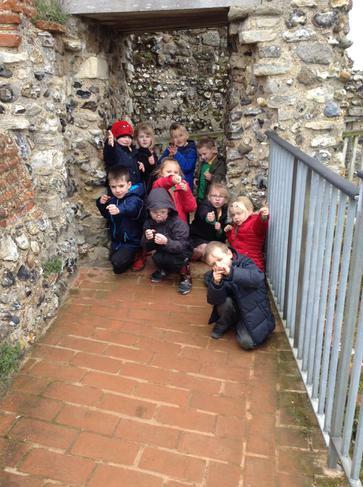 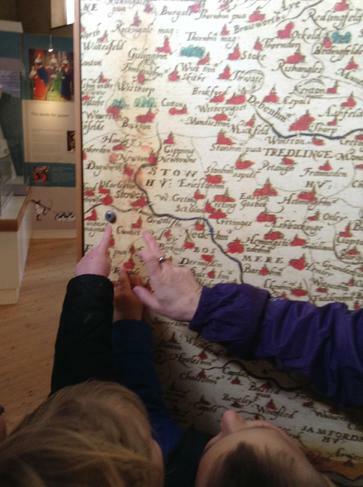 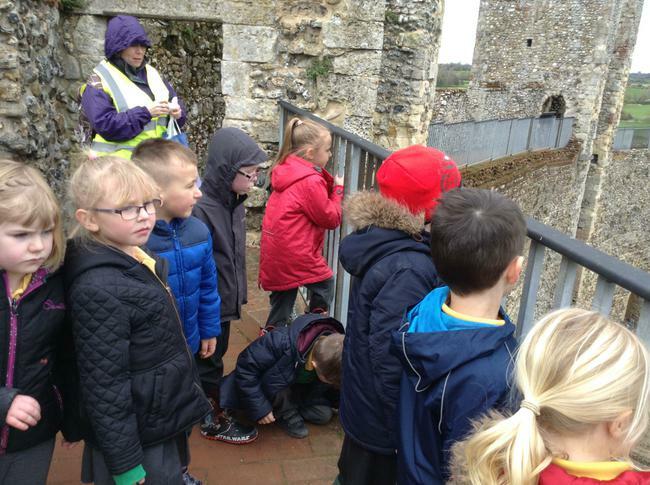 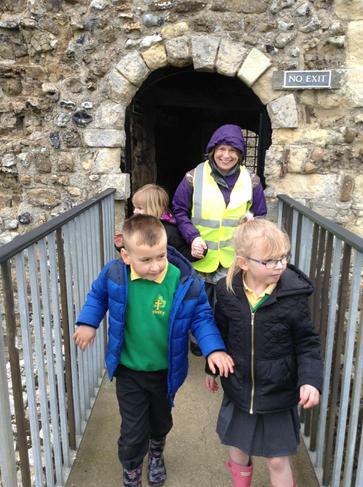 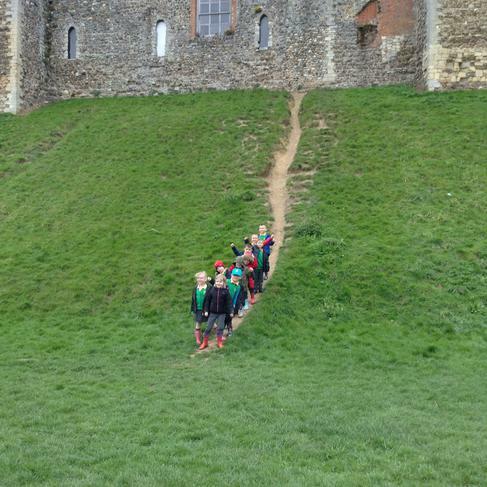 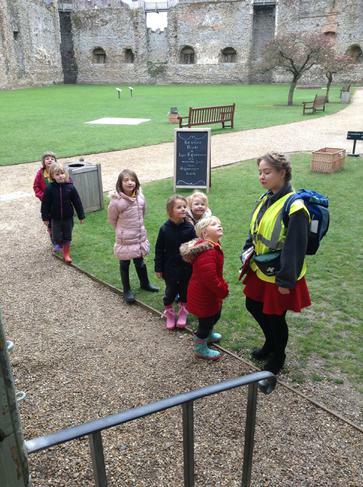 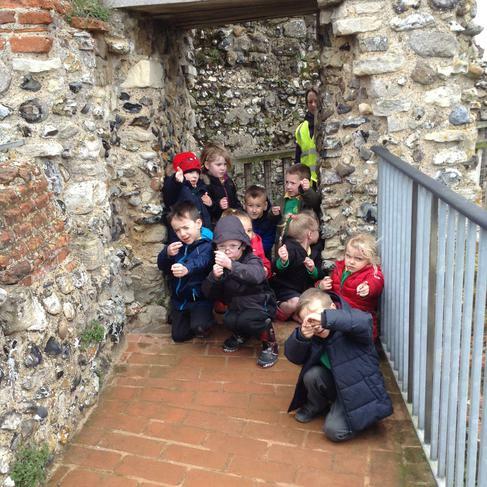 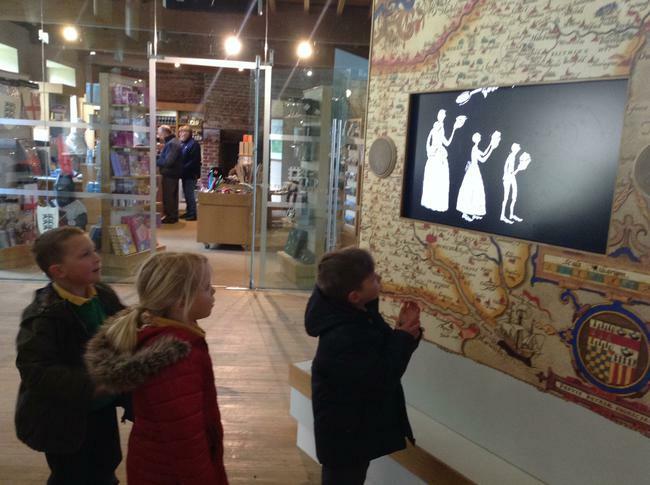 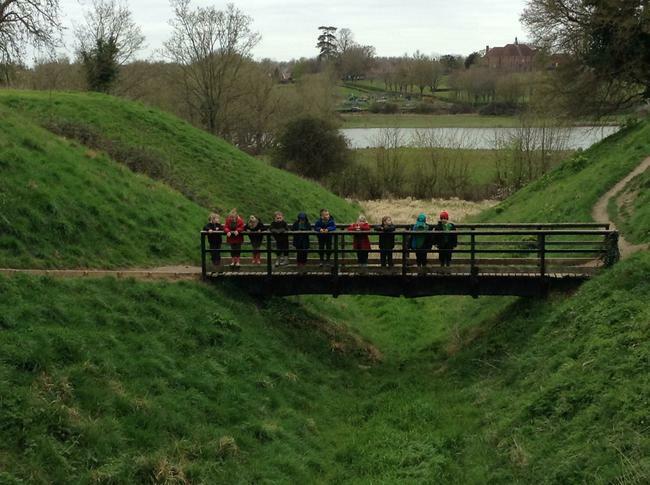 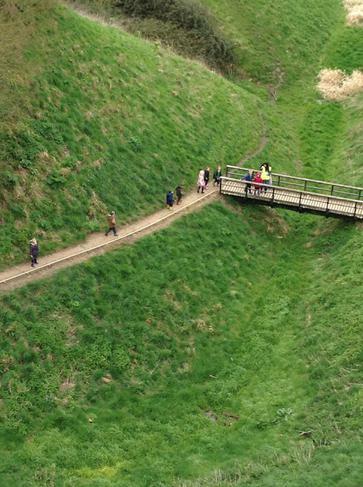 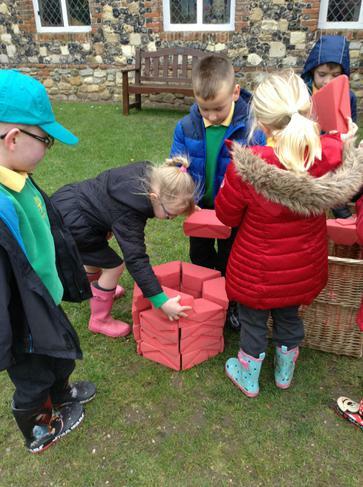 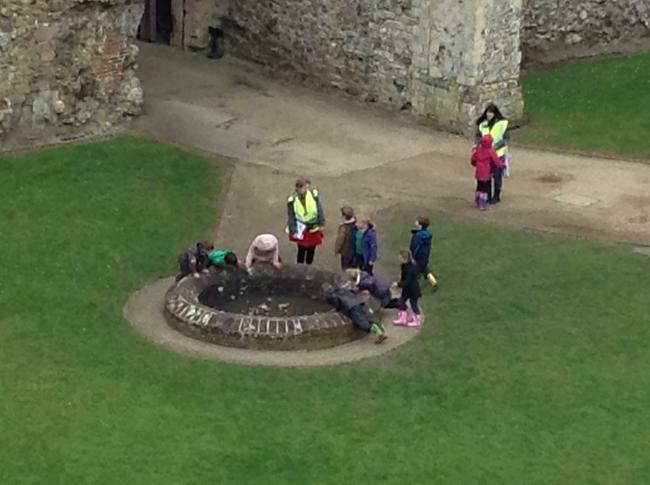 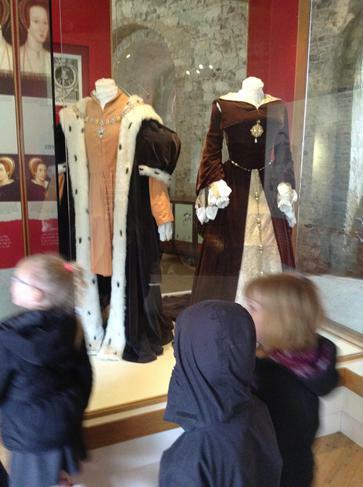 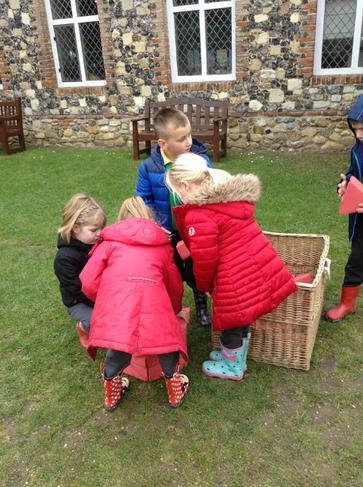 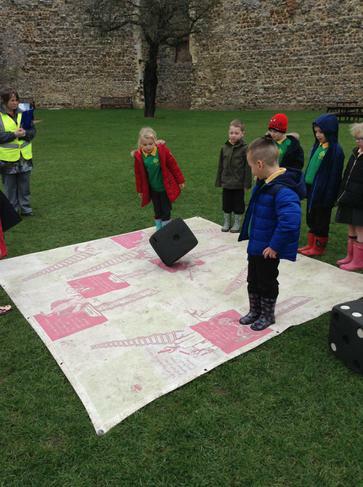 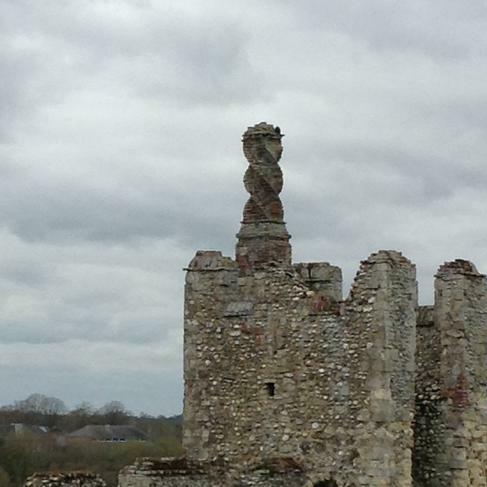 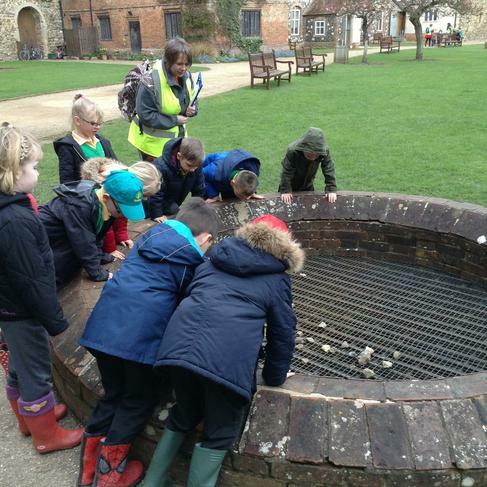 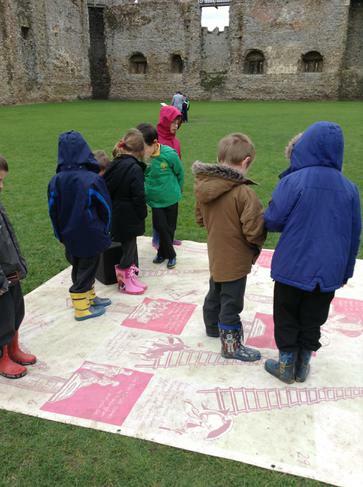 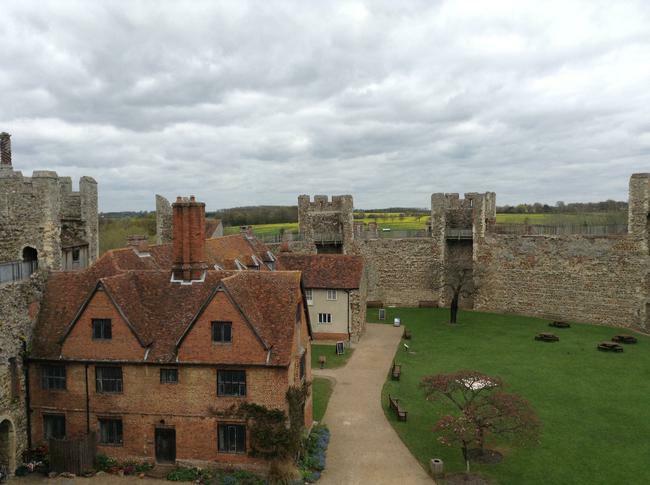 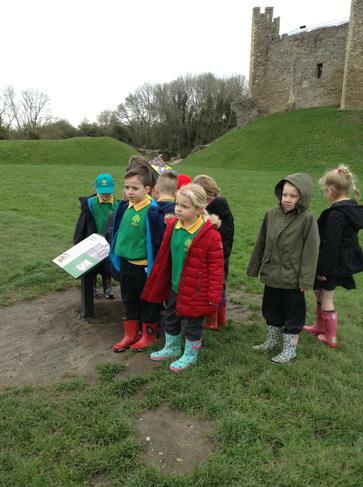 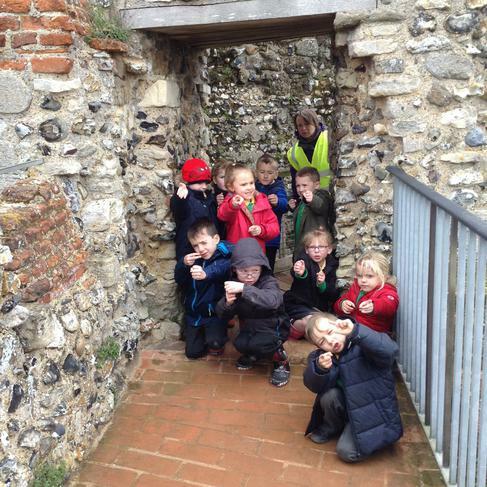 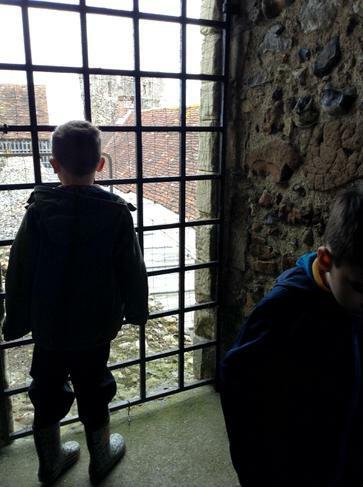 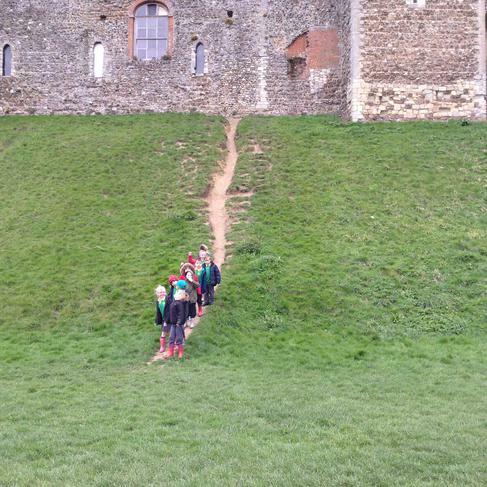 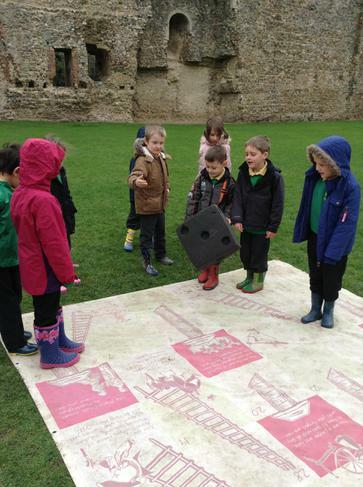 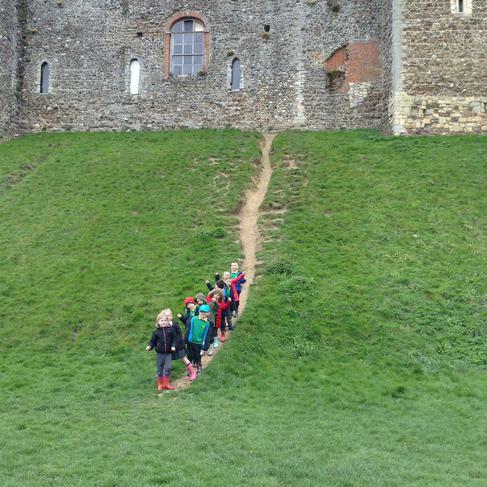 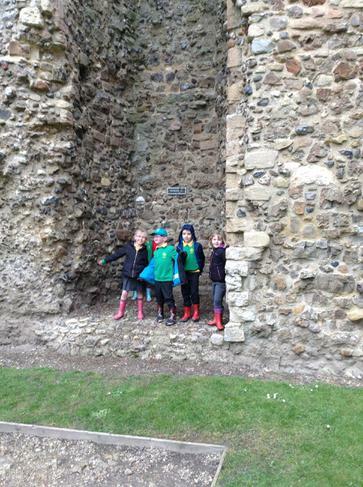 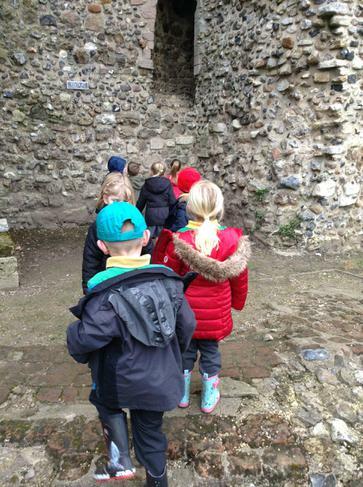 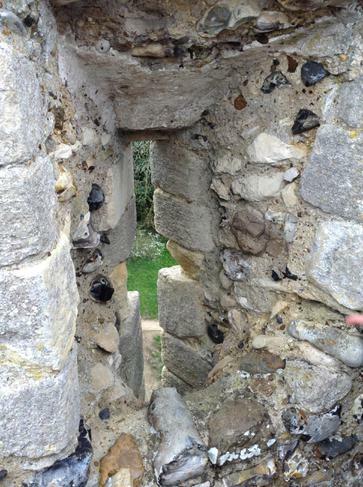 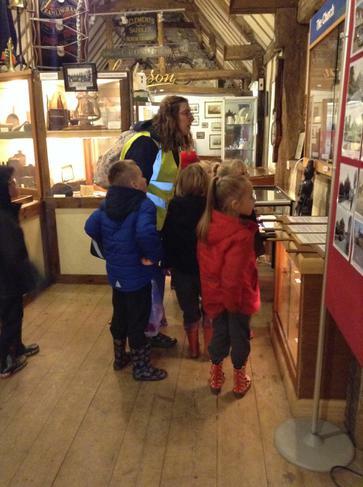 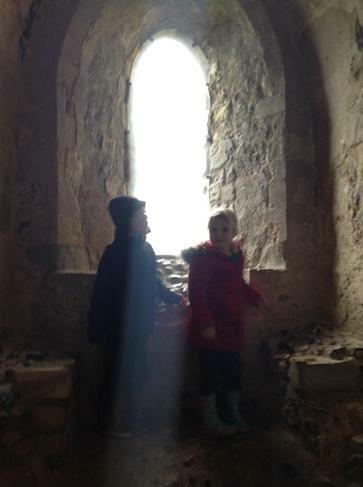 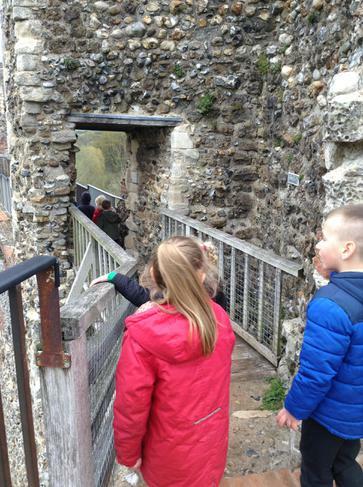 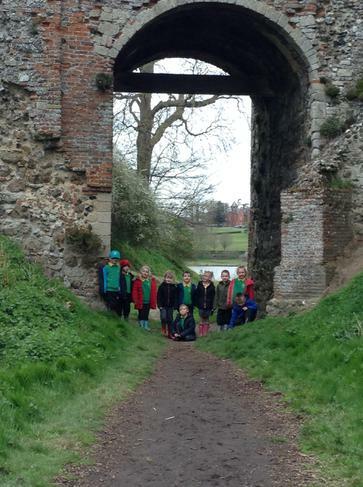 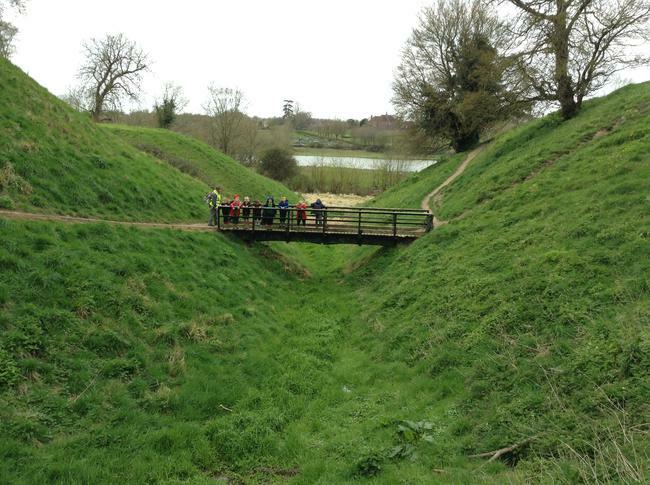 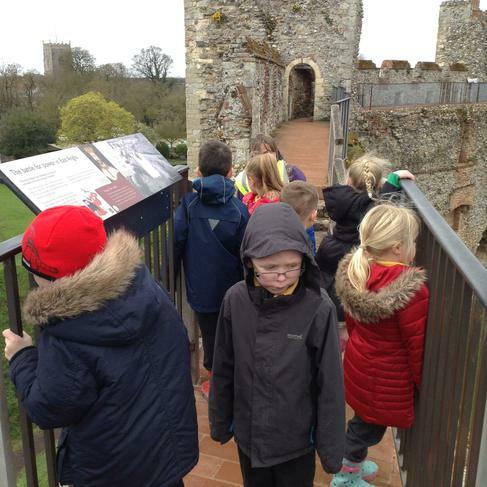 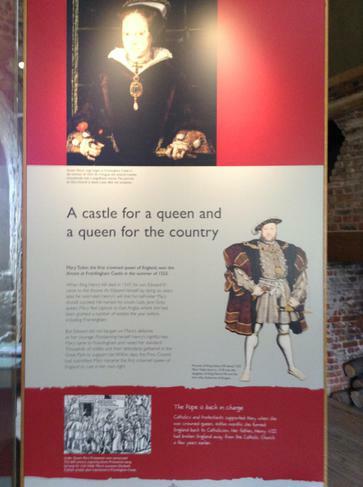 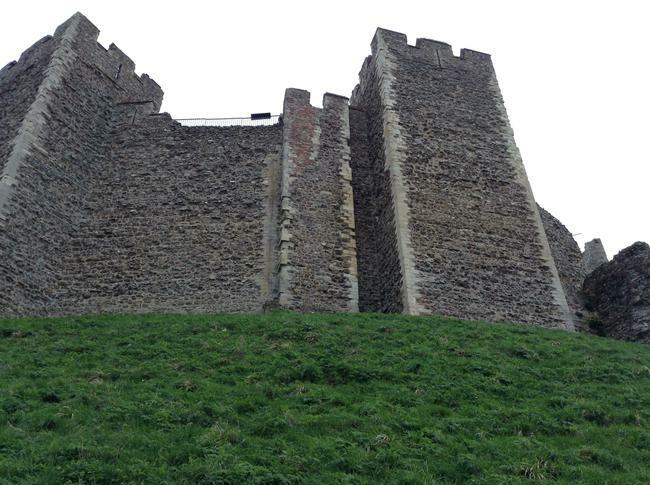 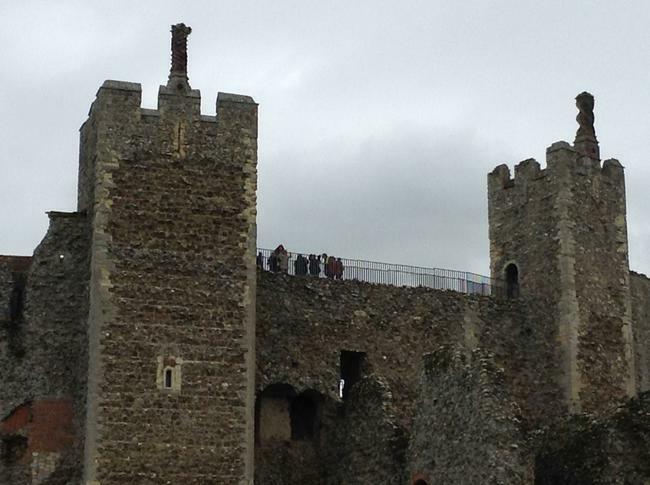 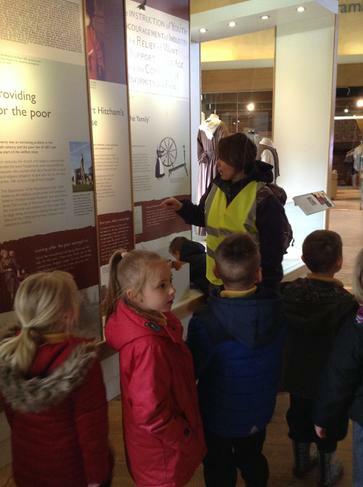 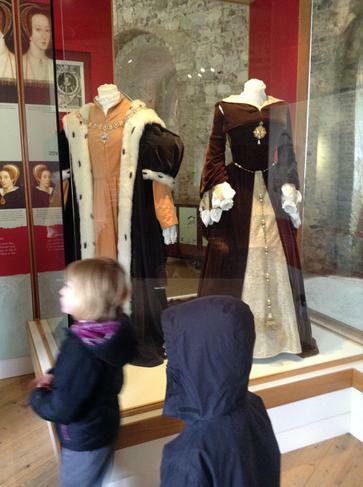 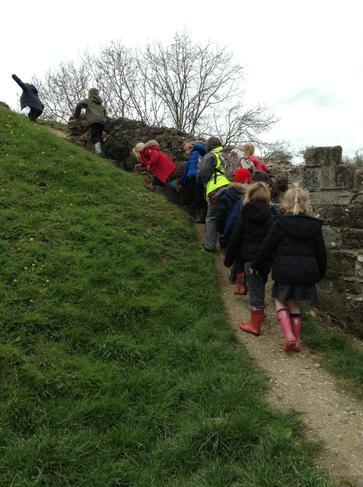 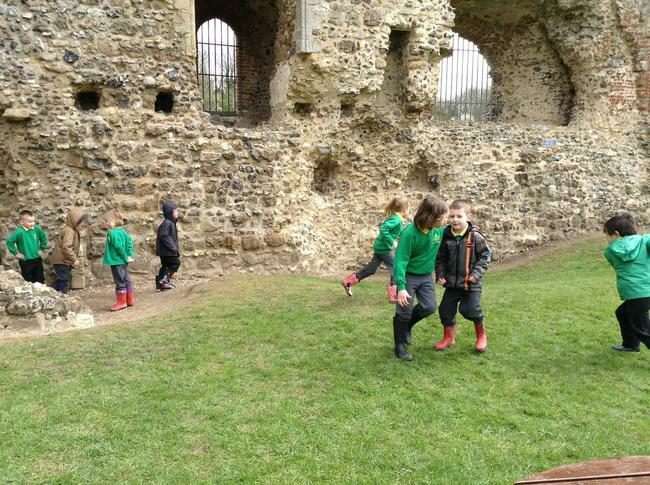 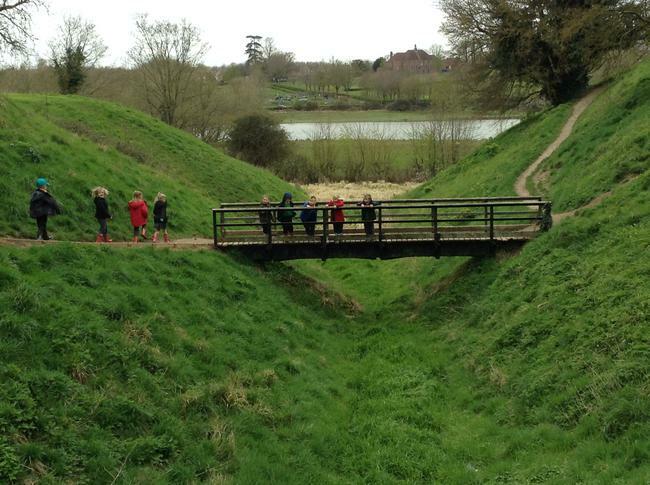 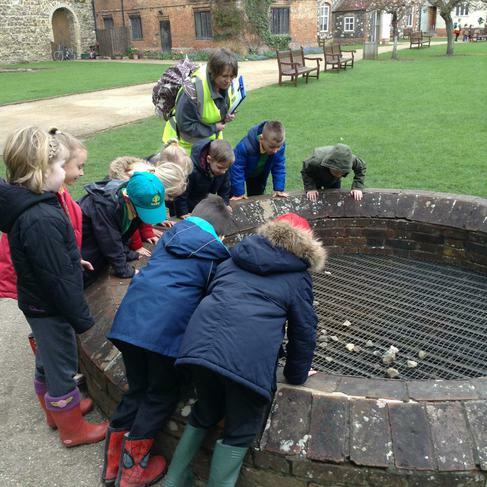 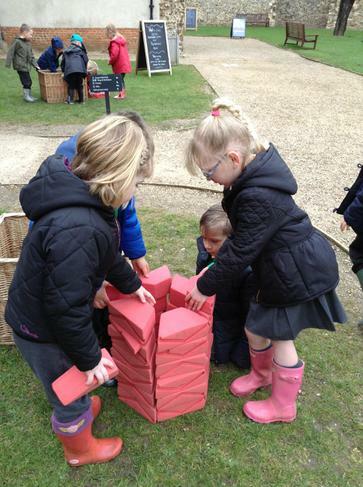 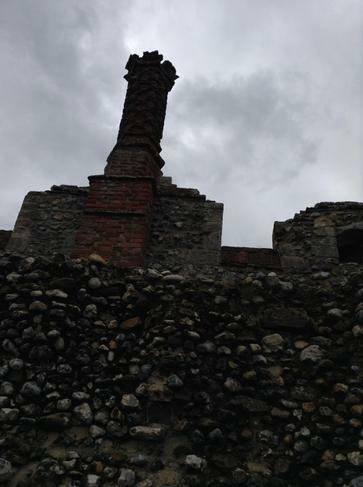 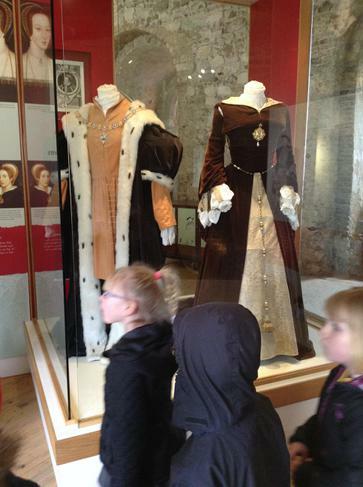 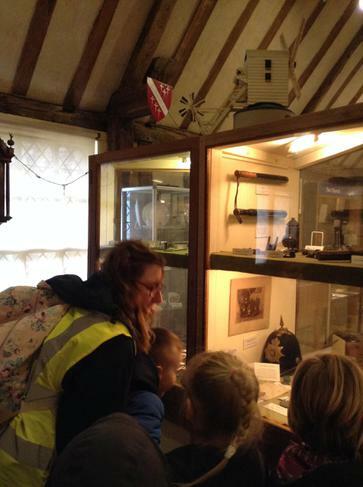 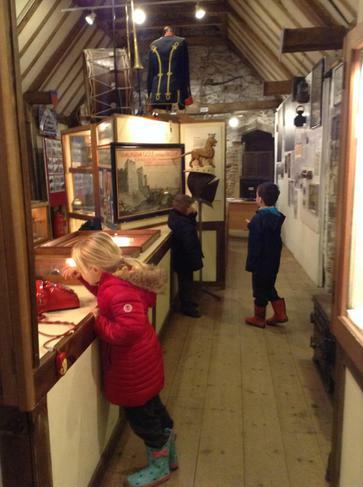 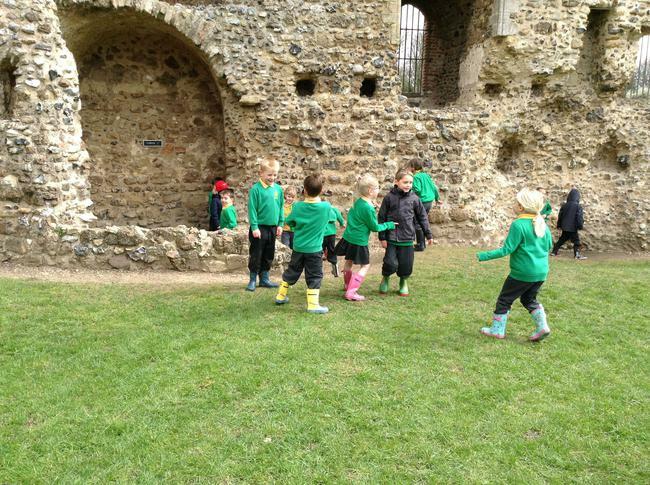 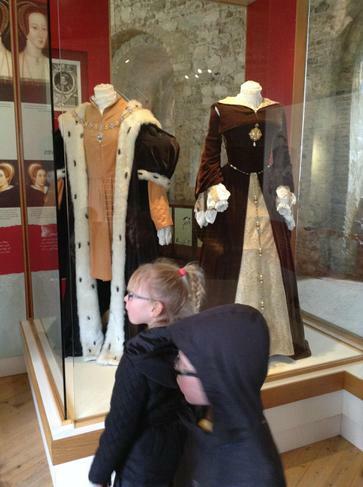 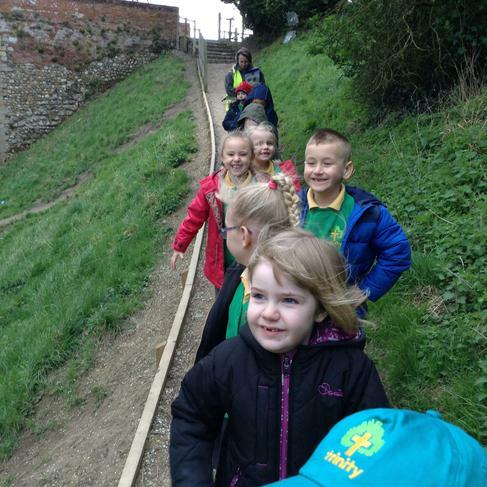 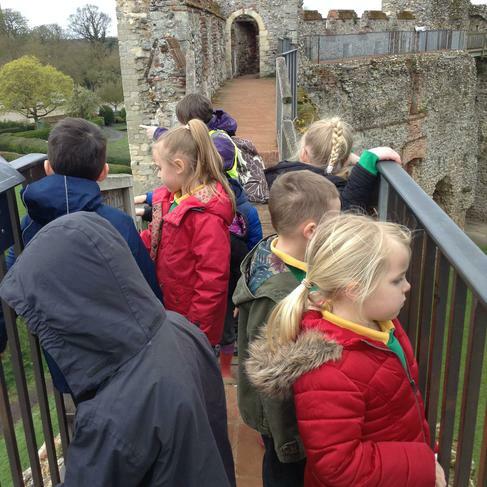 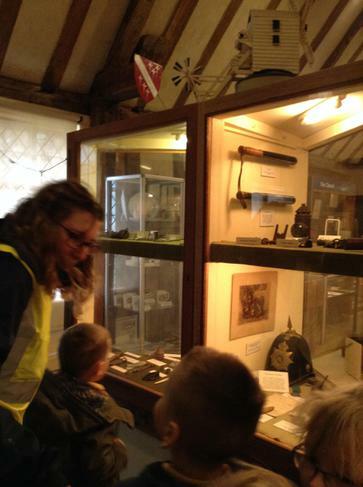 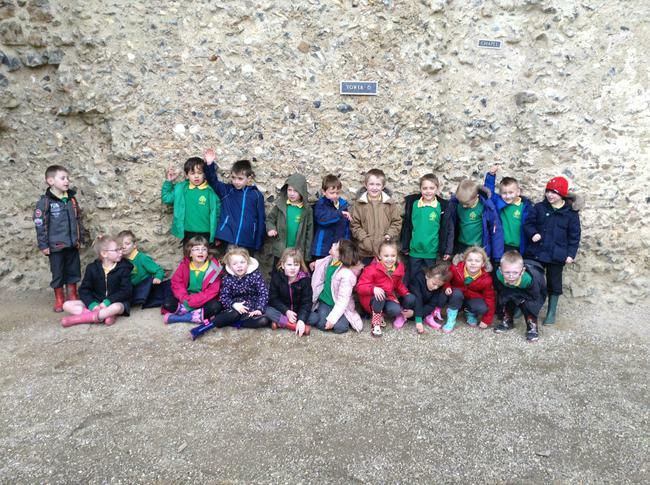 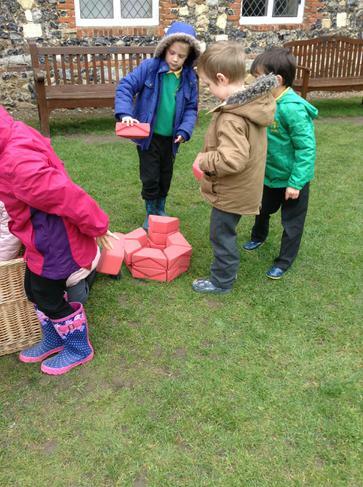 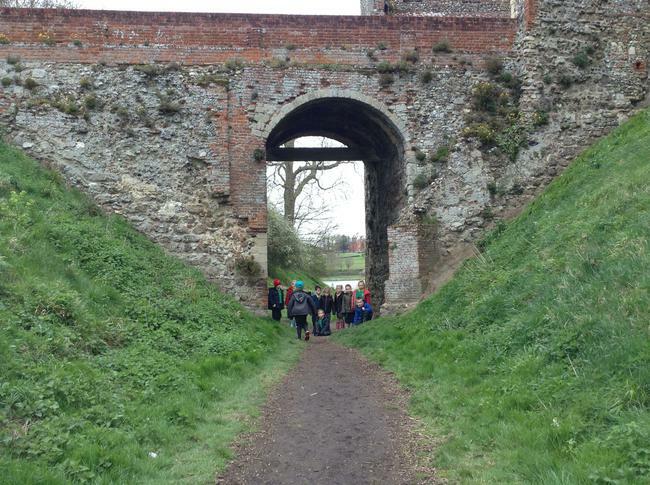 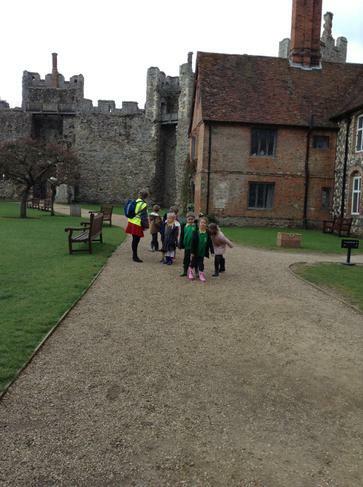 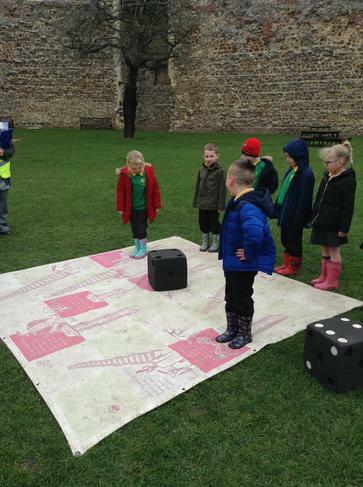 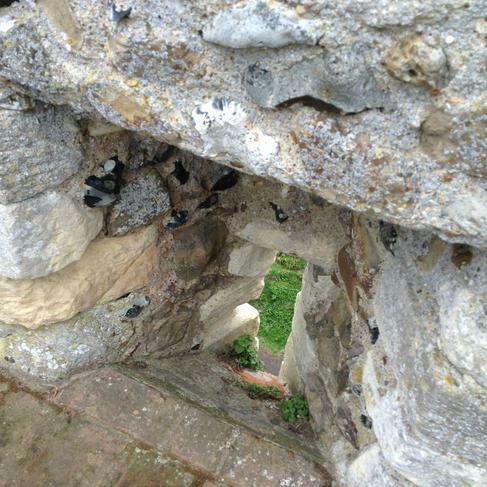 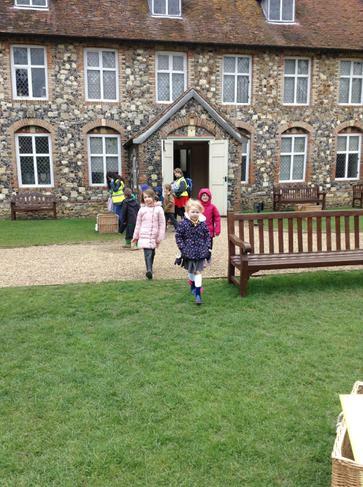 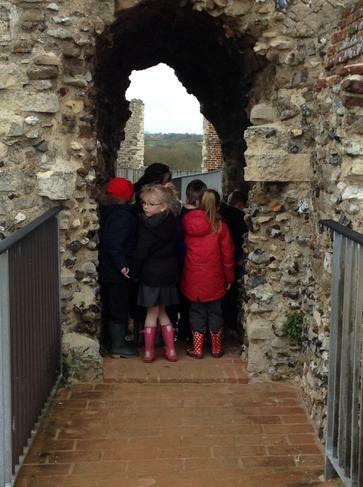 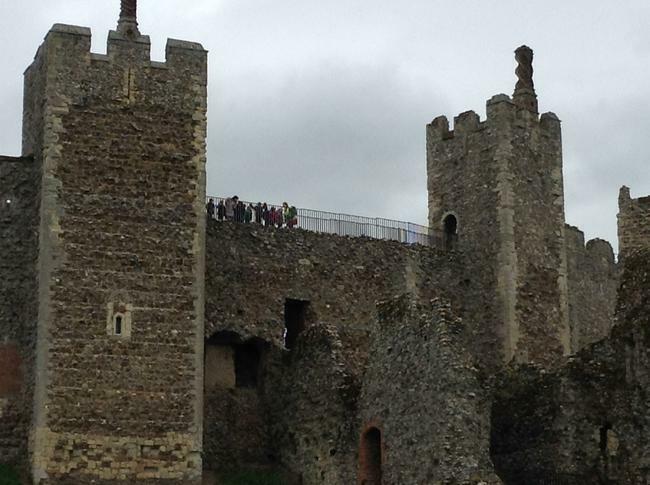 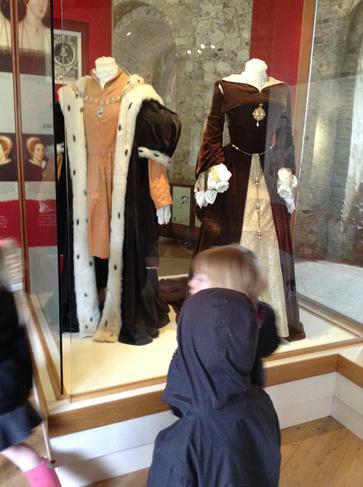 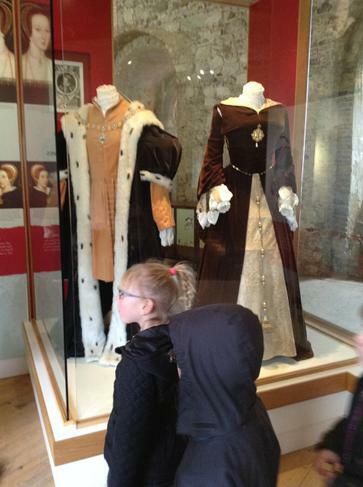 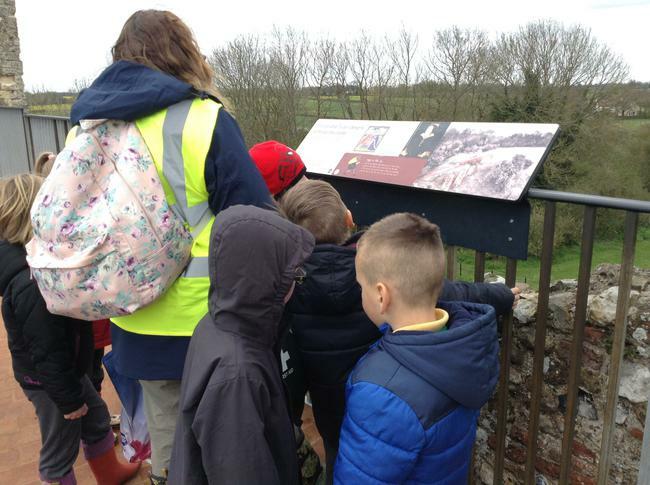 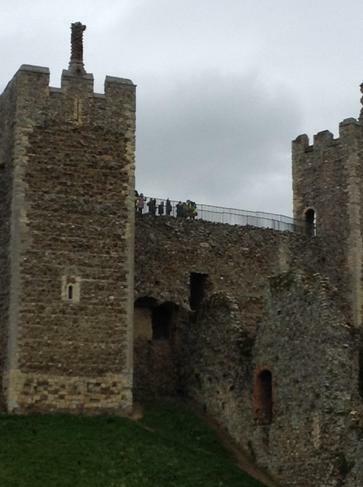 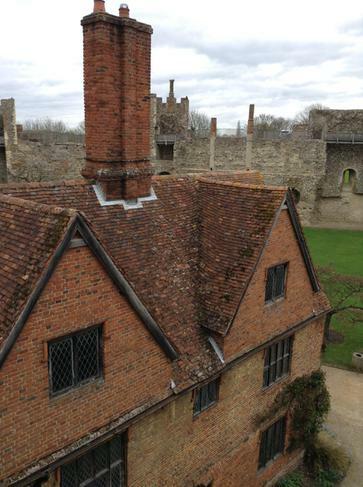 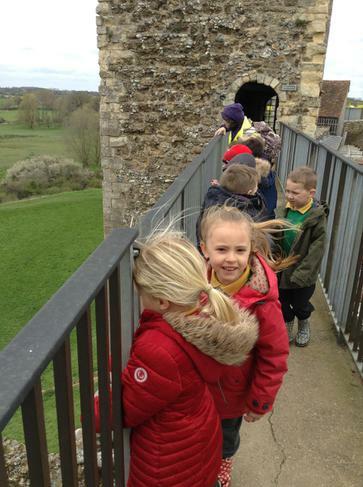 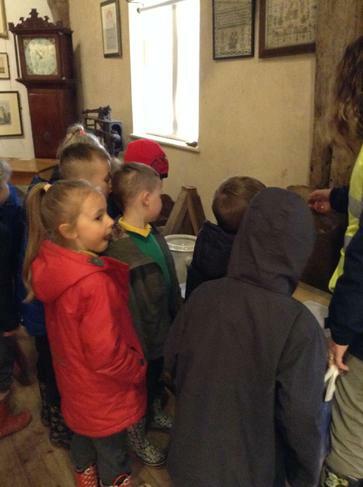 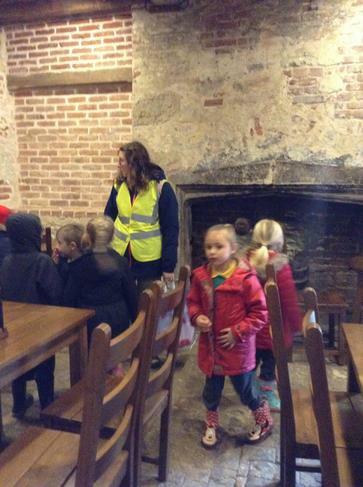 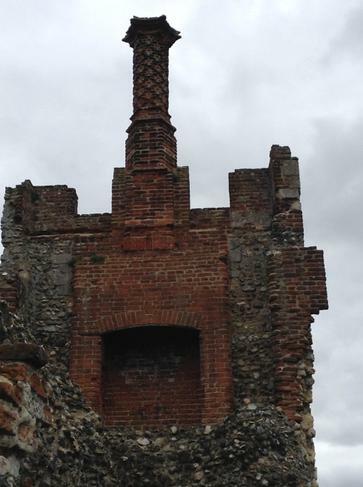 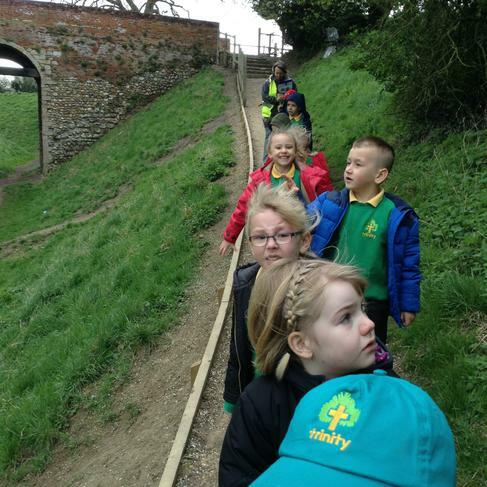 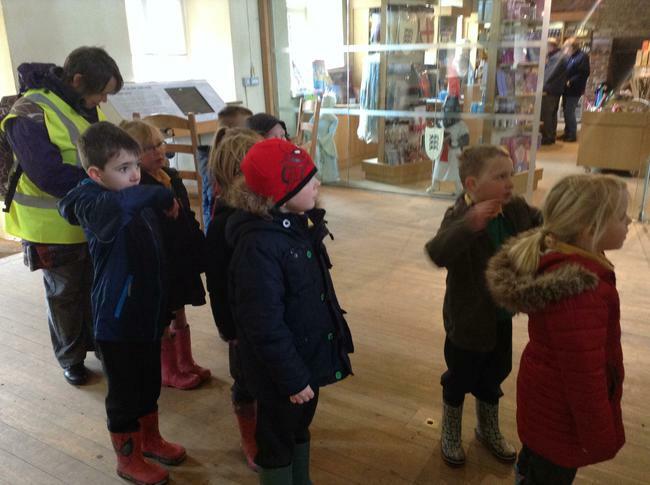 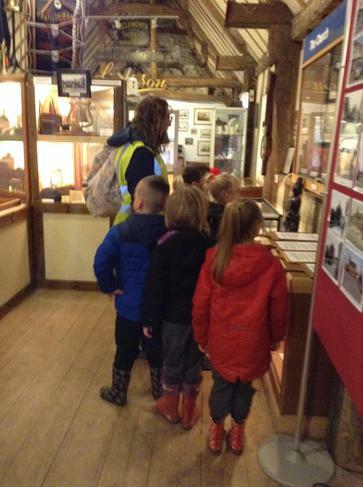 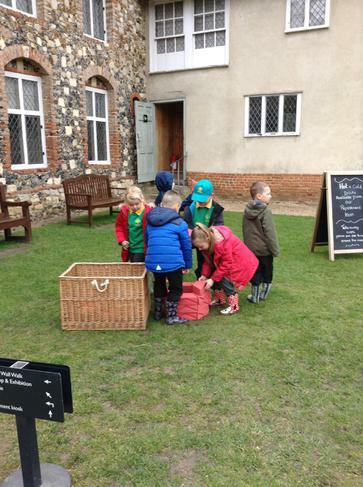 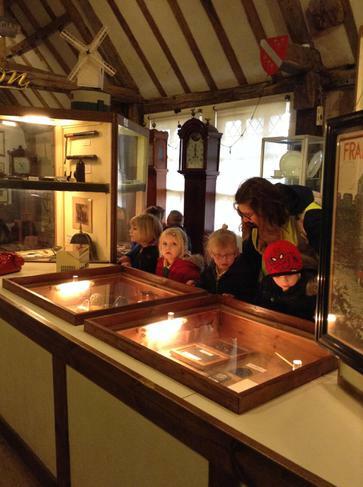 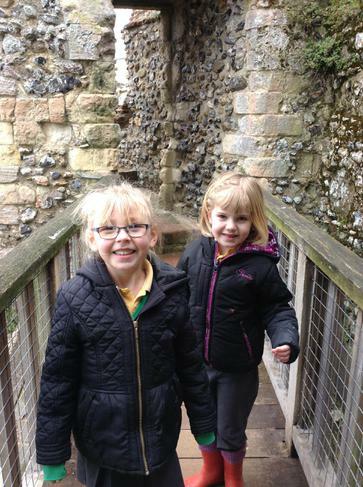 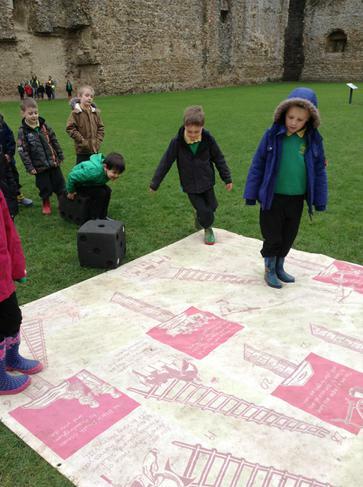 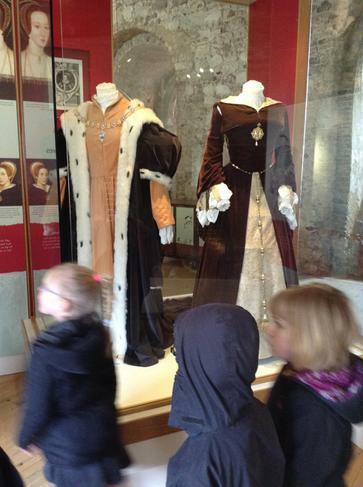 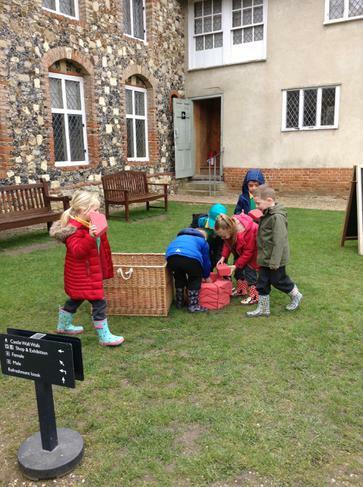 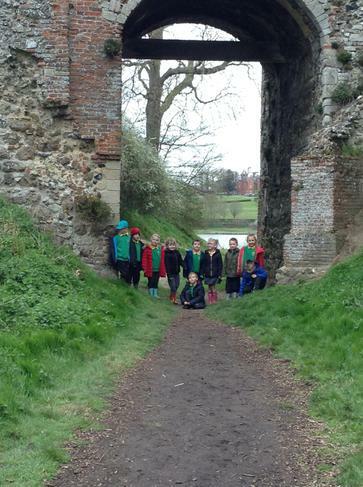 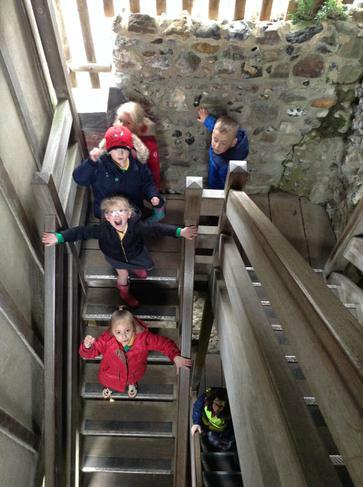 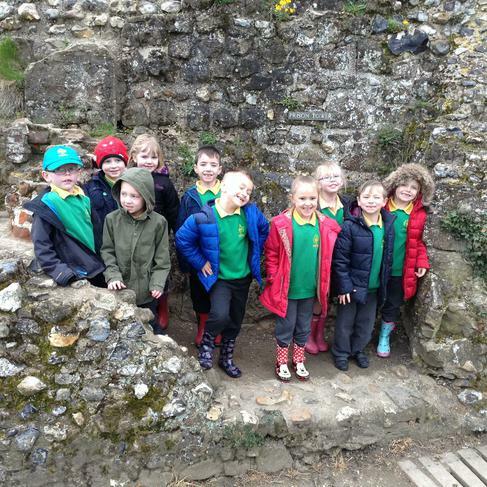 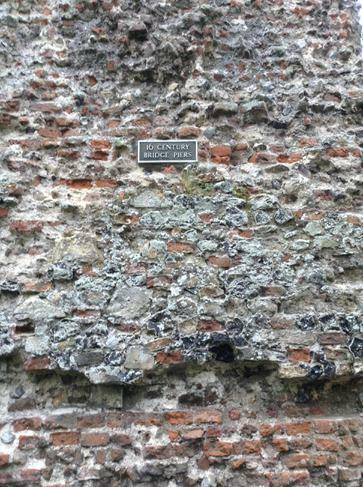 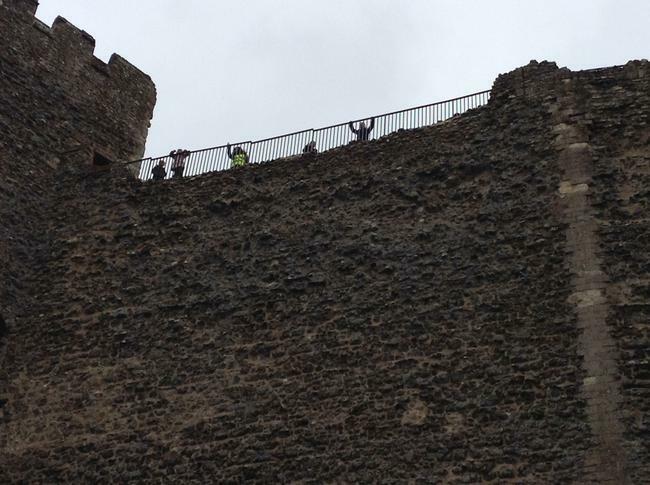 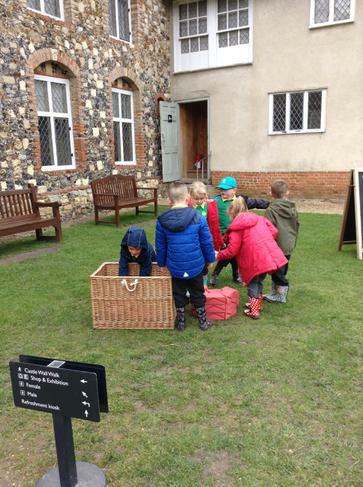 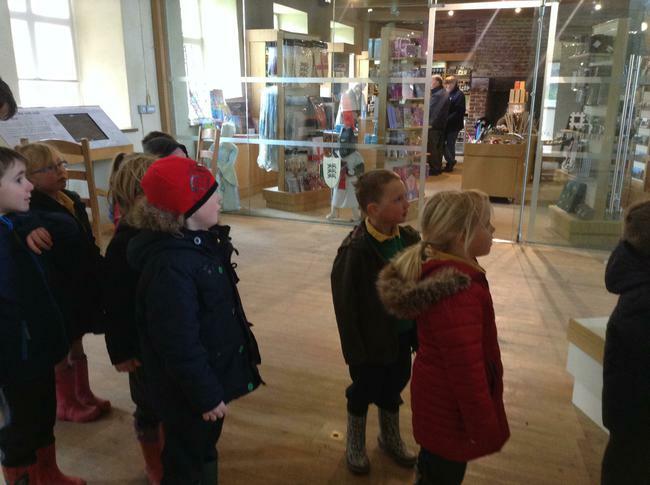 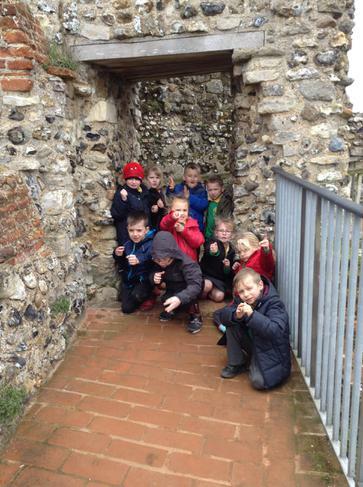 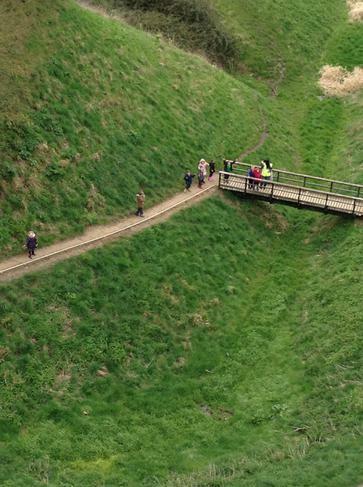 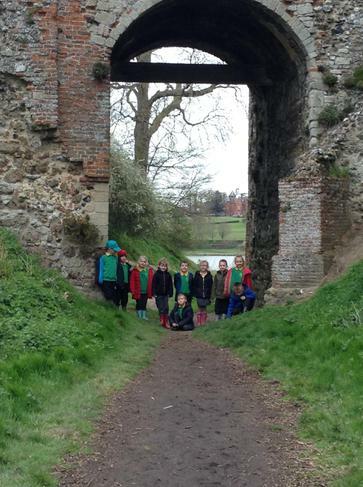 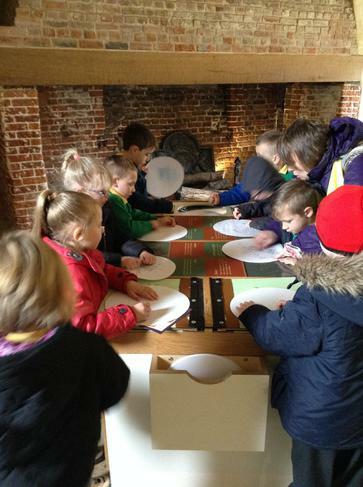 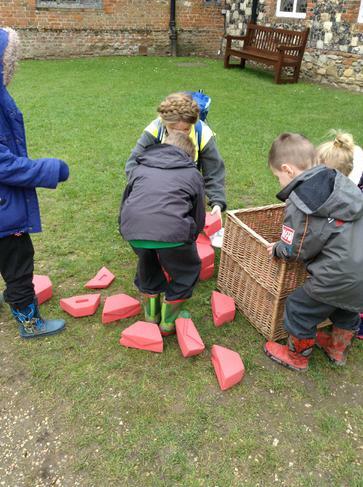 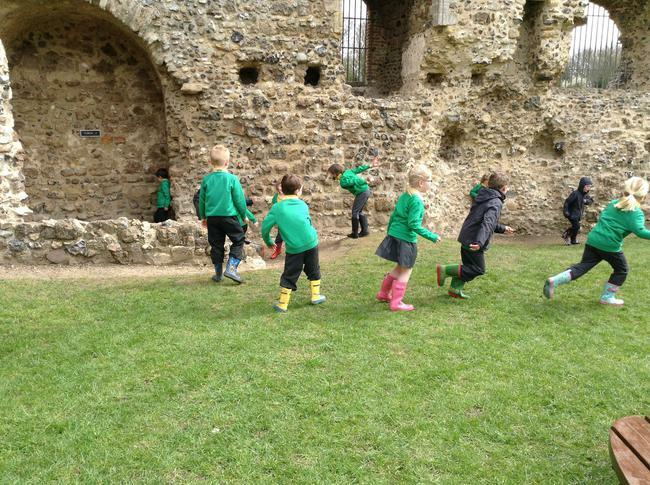 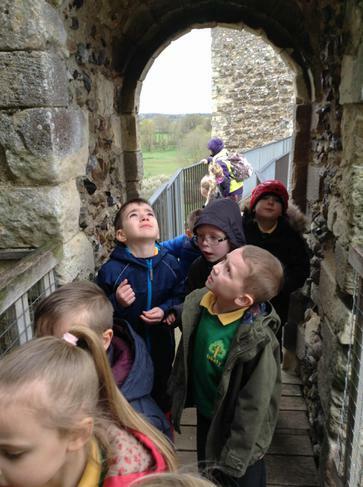 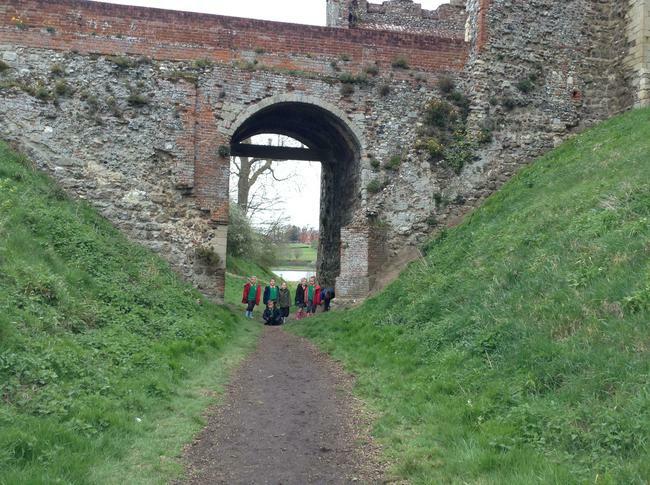 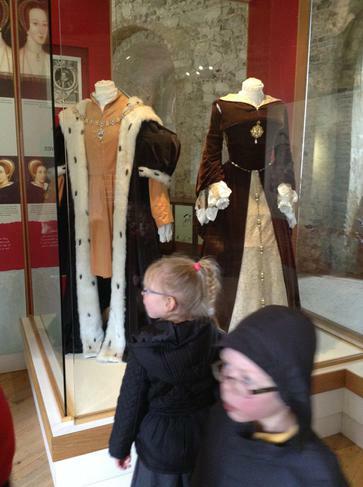 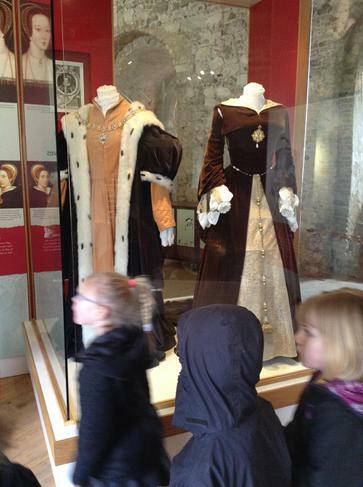 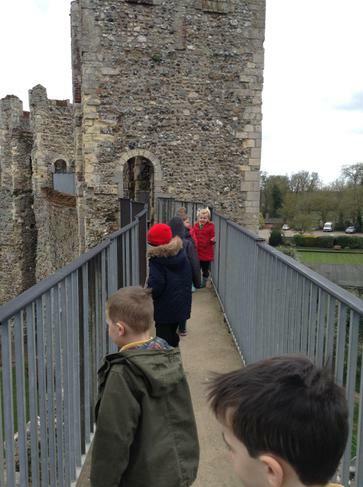 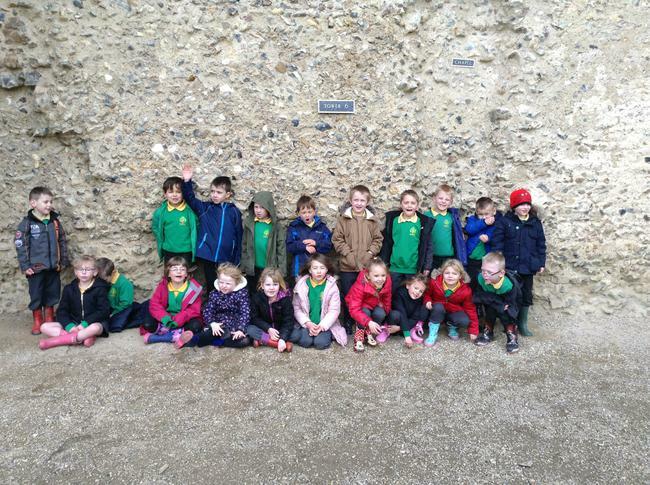 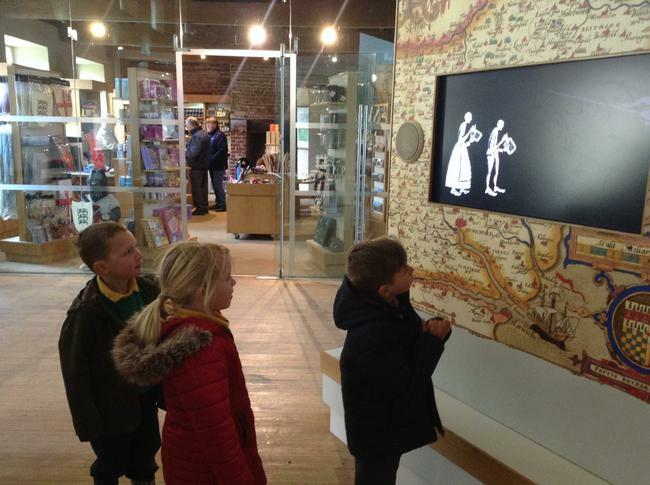 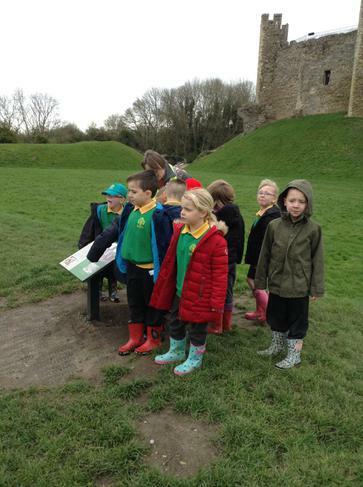 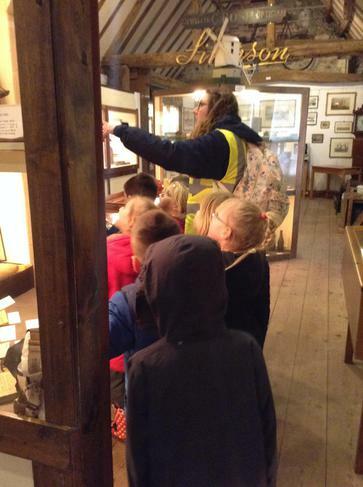 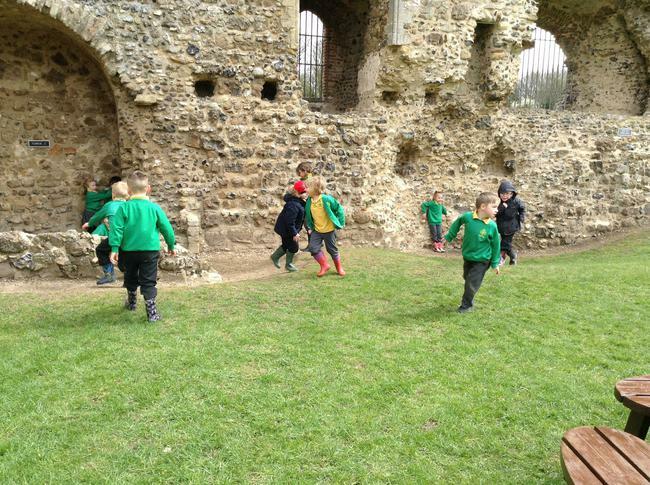 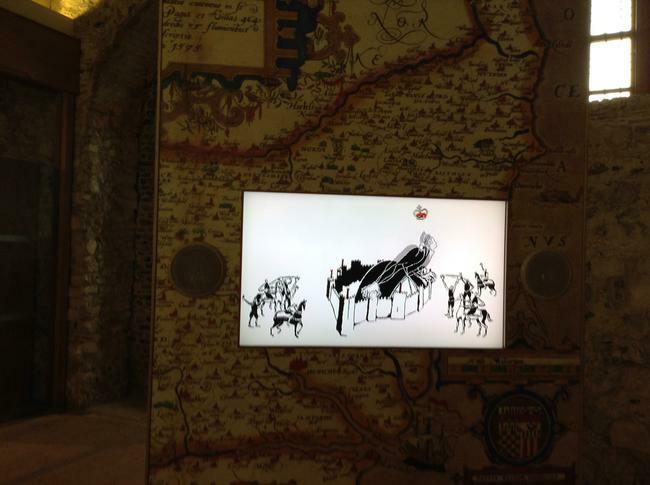 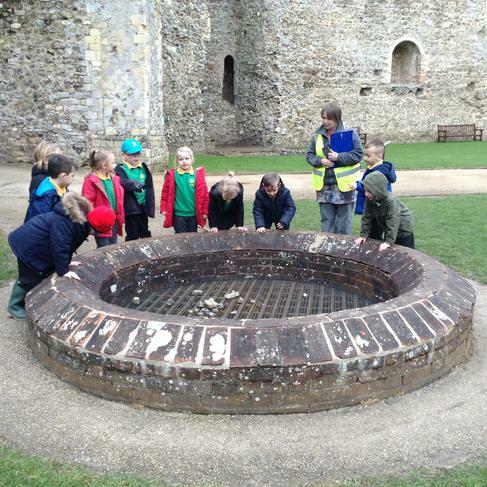 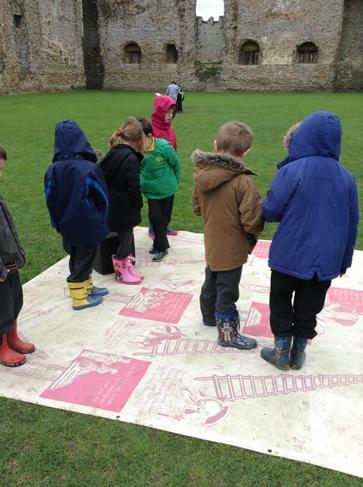 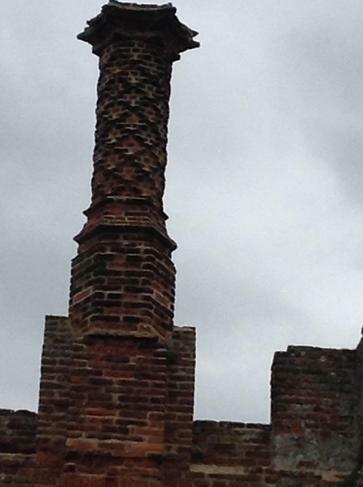 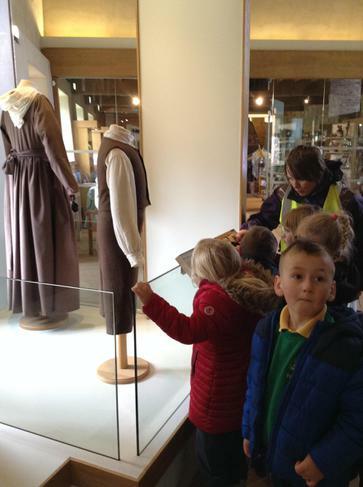 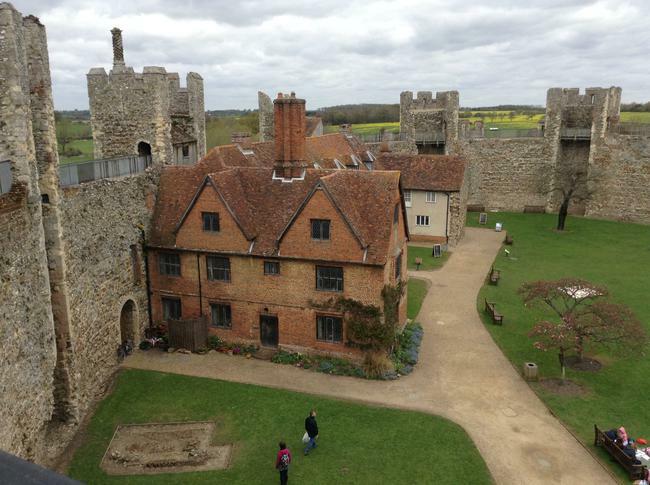 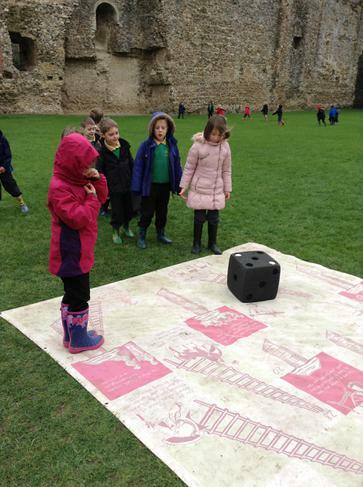 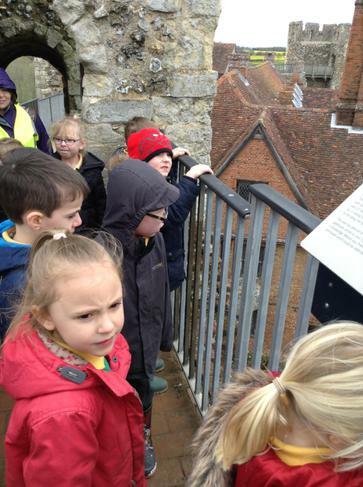 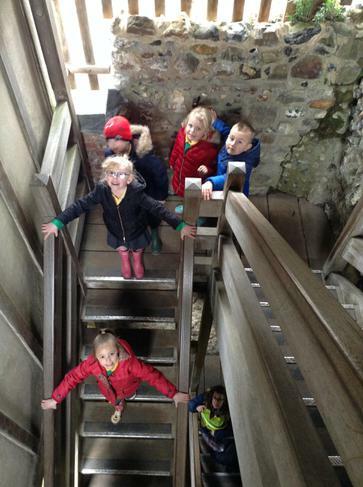 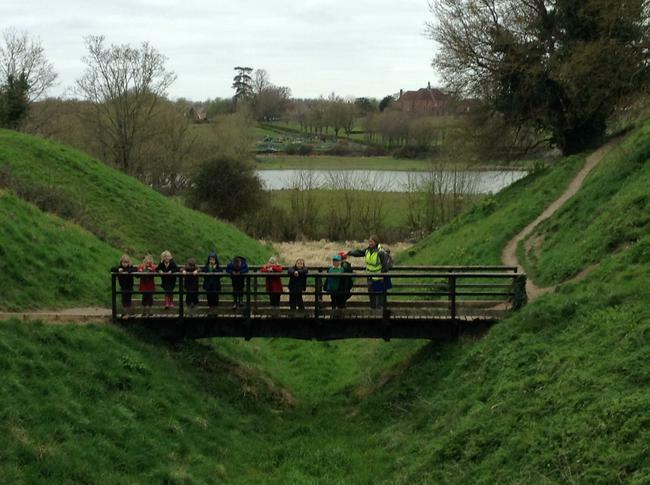 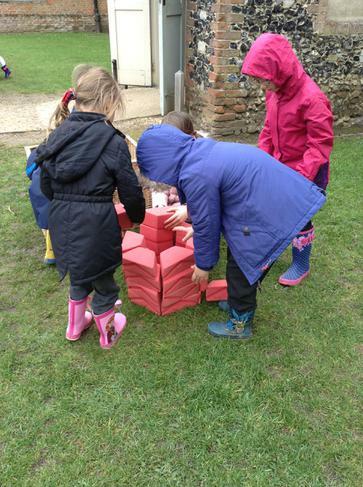 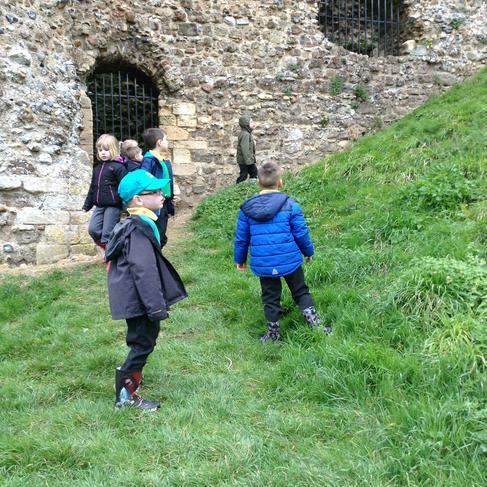 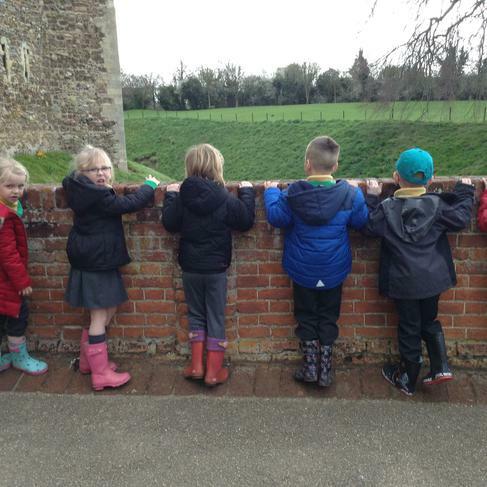 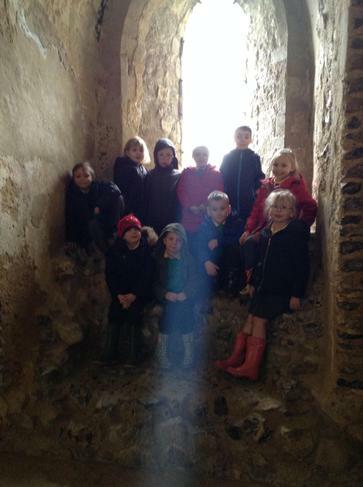 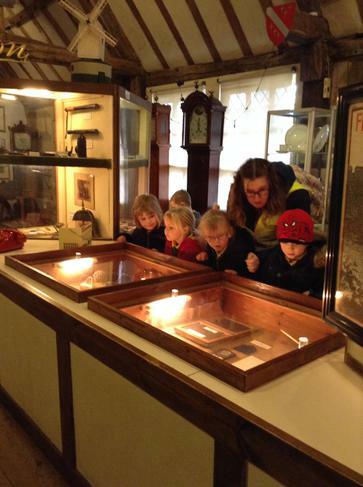 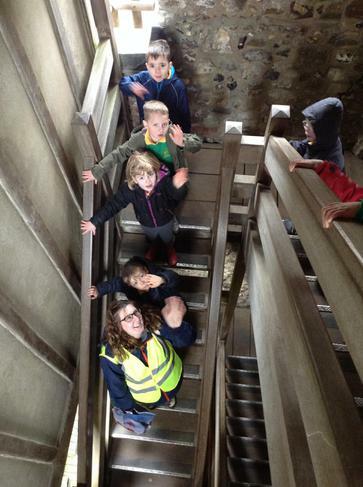 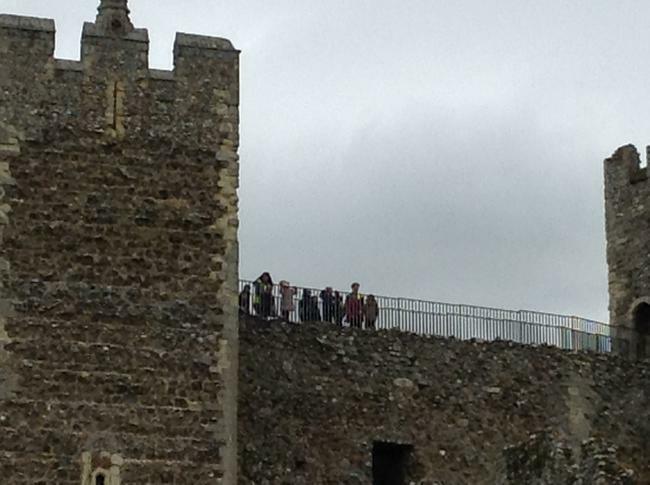 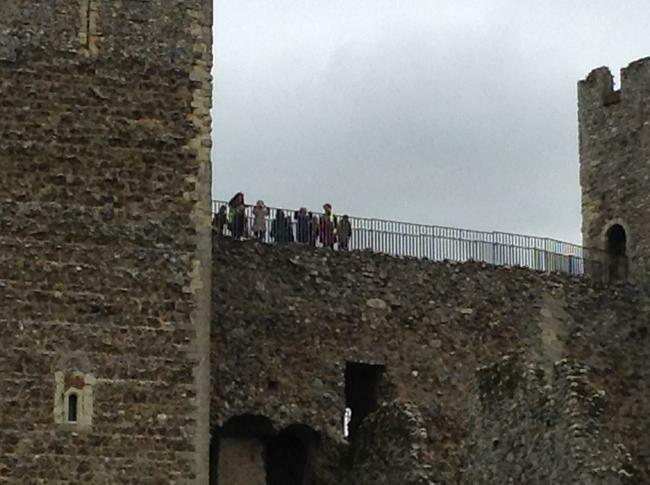 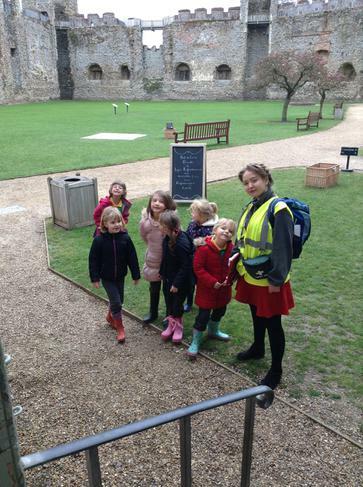 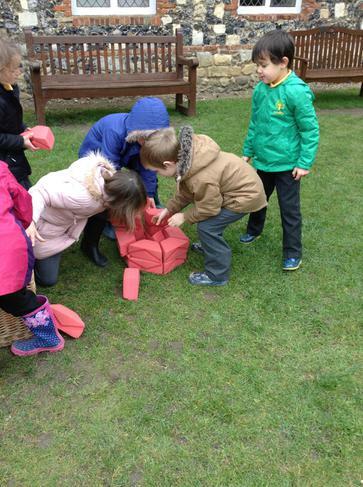 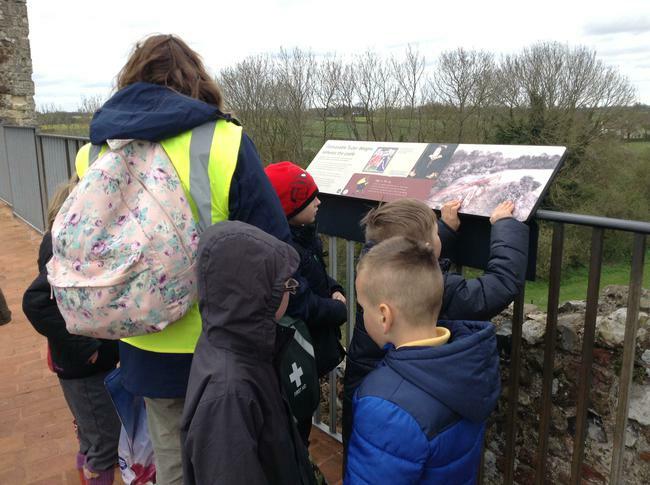 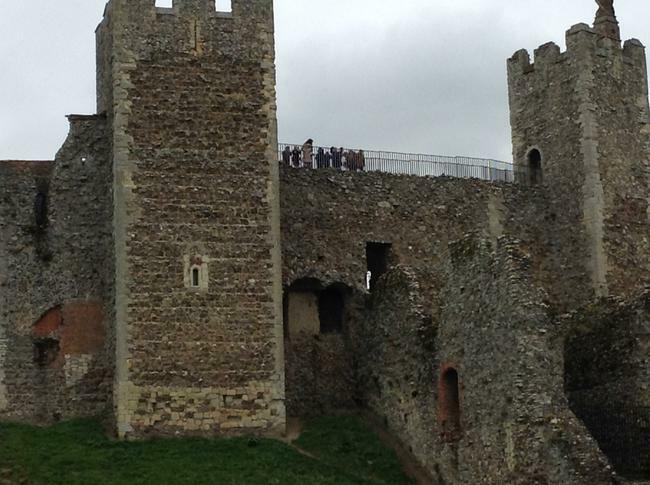 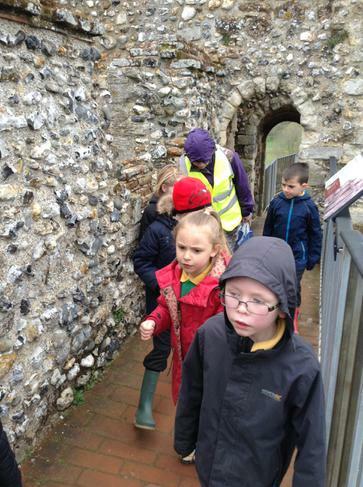 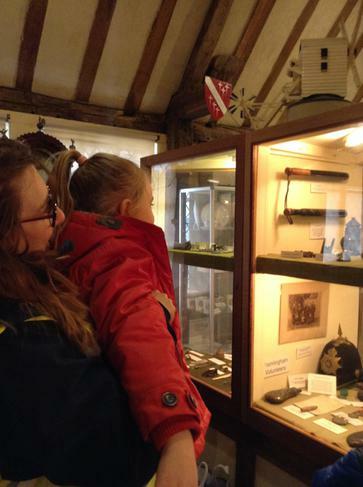 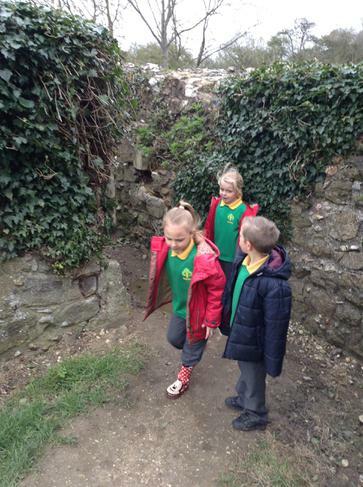 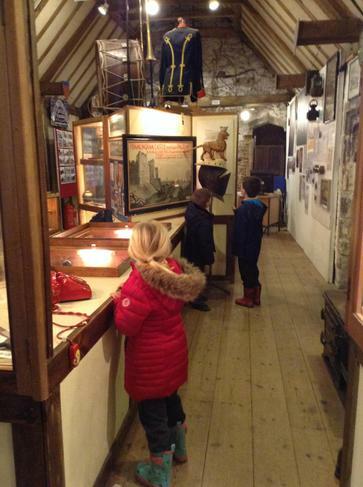 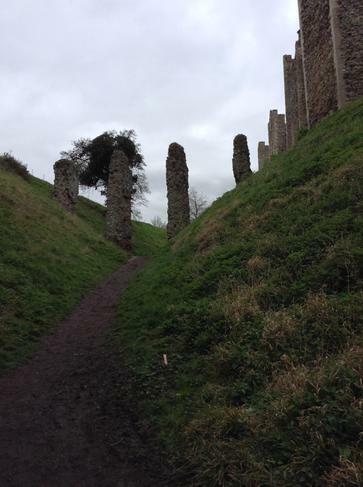 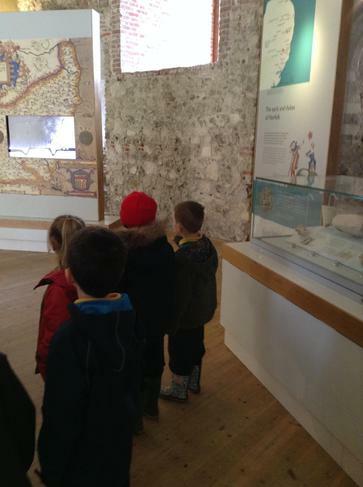 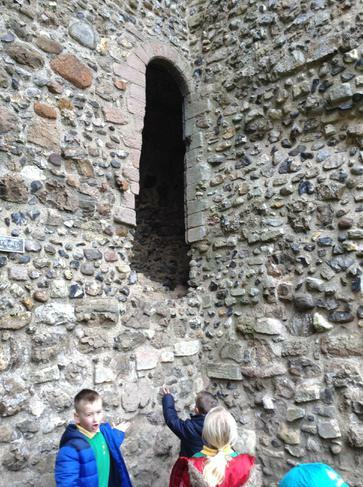 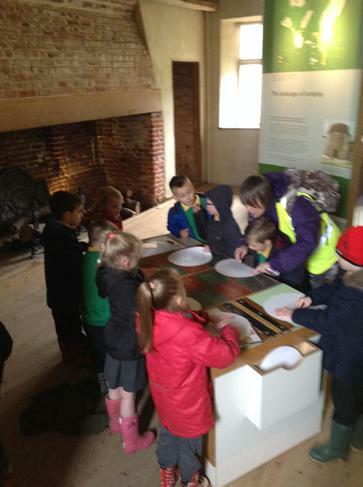 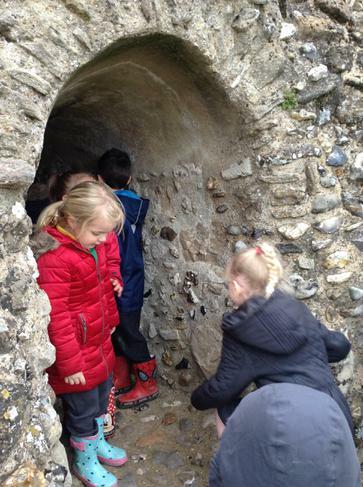 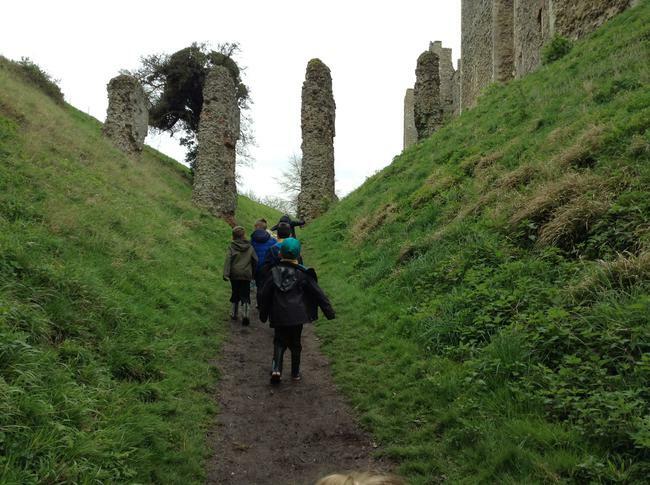 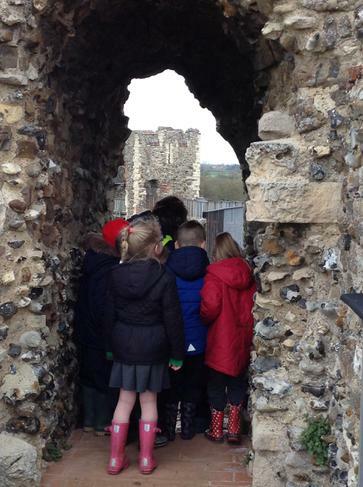 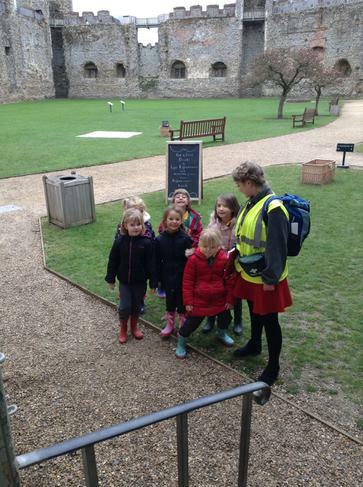 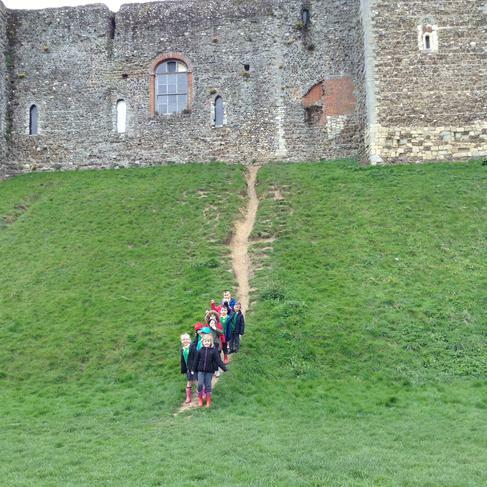 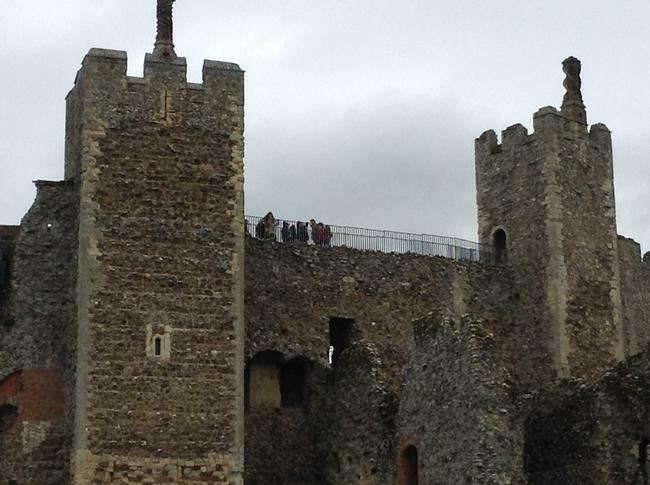 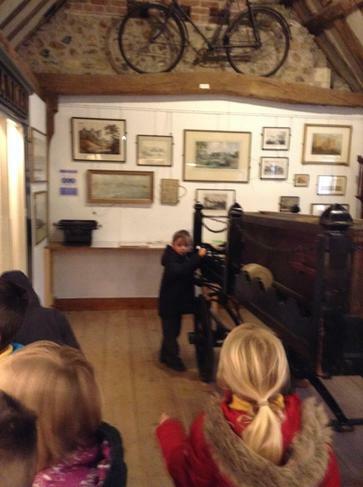 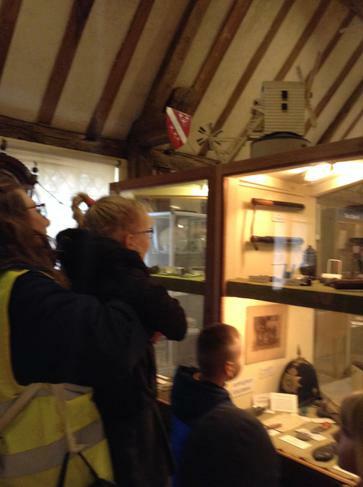 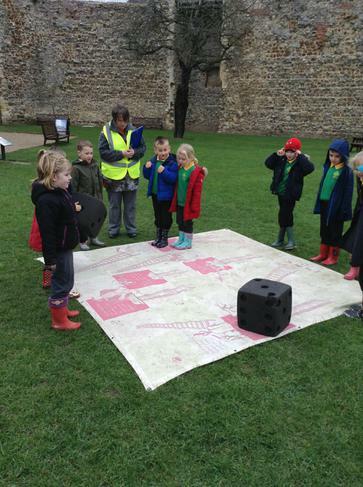 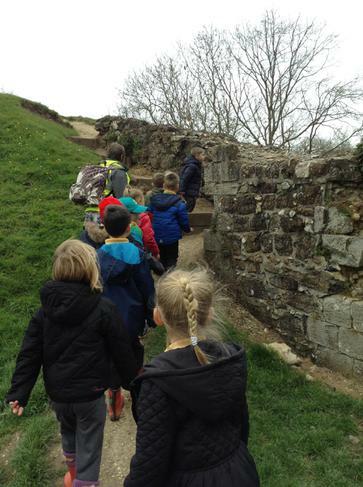 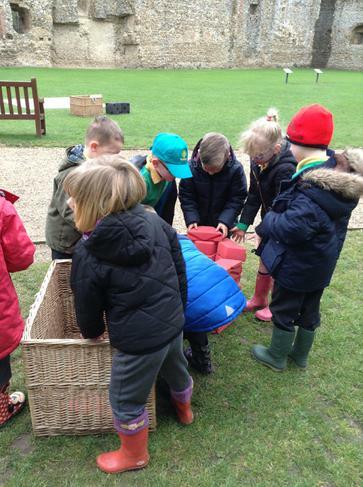 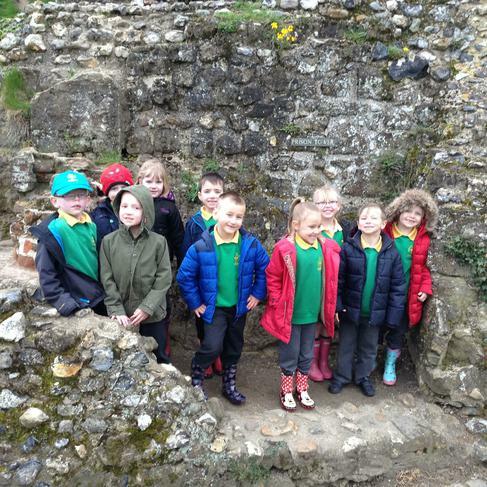 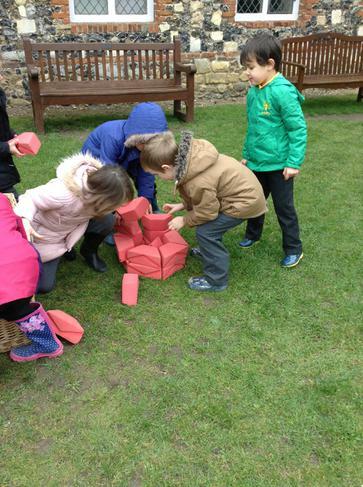 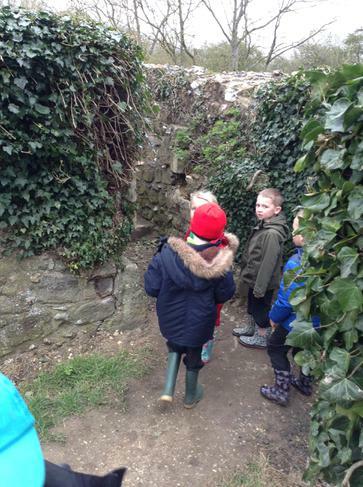 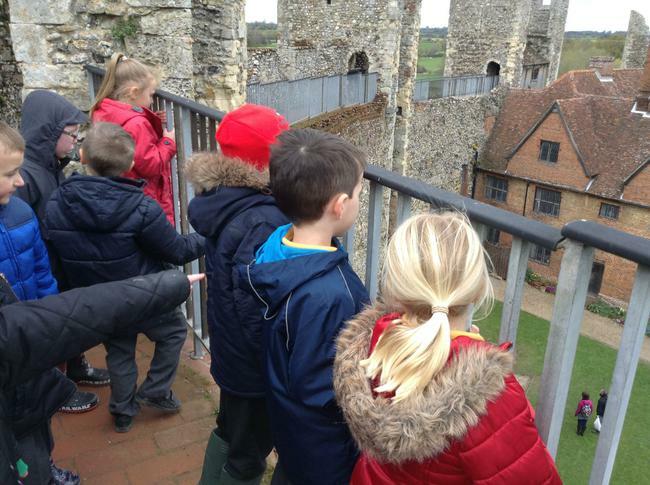 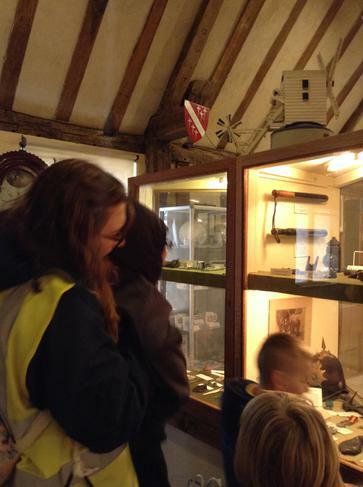 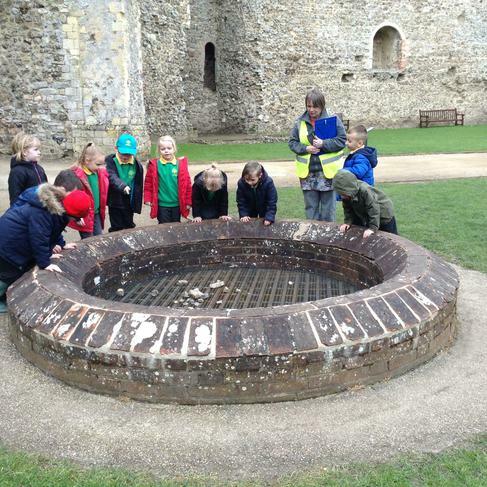 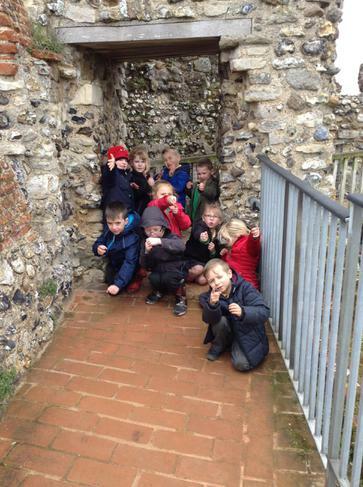 The Rabbits really enjoyed visiting Framlingham Castle and learning all about it. 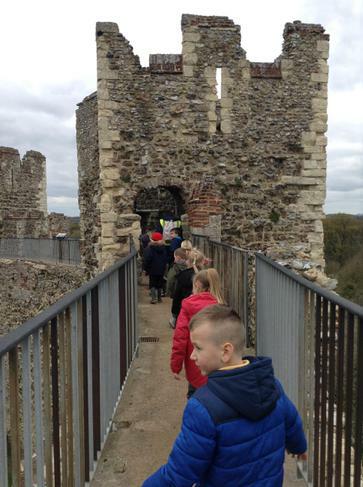 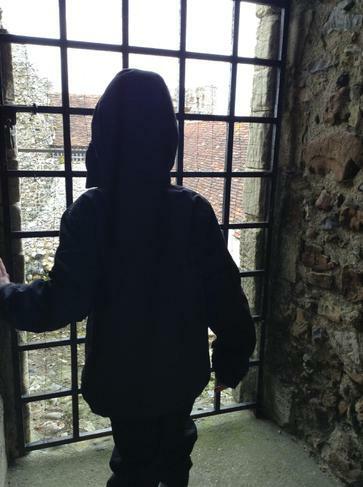 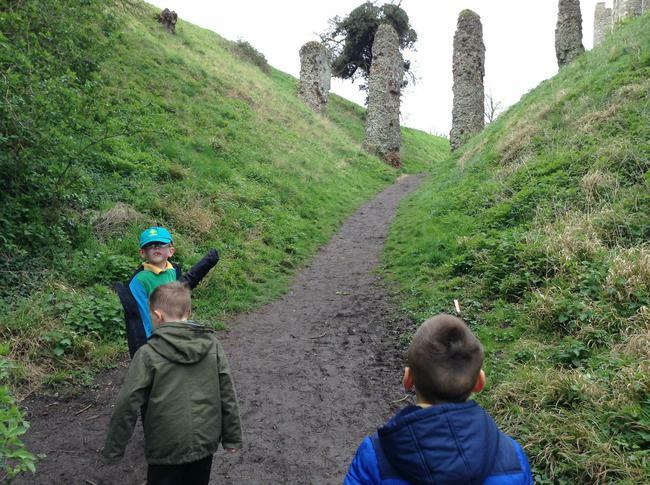 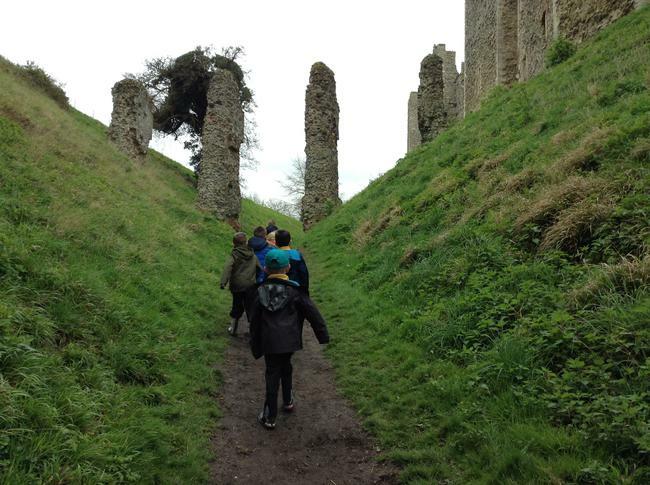 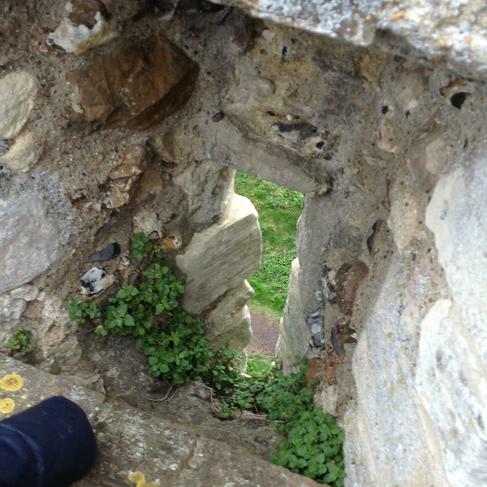 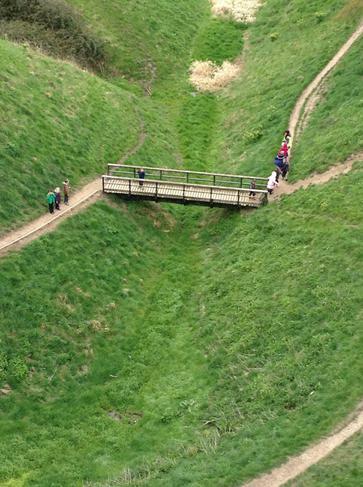 Highlights of the day were walking around the top of the castle, exploring the moat and castle ruins and tucking into our lunches! 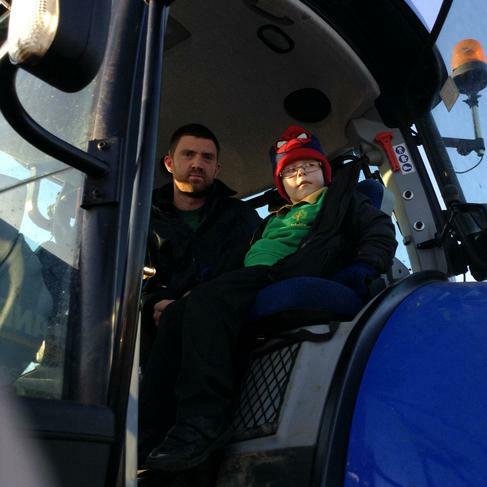 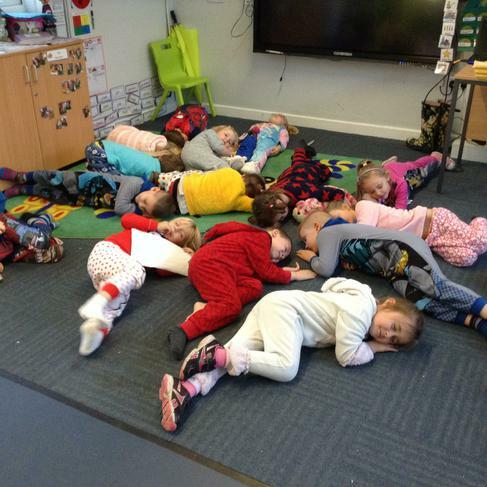 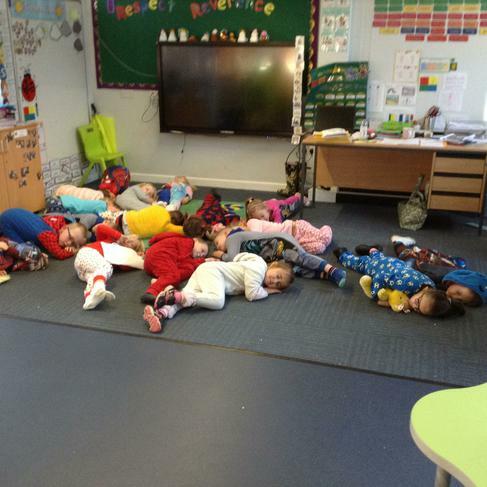 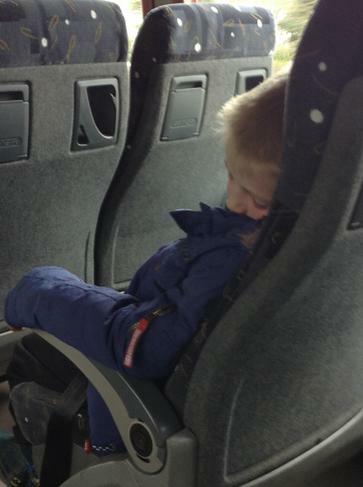 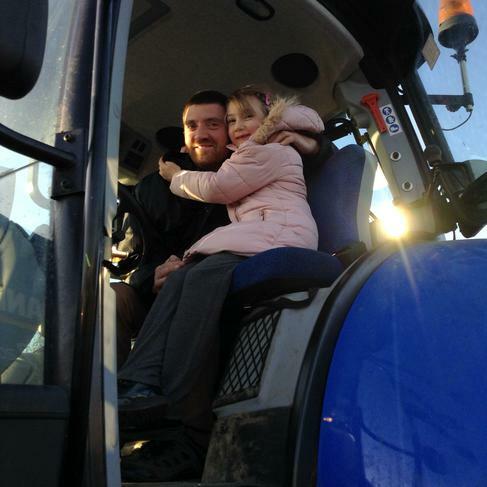 It was such a busy day some children enjoyed a short nap on the way home. 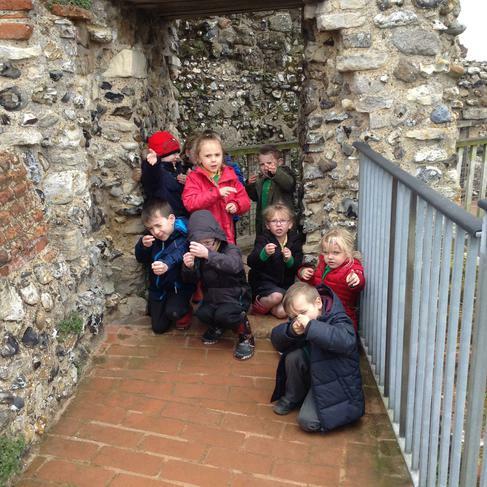 No spellings for over half term. 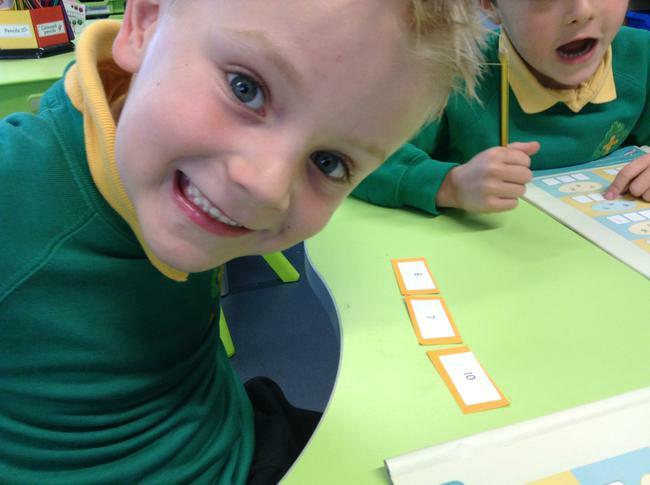 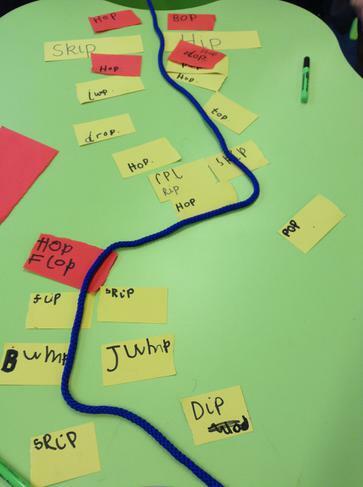 However, if you would like to work with your child on additional spellings the high frequency words are useful to learn and practice (a copy of these can be found in your child’s homework book). 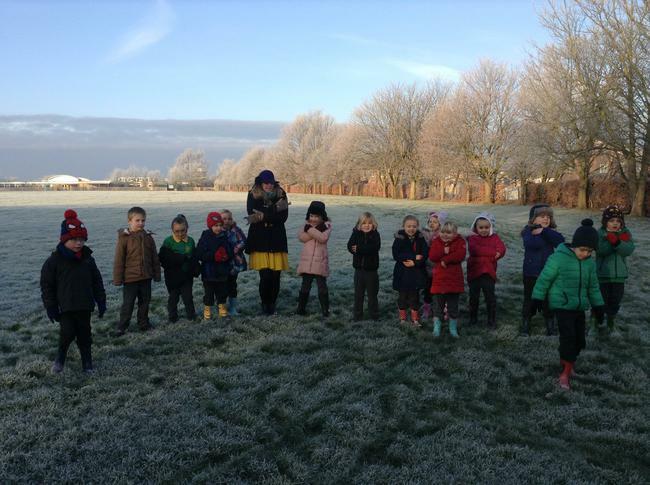 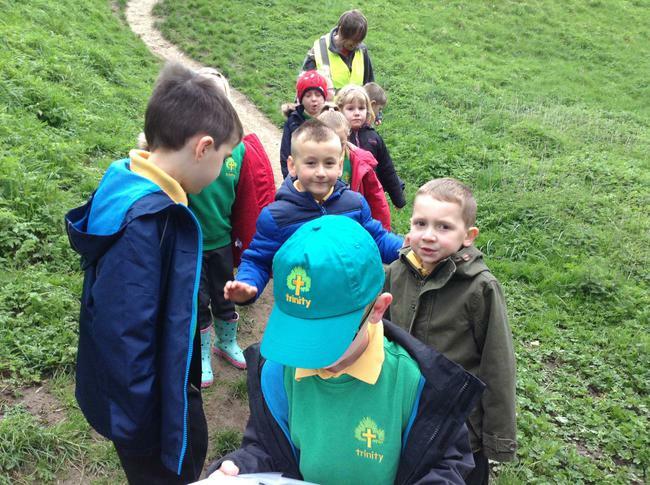 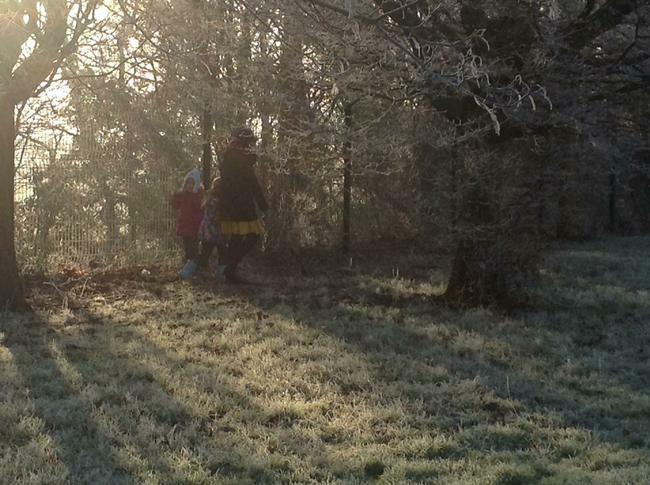 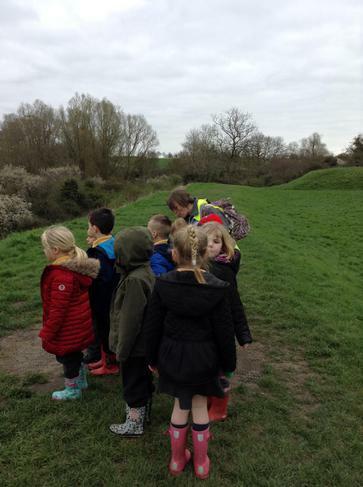 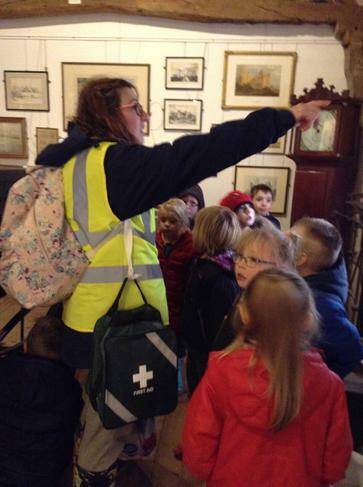 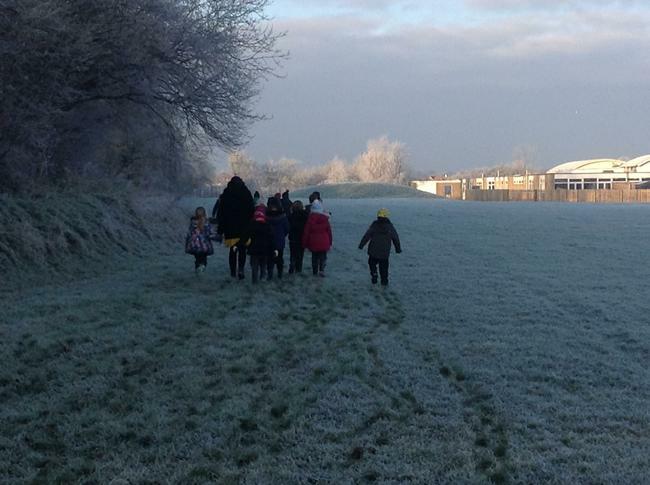 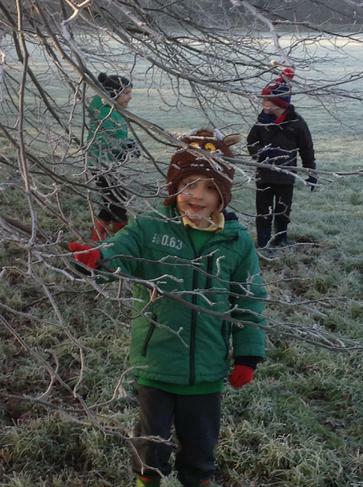 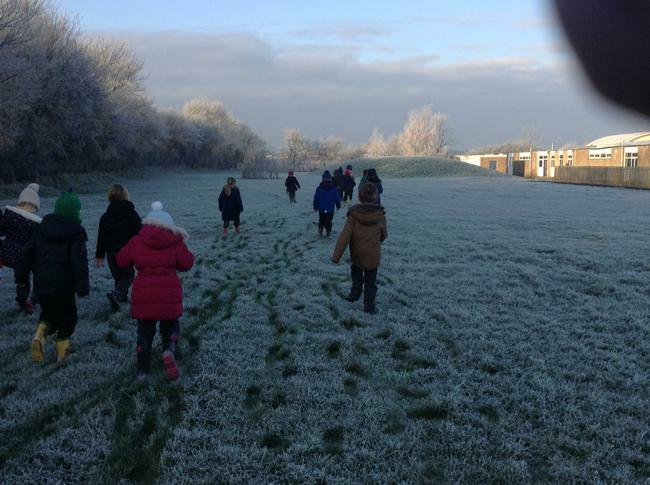 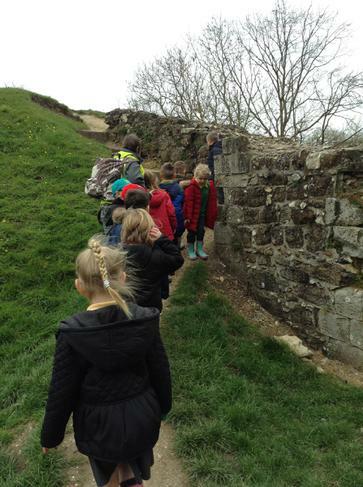 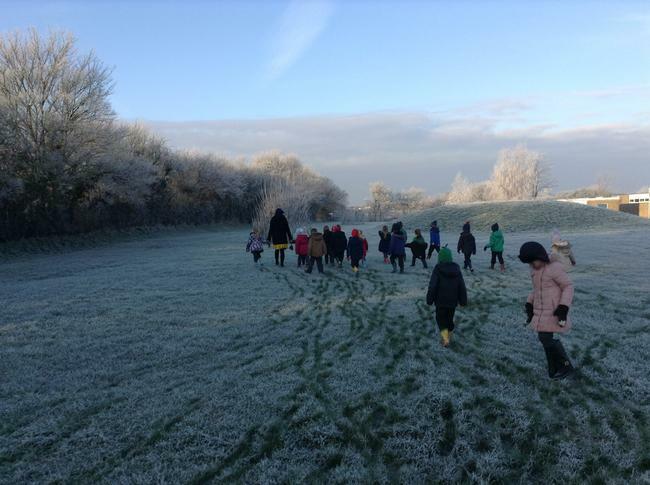 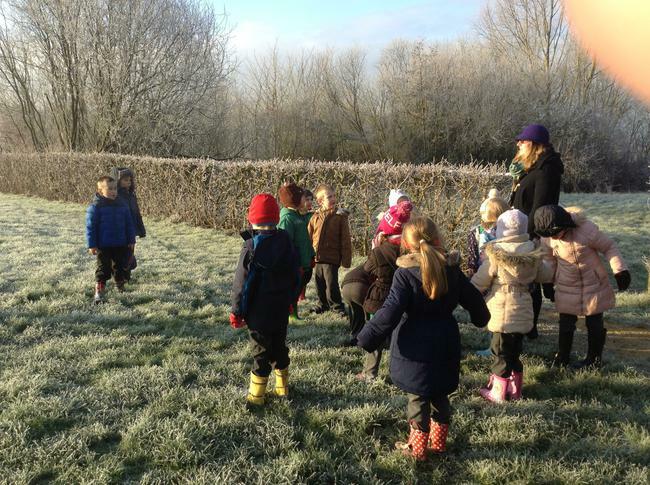 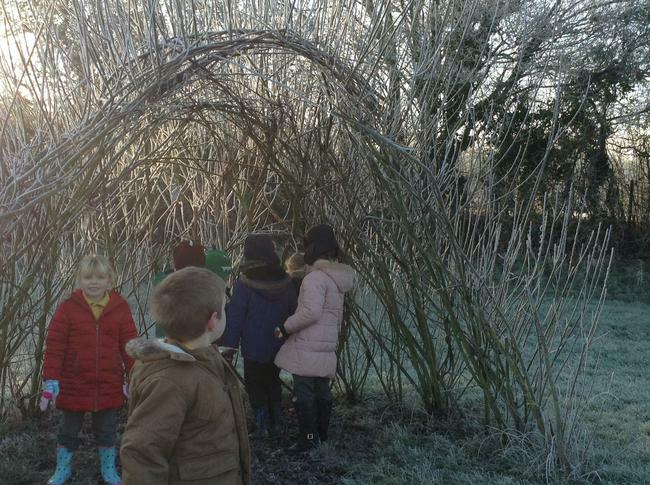 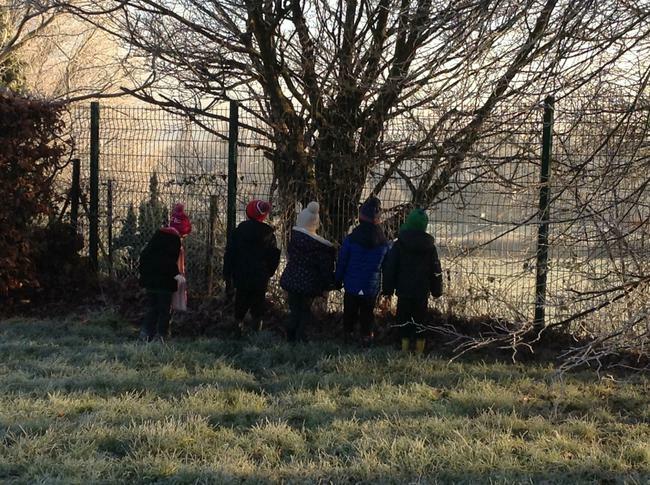 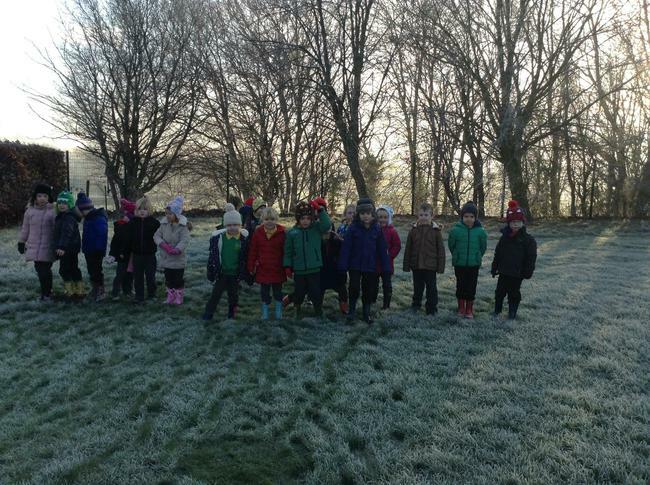 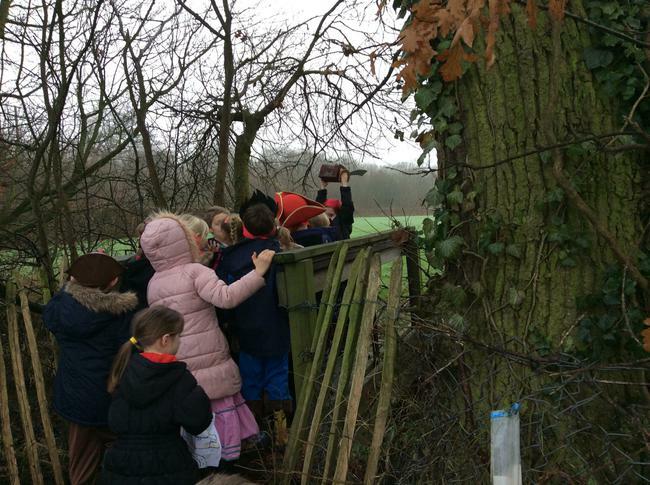 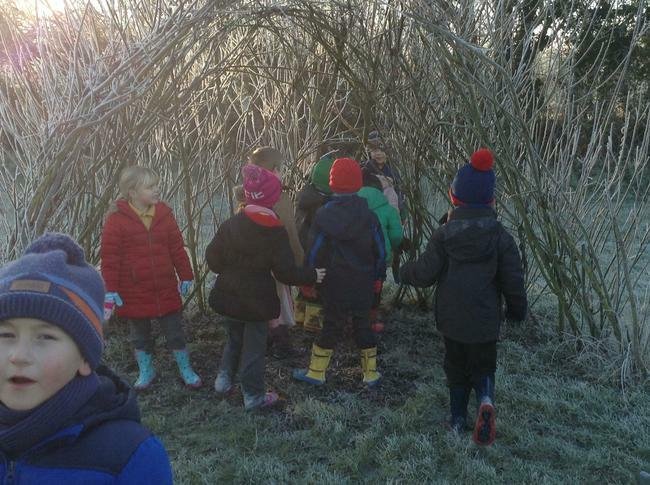 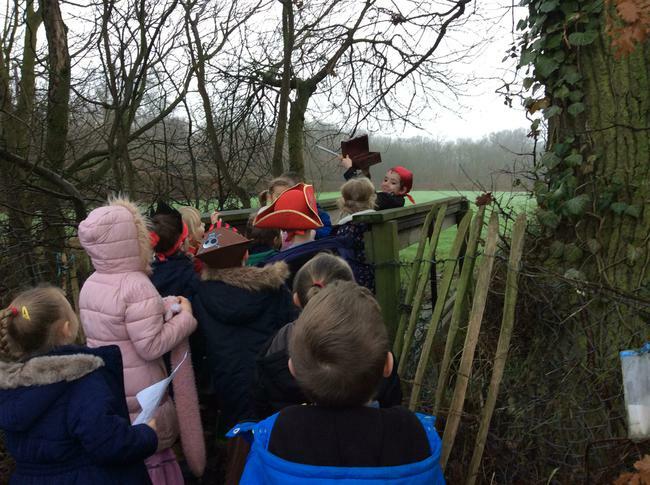 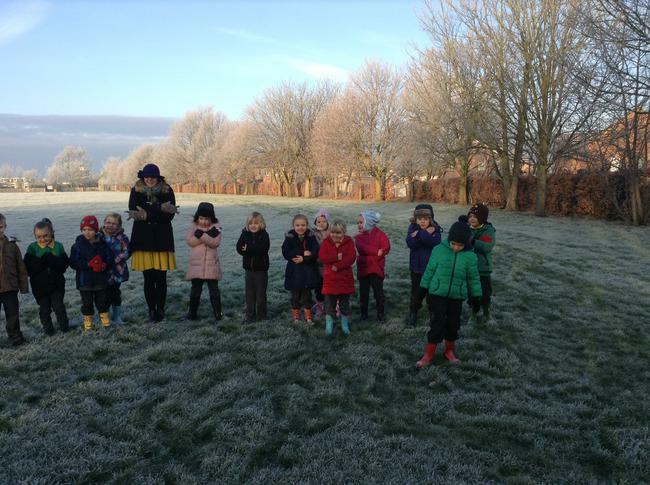 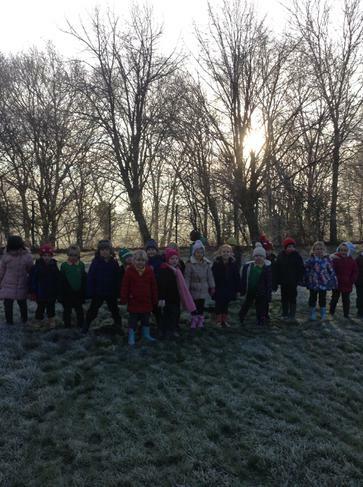 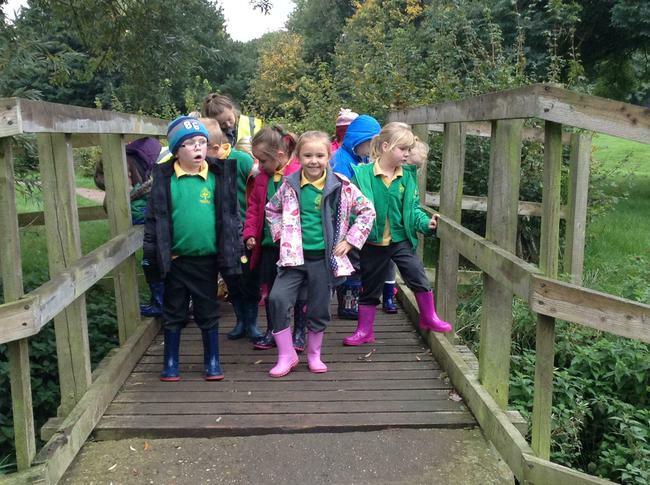 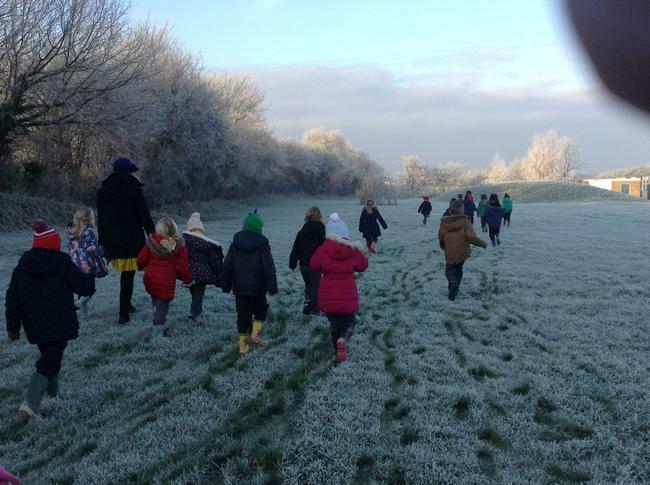 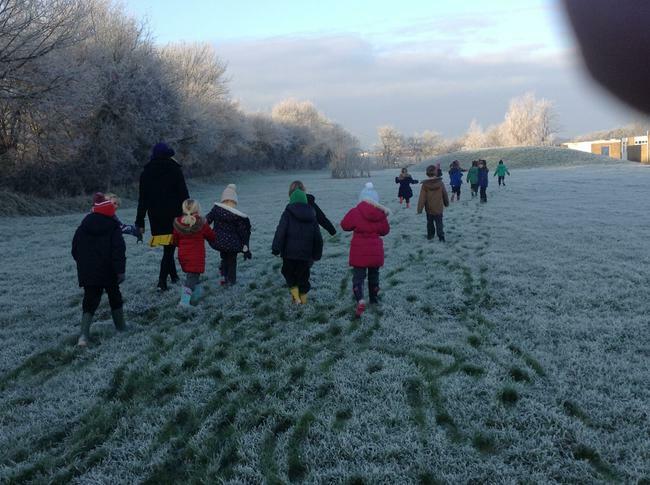 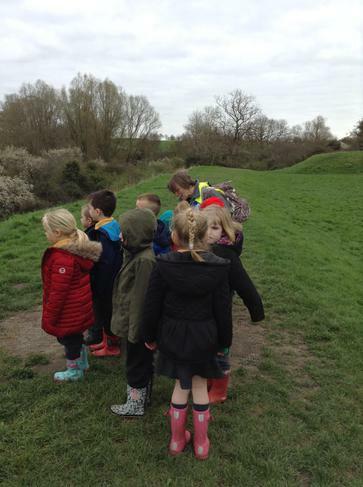 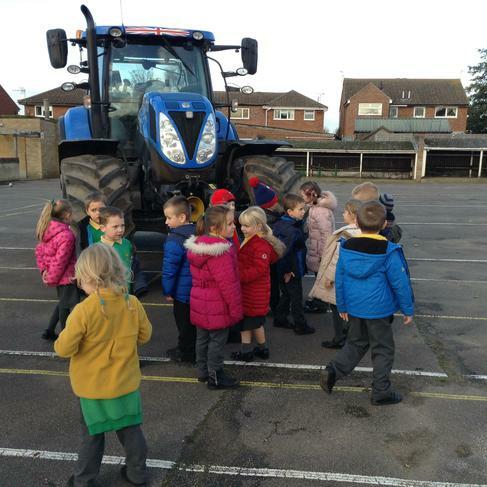 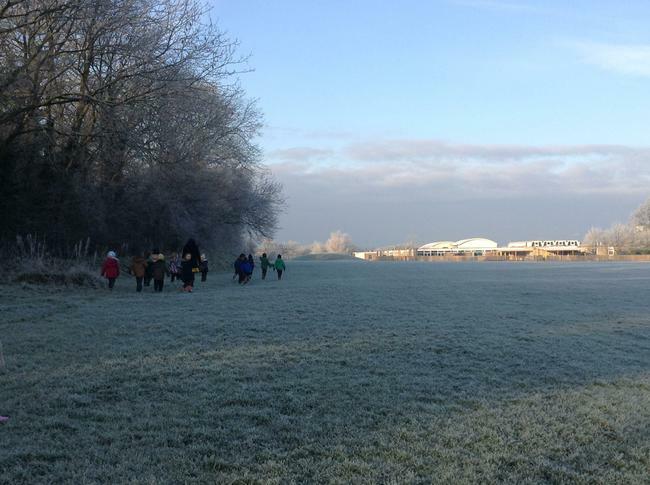 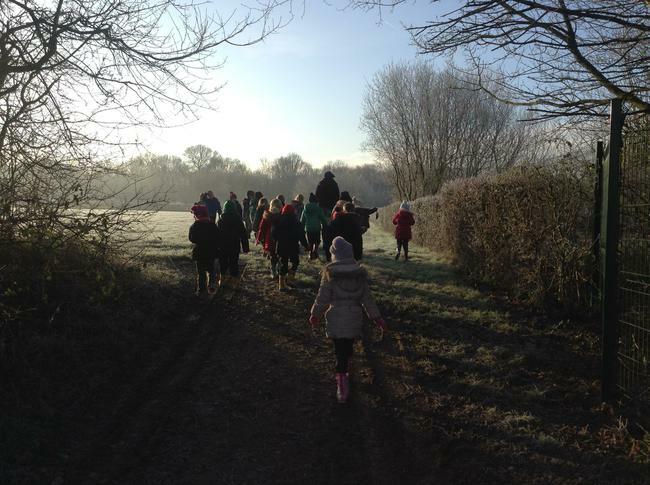 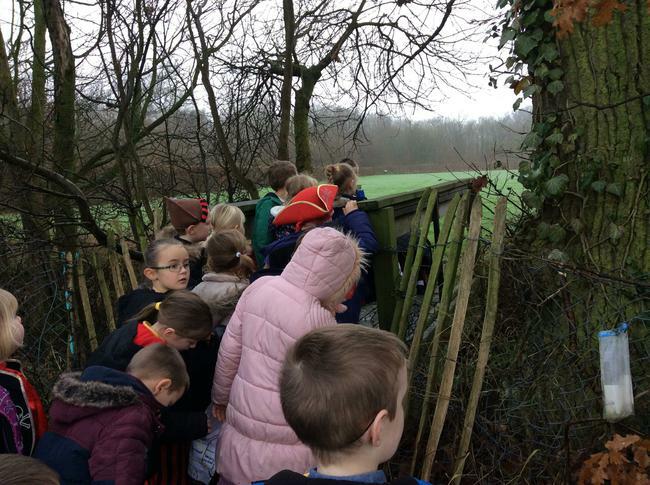 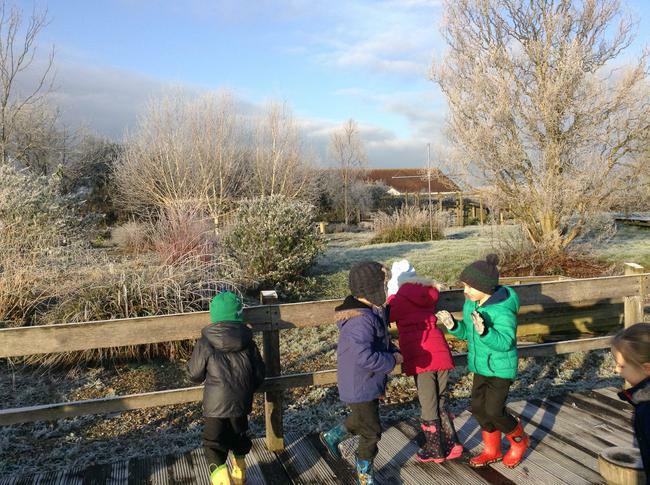 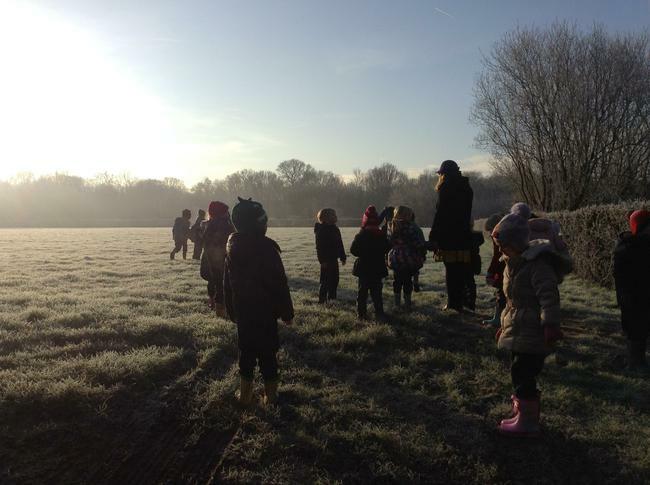 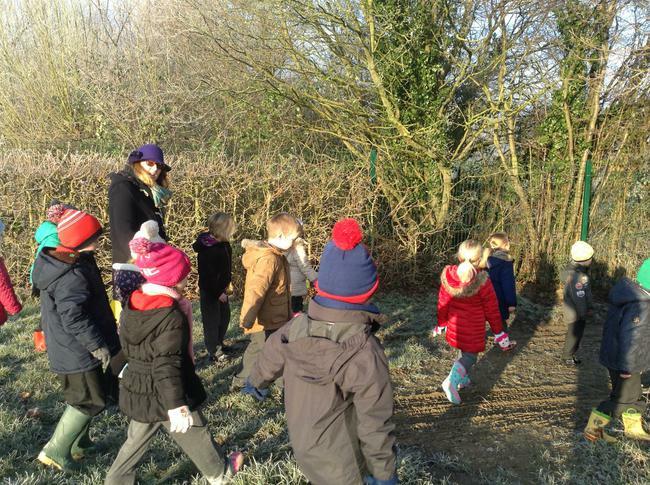 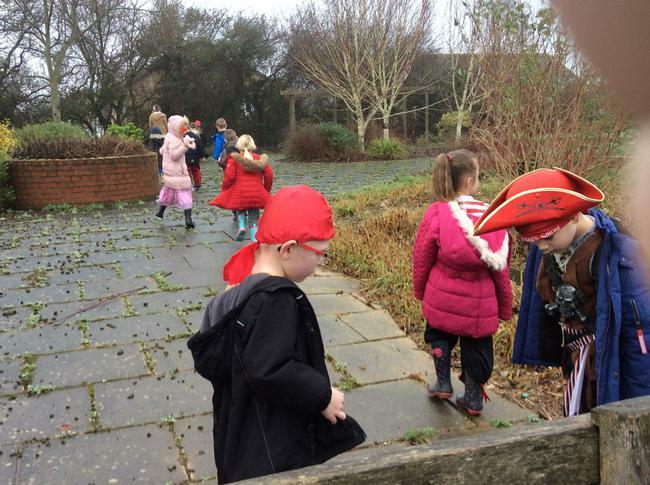 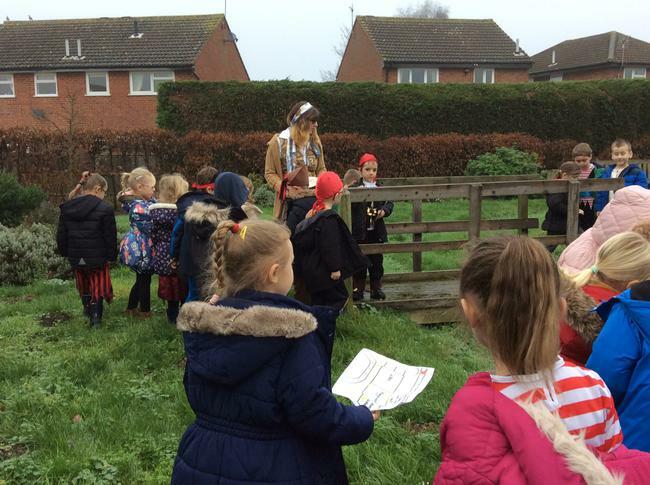 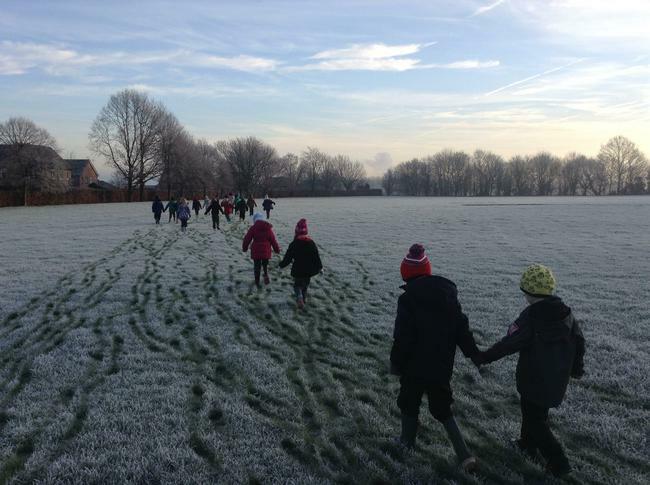 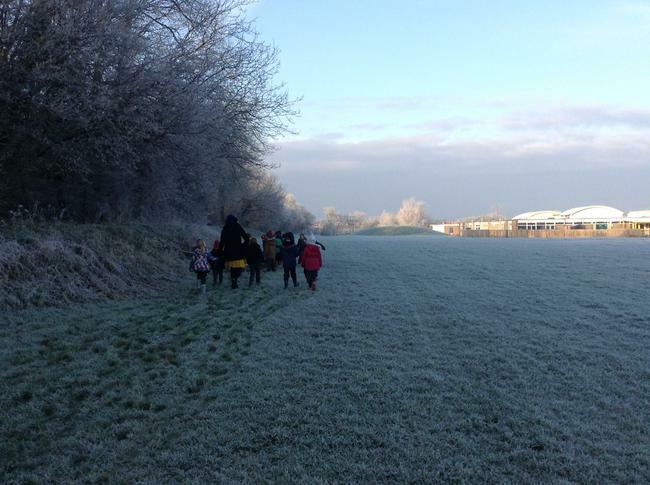 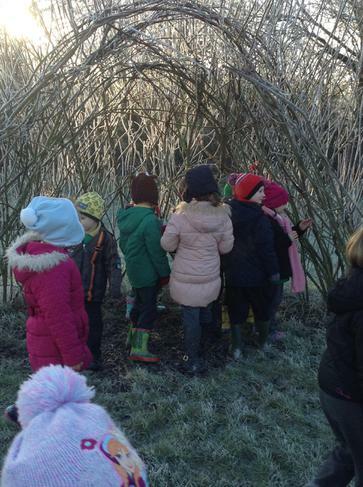 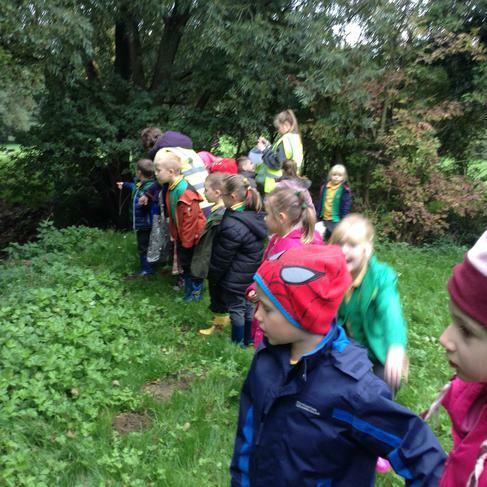 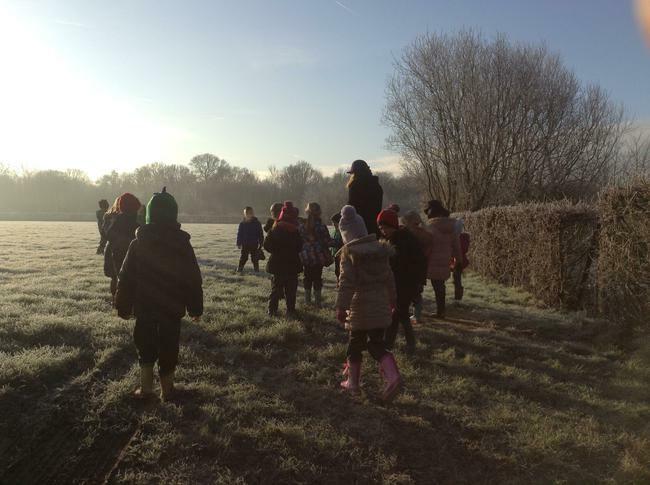 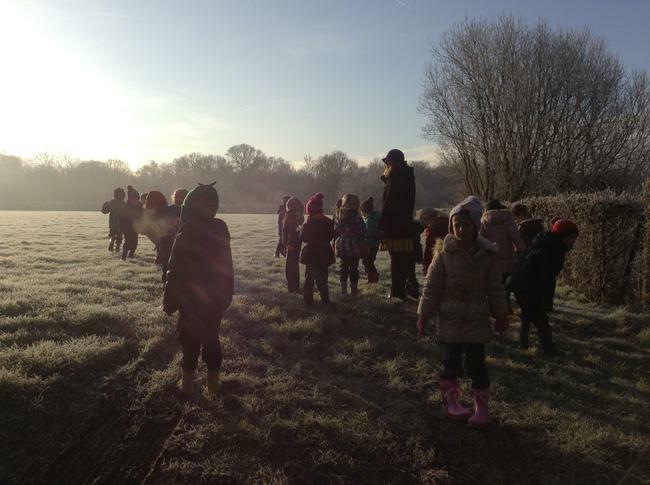 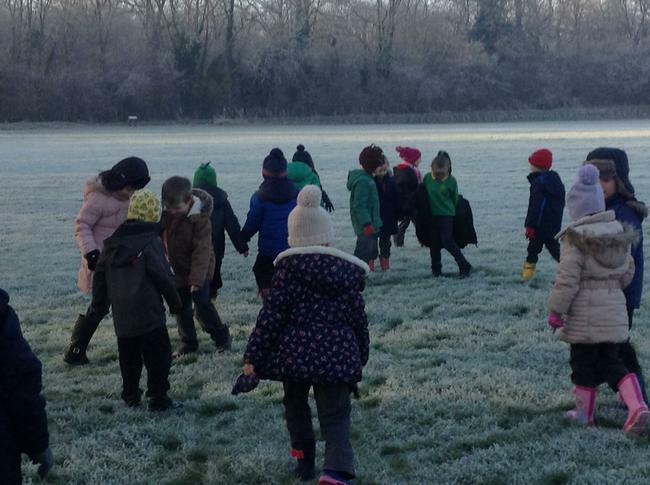 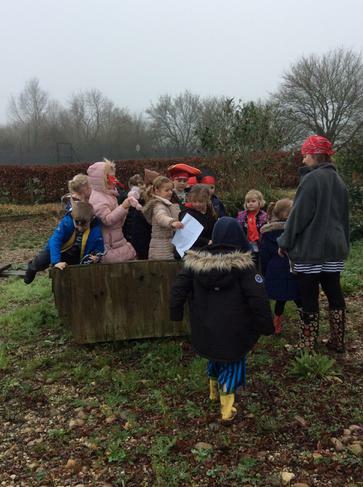 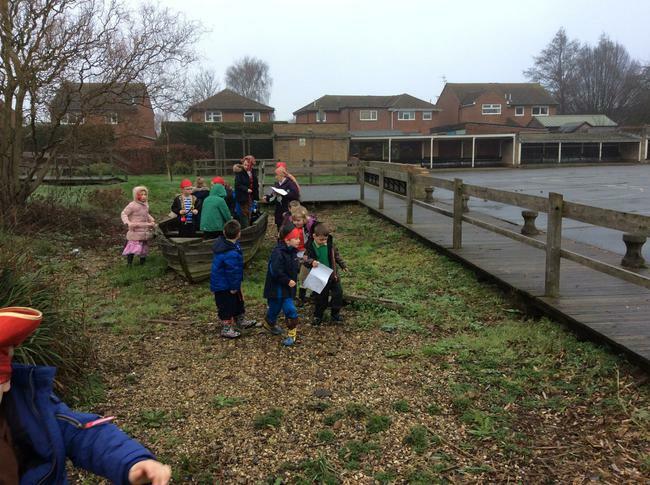 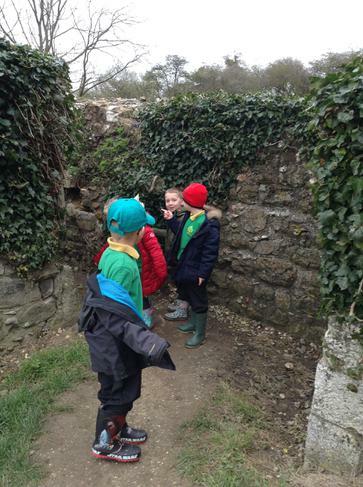 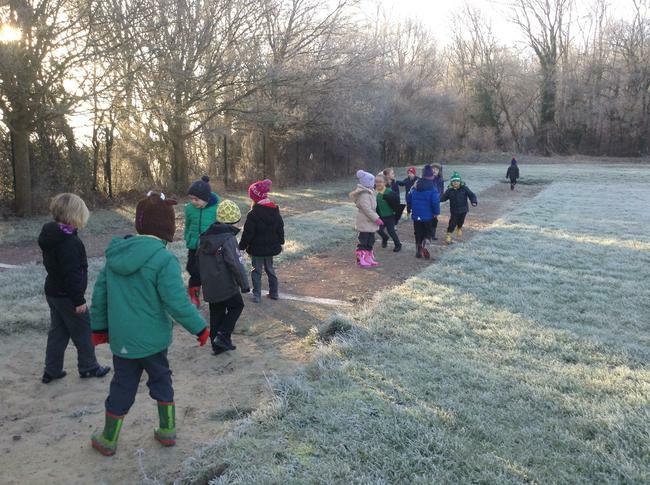 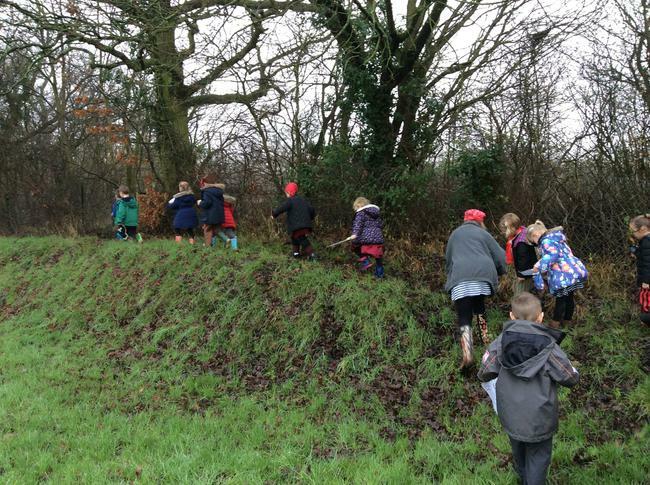 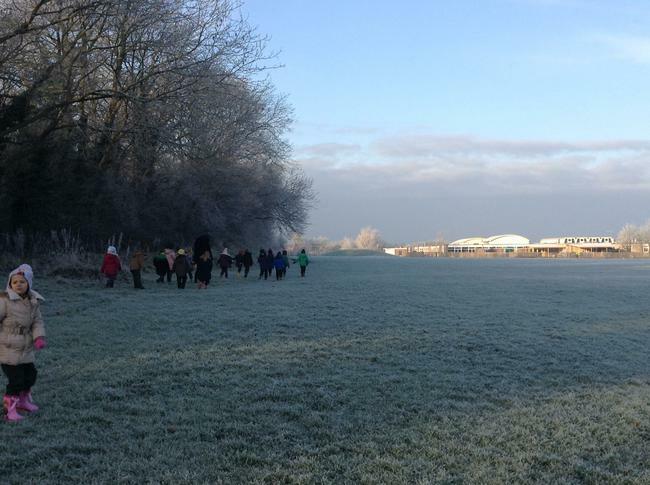 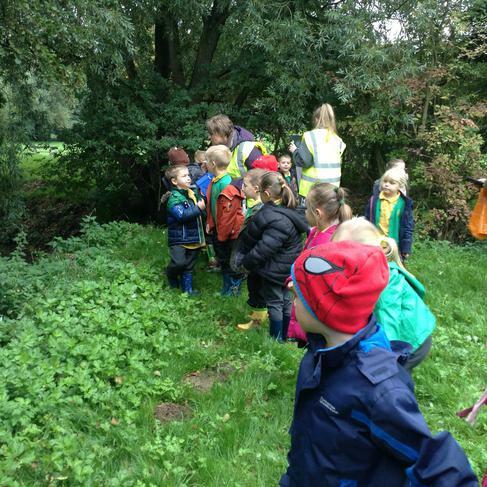 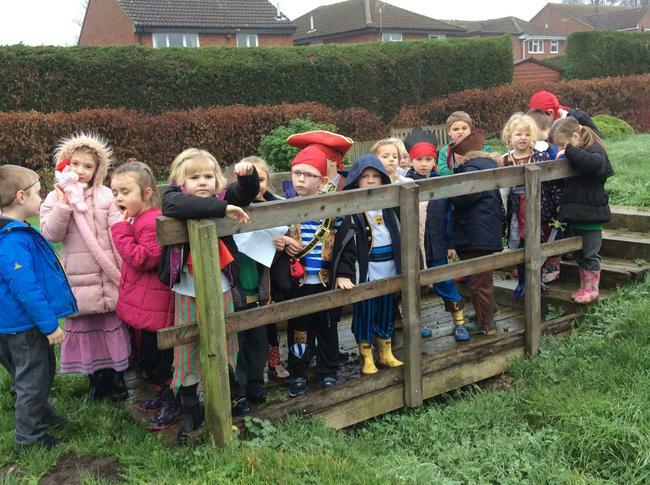 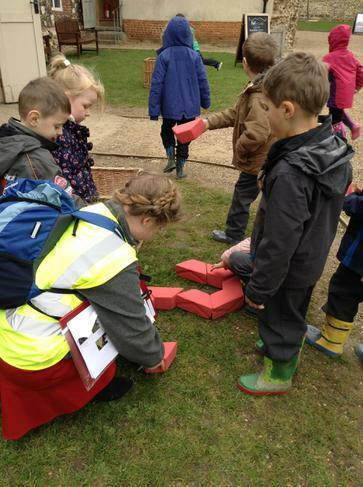 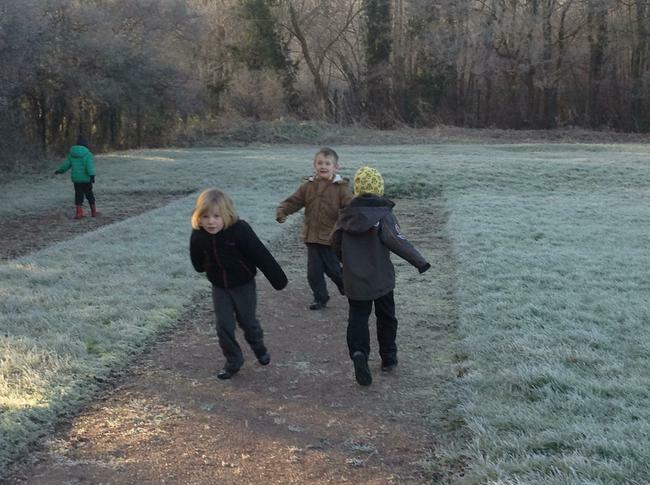 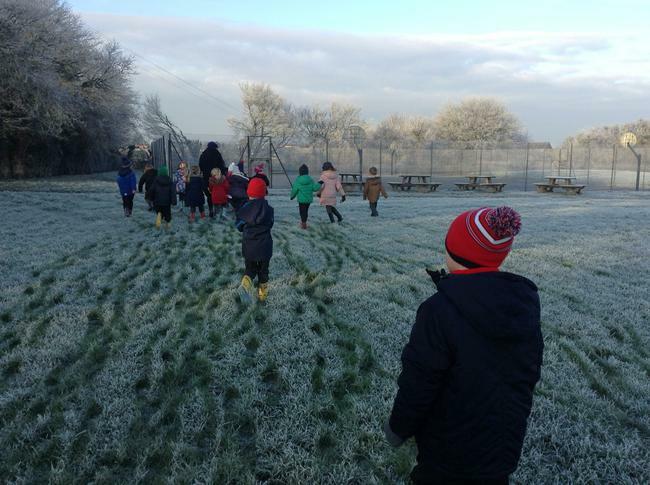 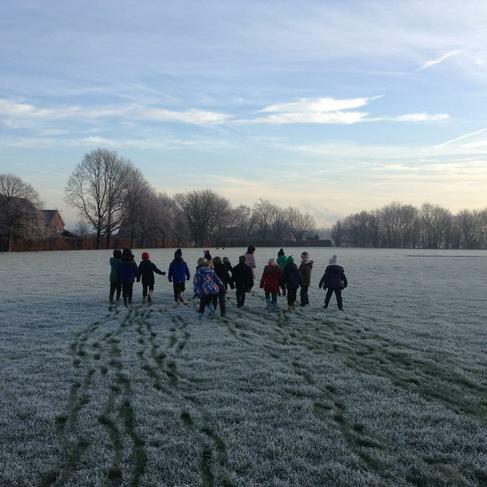 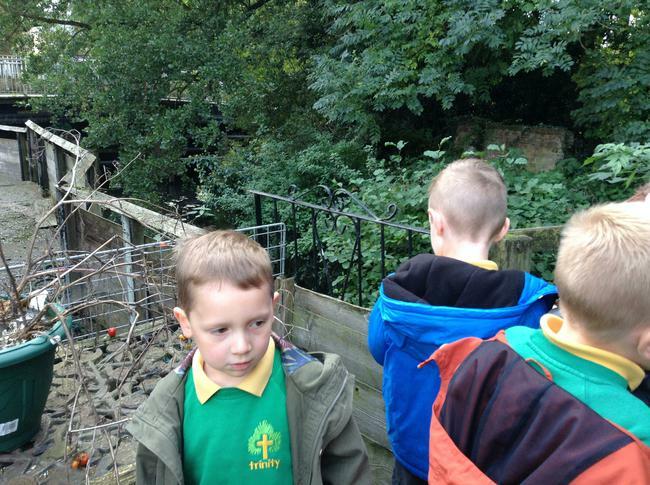 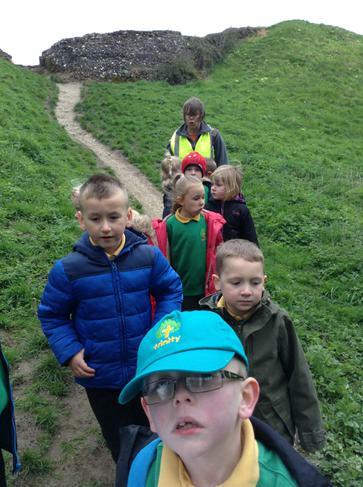 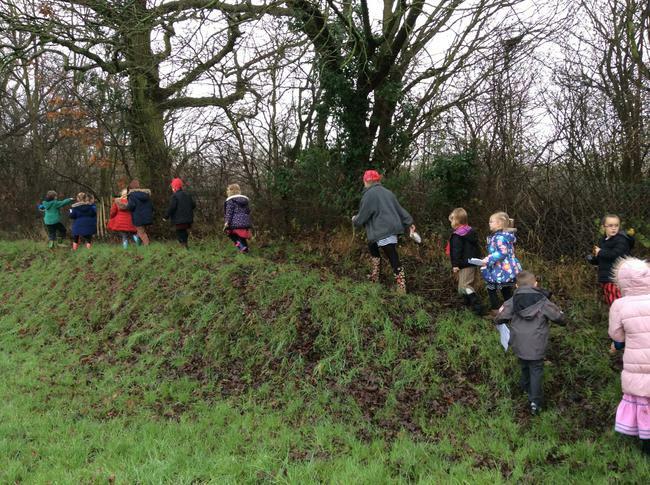 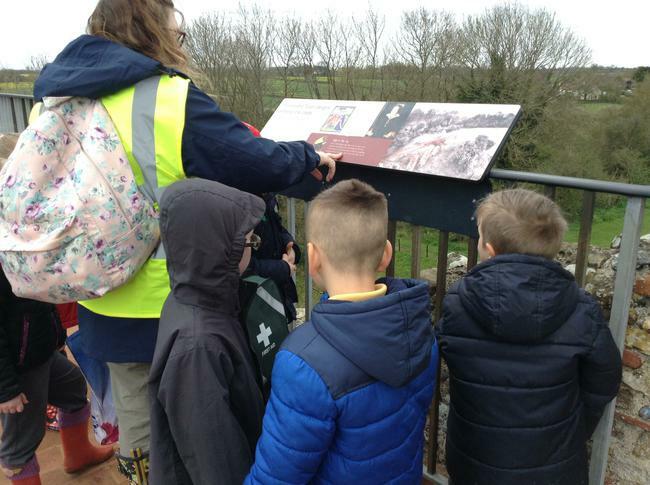 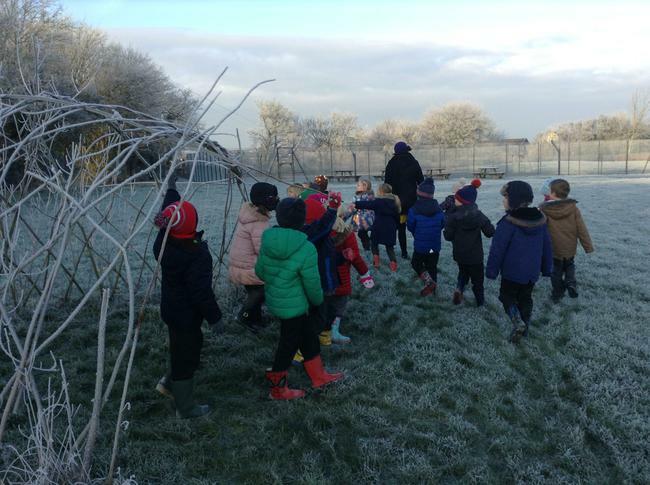 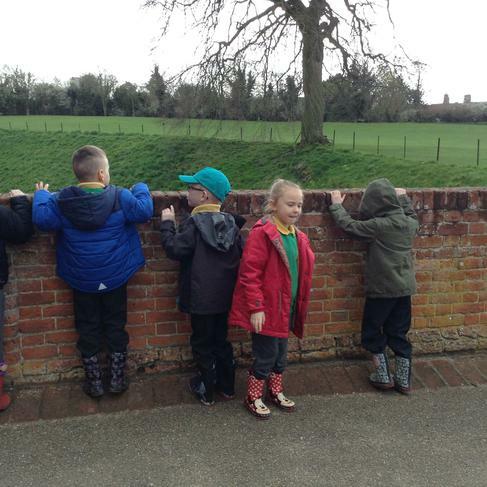 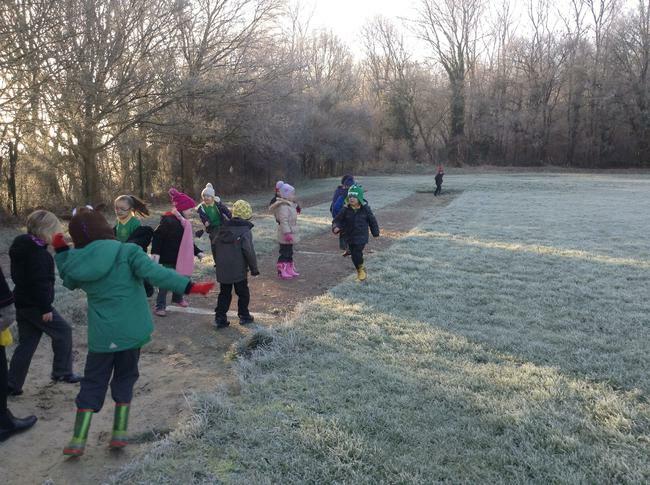 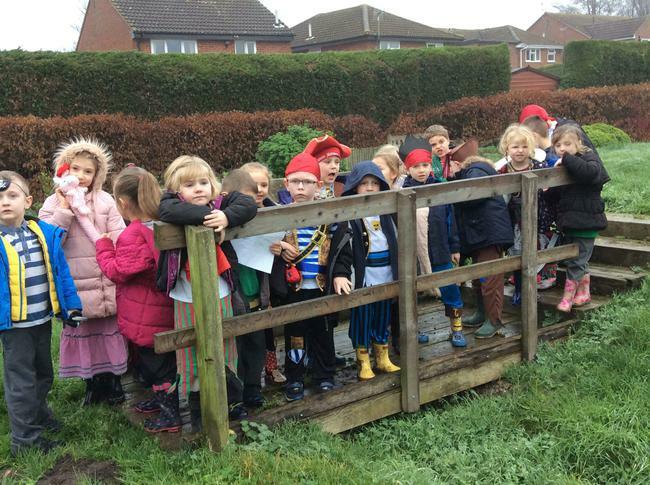 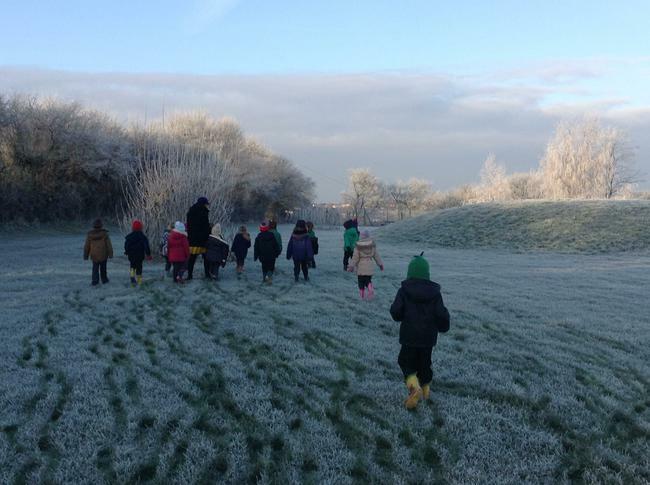 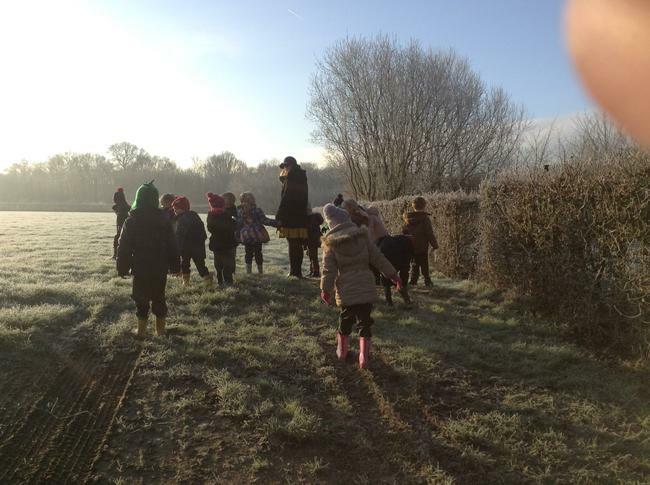 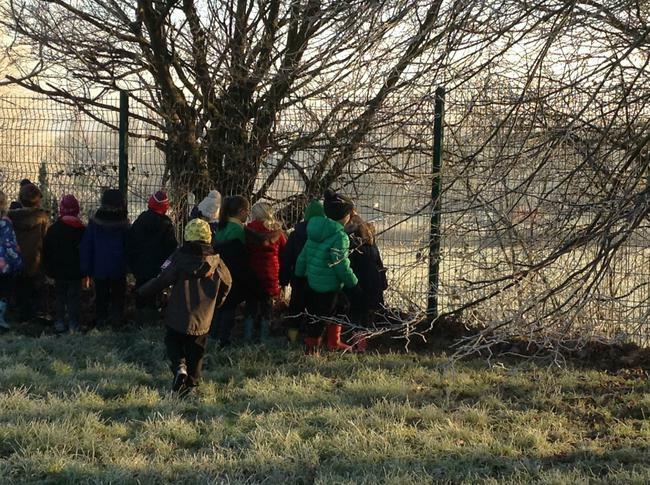 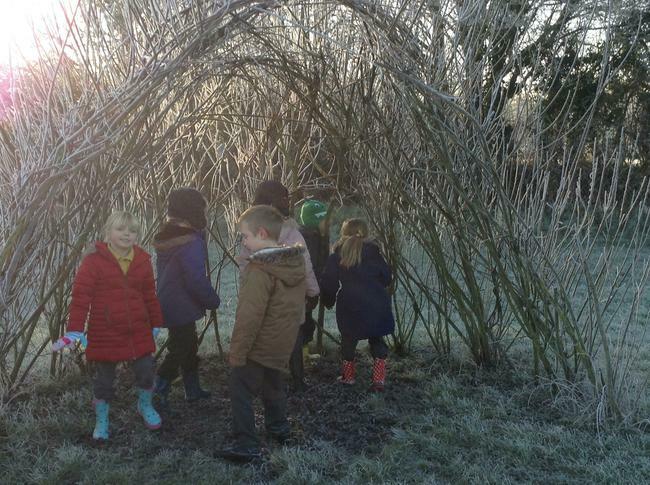 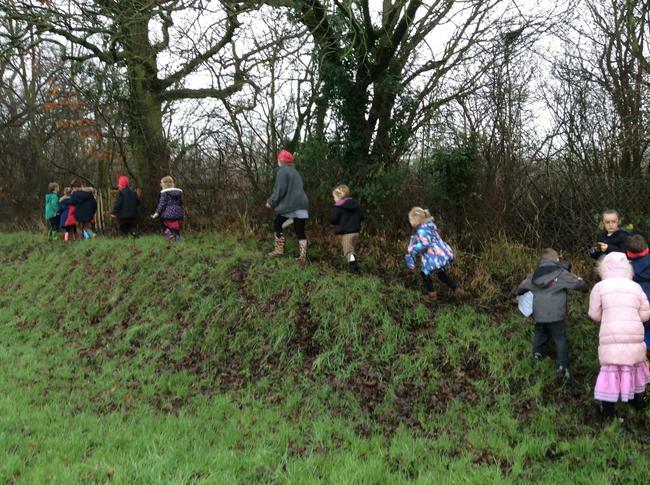 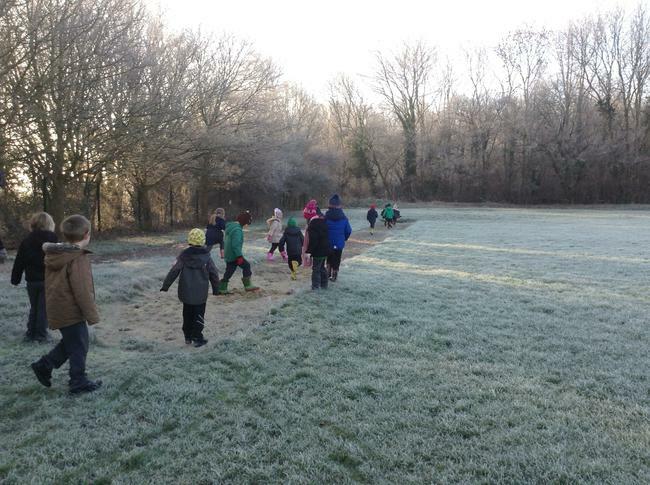 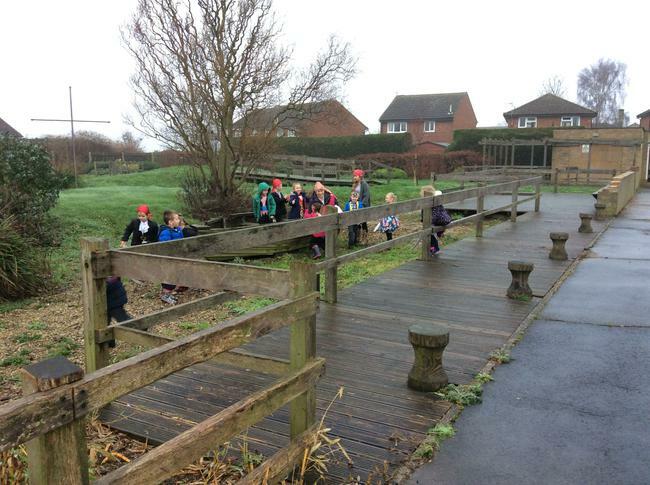 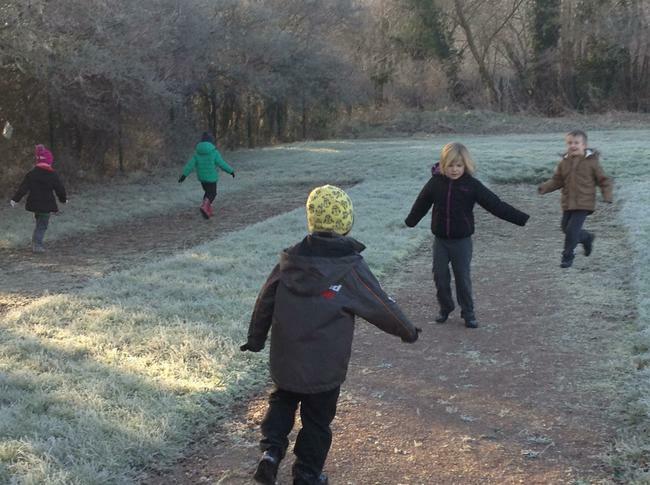 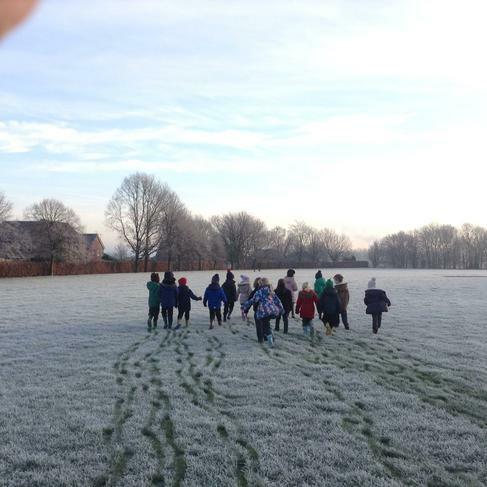 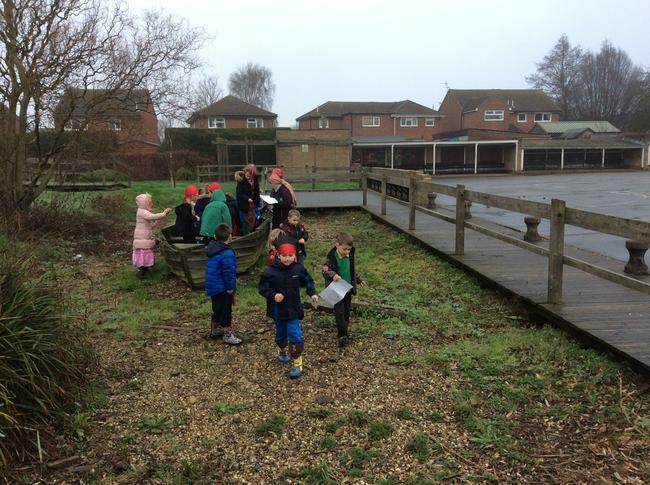 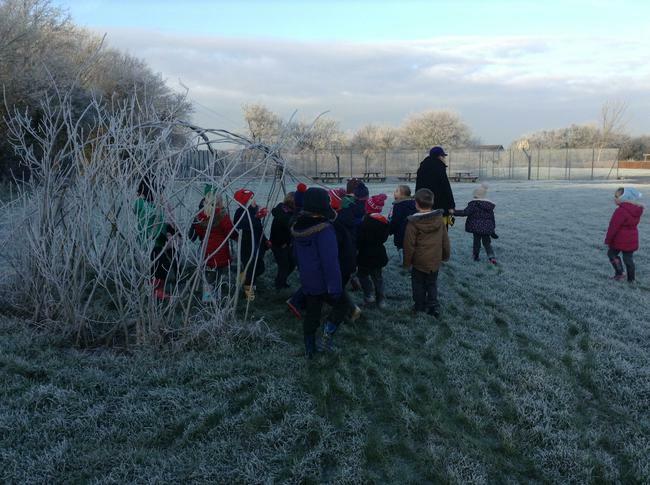 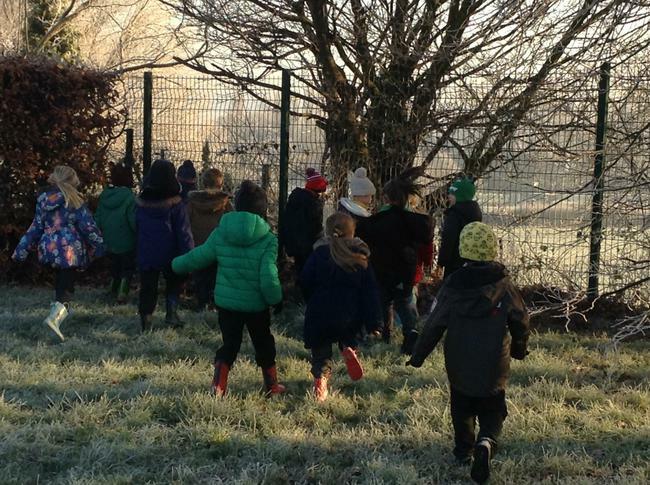 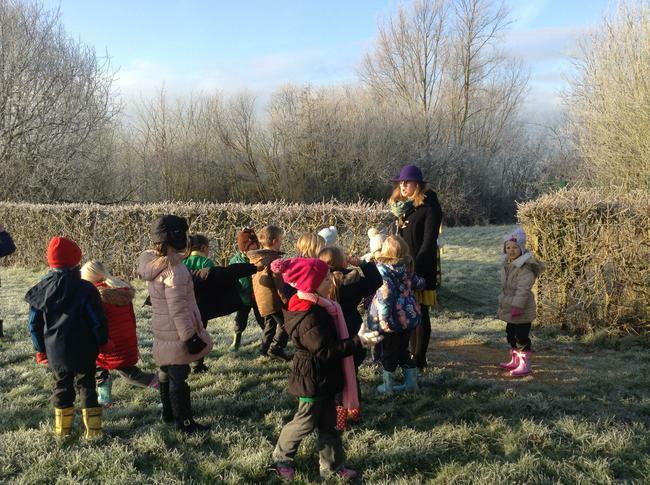 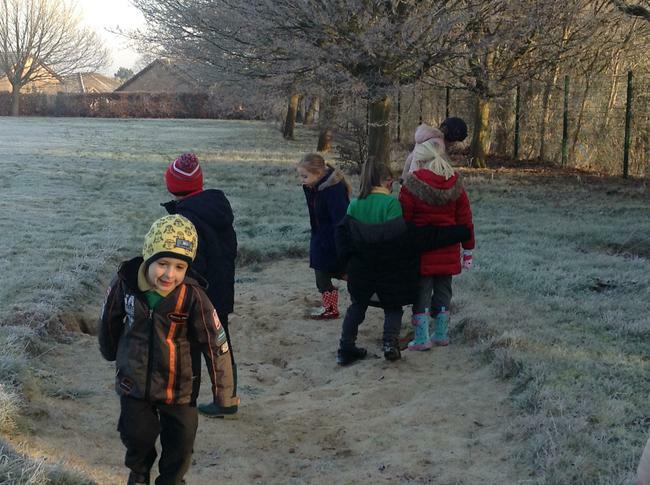 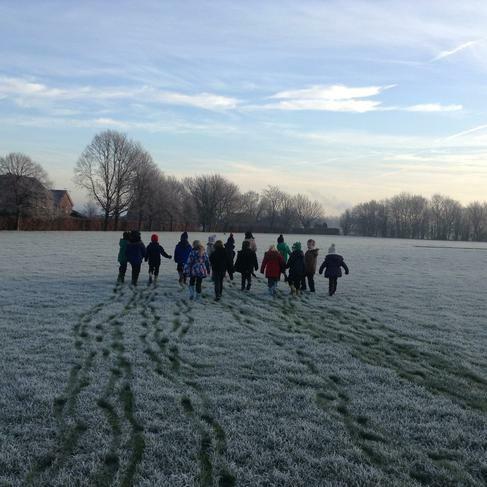 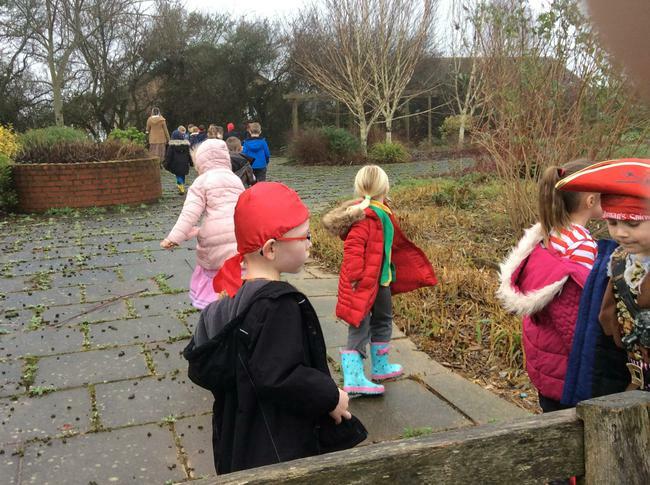 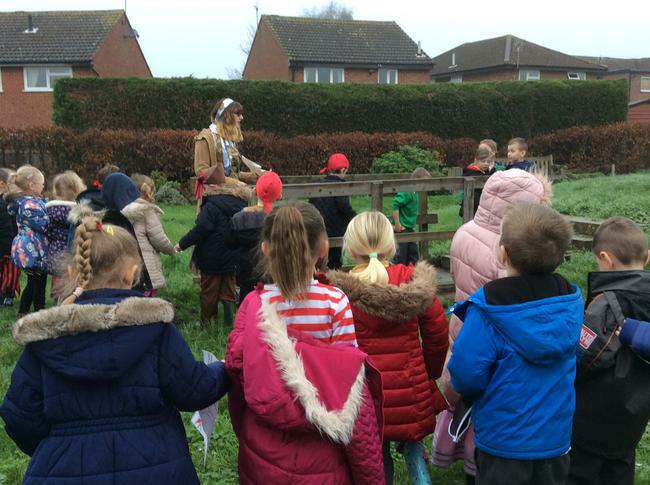 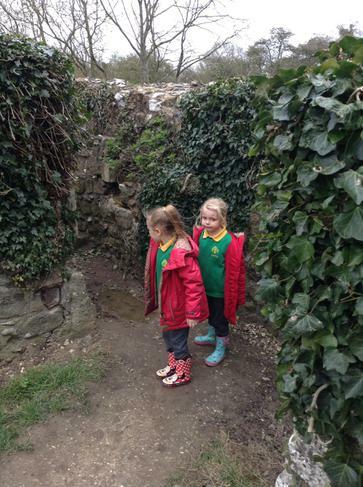 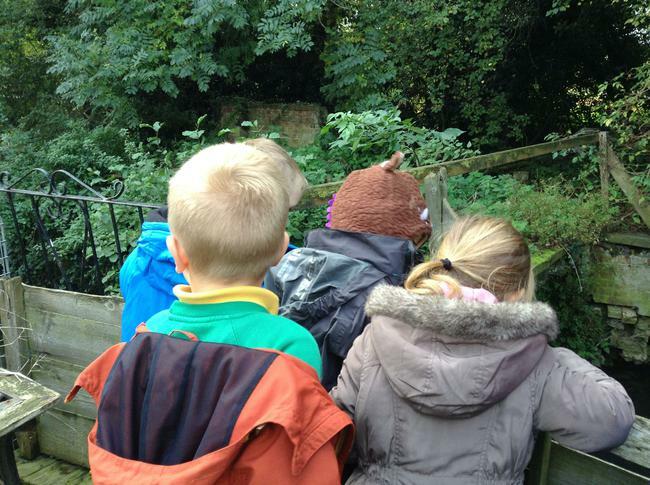 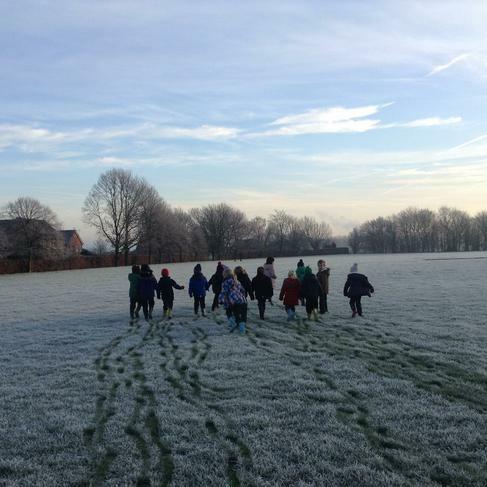 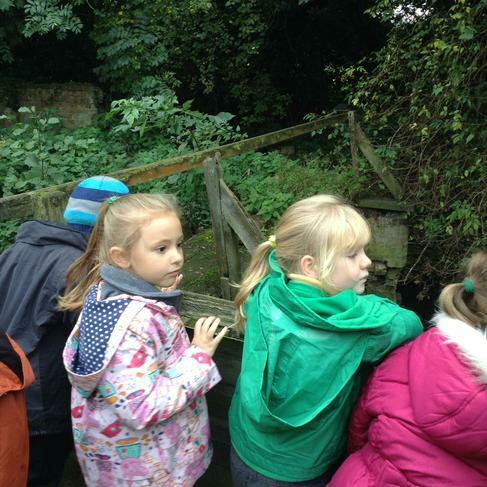 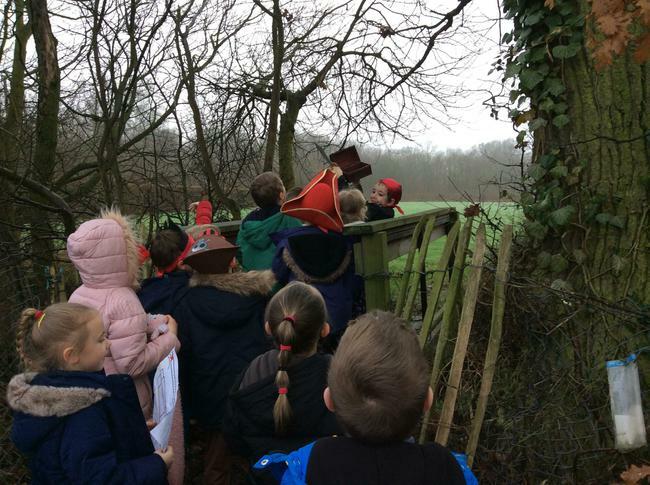 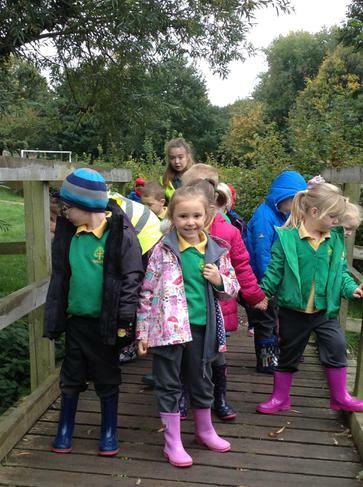 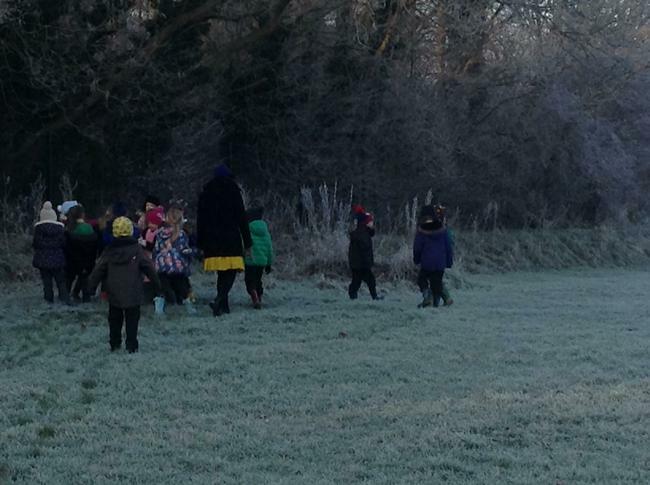 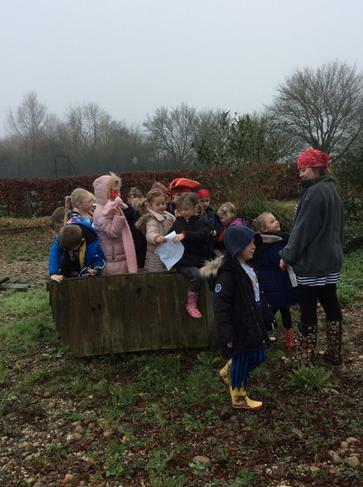 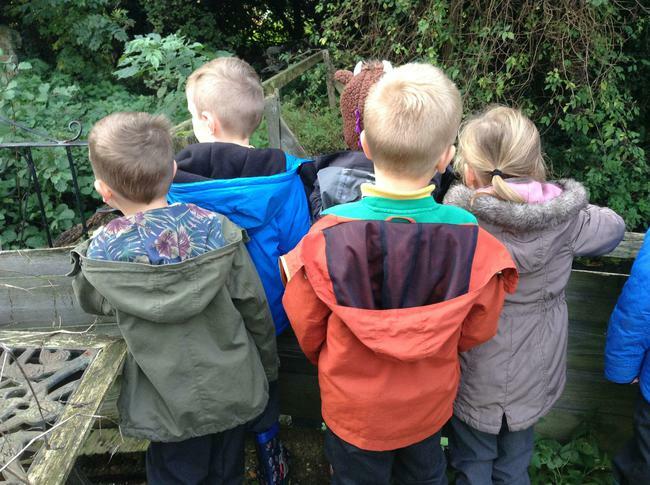 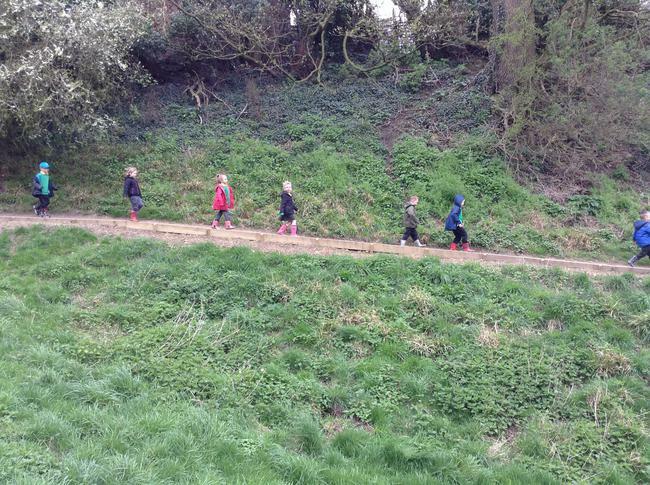 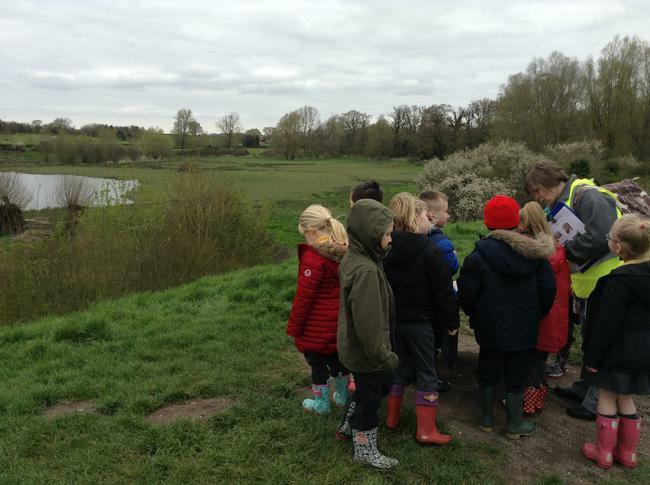 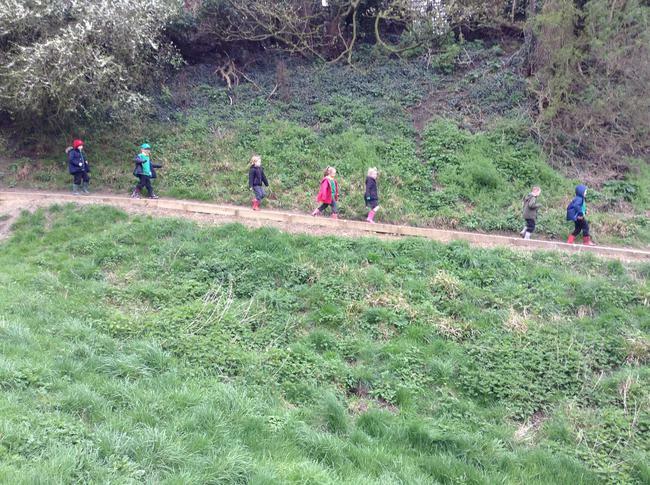 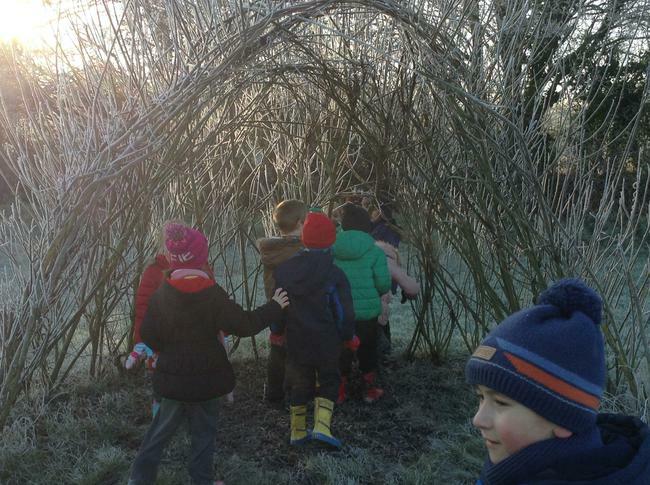 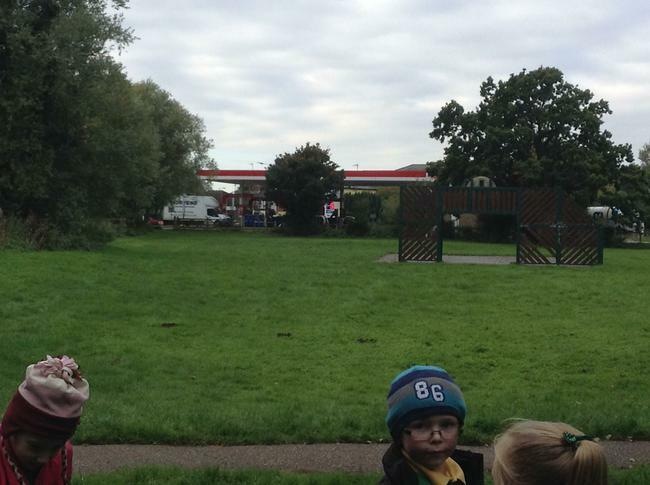 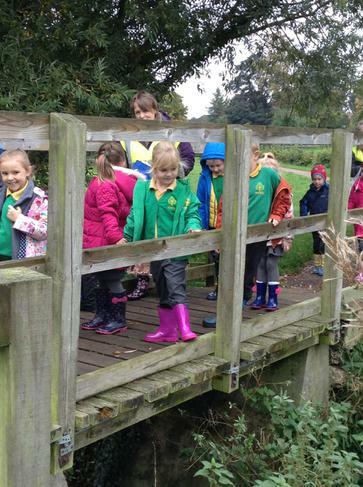 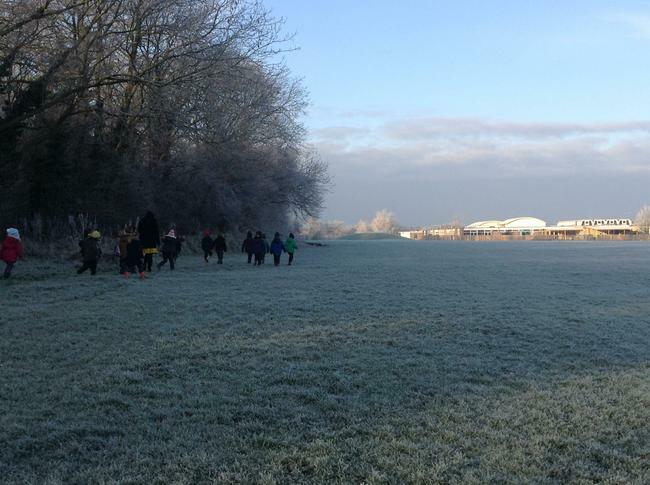 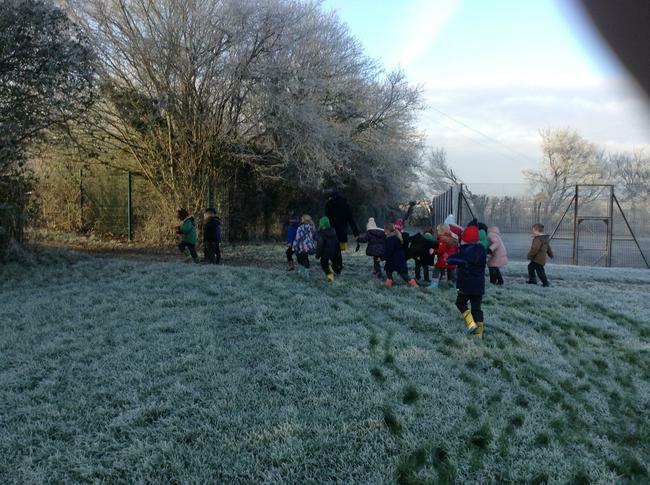 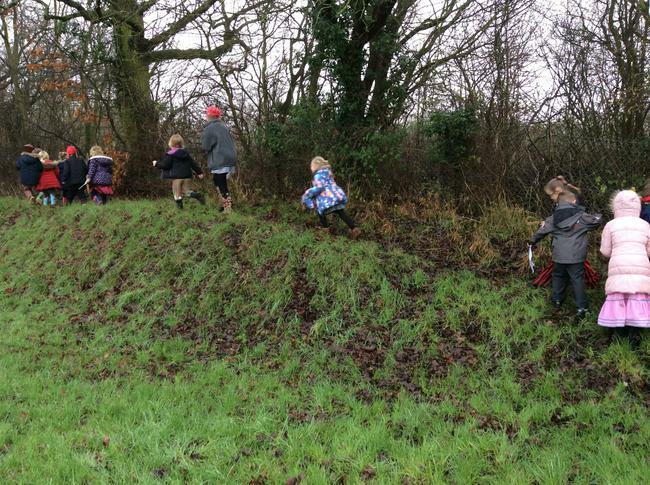 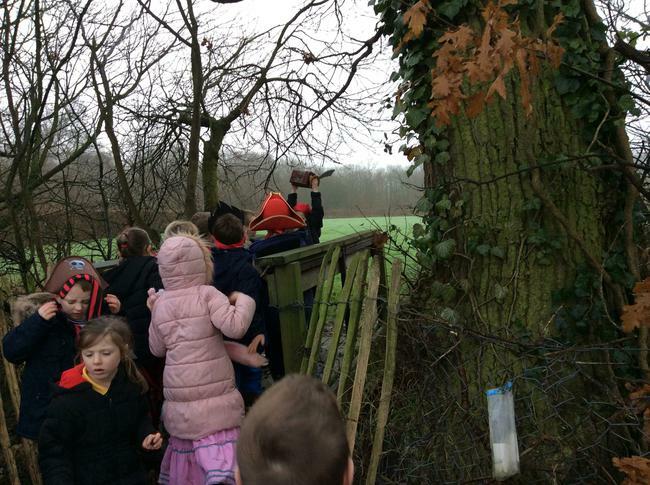 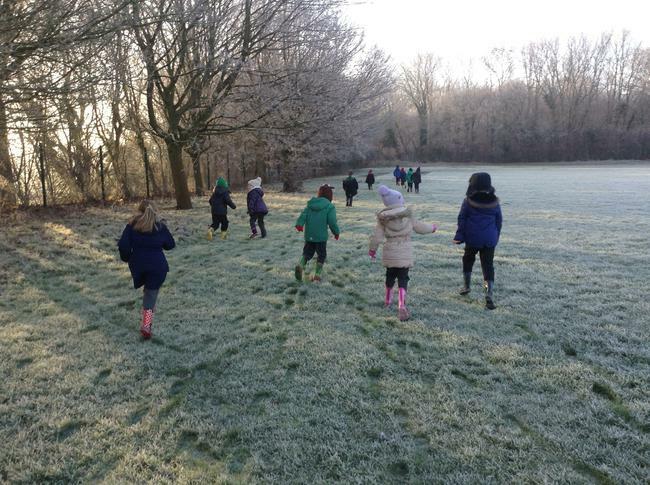 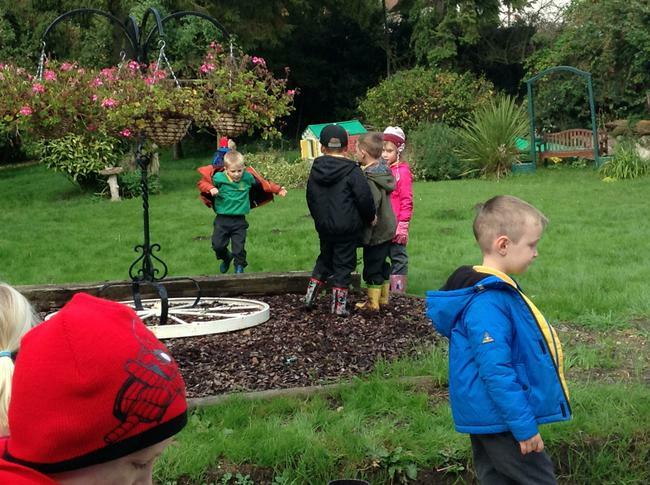 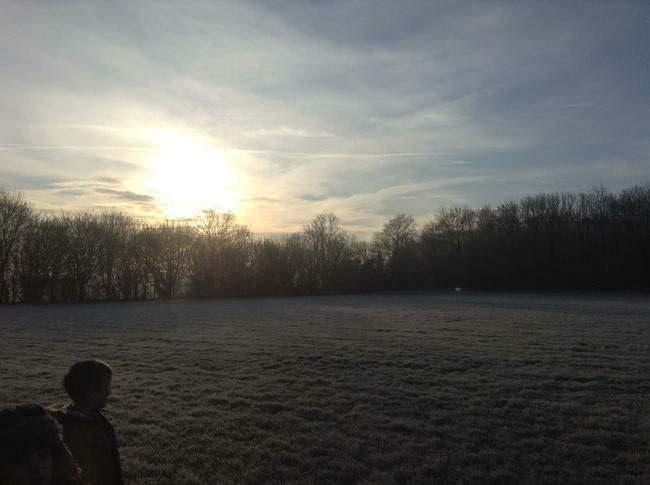 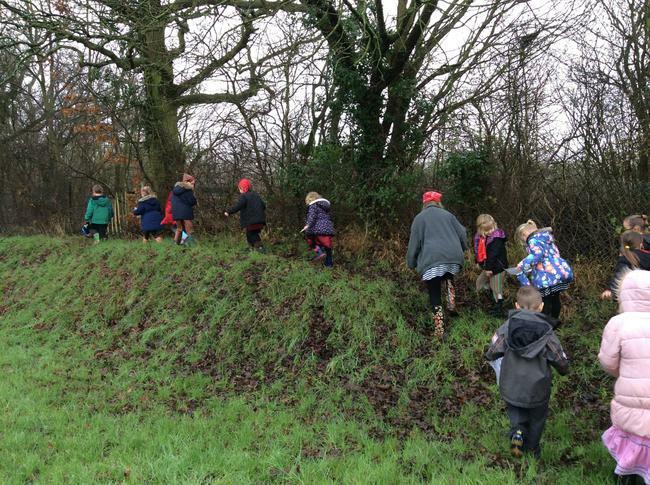 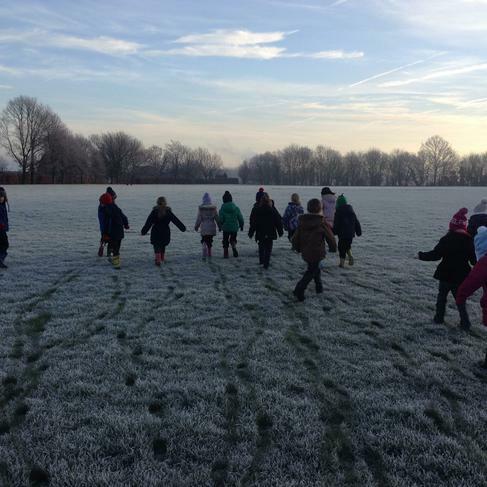 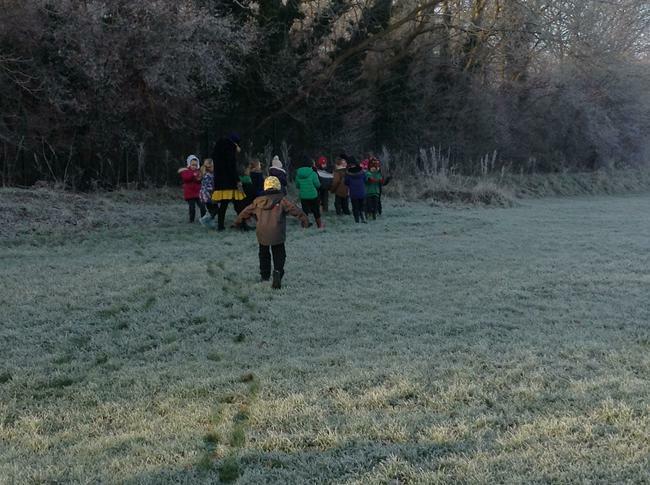 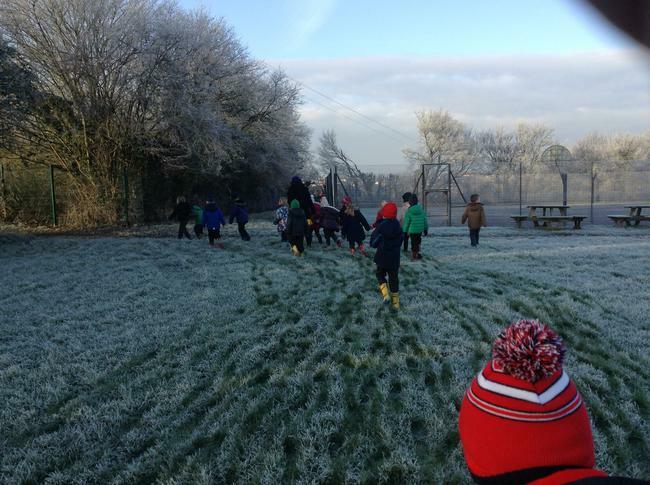 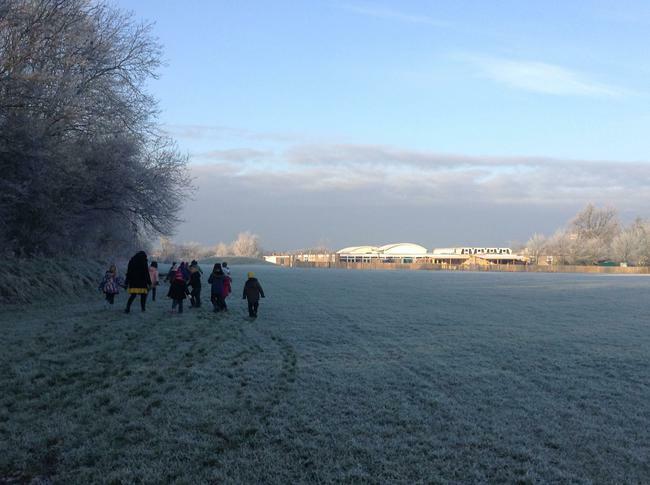 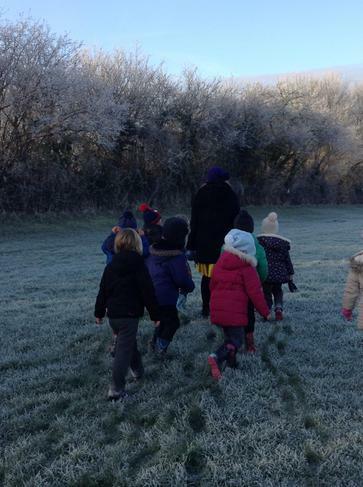 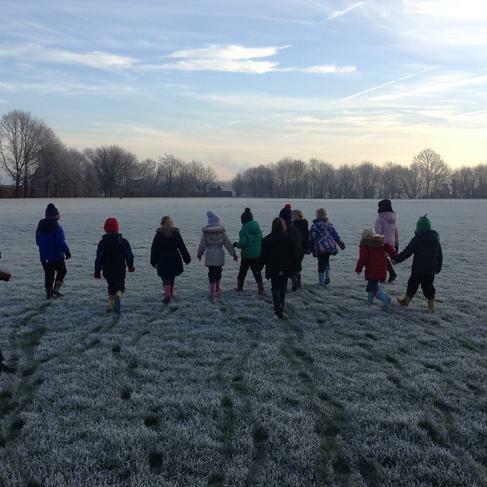 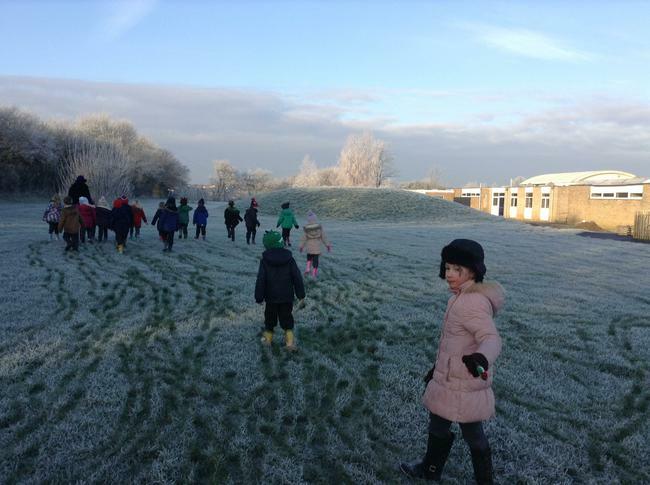 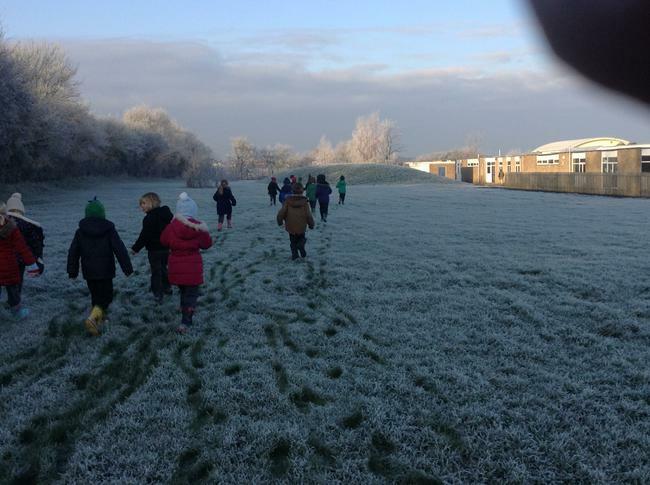 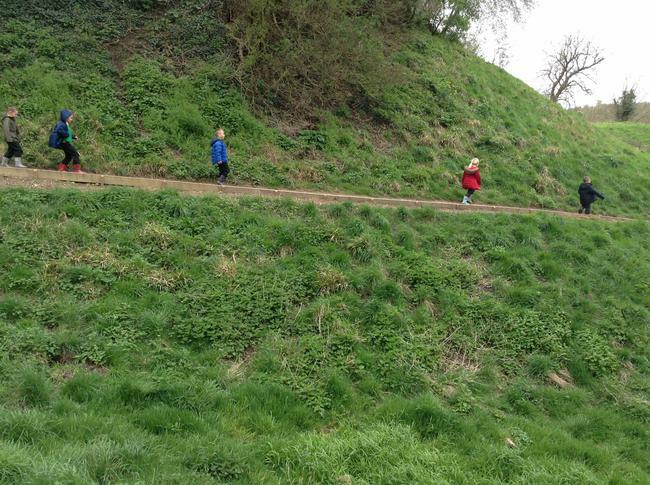 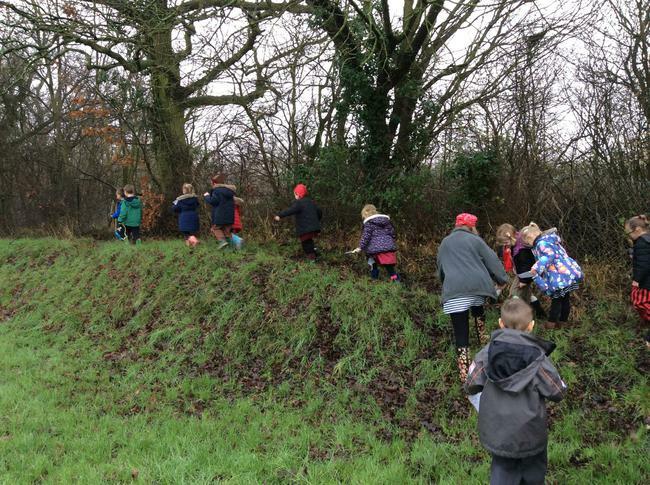 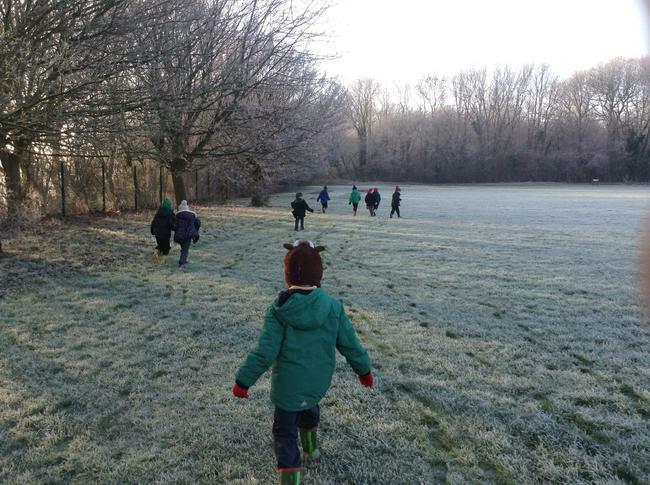 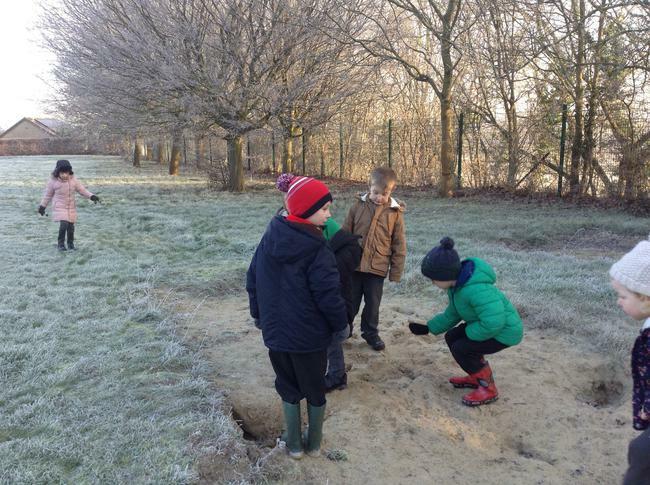 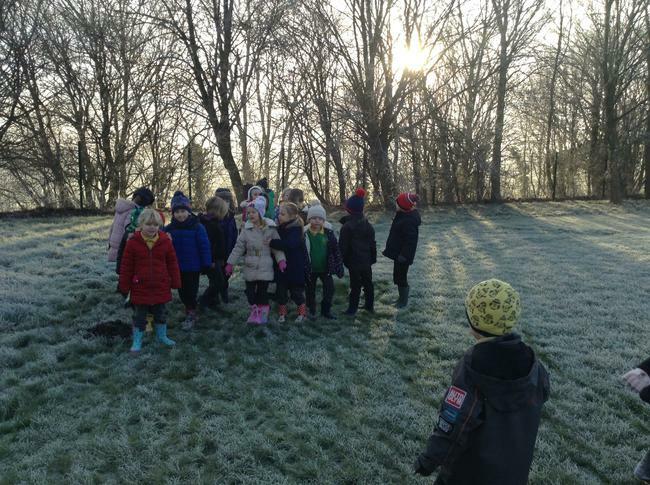 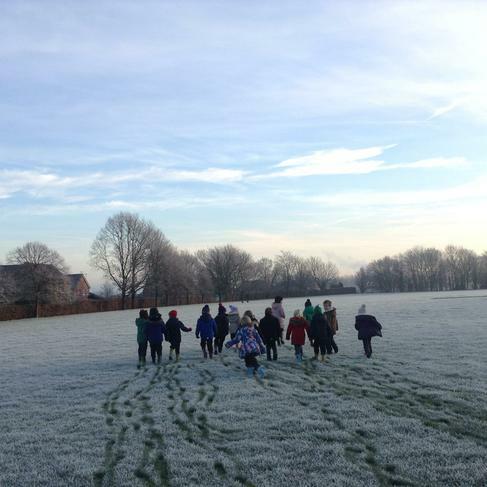 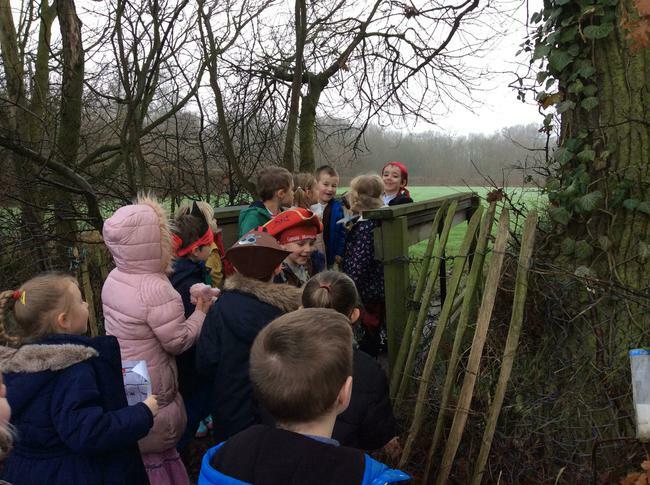 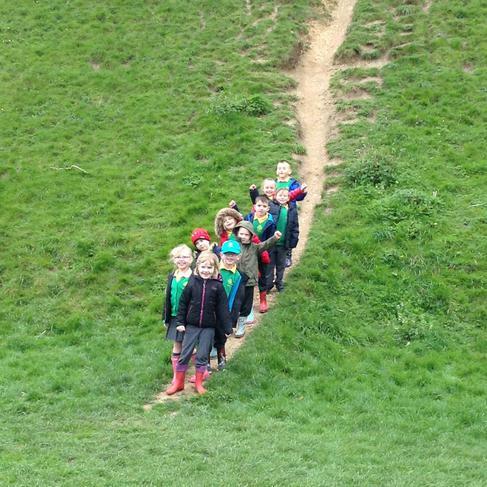 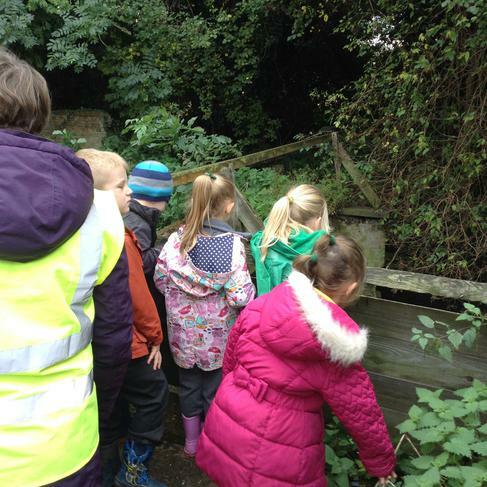 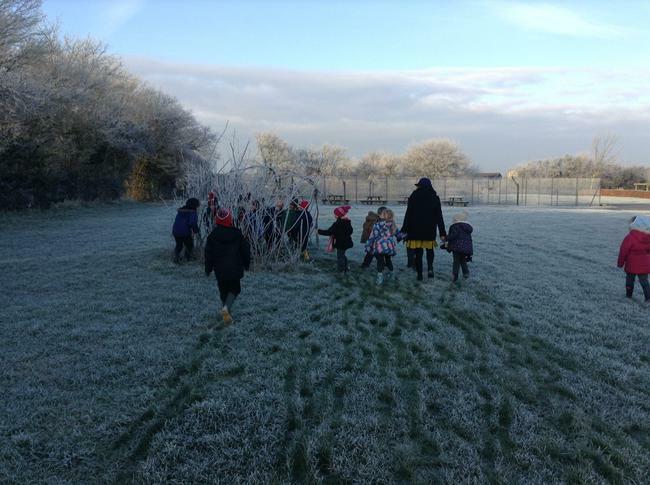 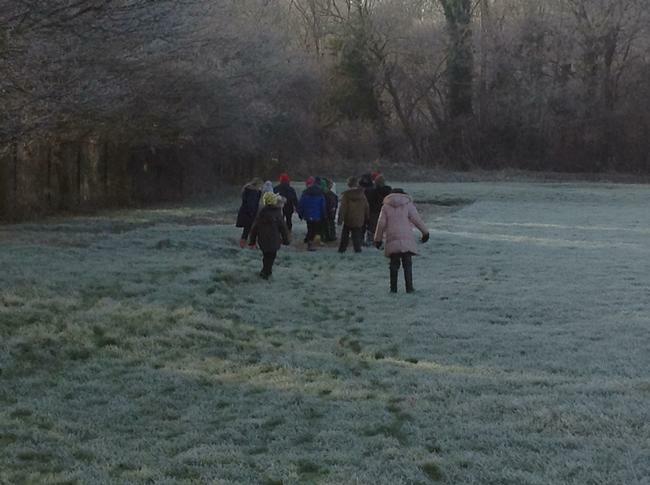 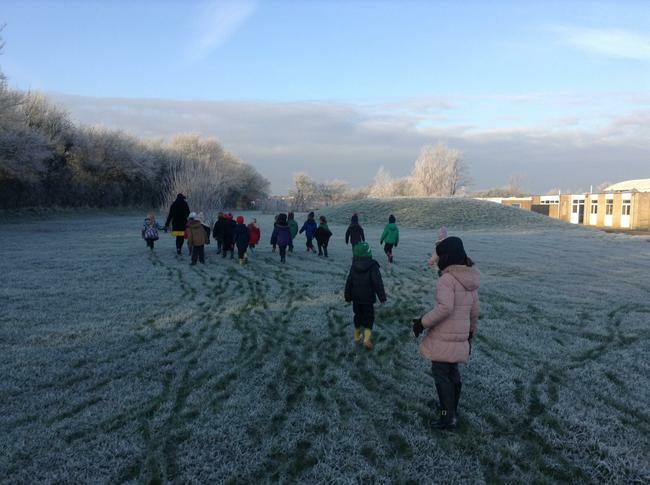 The children had tremendous fun on our local walk. 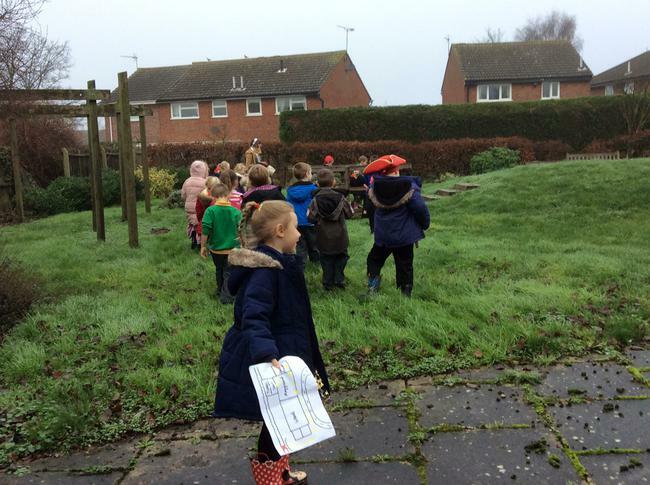 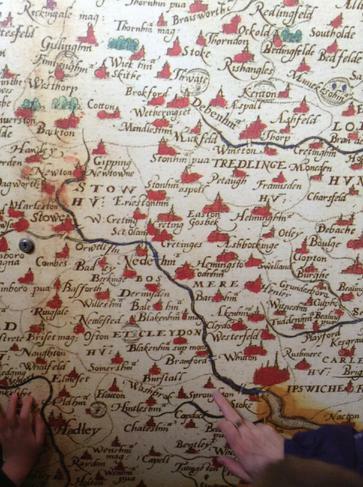 We looked at the features of our local area and identified these on maps. 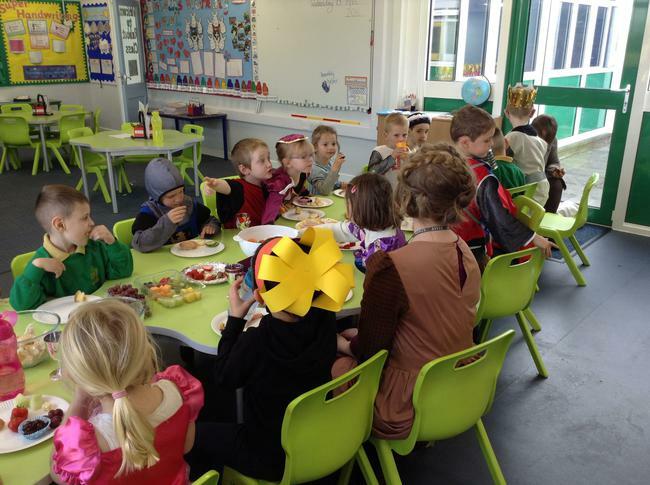 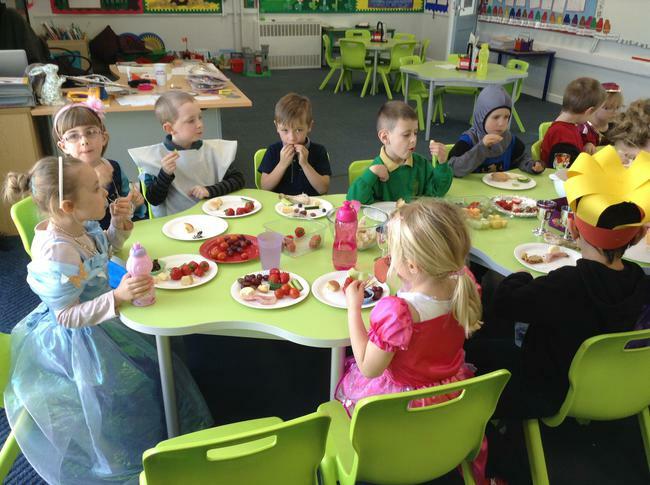 The children also picked fresh apples, washed them and ate them for their snack. 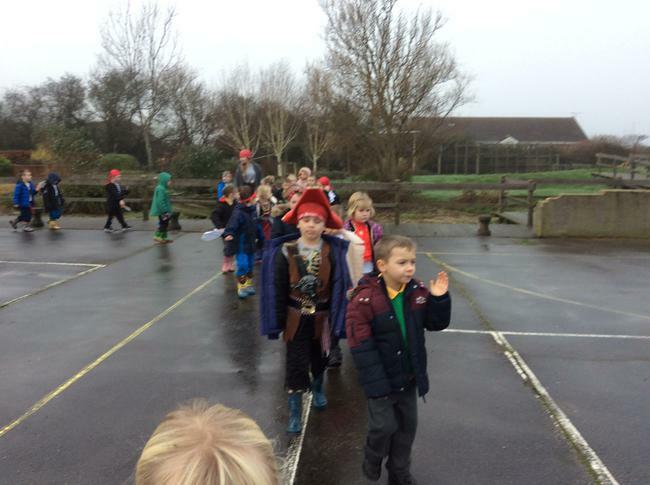 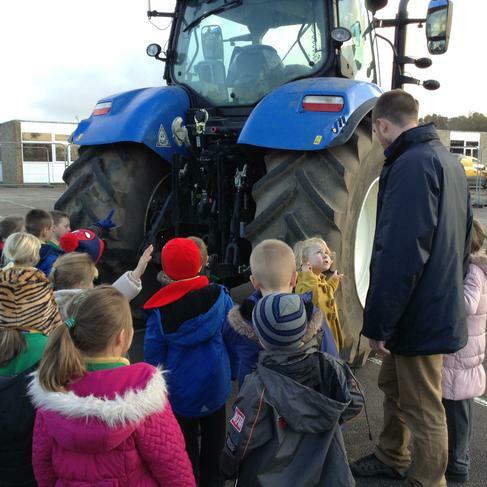 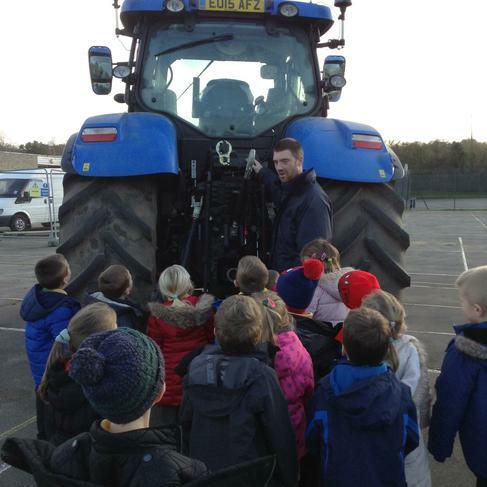 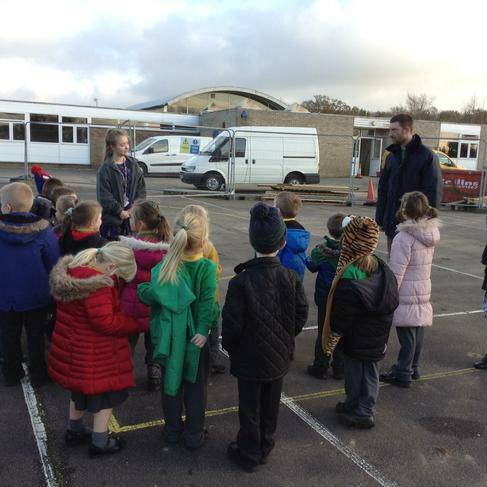 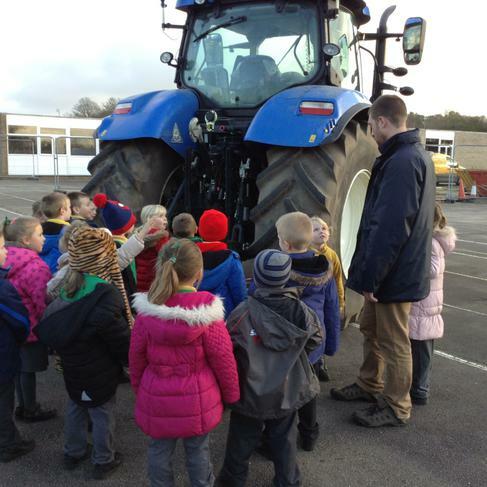 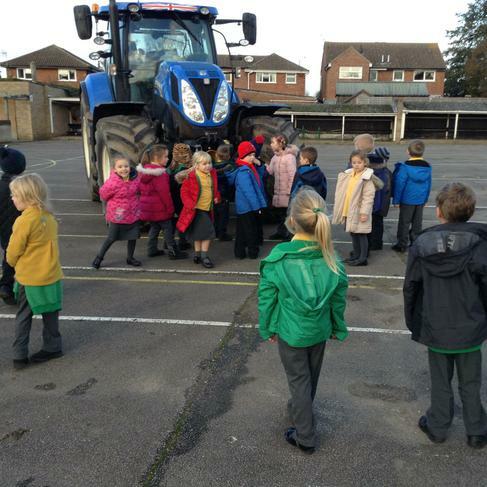 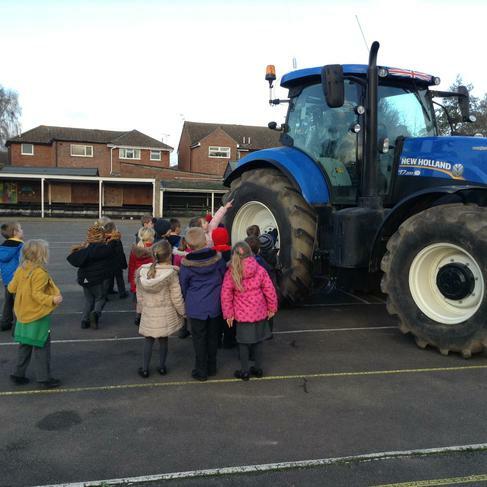 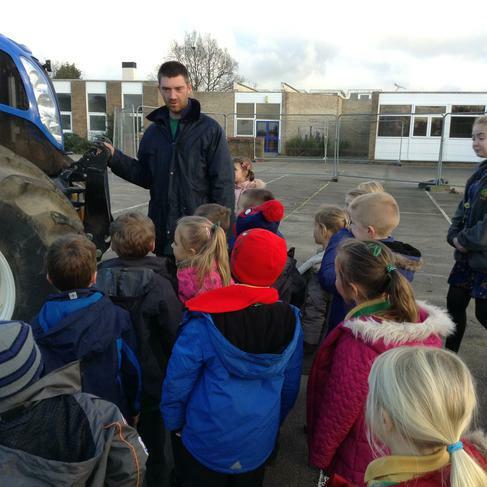 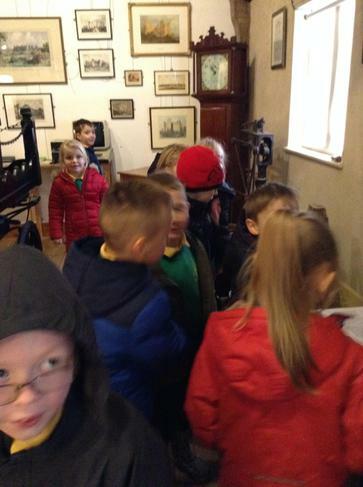 Luckily the weather was very kind to us and we came back to school dry! 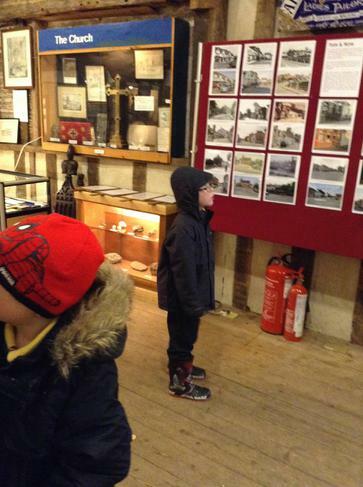 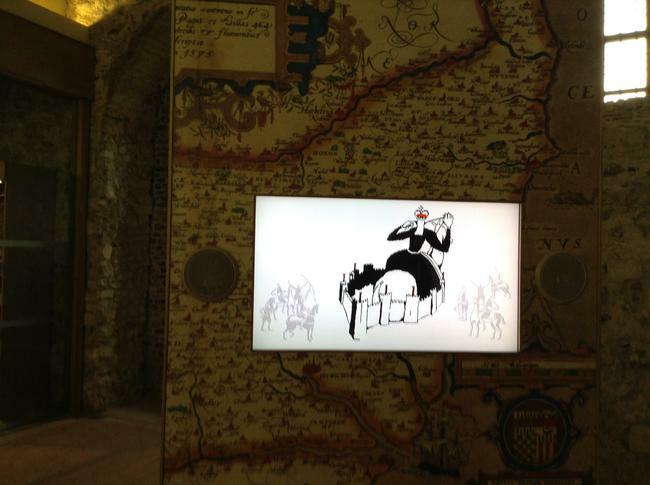 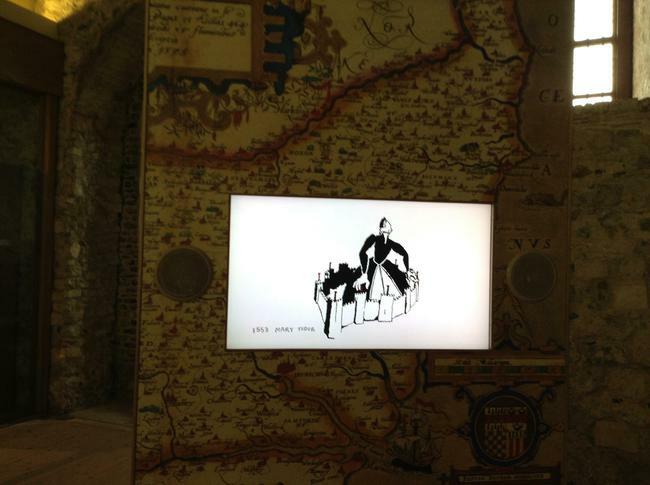 Please take a look at all the photographs. 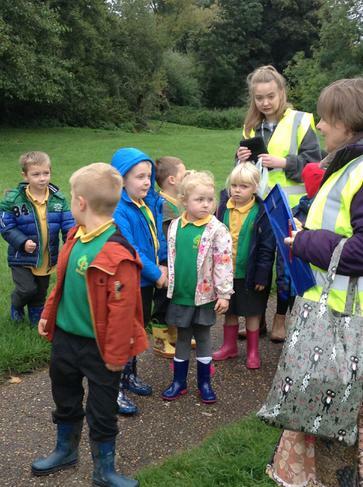 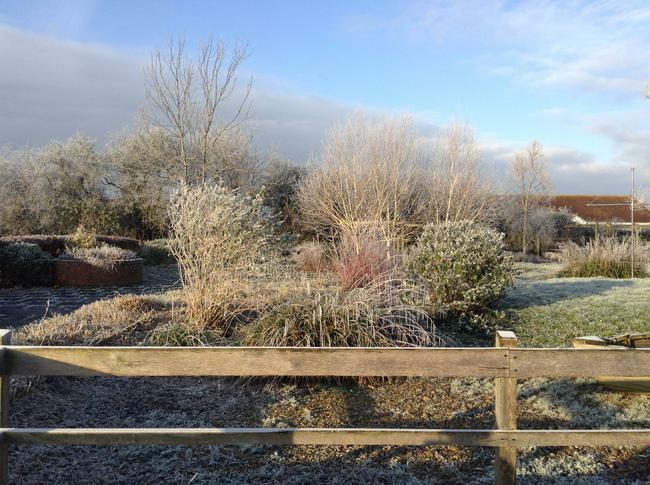 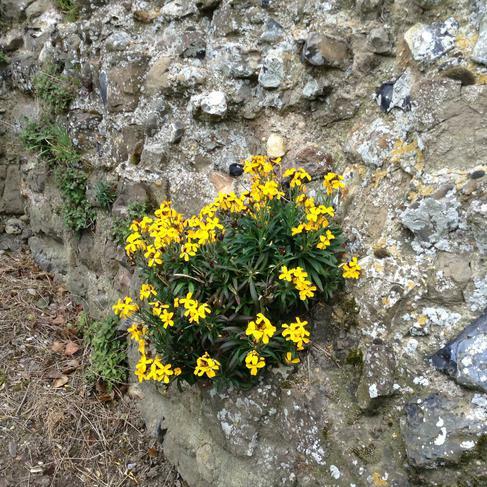 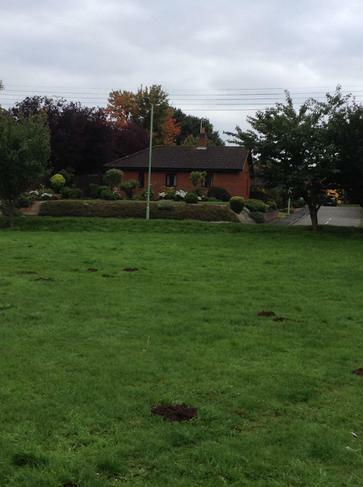 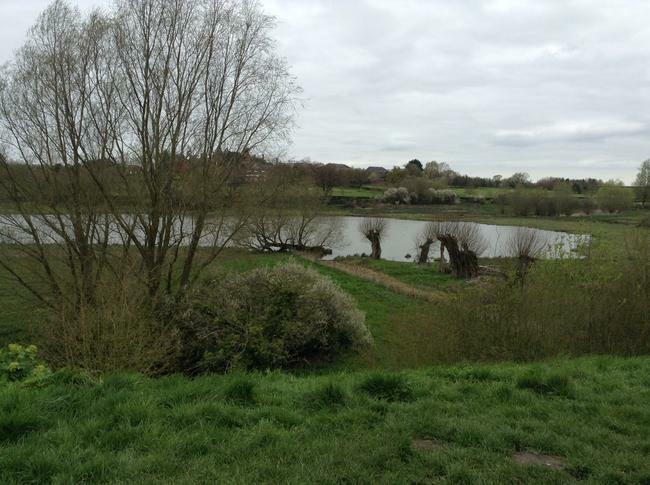 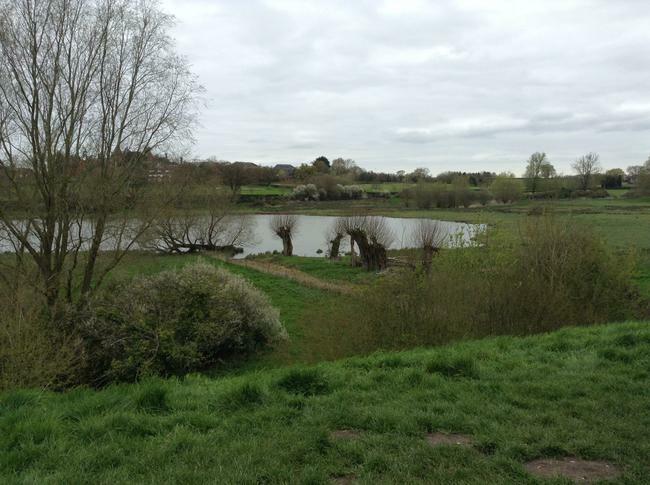 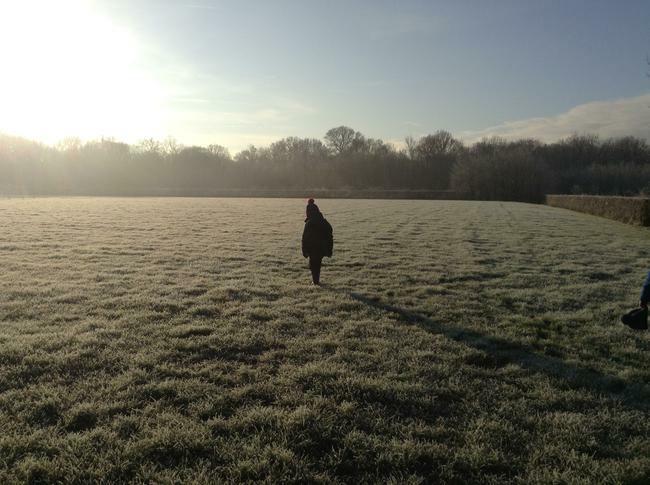 On Thursday 15th October 2015 Rabbit Class will be going on a local walk. 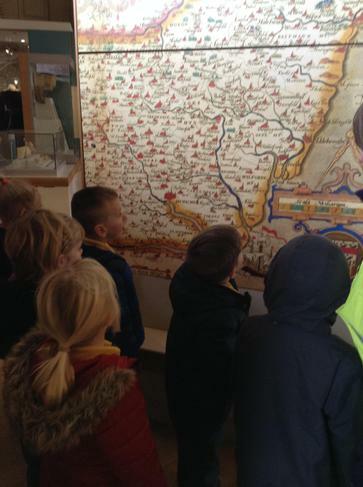 We will be looking at our local area and then comparing to other places in lessons after. 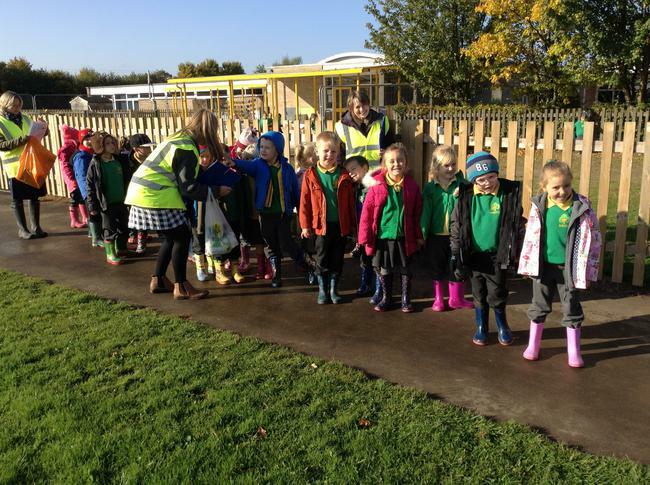 Please make sure that your child has wellie boots and a coat in school for this day. 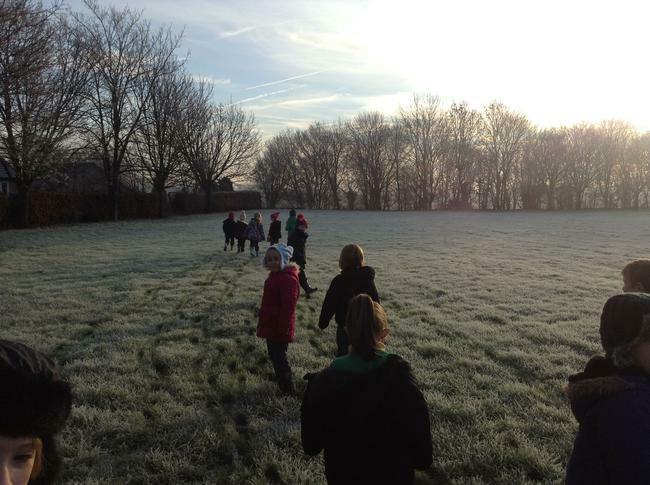 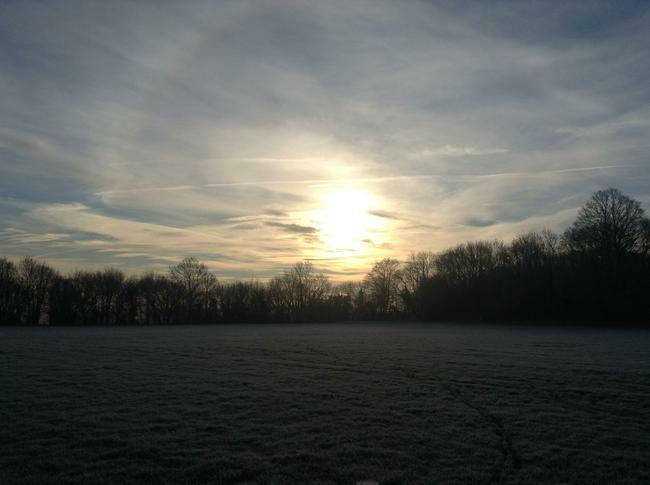 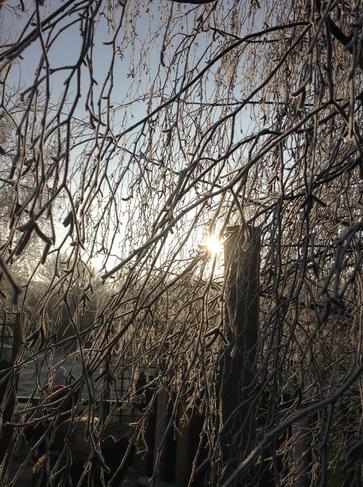 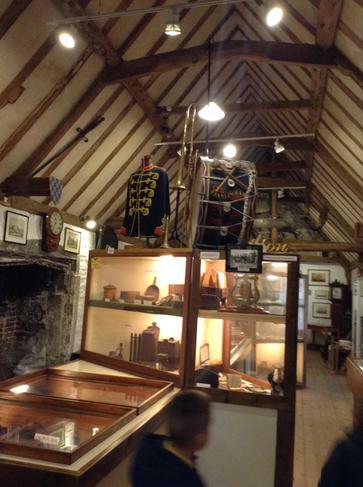 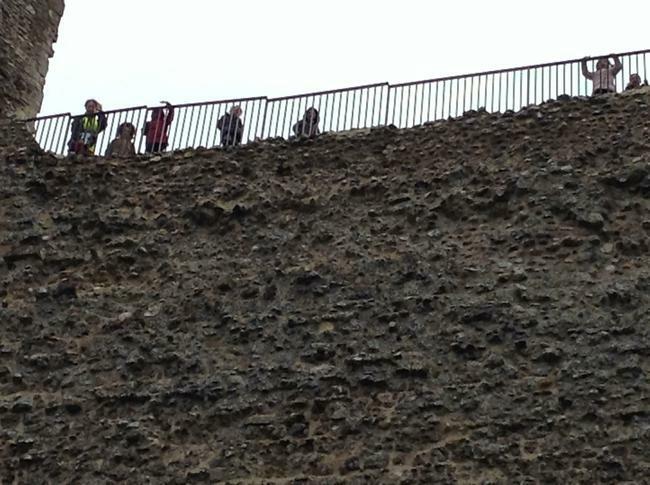 We look forward to telling you all about our walk and showing you the photographs. 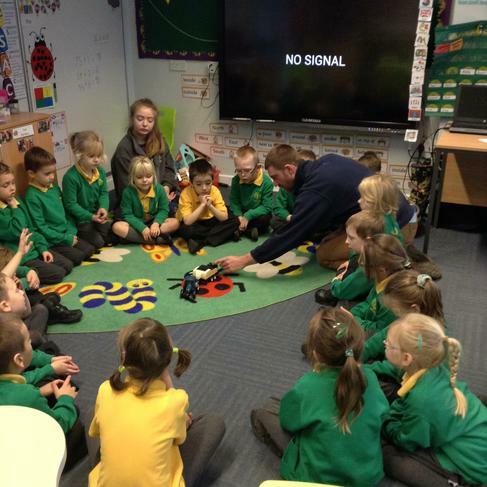 The Rabbits have been enjoying programming Bee Bots in ICT to follow a route. 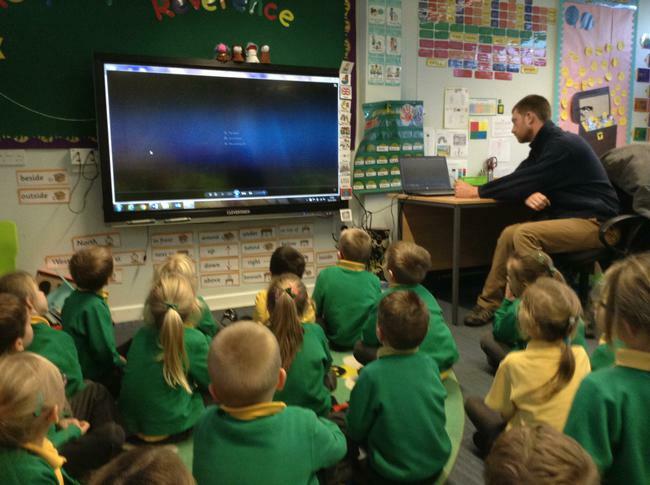 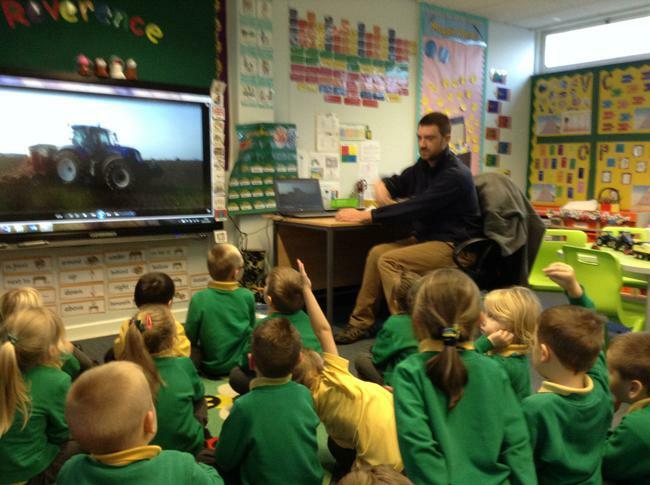 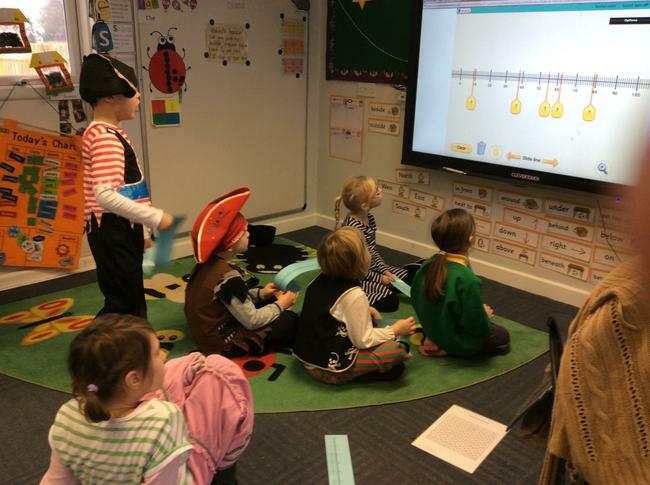 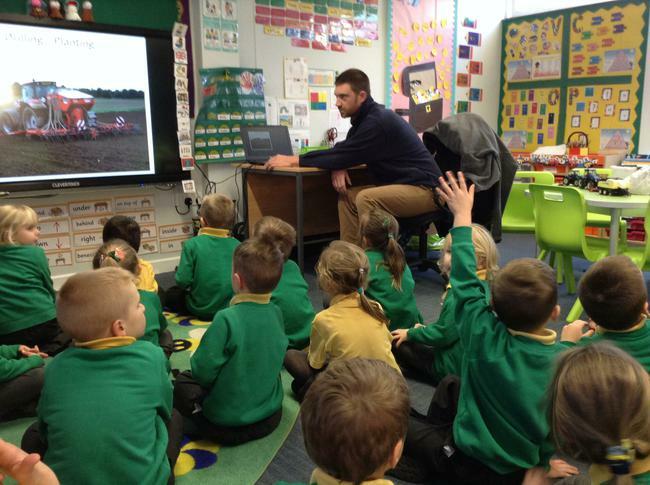 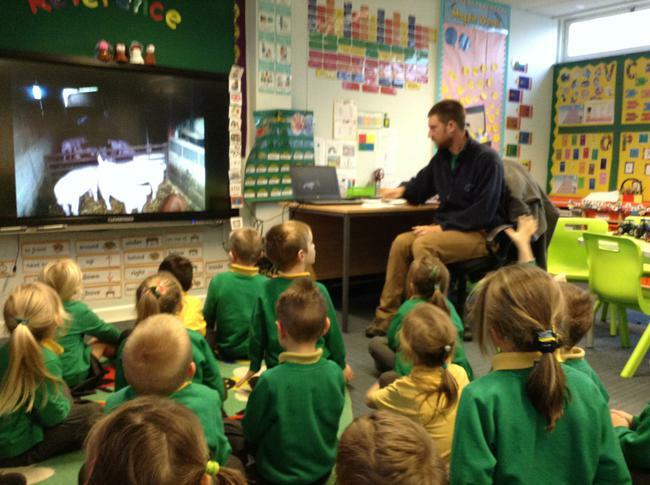 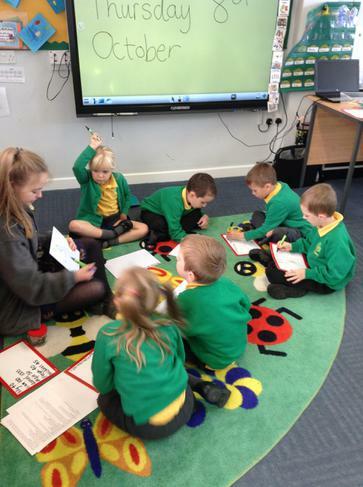 The children loved becoming programmers and have started to learn the terms input and output. 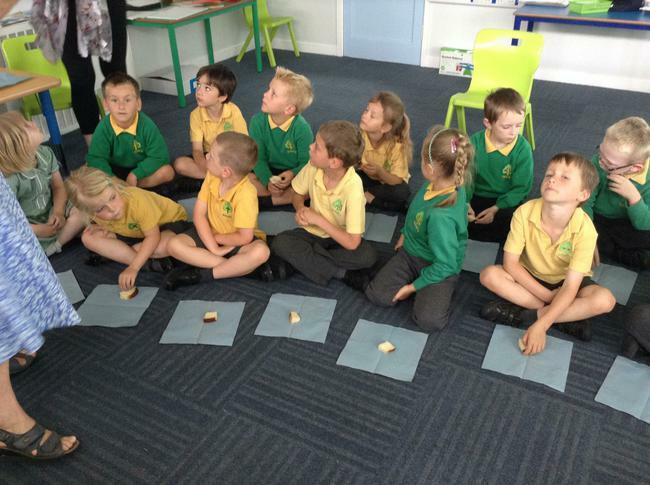 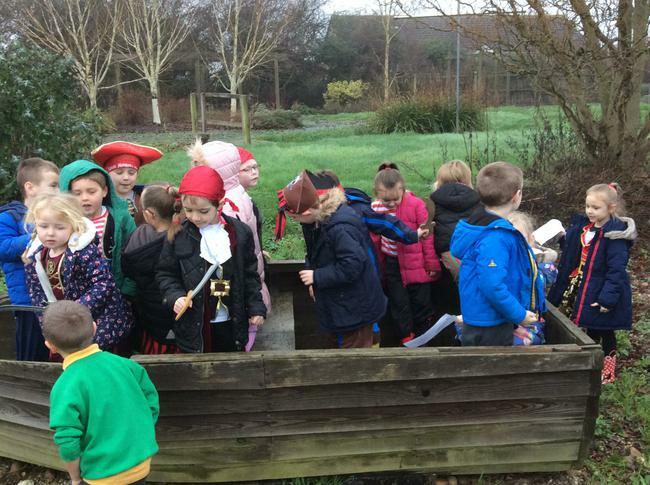 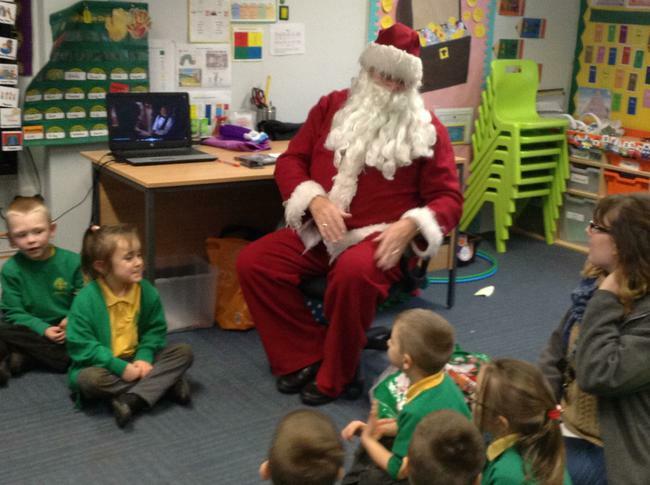 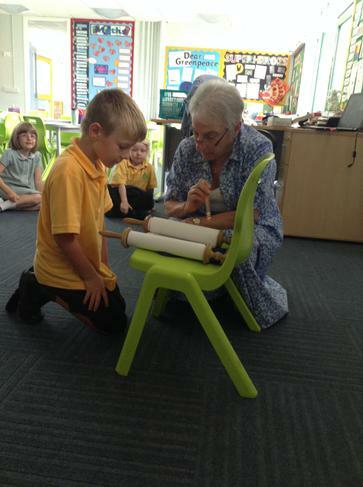 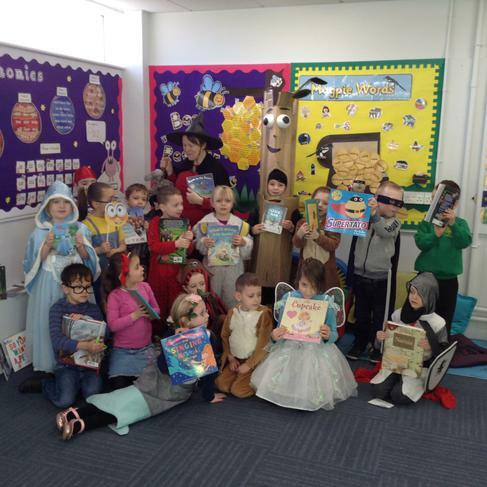 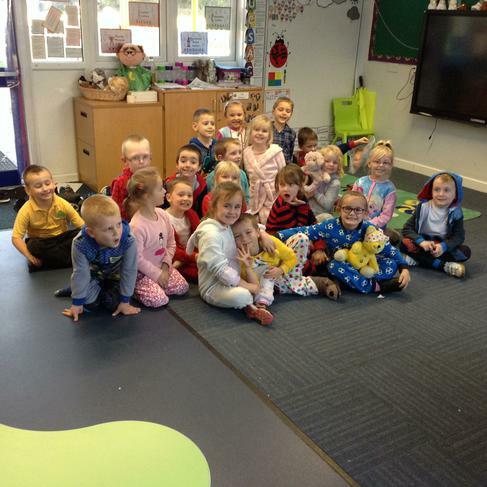 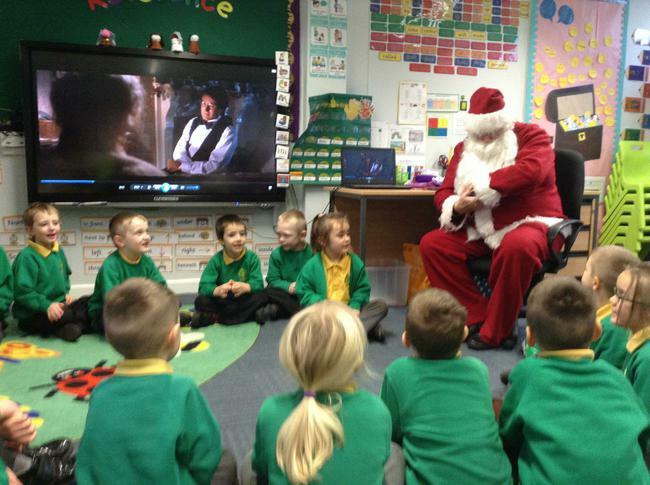 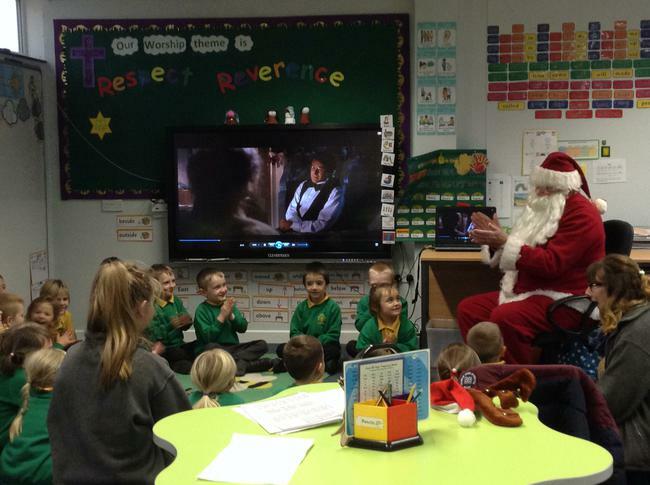 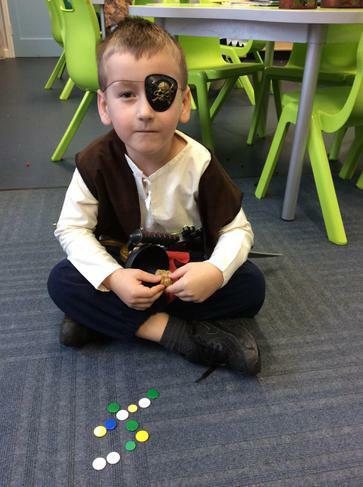 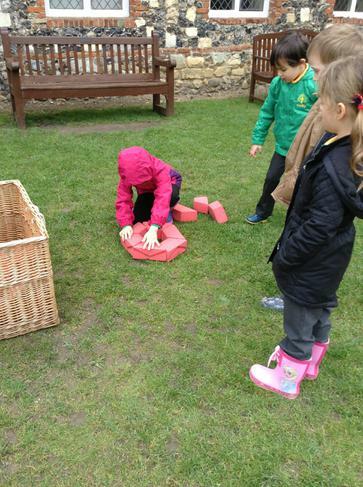 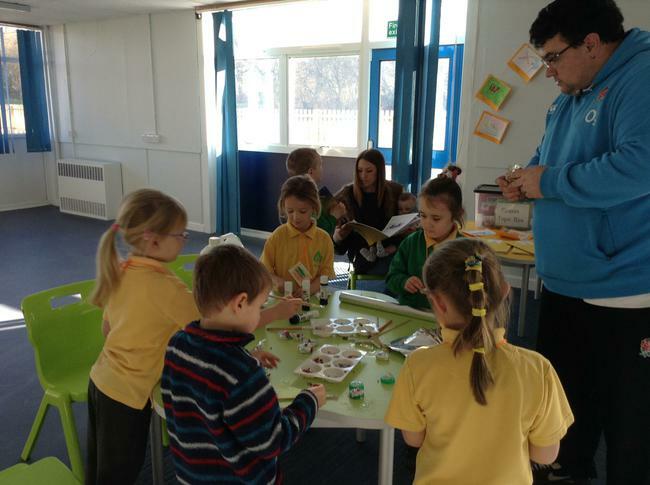 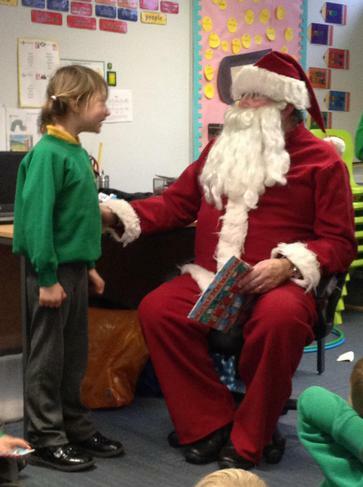 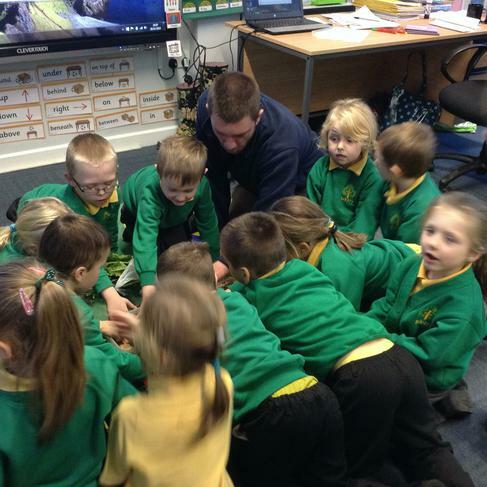 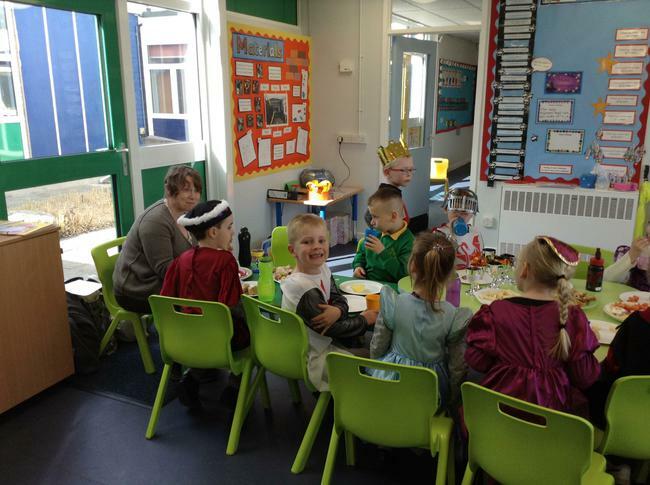 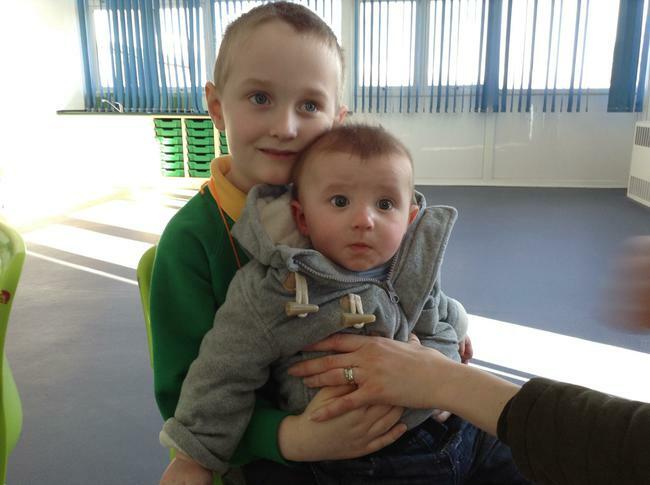 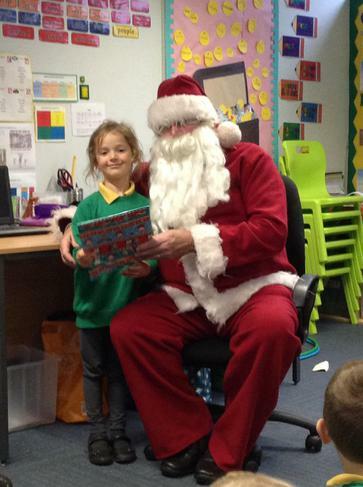 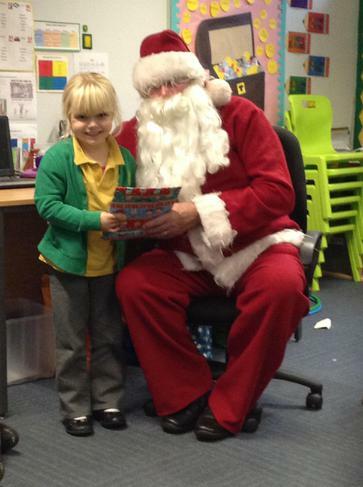 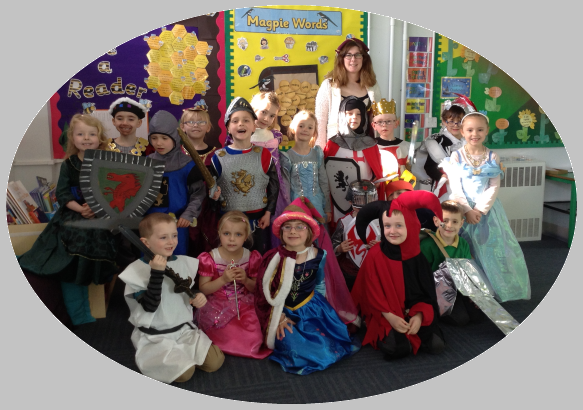 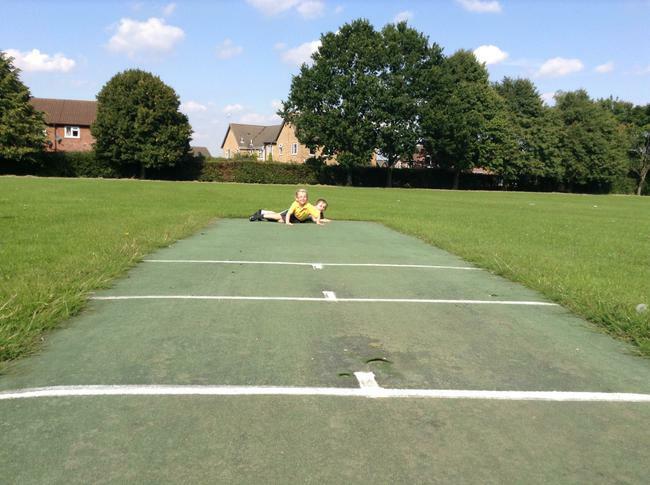 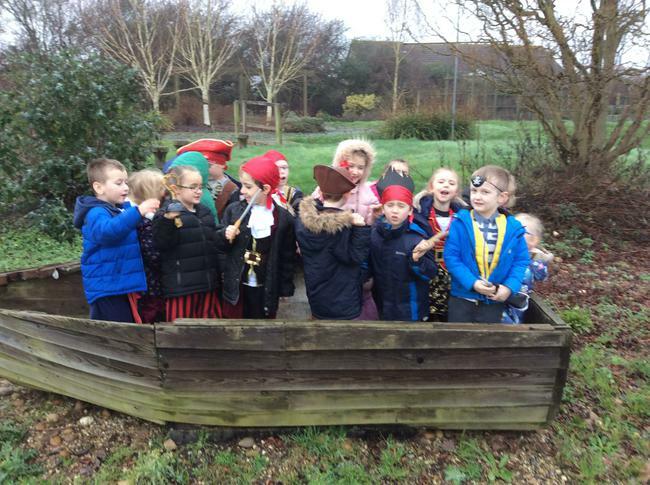 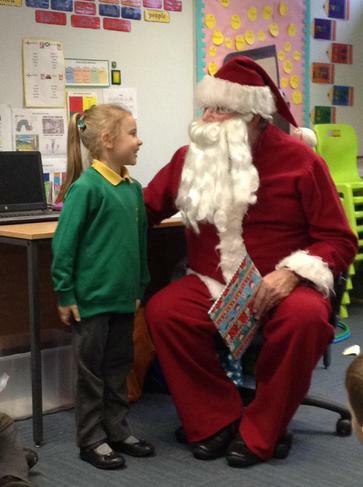 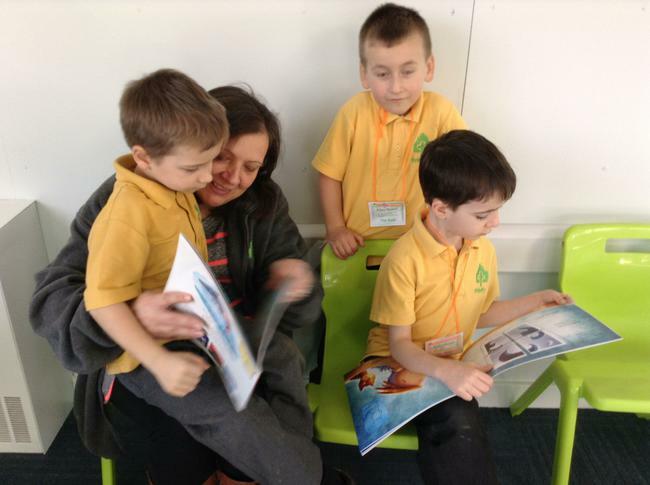 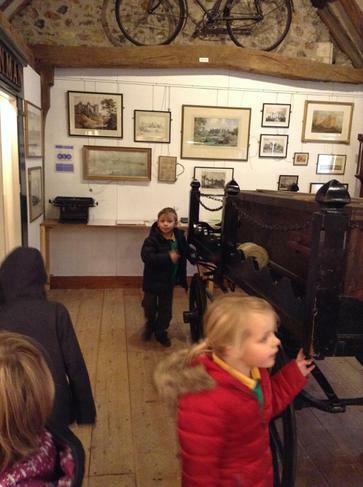 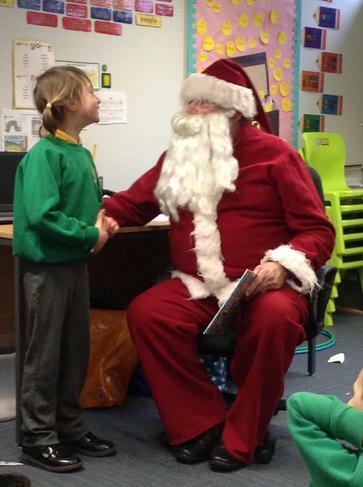 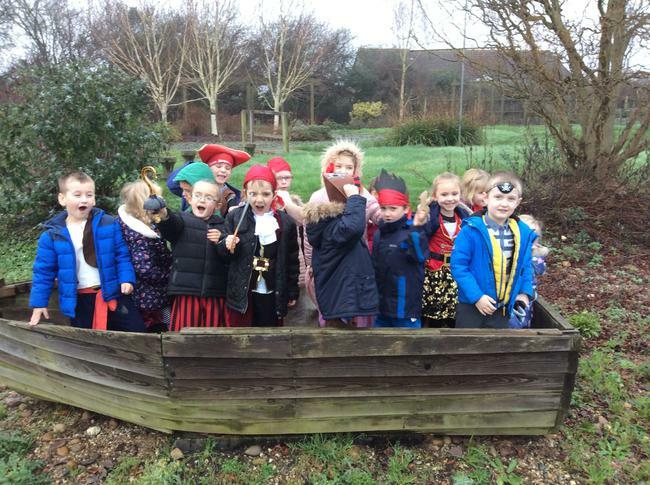 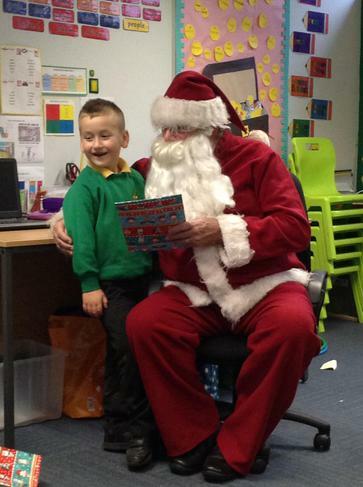 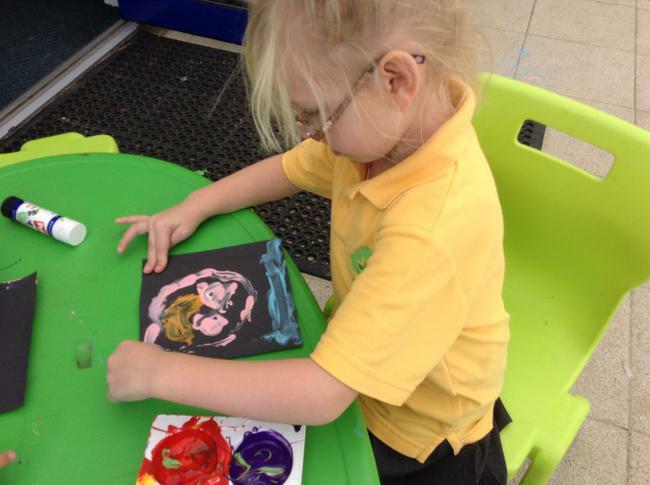 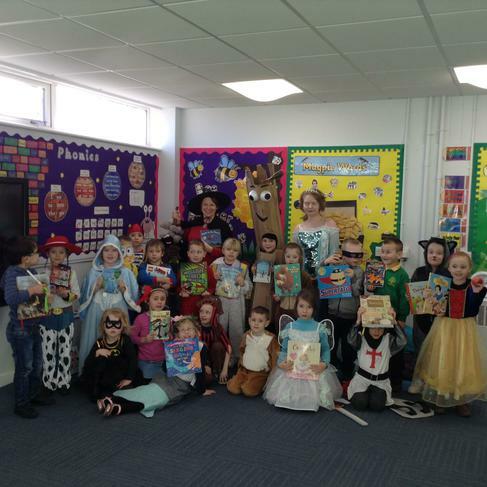 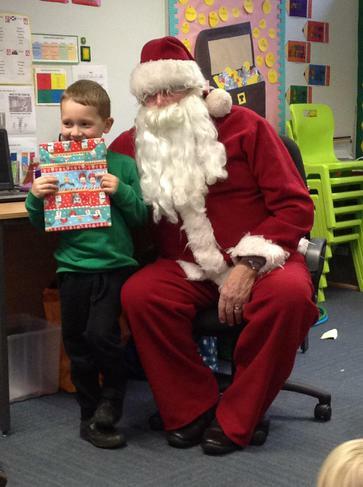 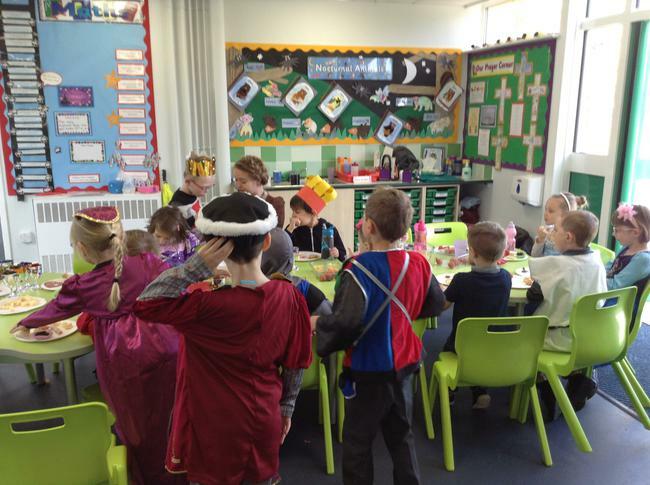 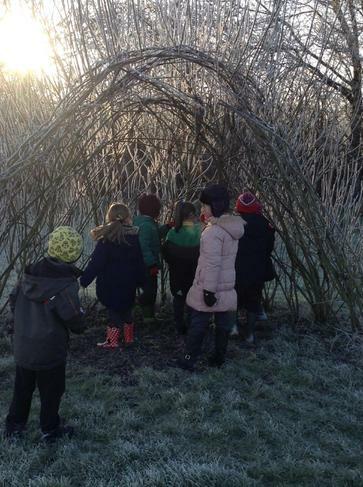 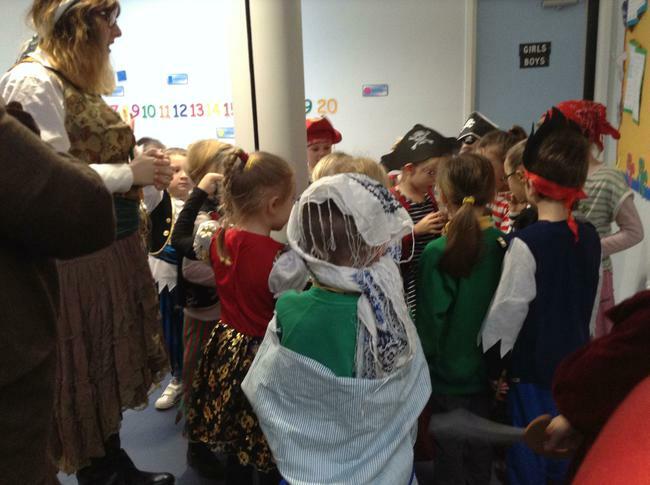 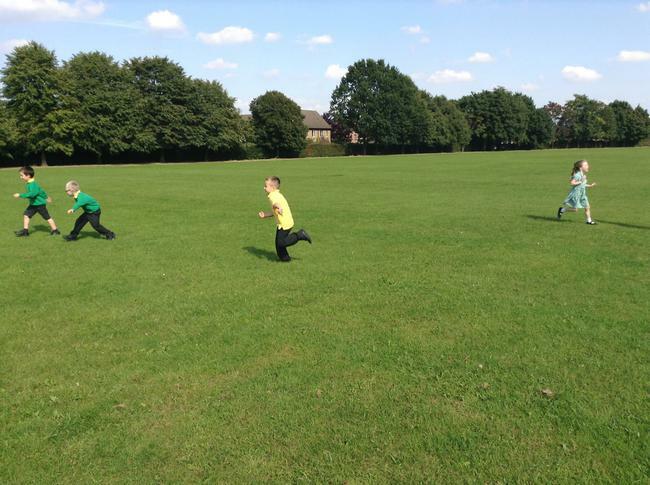 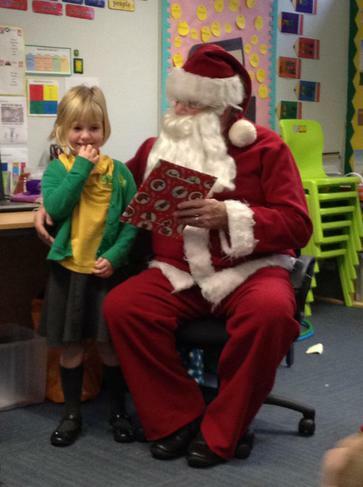 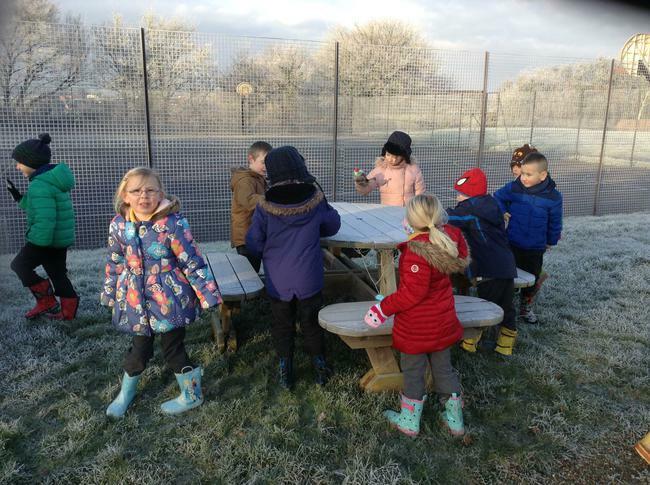 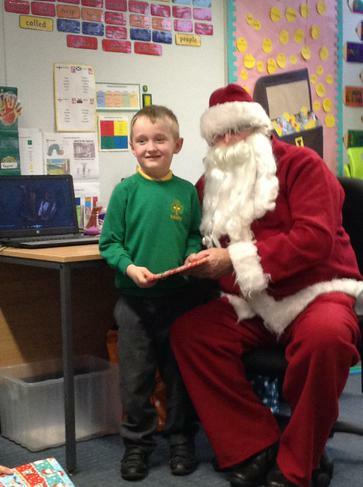 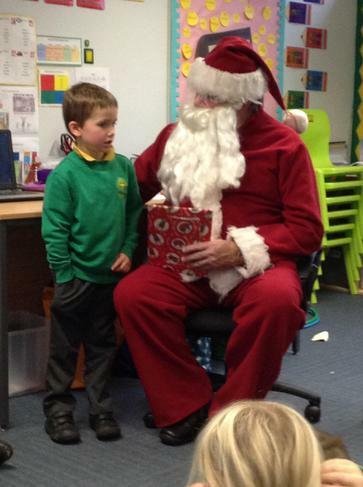 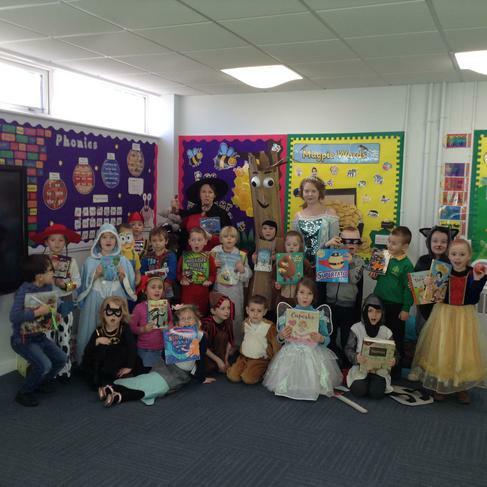 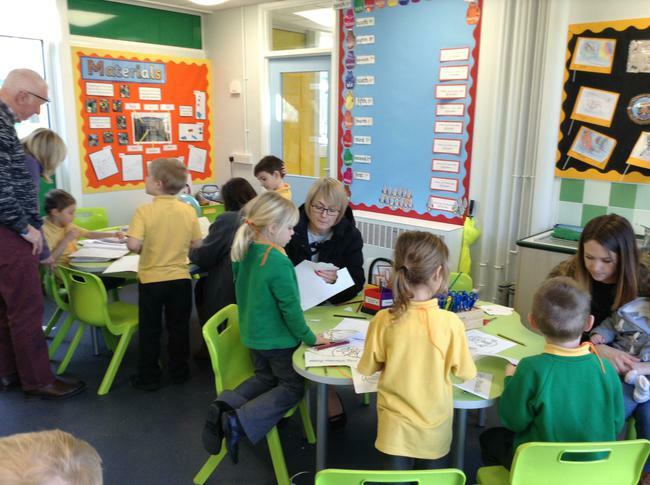 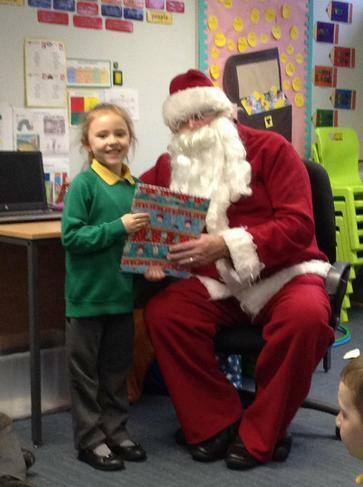 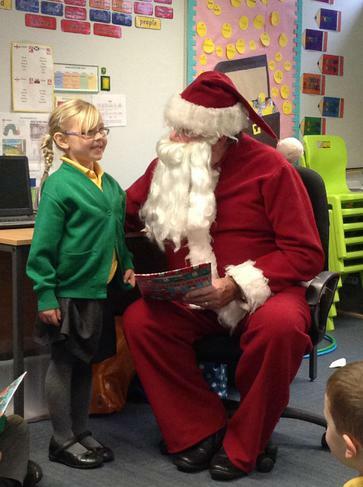 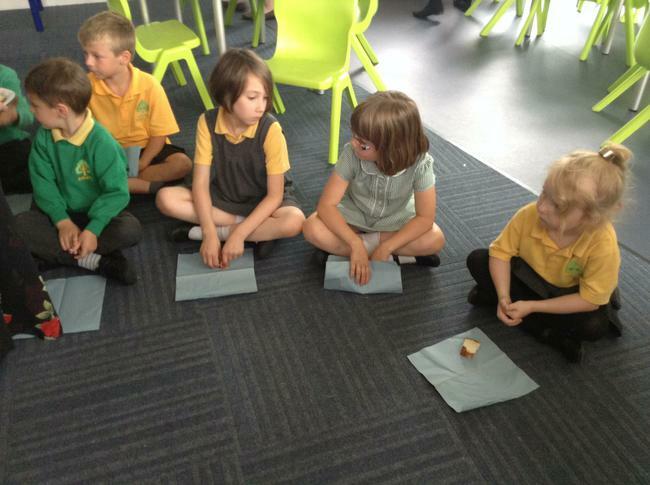 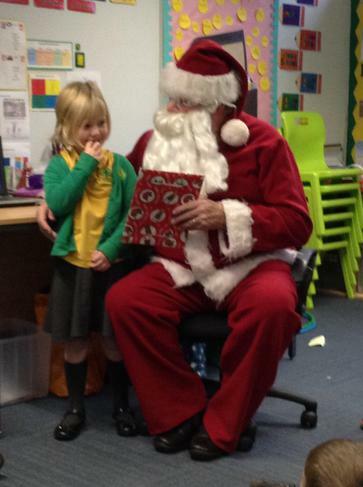 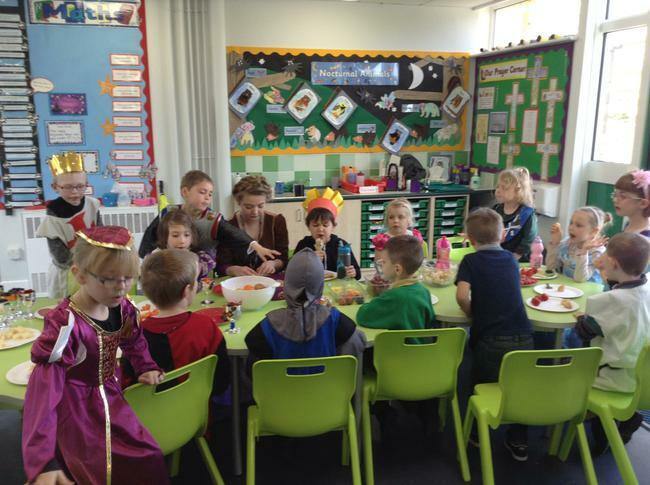 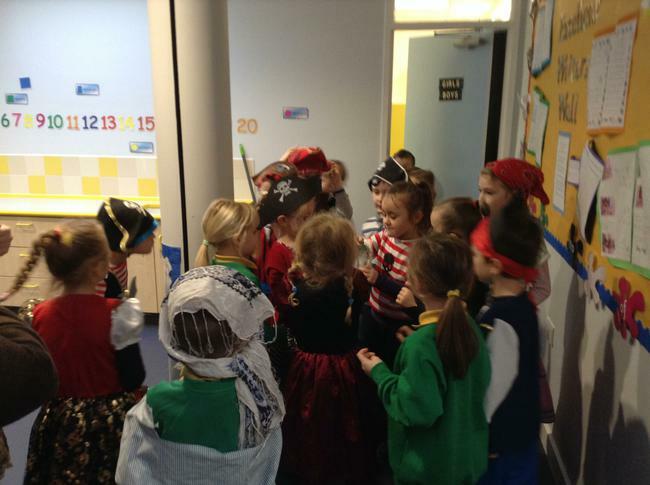 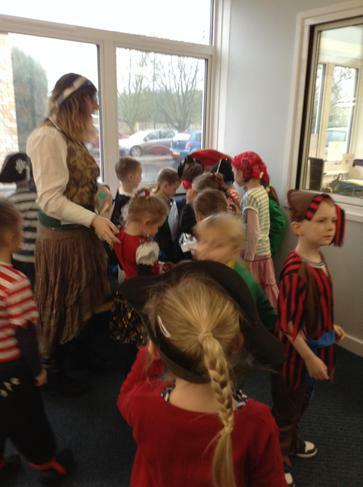 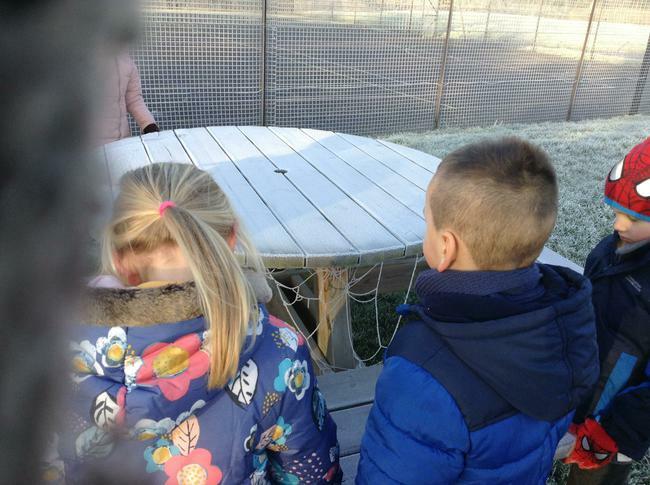 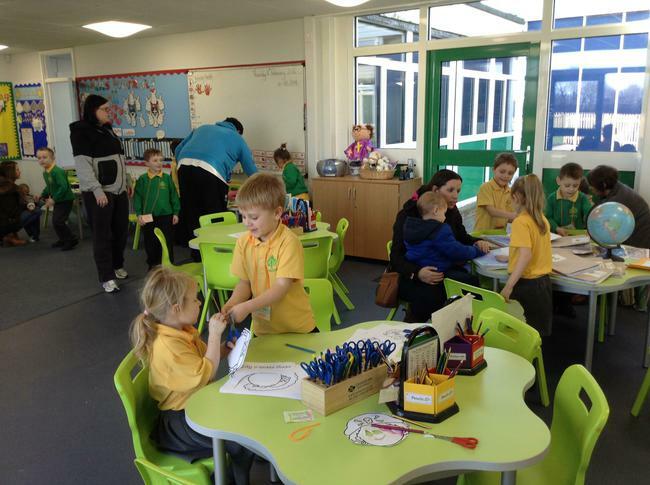 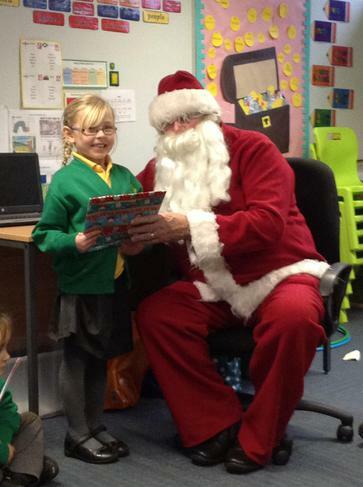 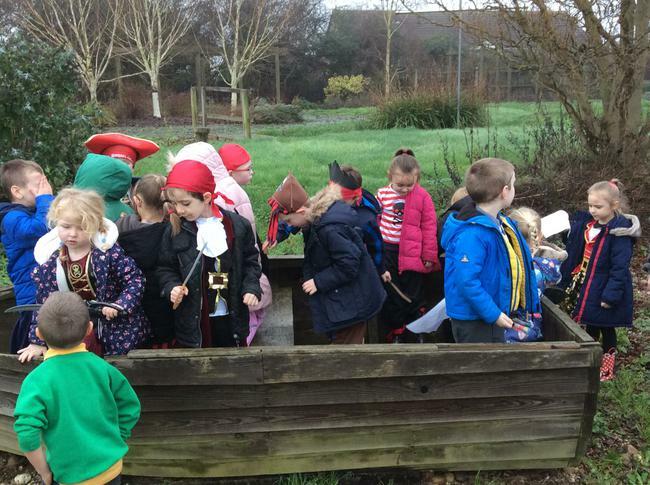 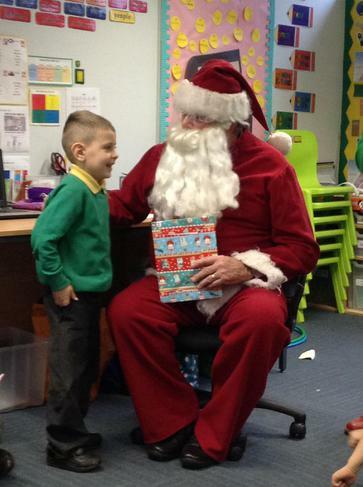 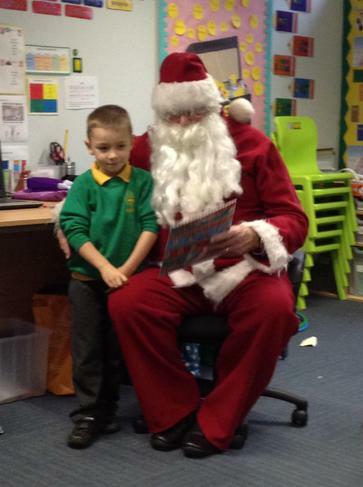 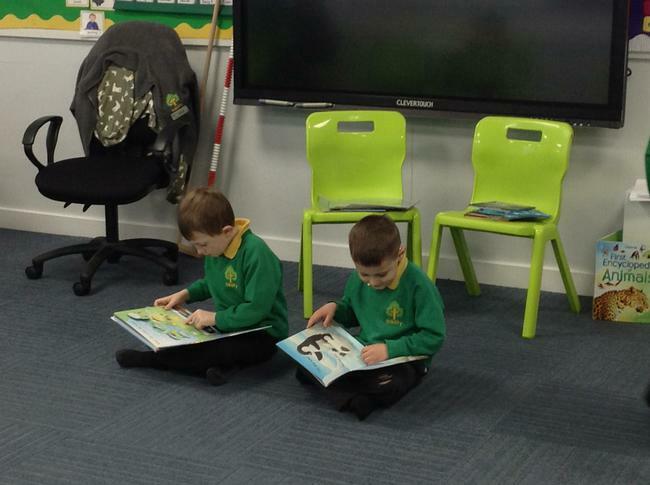 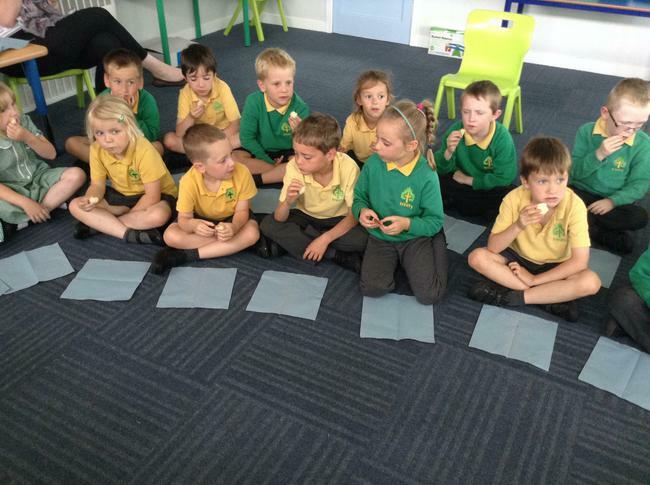 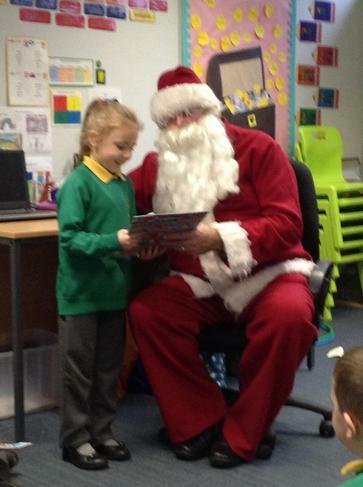 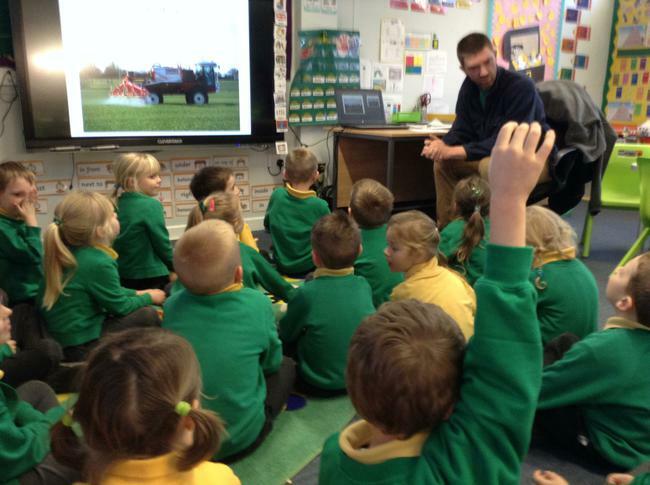 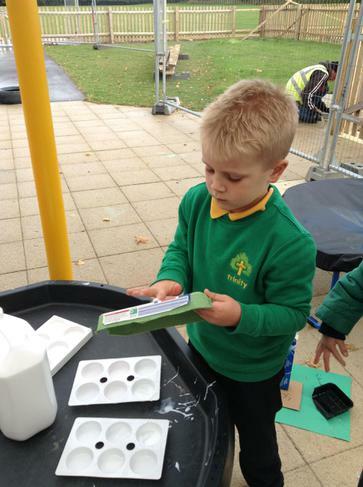 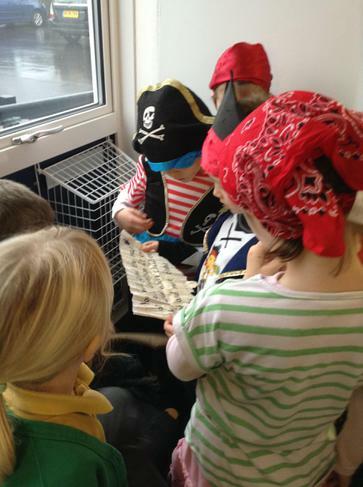 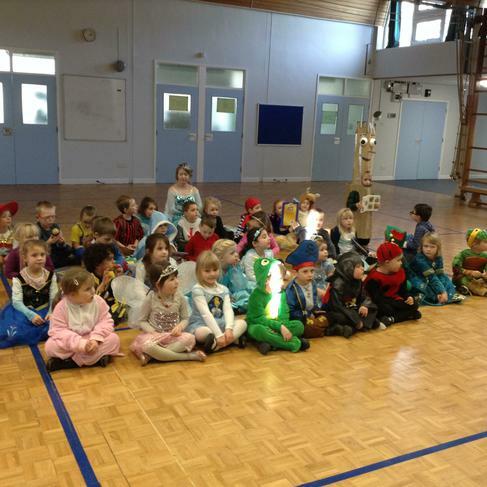 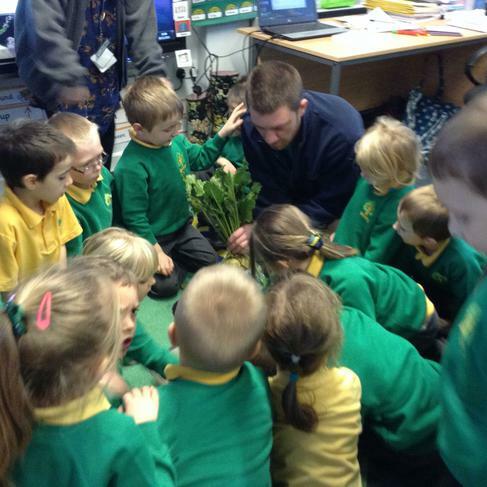 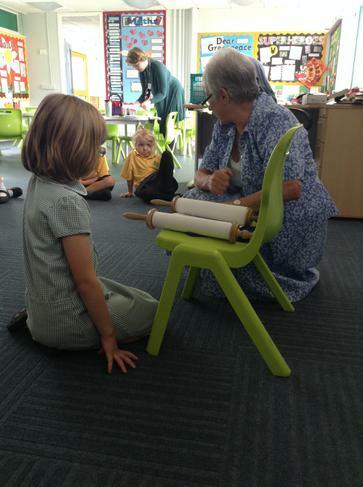 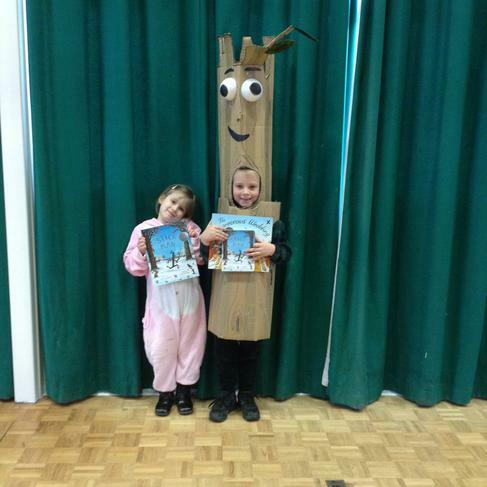 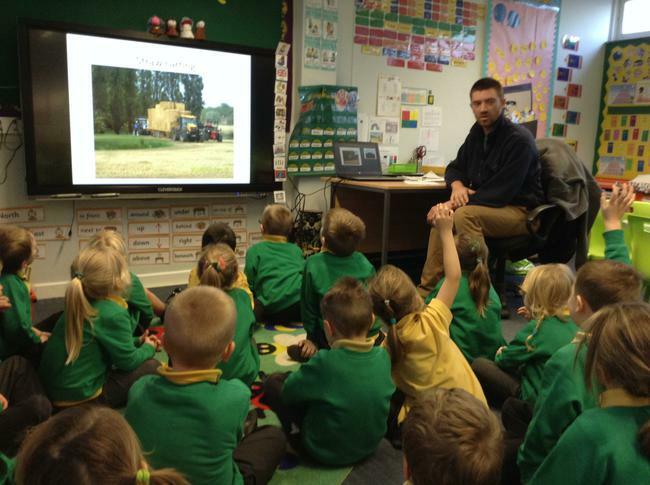 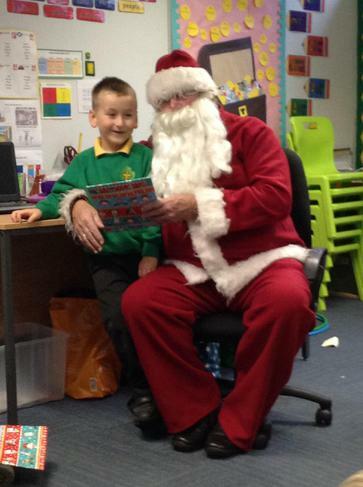 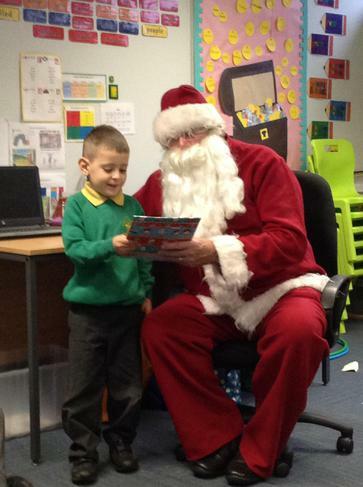 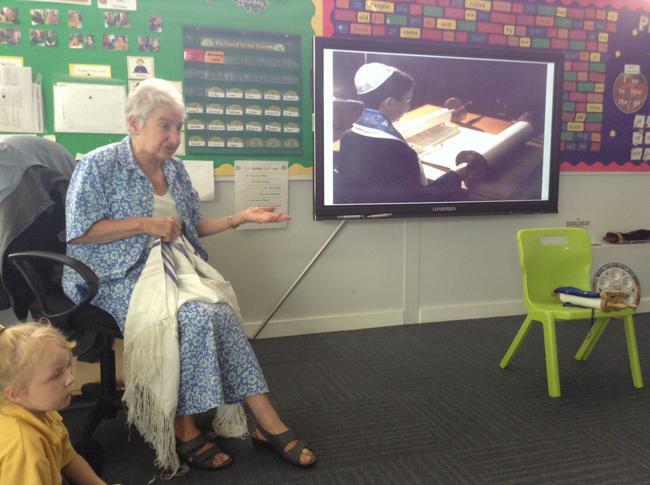 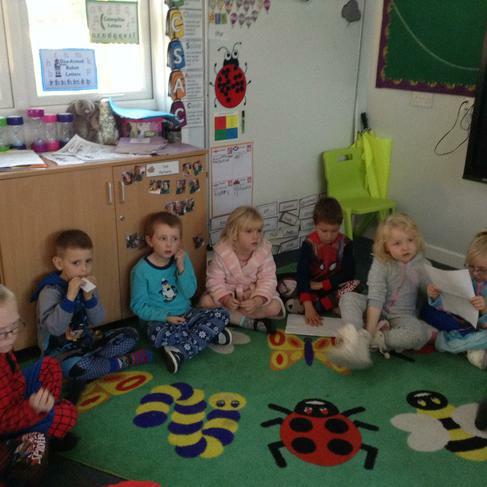 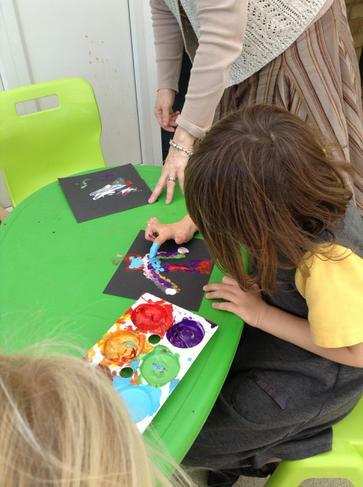 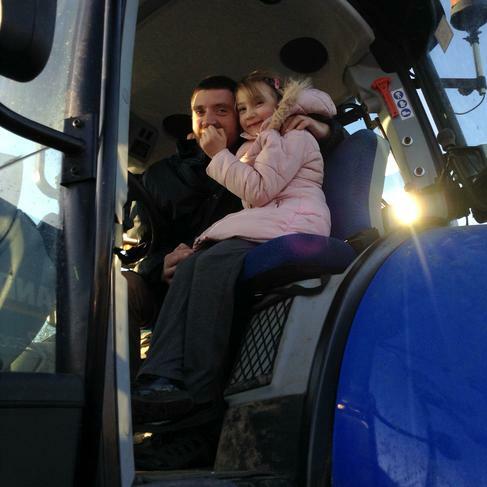 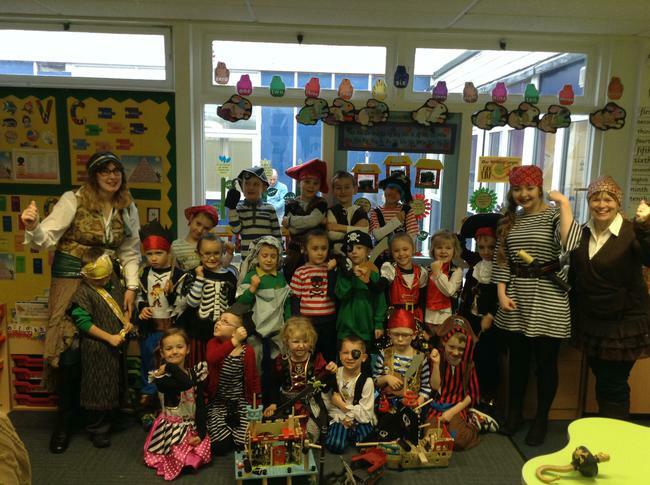 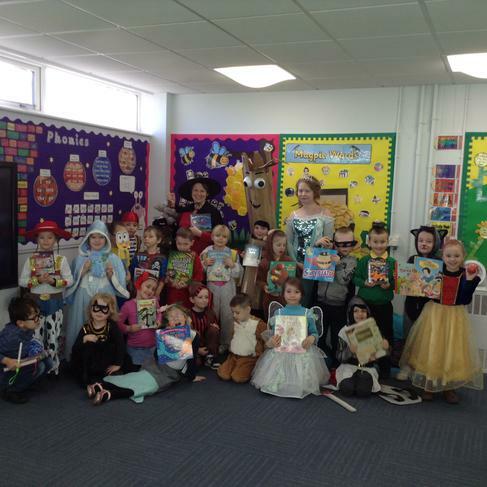 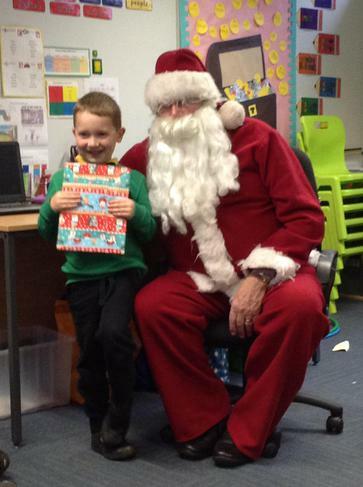 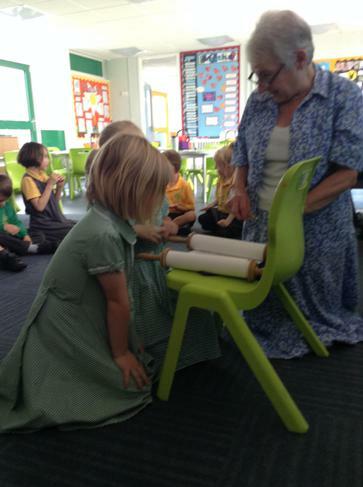 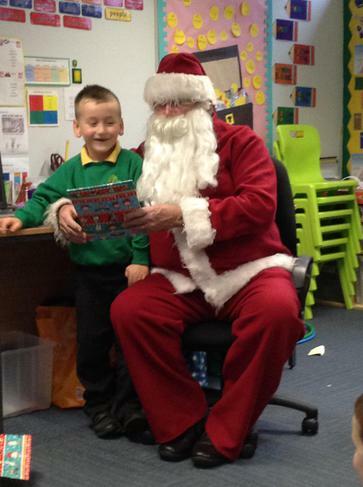 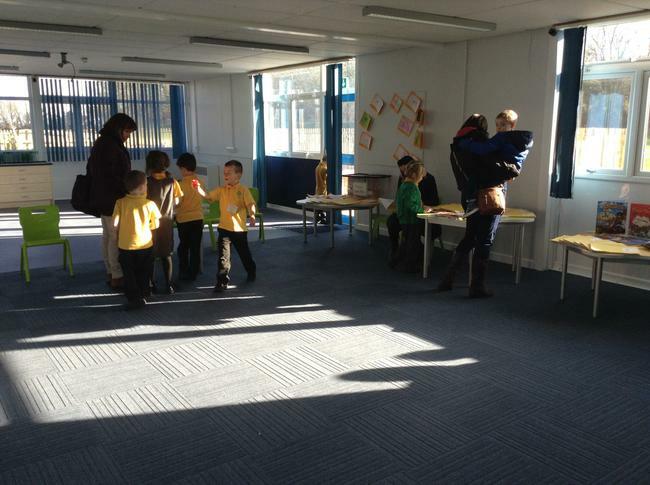 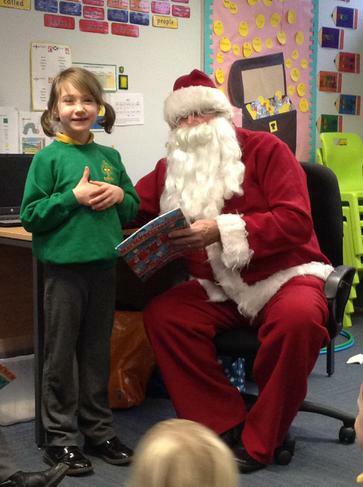 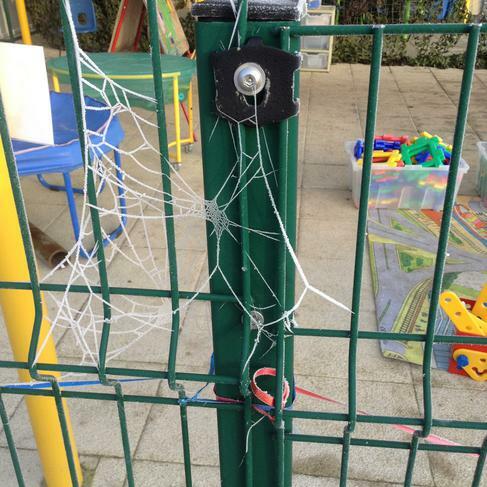 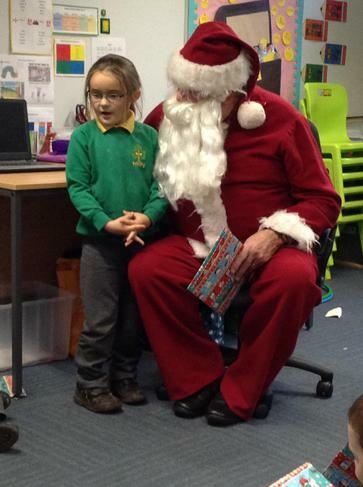 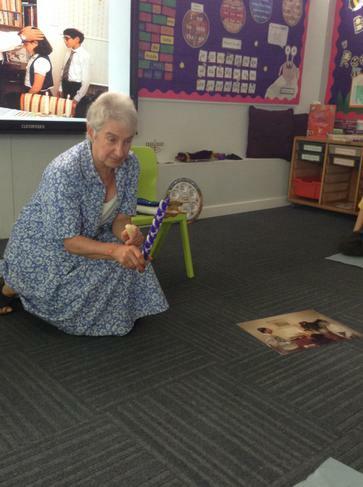 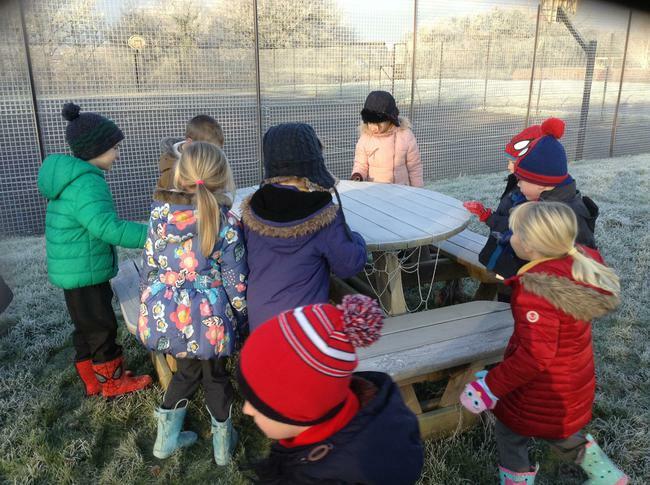 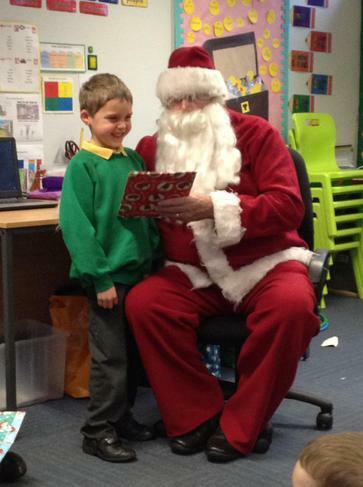 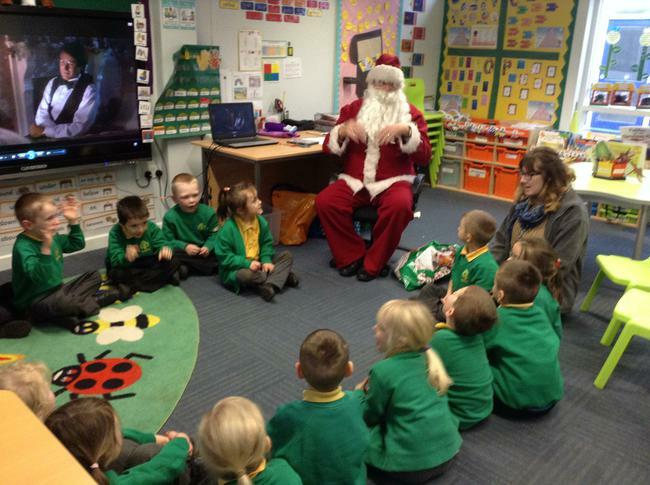 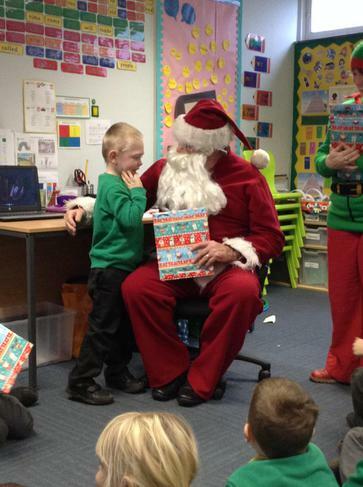 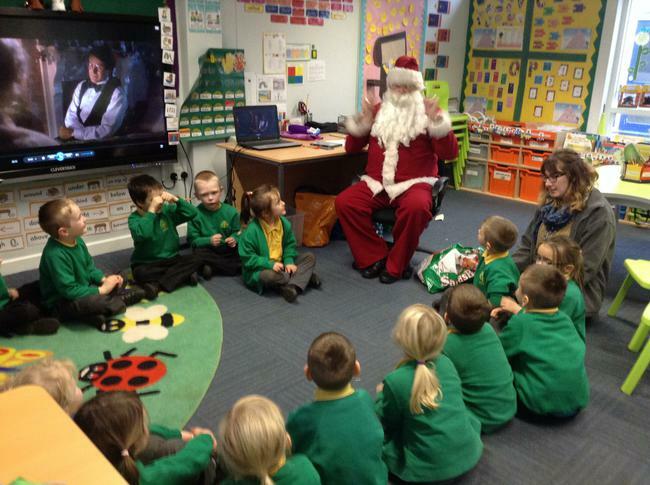 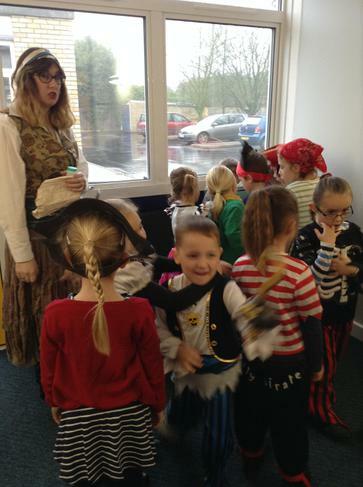 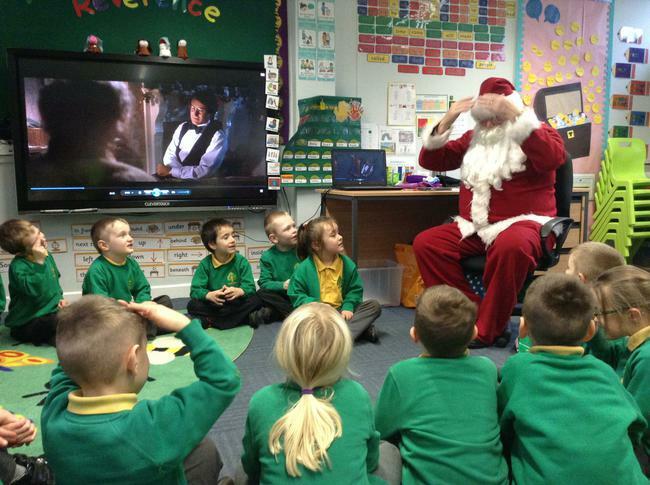 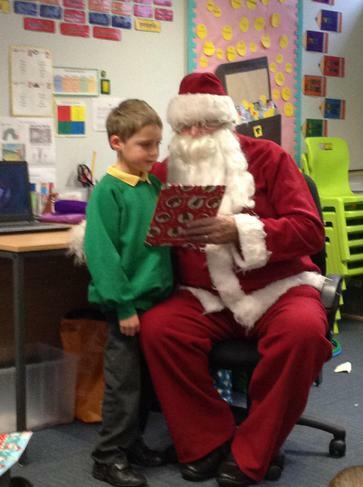 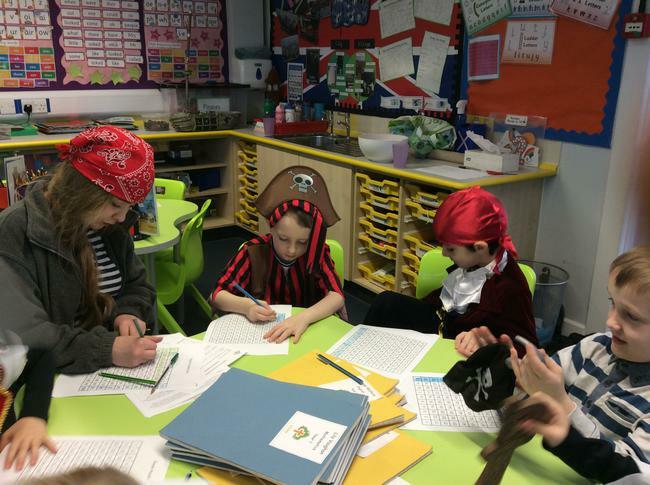 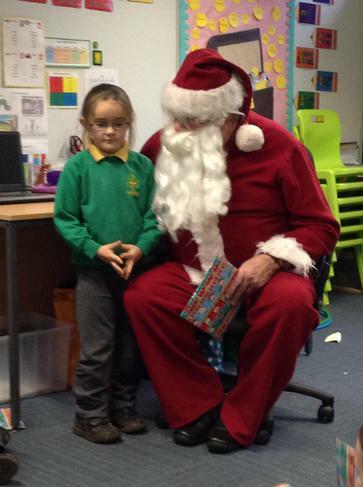 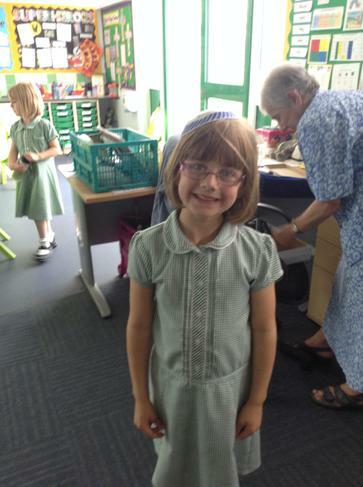 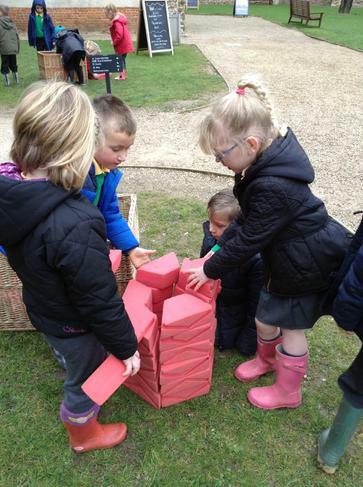 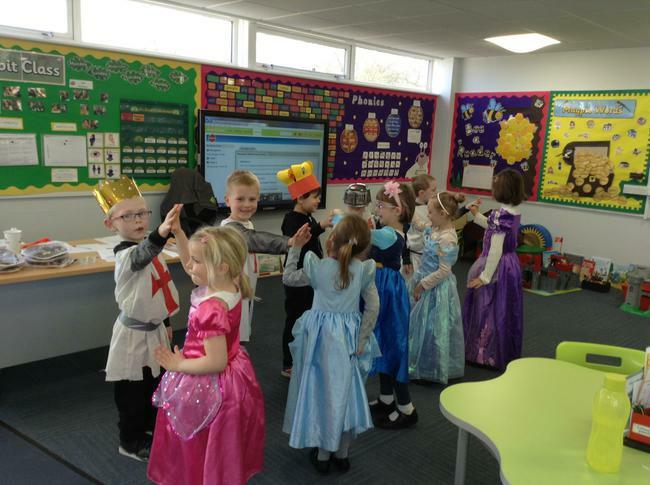 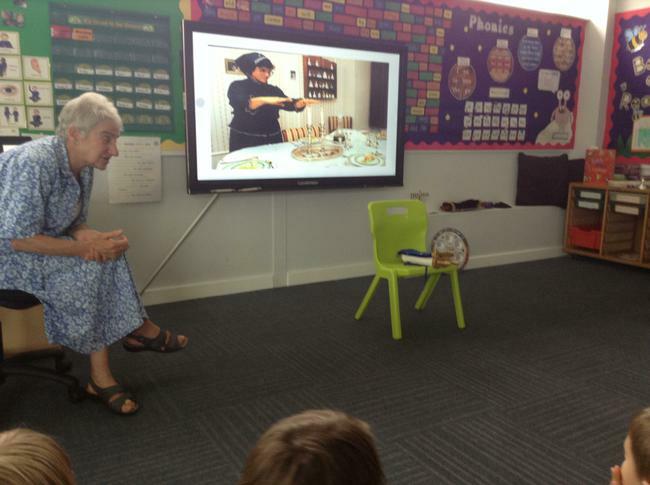 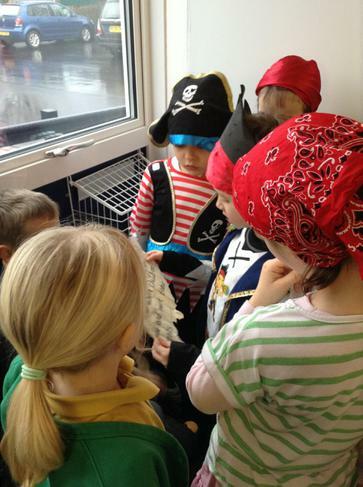 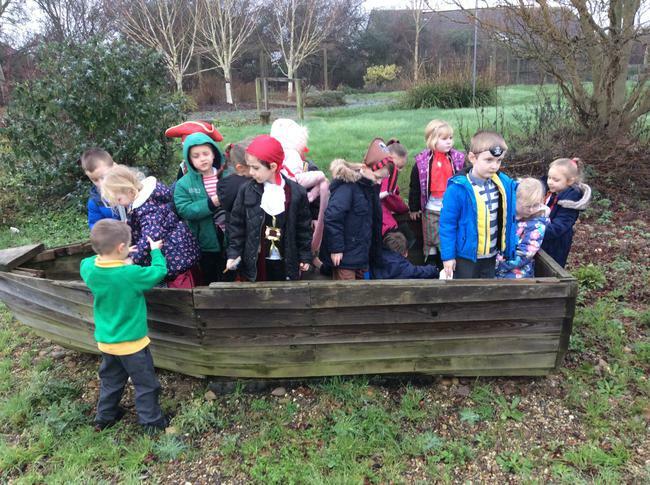 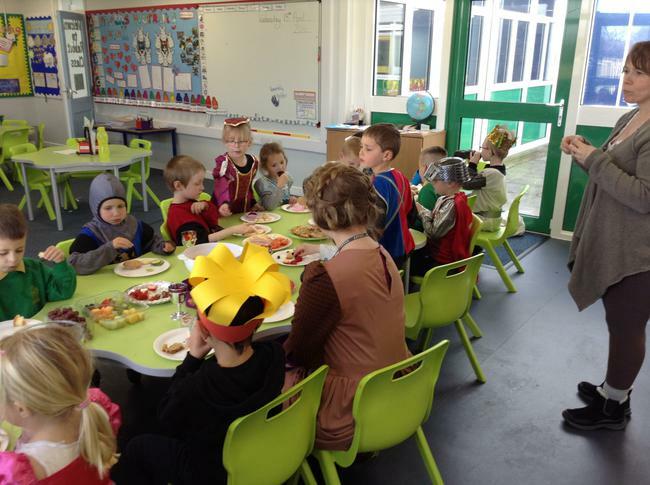 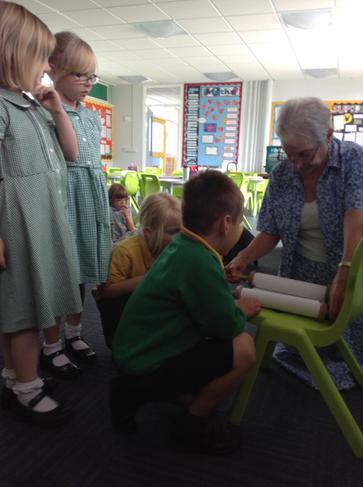 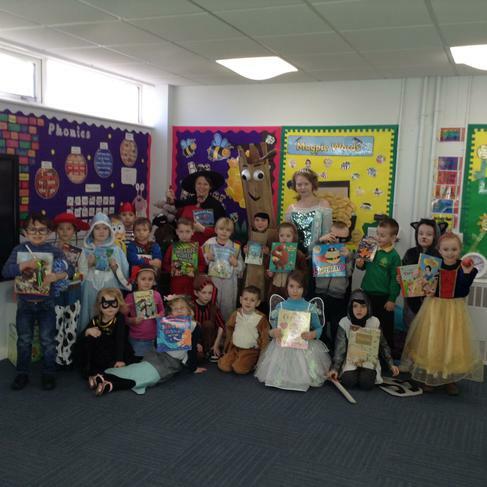 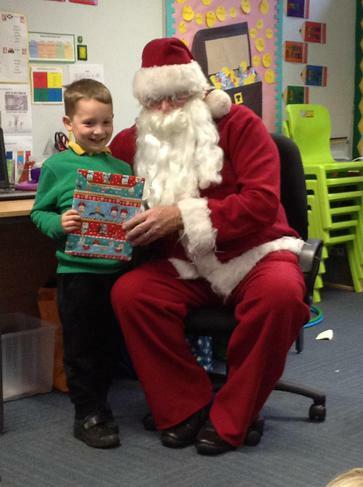 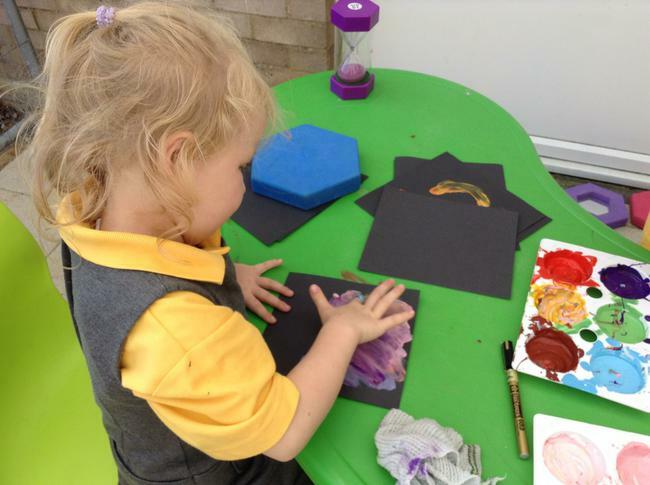 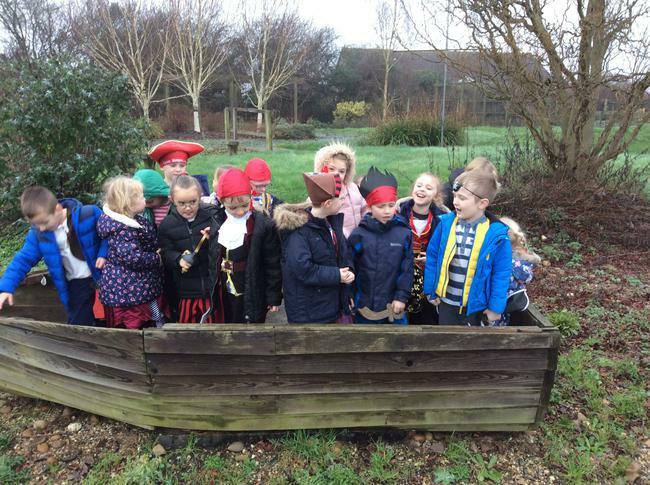 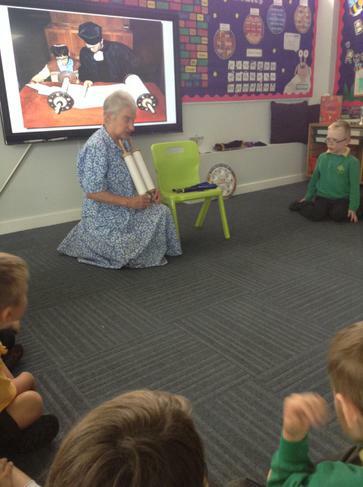 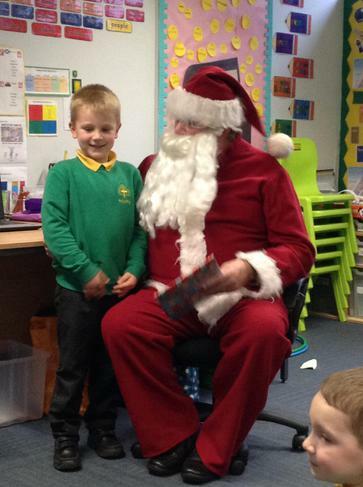 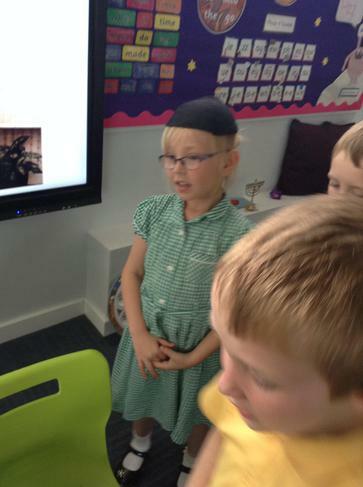 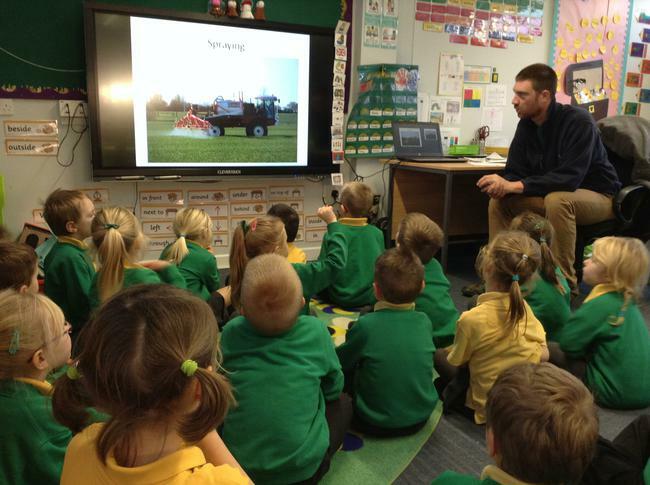 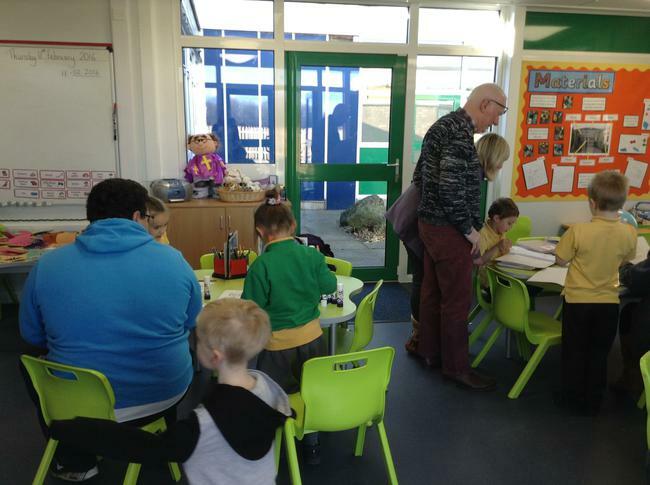 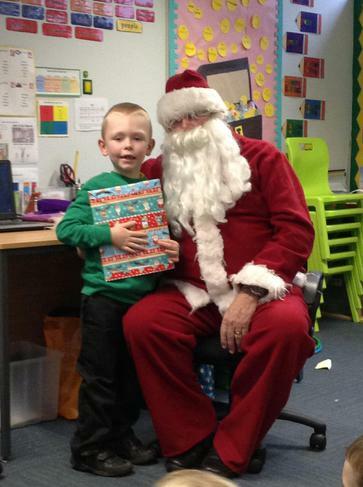 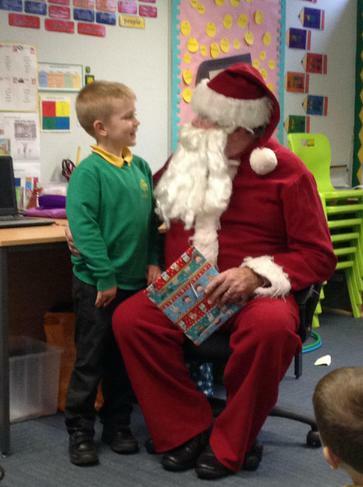 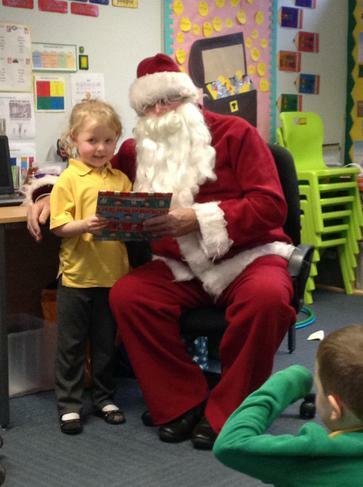 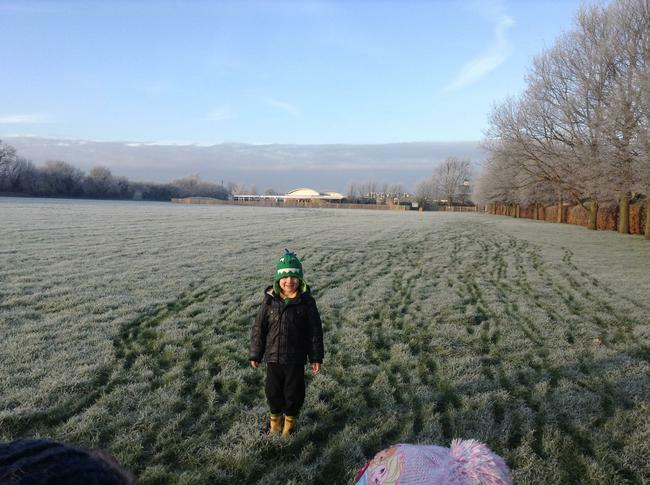 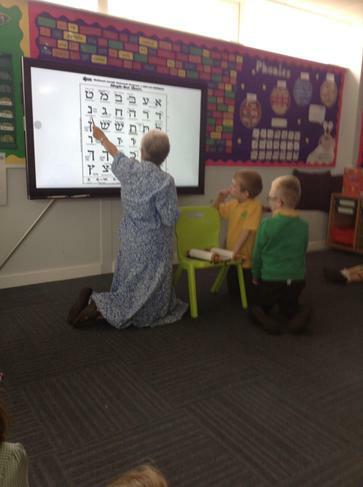 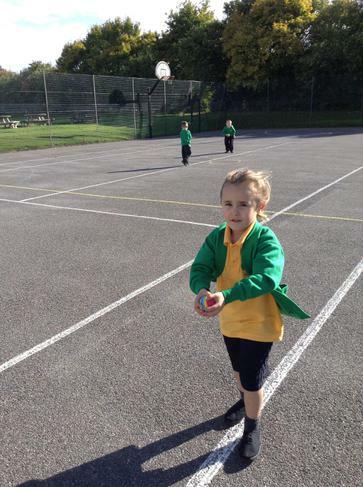 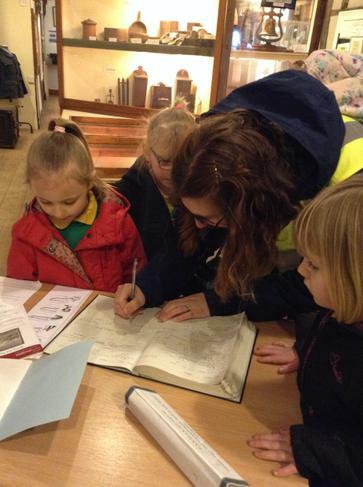 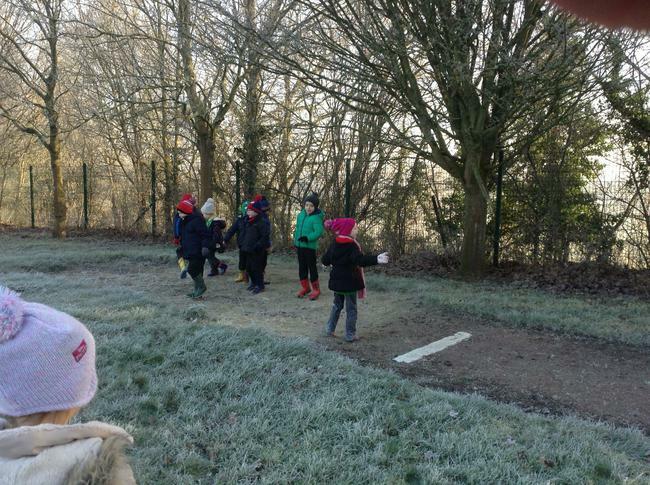 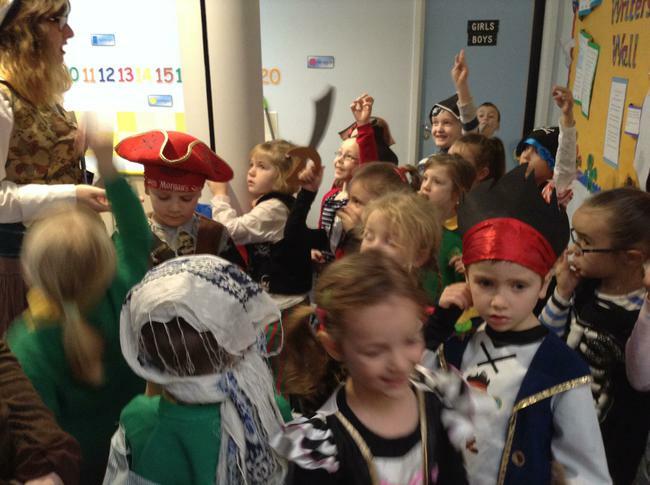 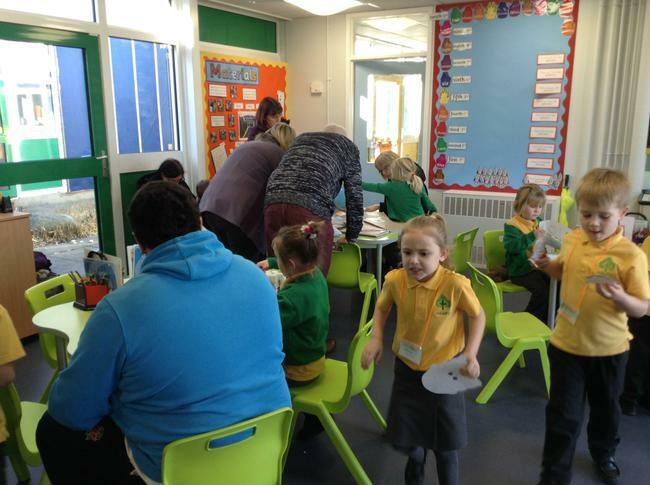 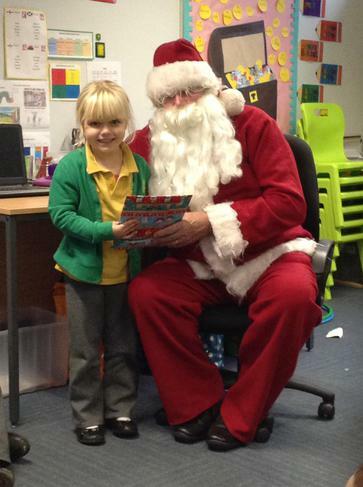 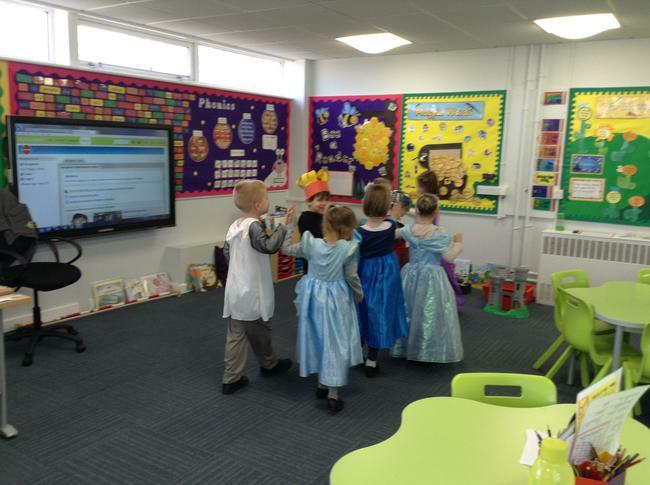 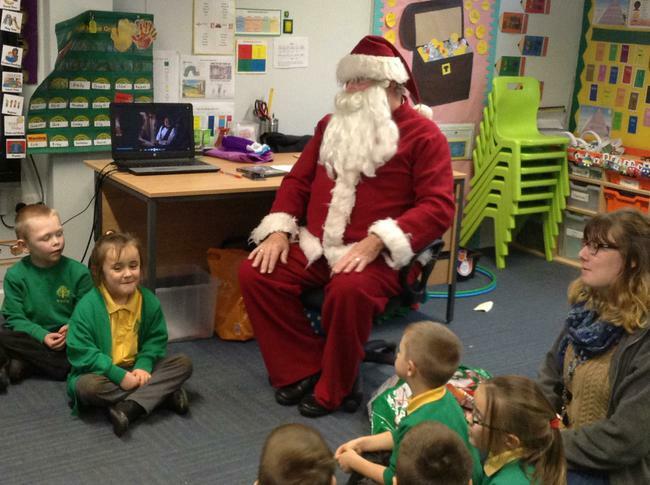 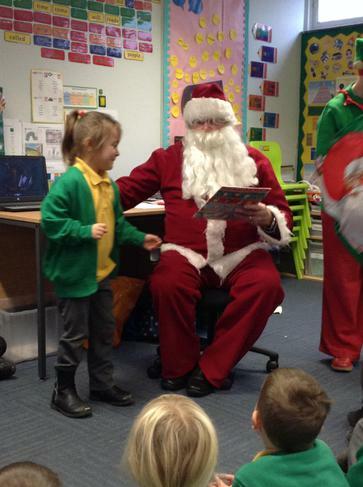 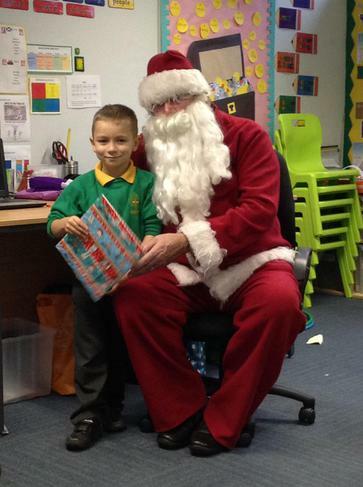 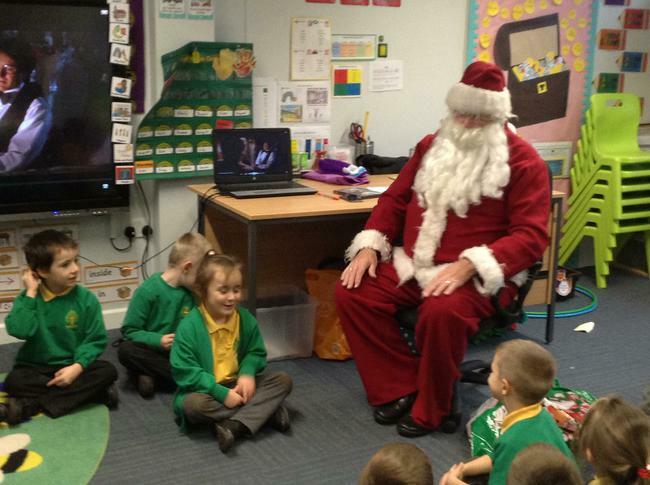 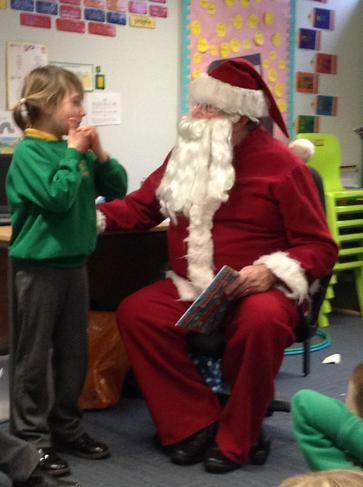 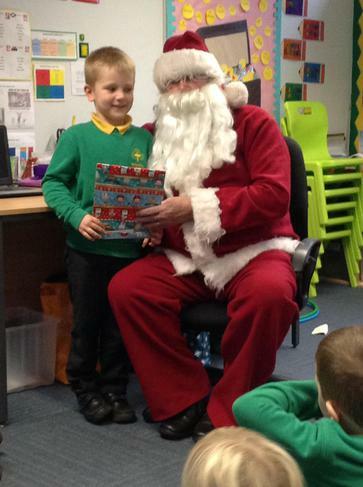 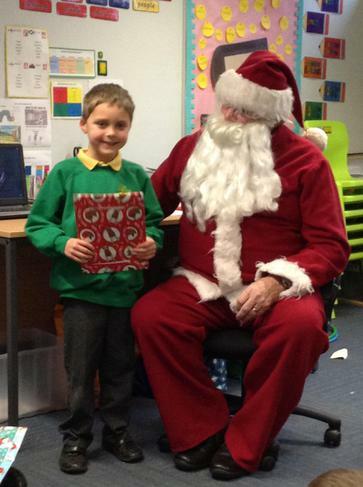 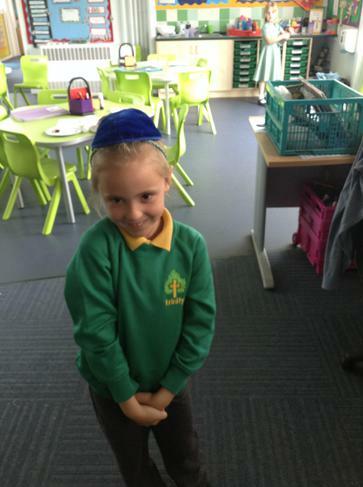 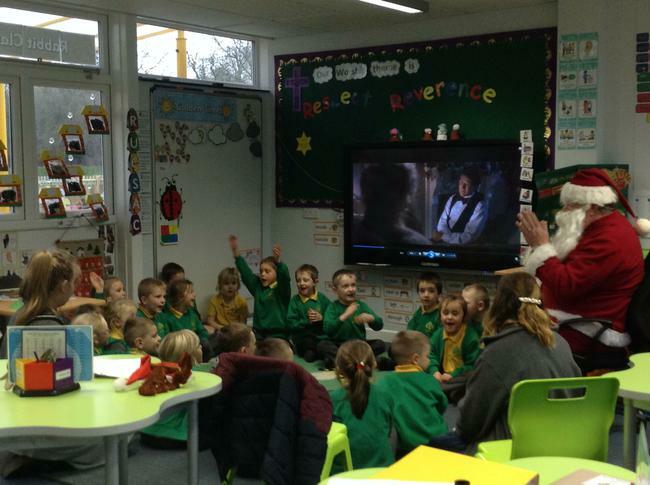 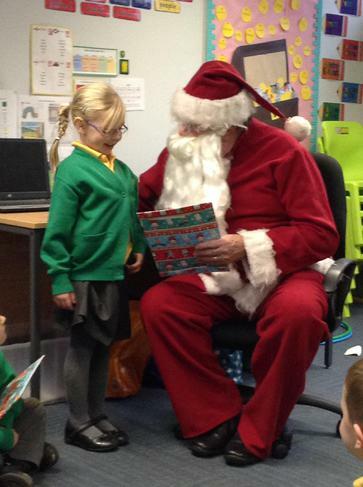 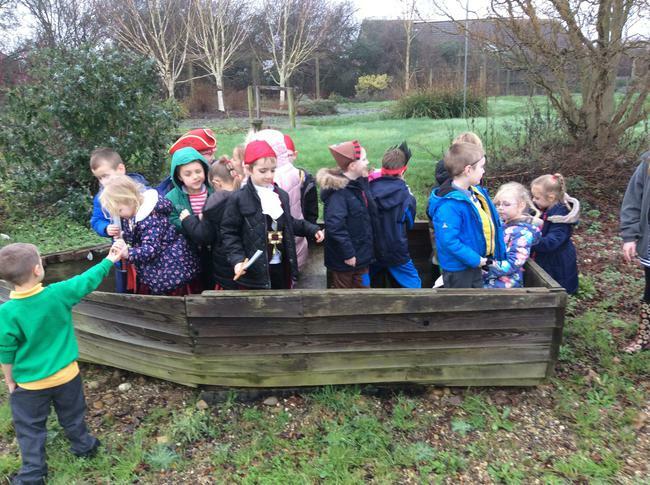 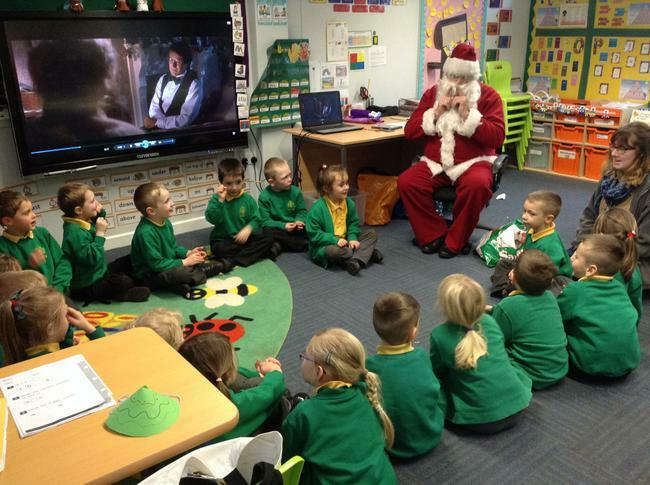 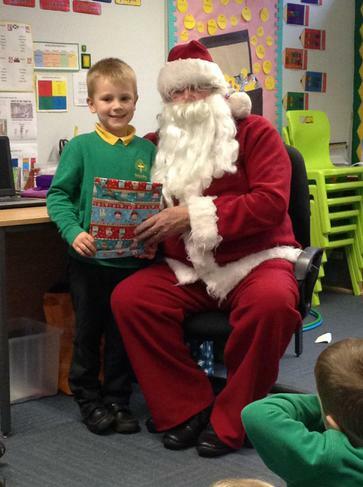 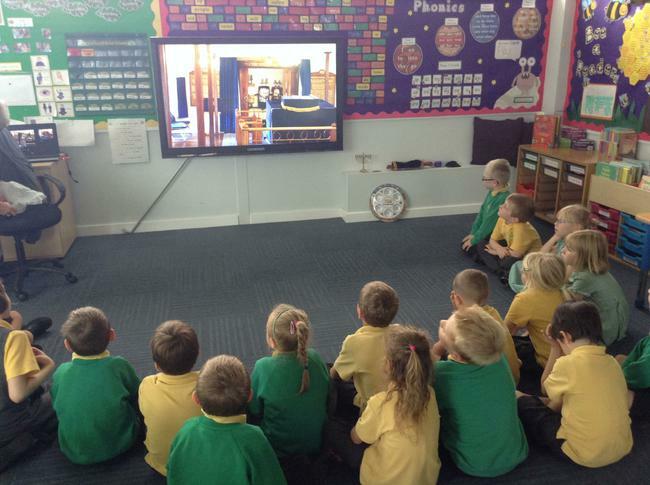 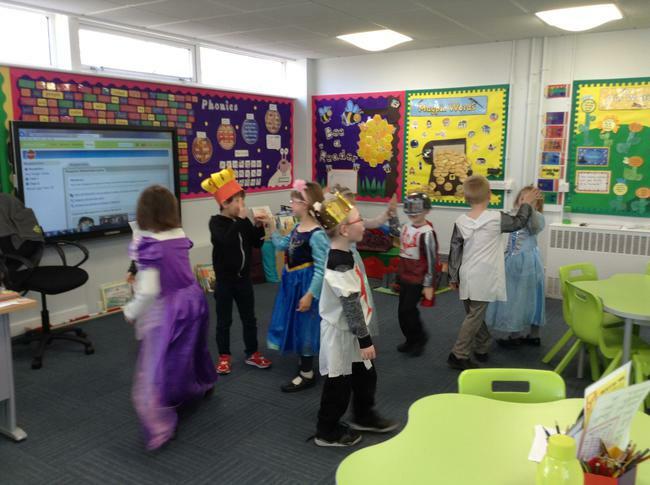 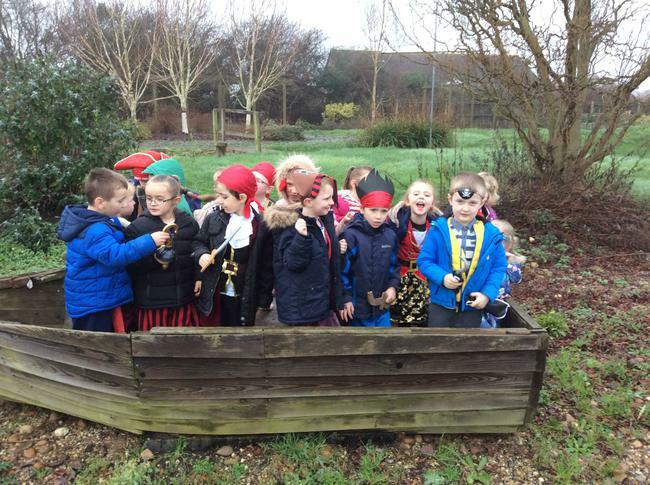 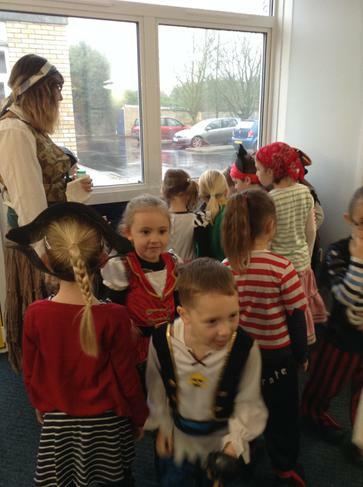 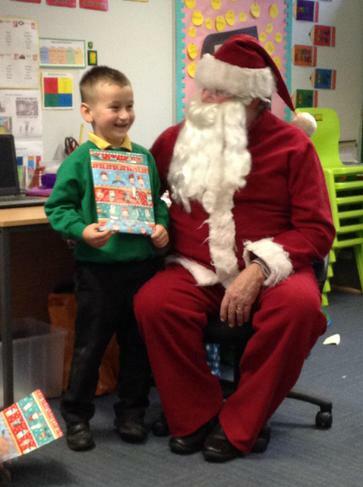 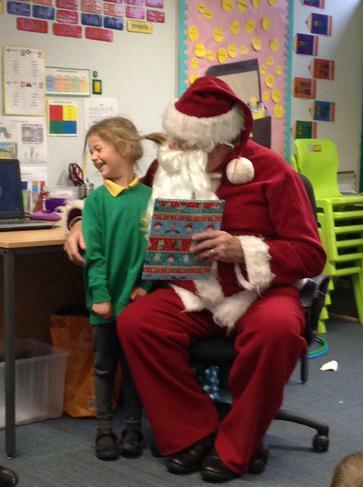 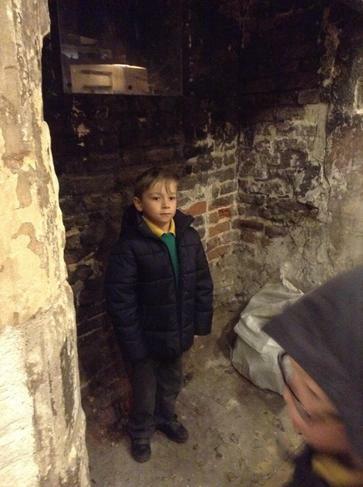 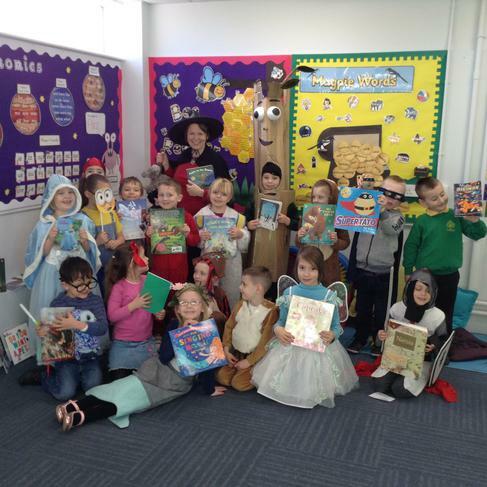 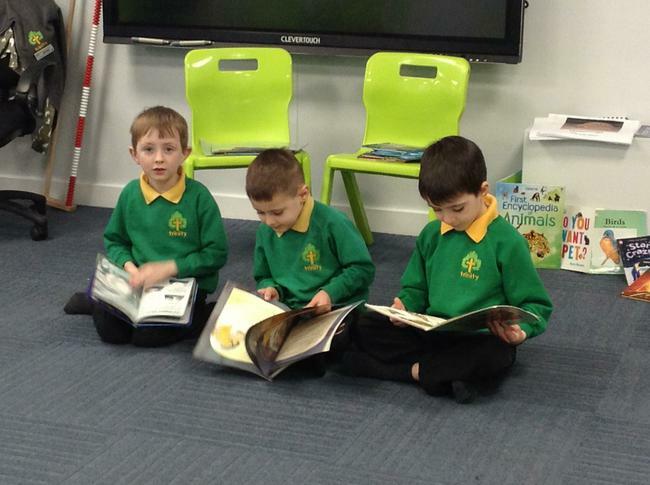 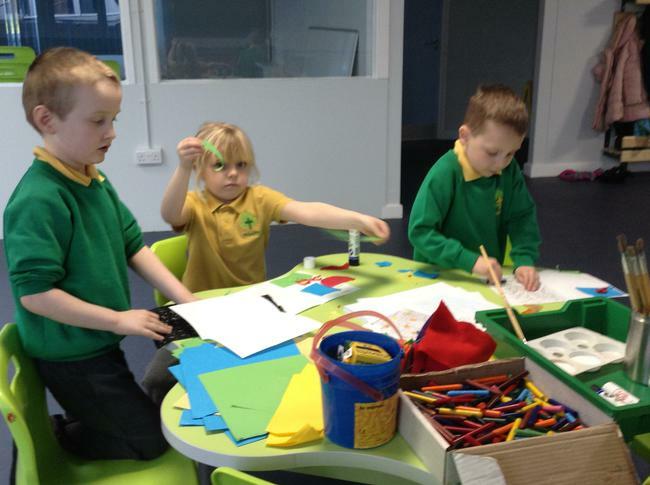 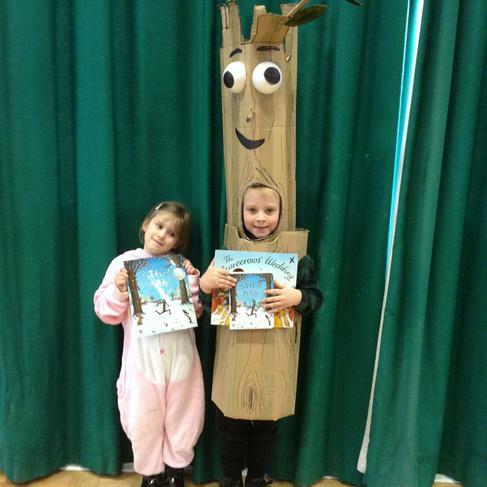 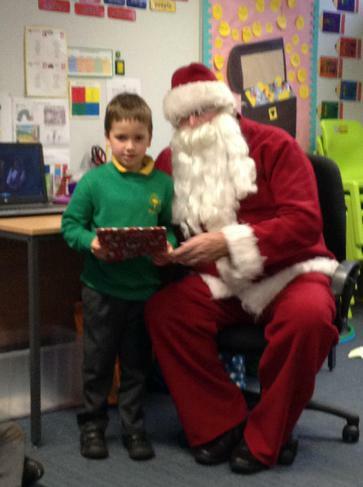 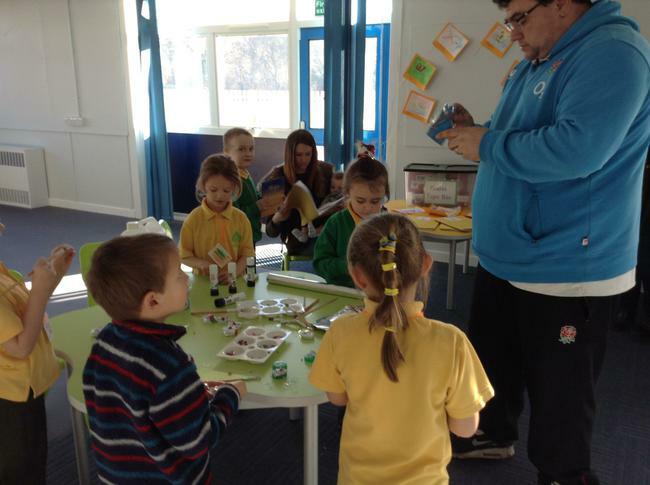 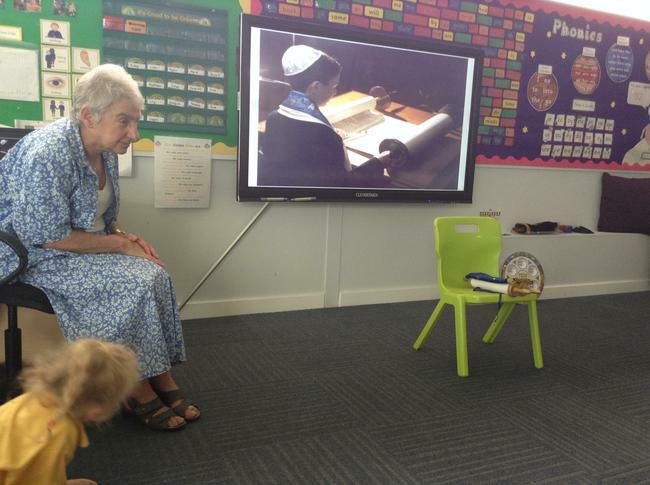 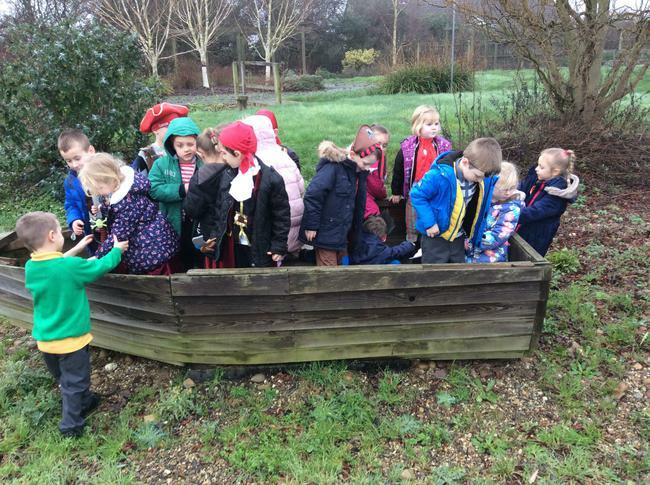 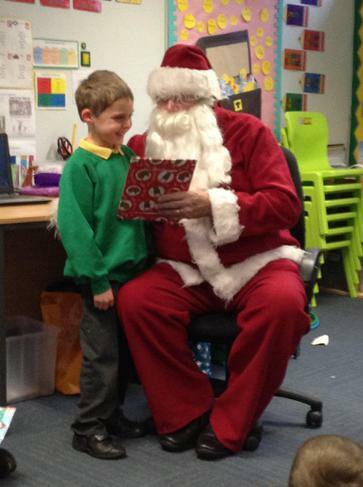 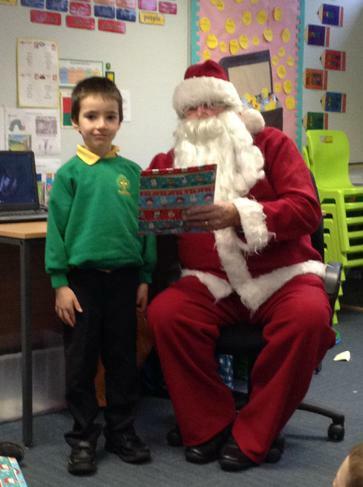 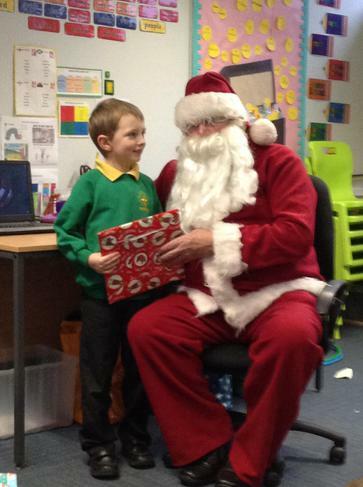 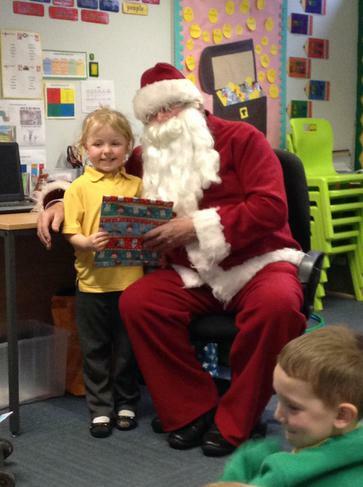 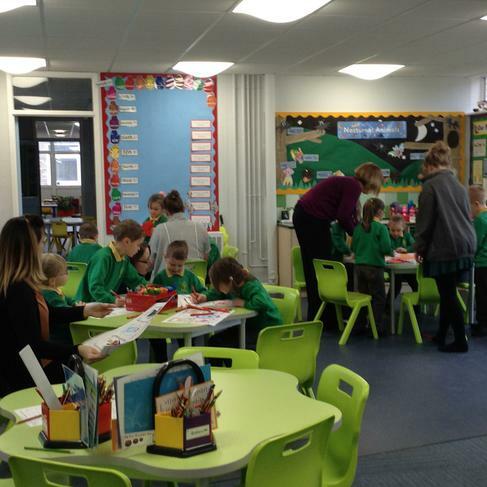 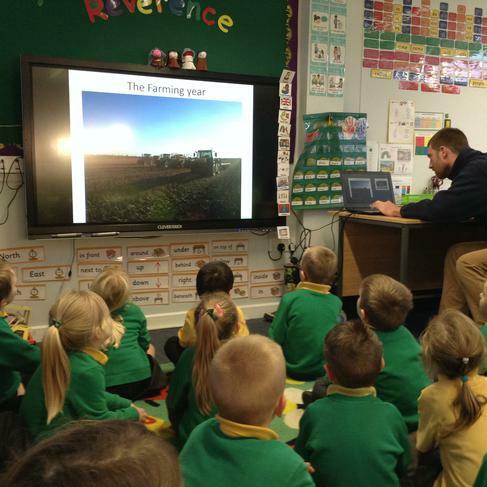 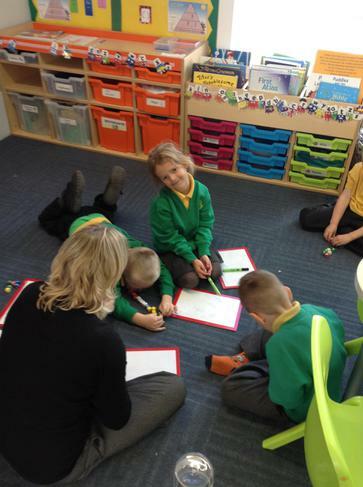 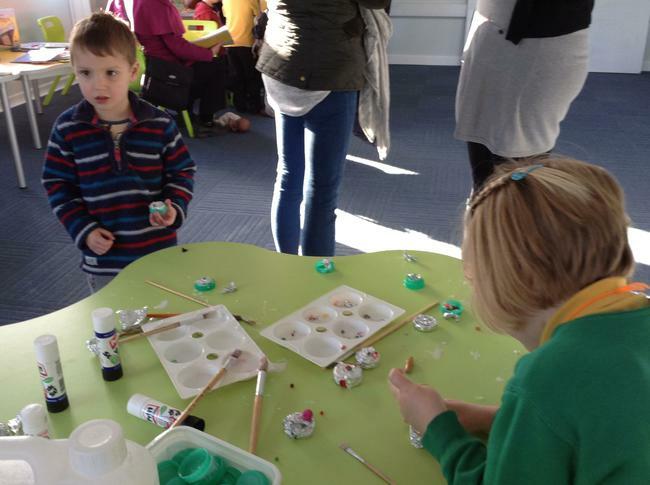 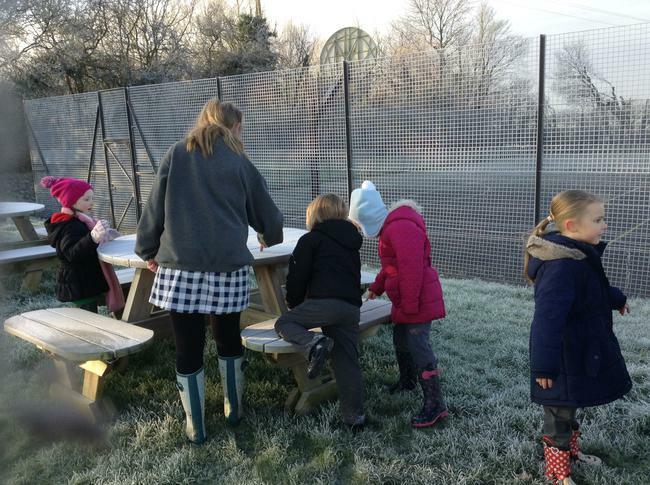 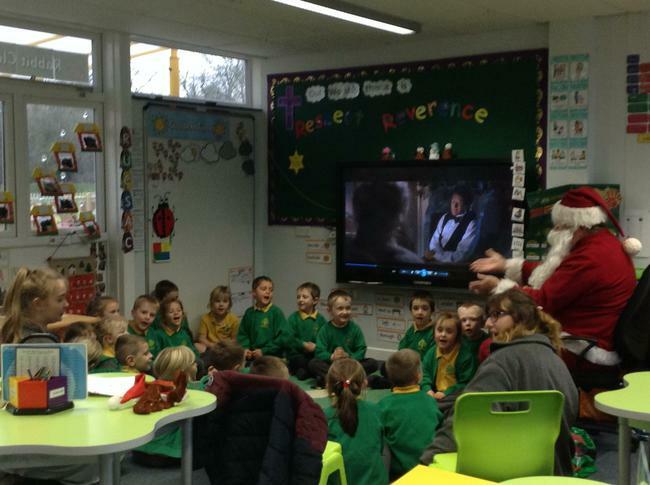 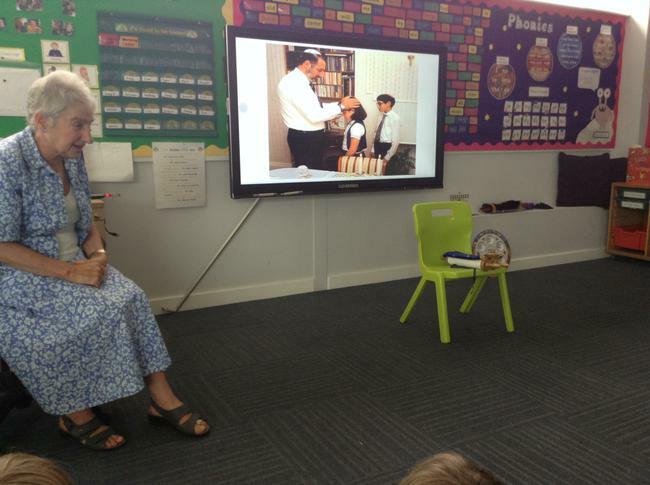 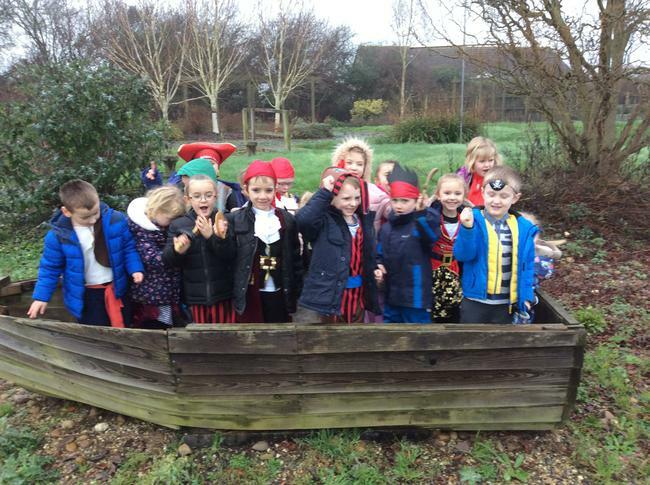 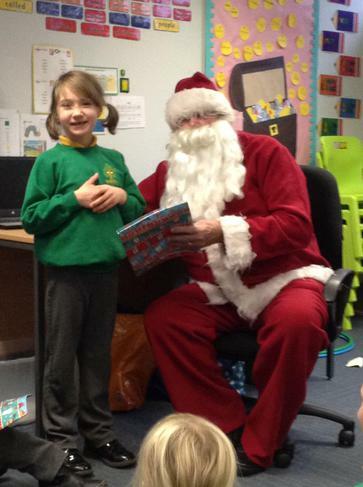 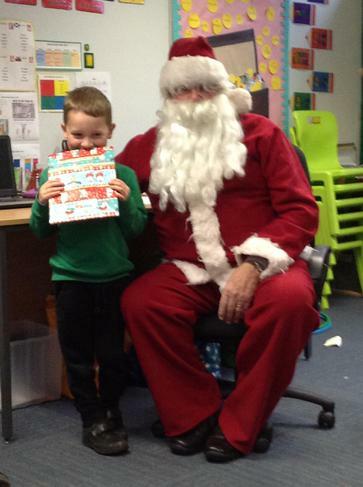 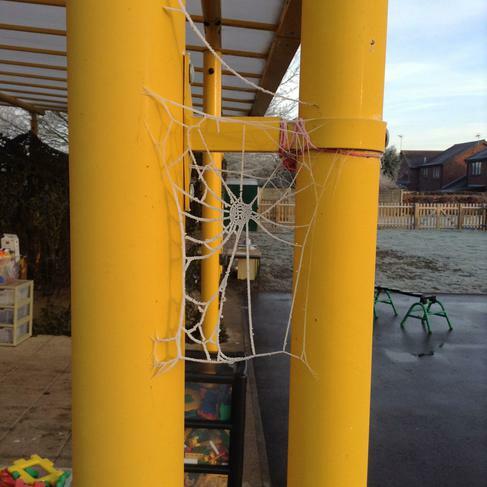 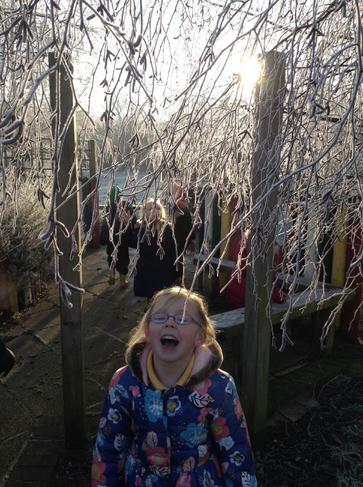 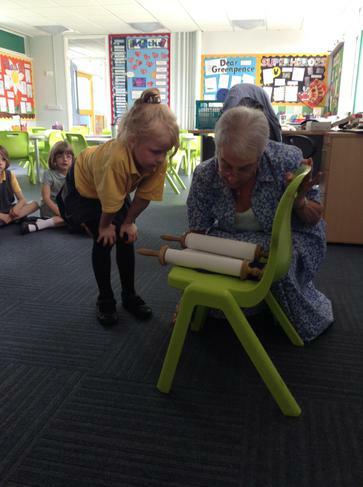 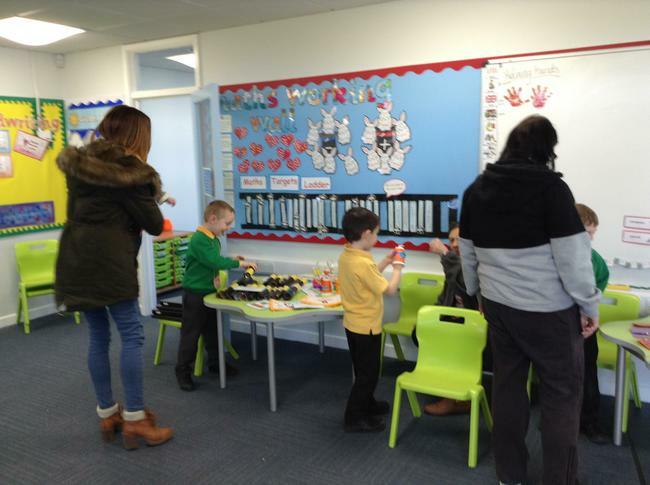 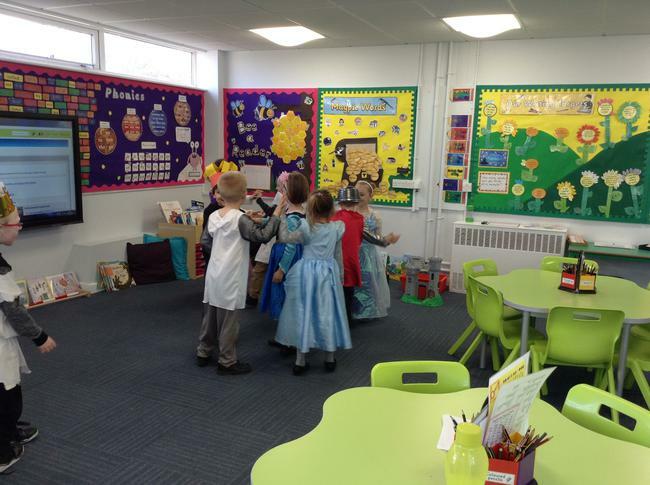 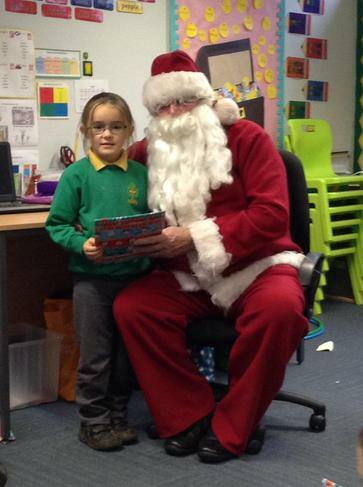 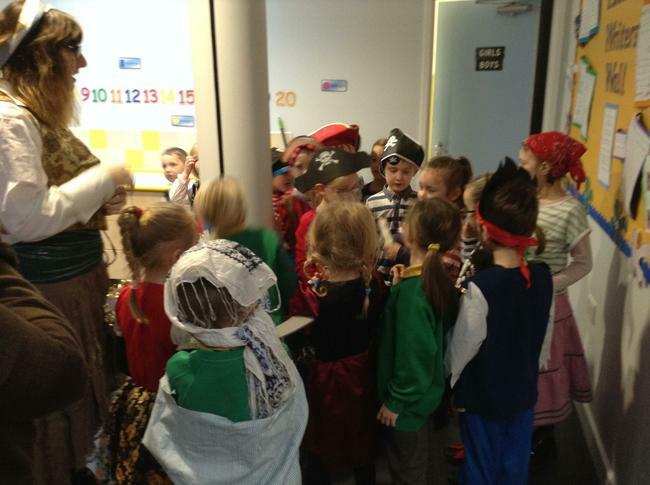 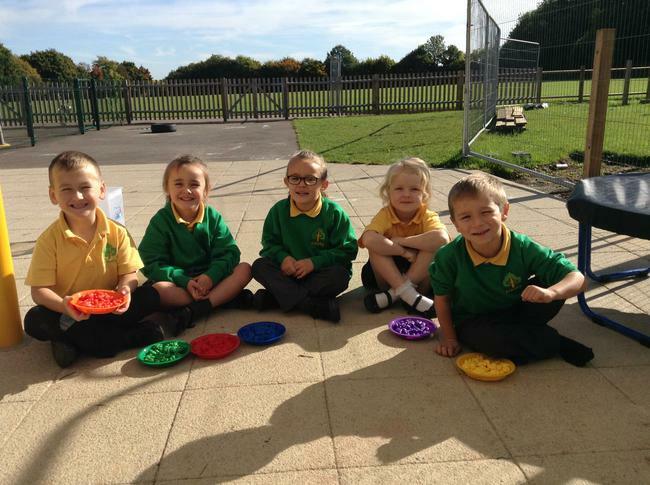 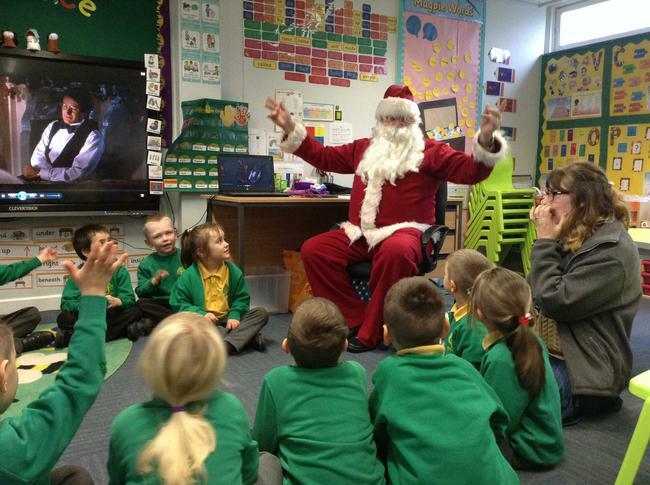 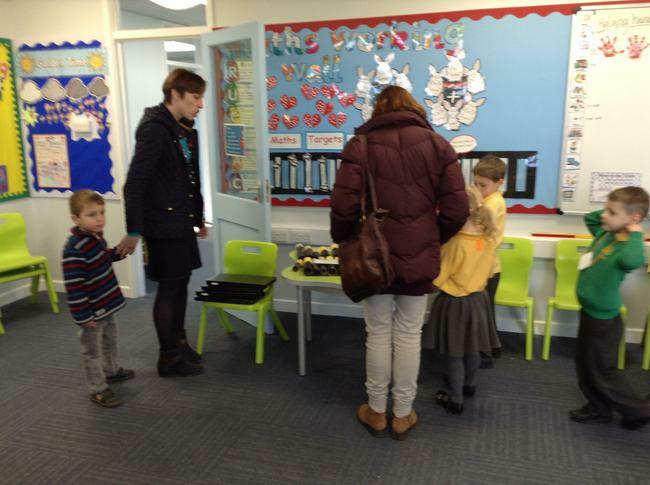 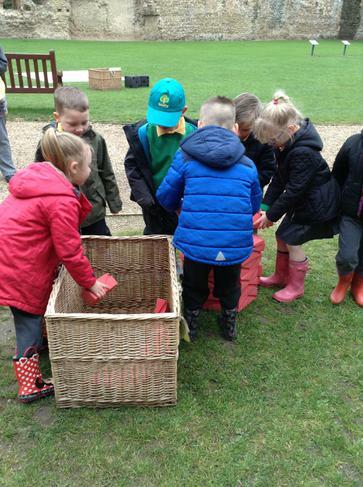 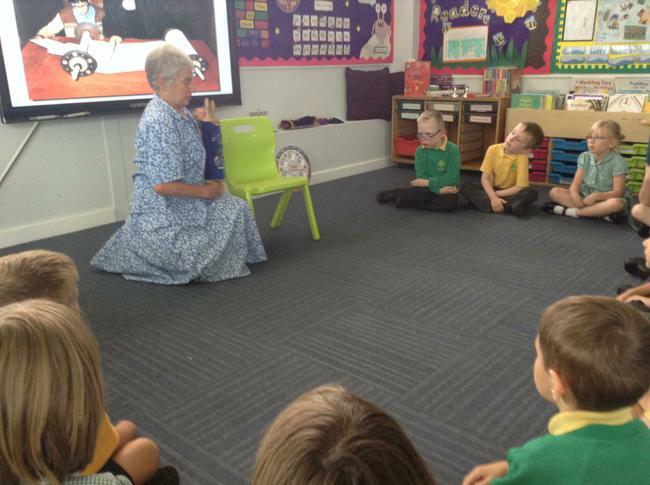 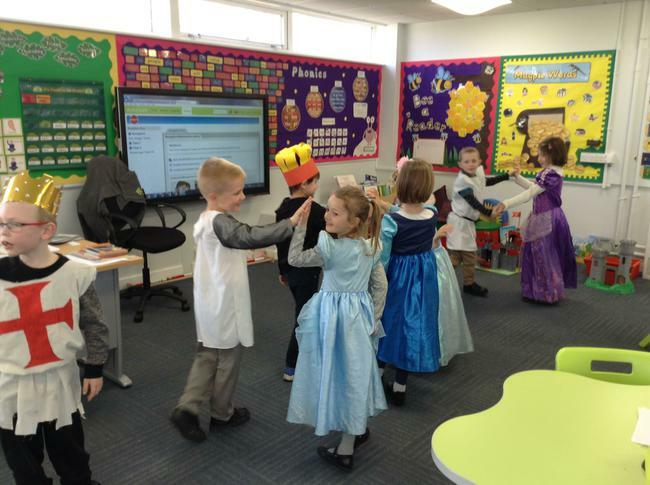 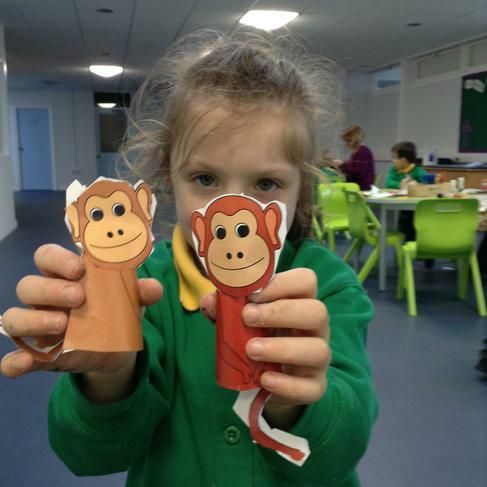 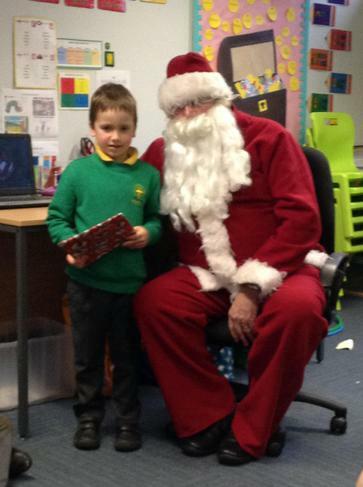 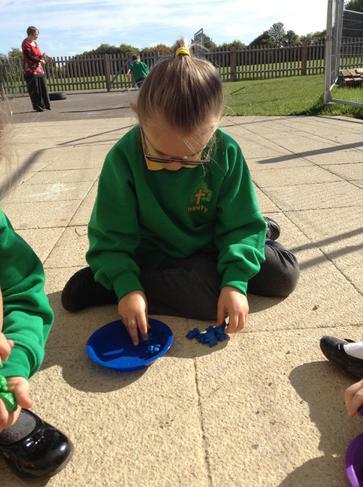 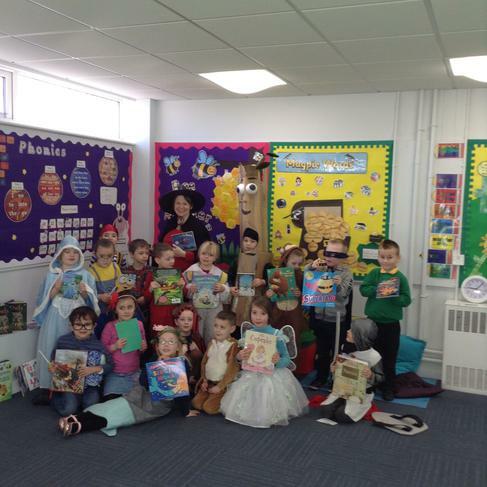 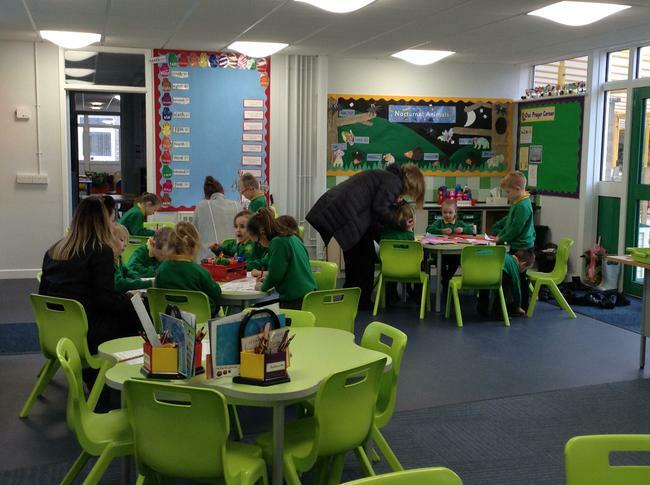 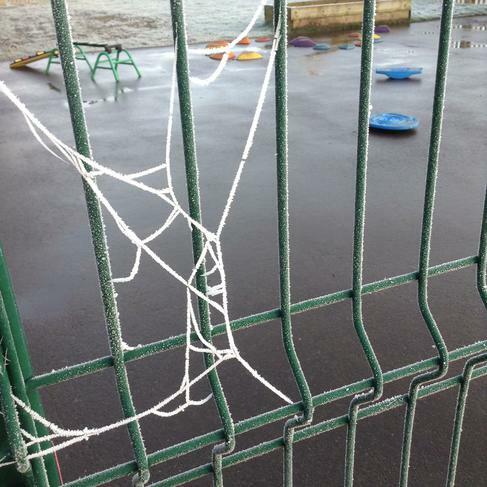 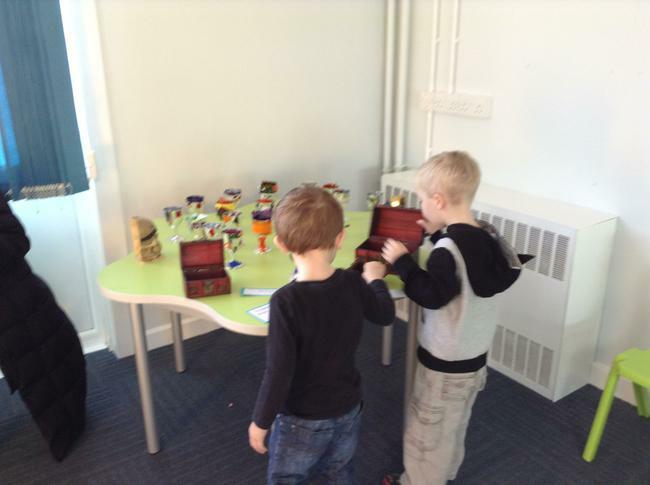 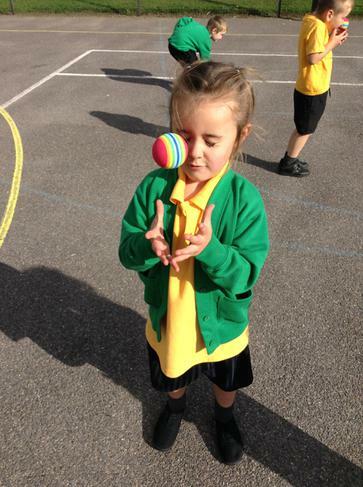 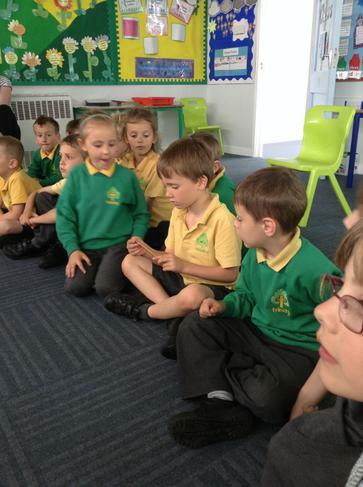 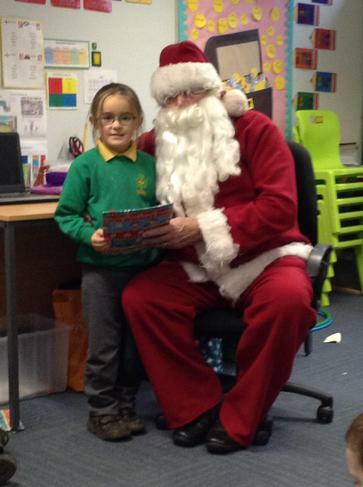 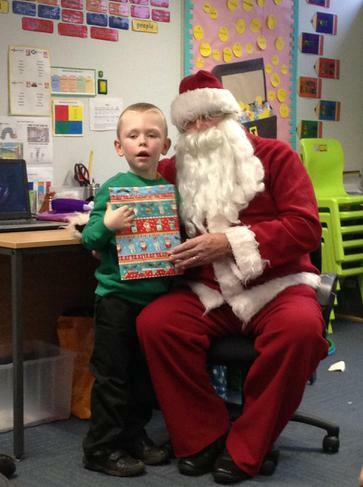 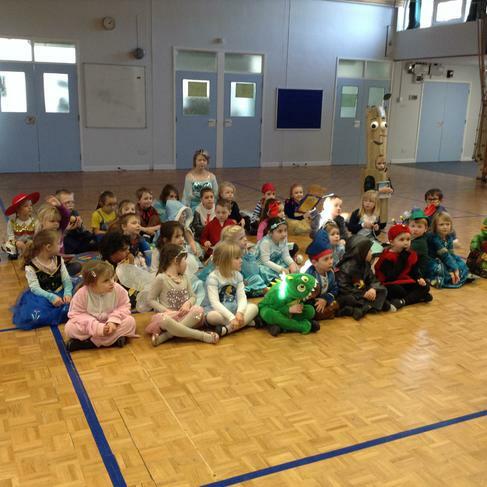 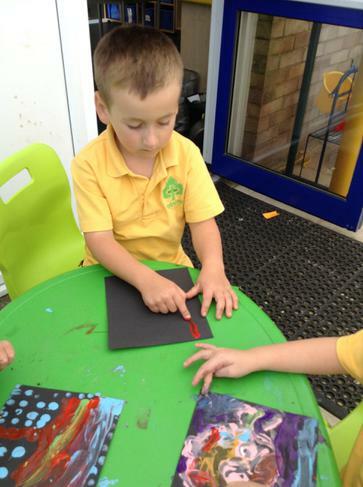 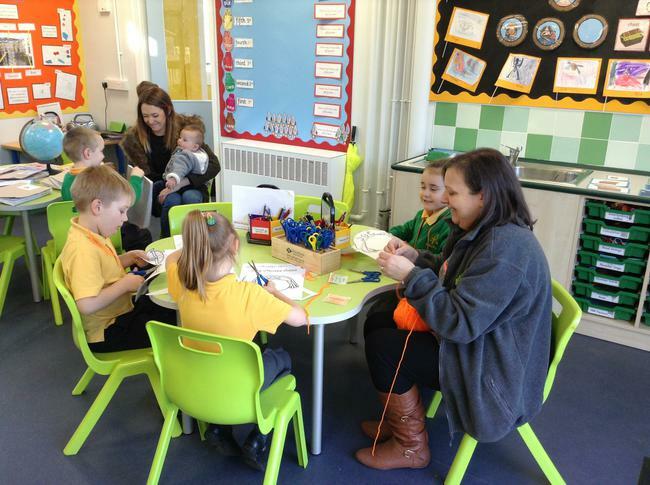 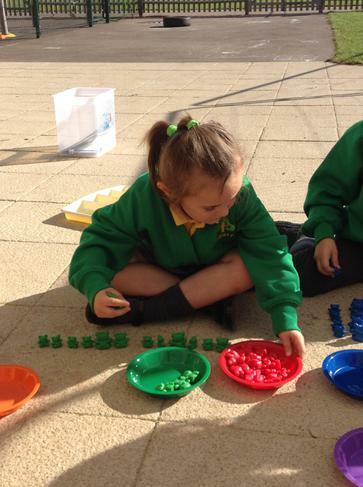 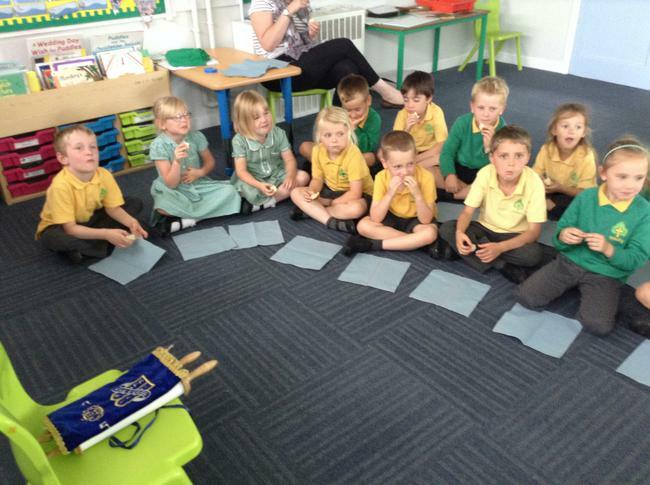 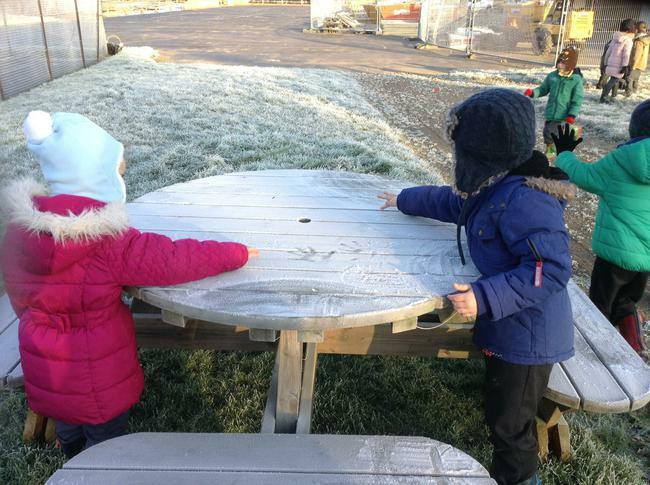 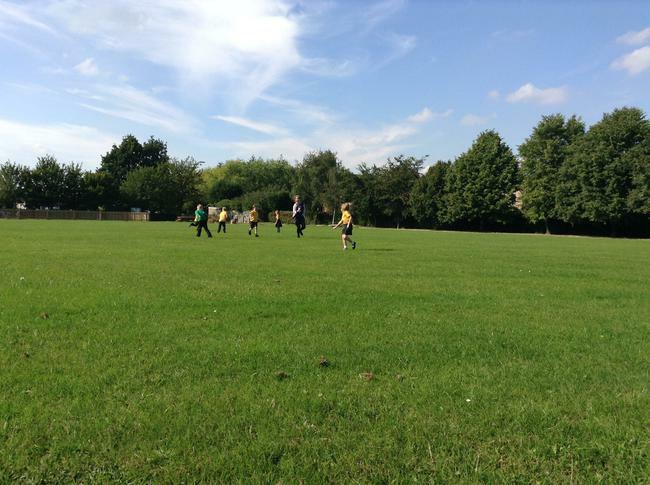 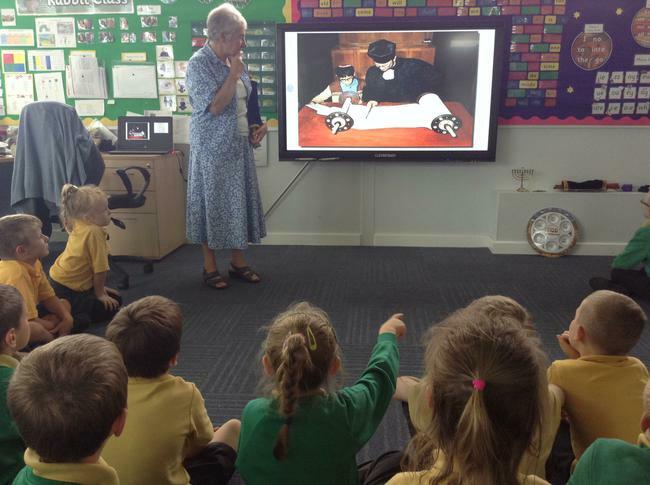 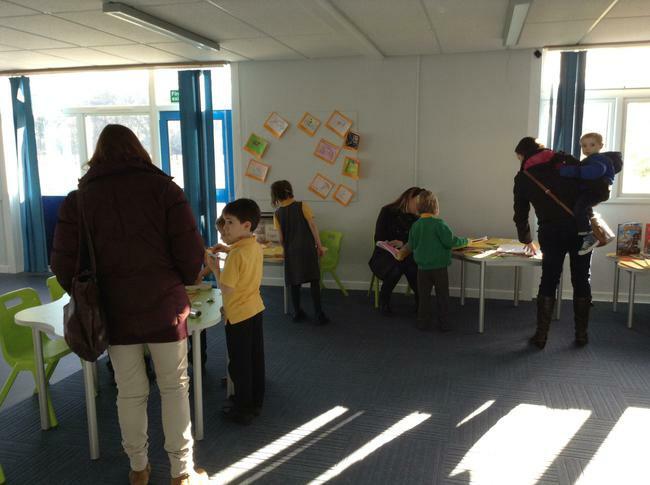 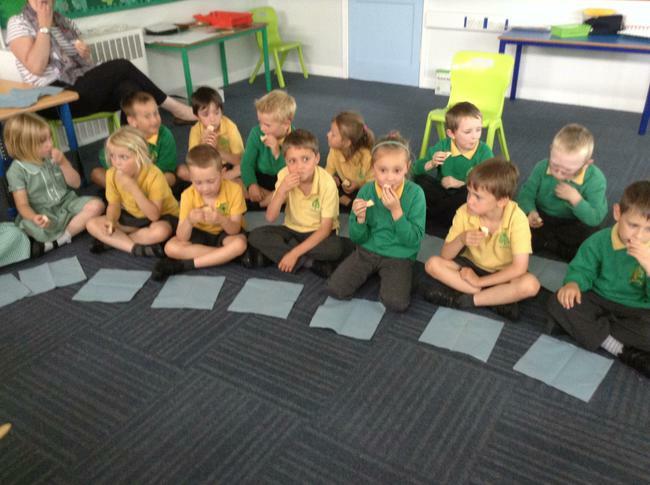 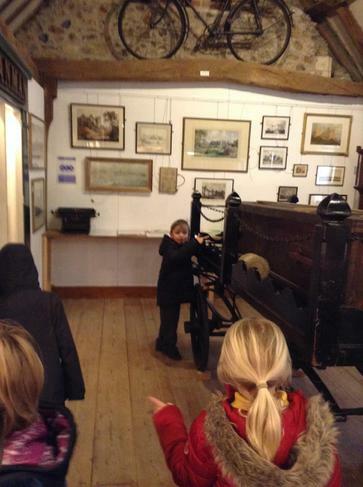 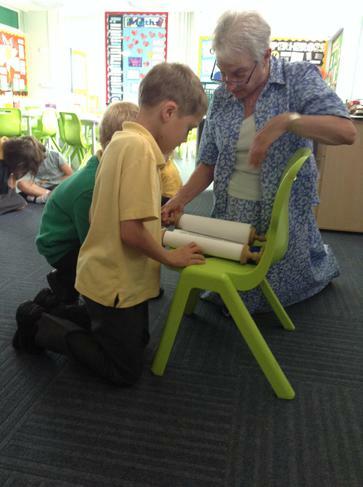 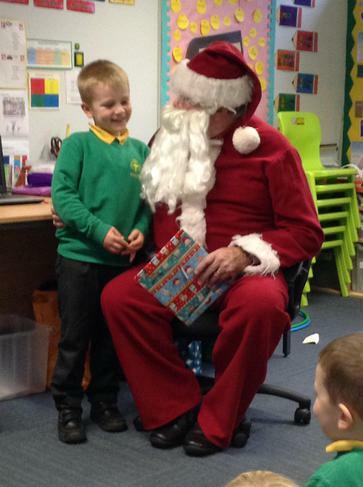 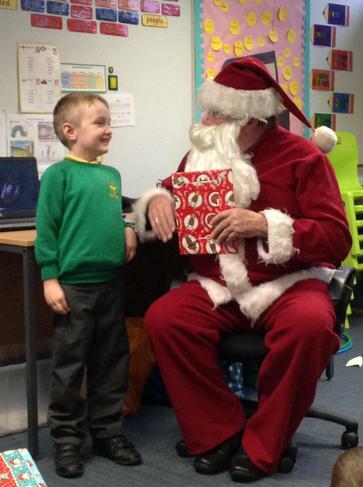 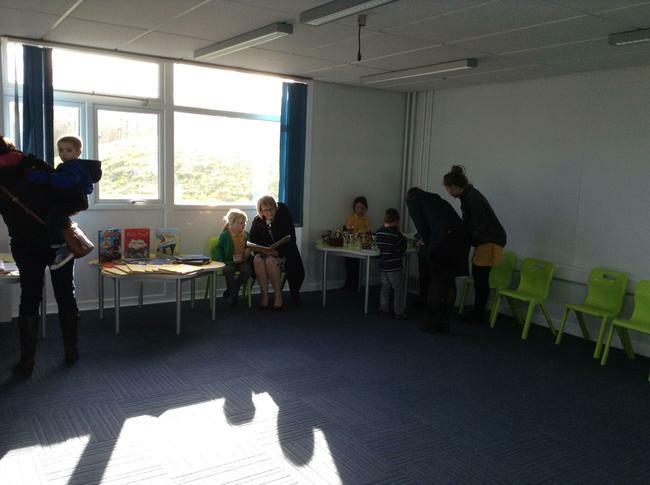 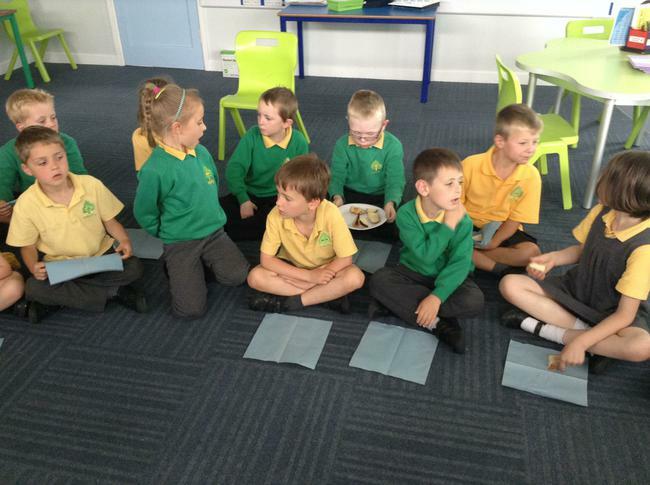 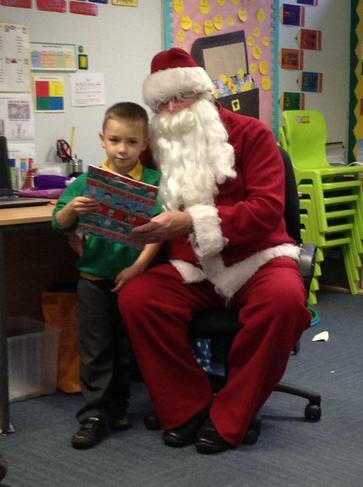 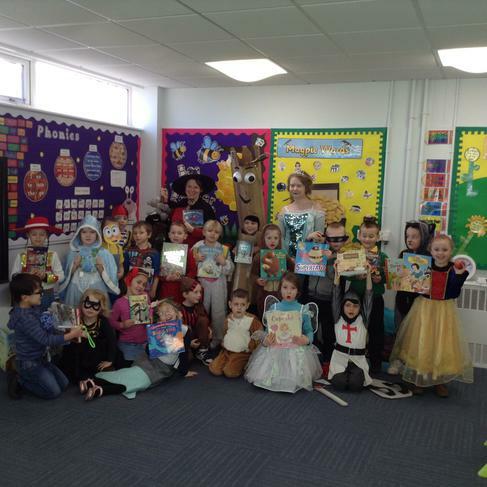 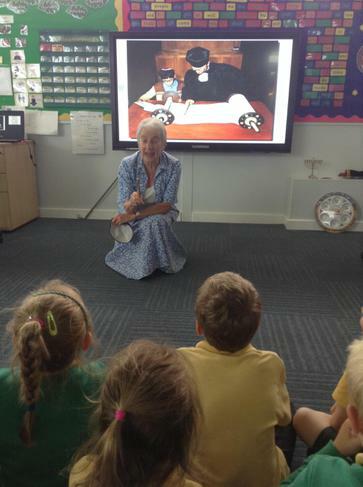 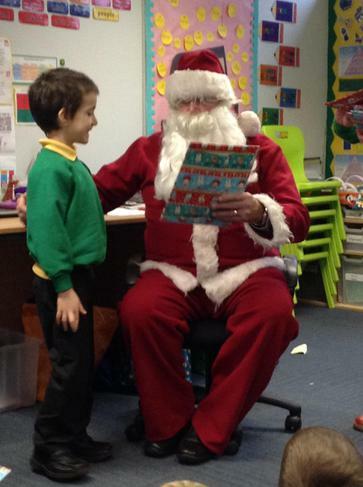 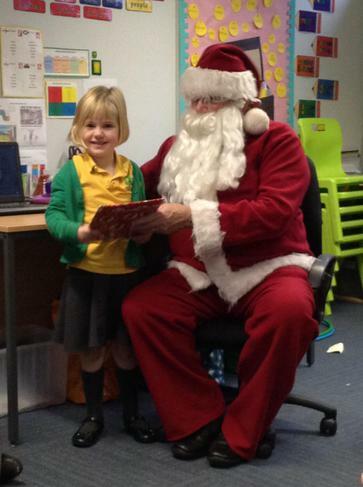 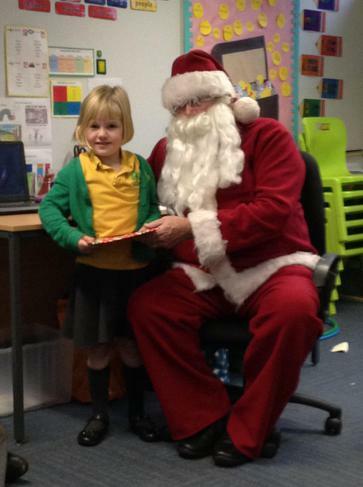 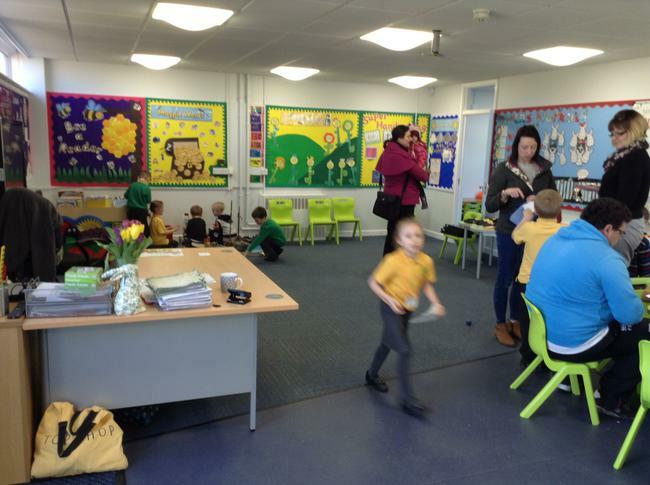 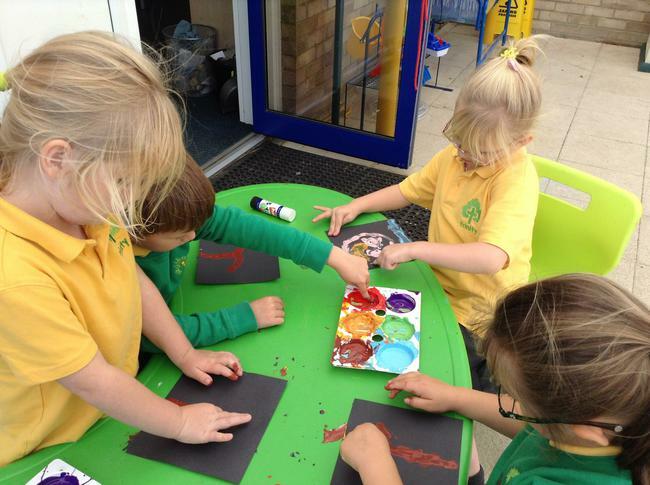 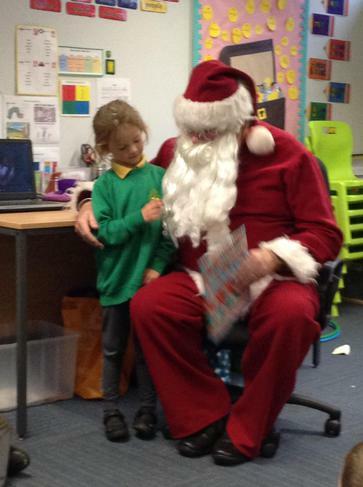 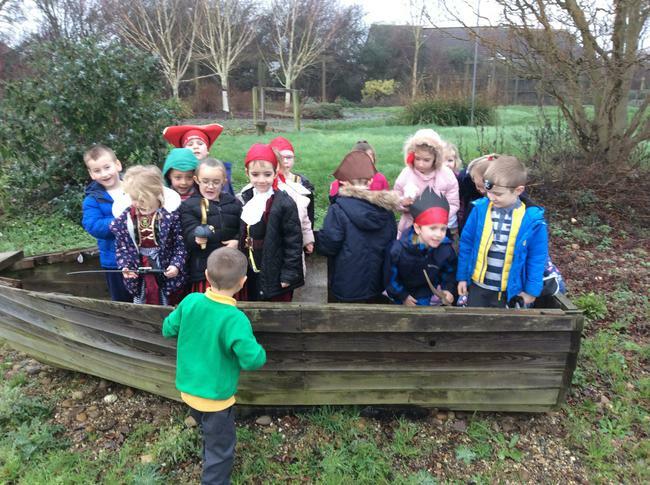 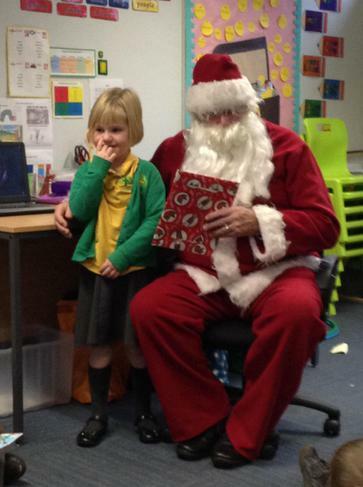 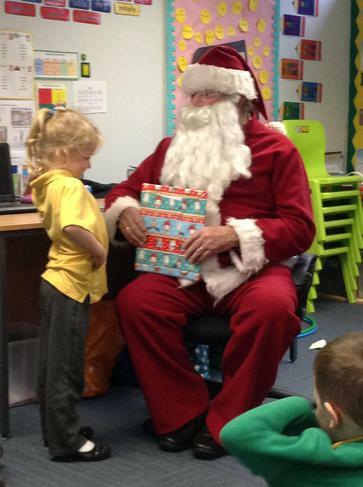 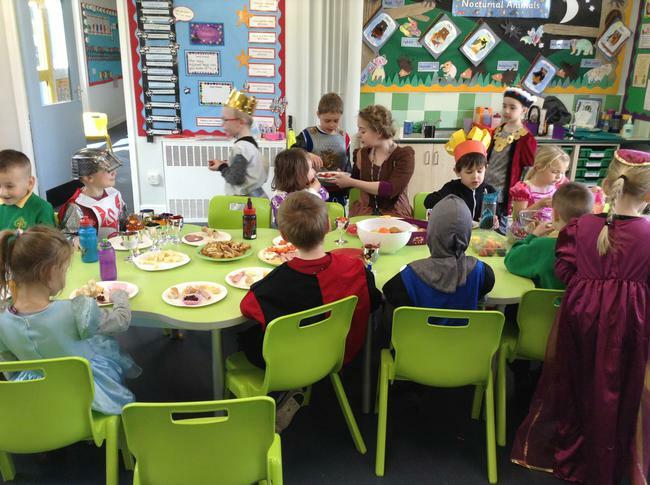 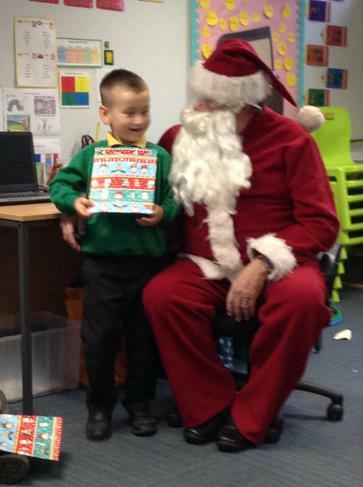 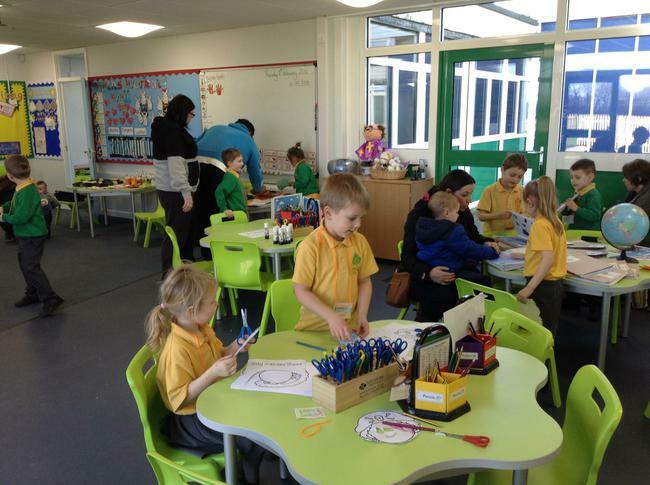 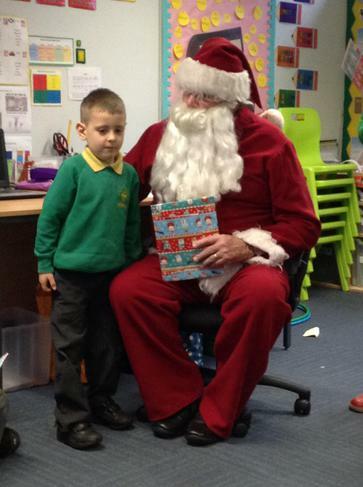 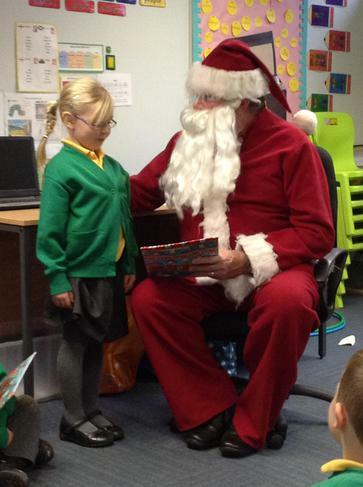 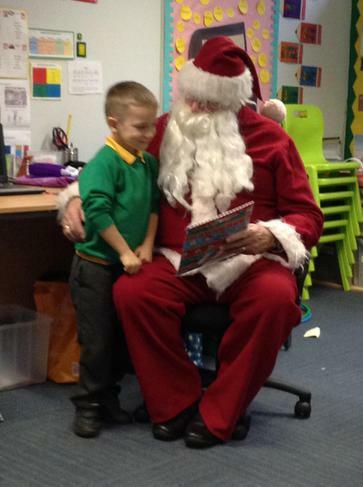 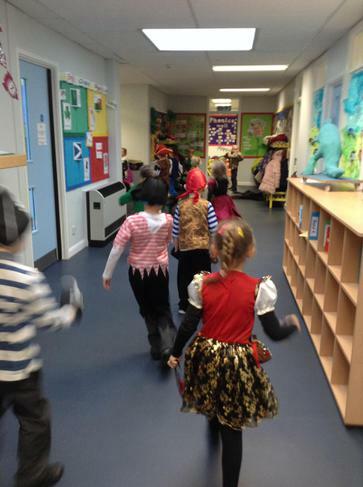 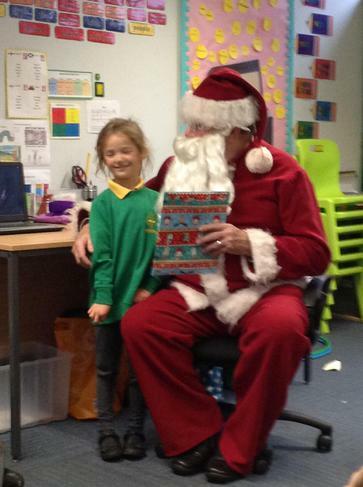 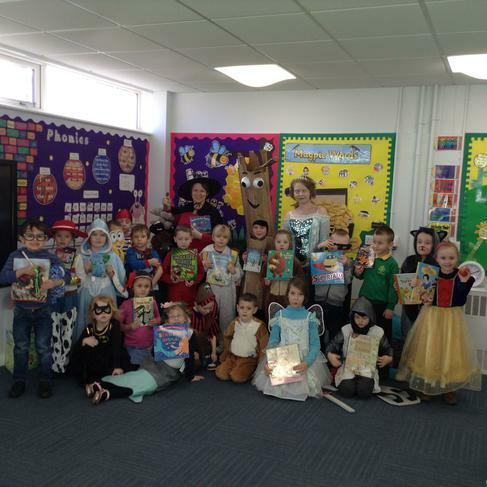 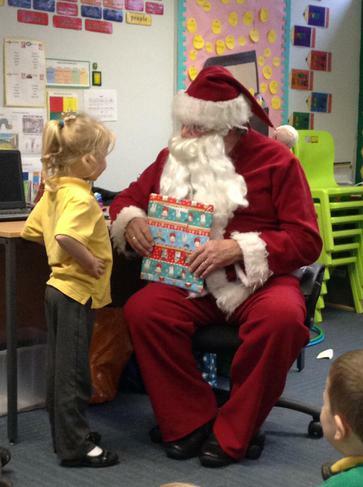 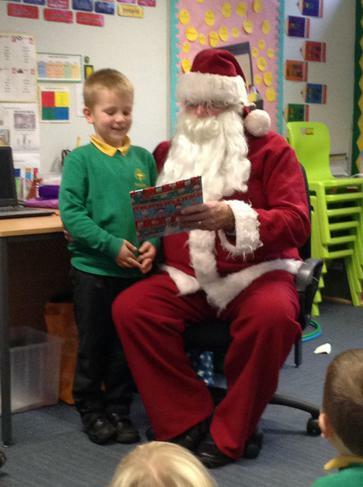 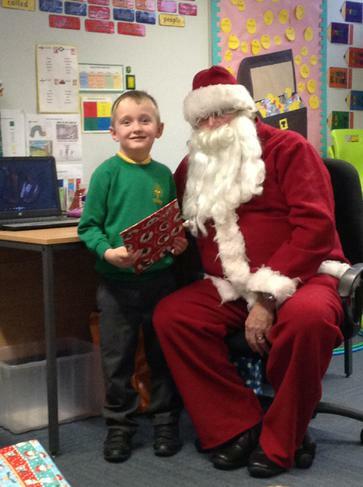 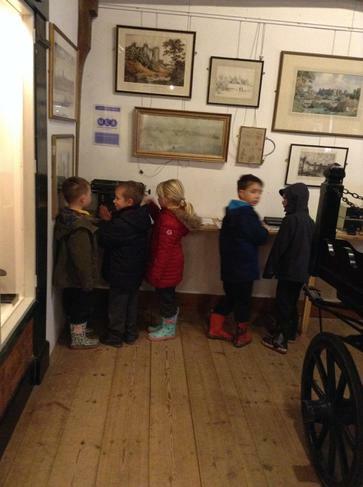 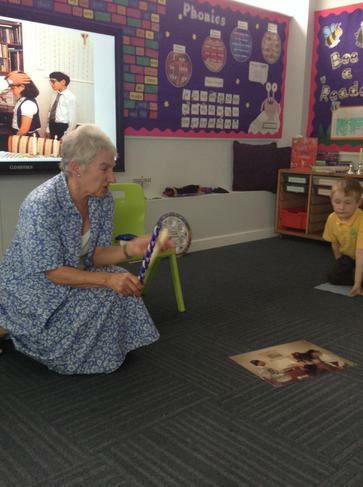 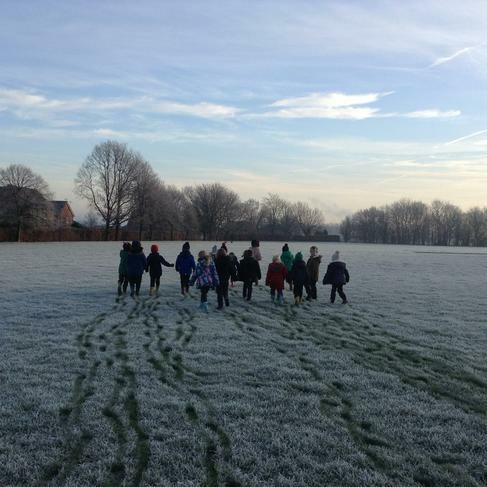 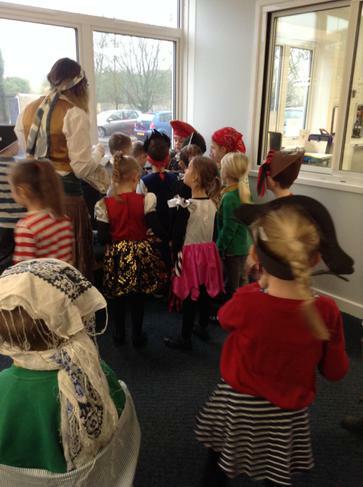 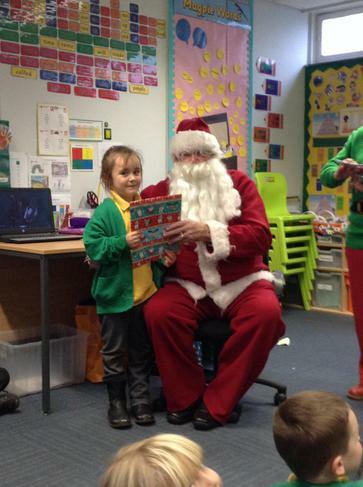 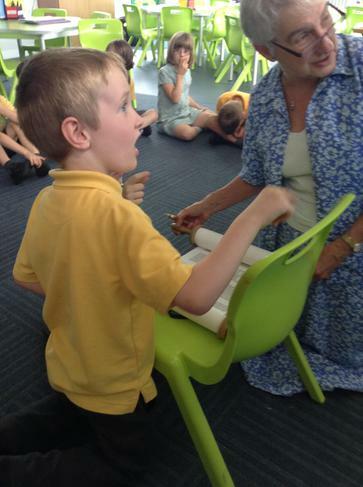 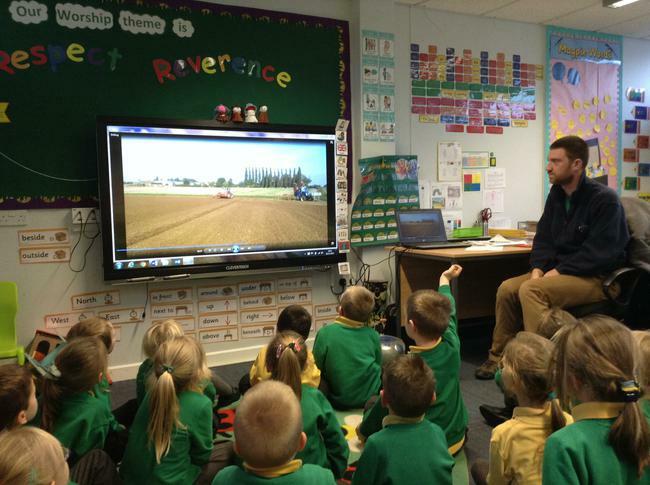 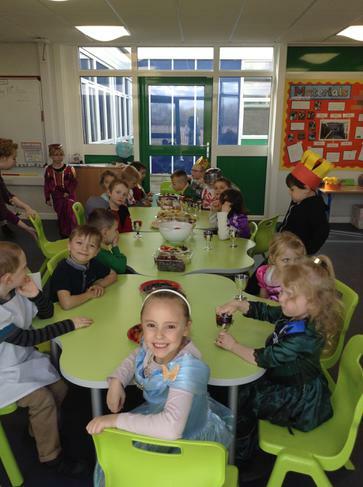 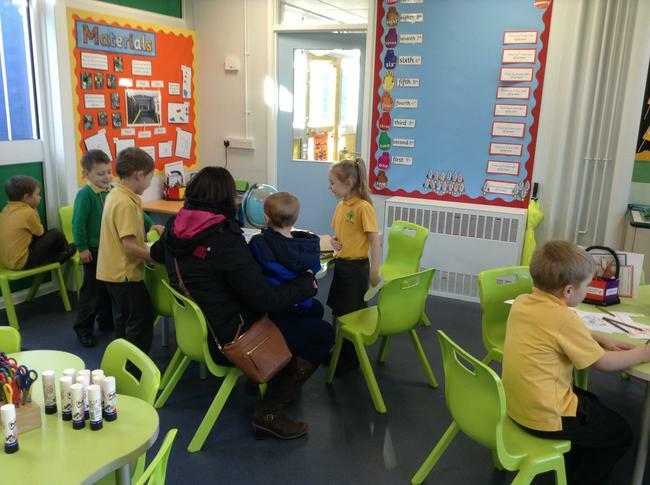 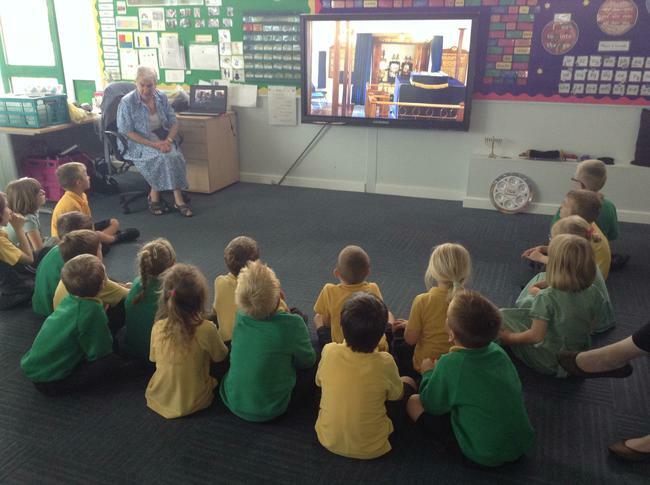 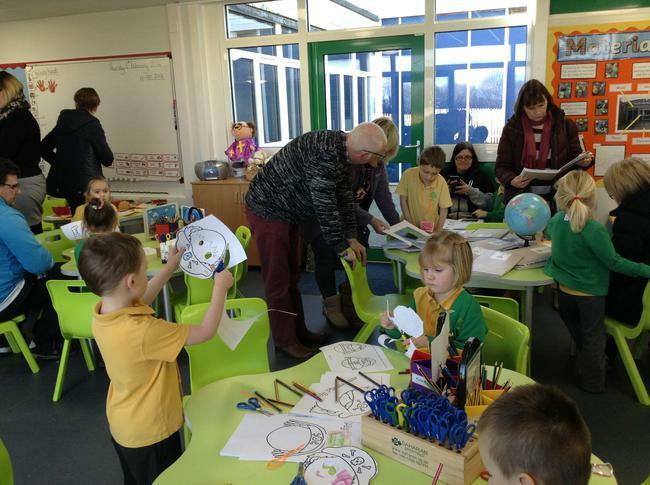 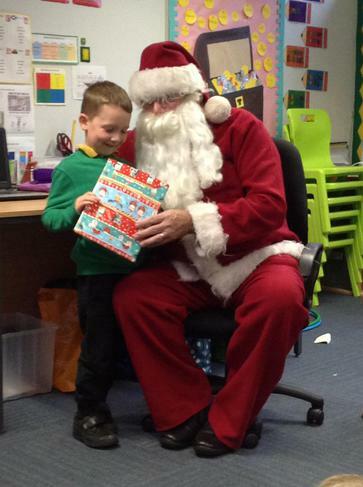 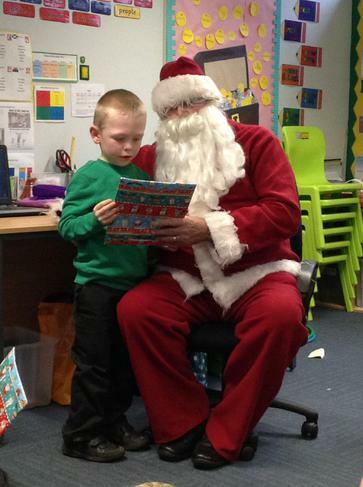 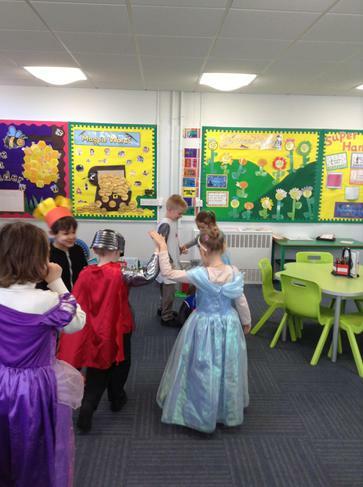 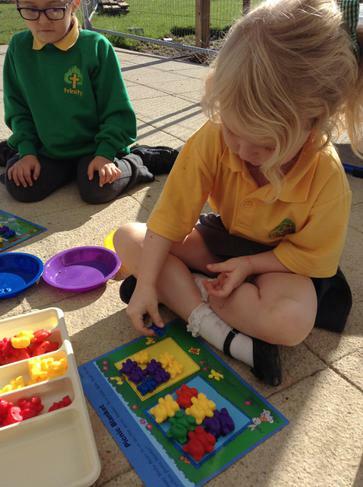 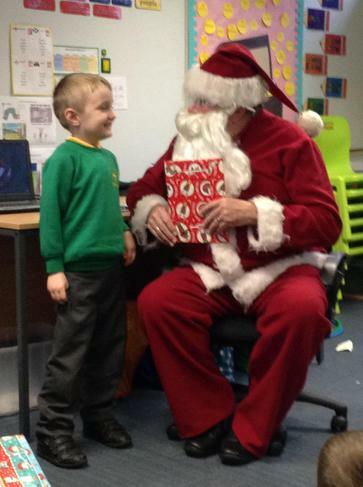 Please take a look at the photographs of the children enjoying their learning. 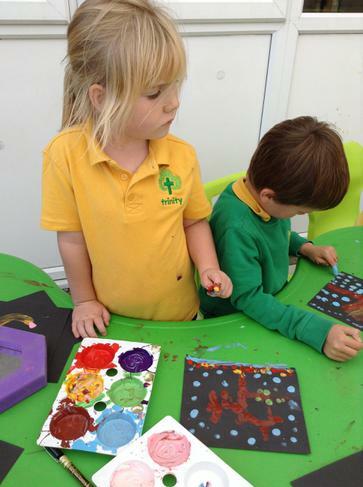 Rabbit Class have settled in extremely well and have produced some great work to start off this year. 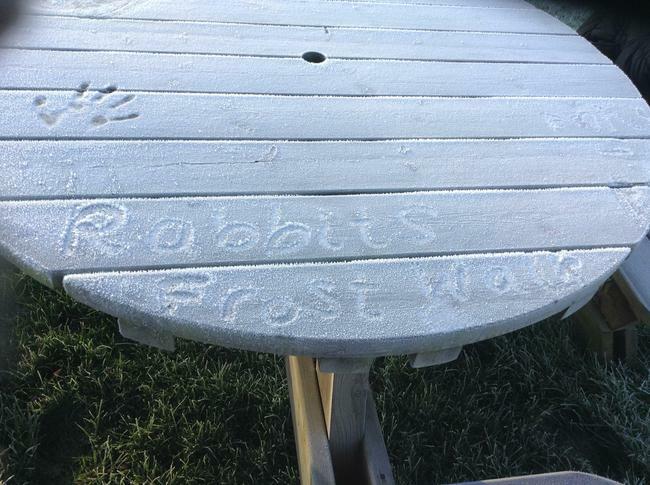 Keep up the hard work Rabbits! 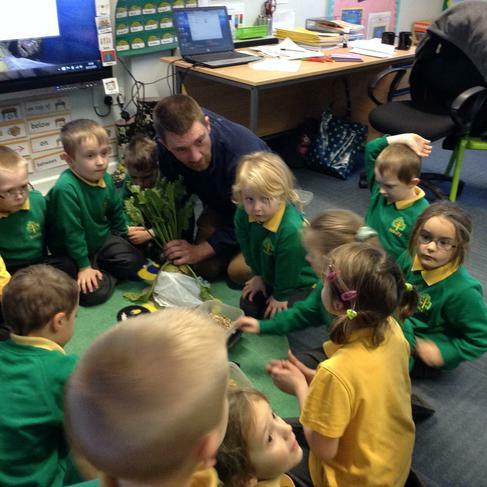 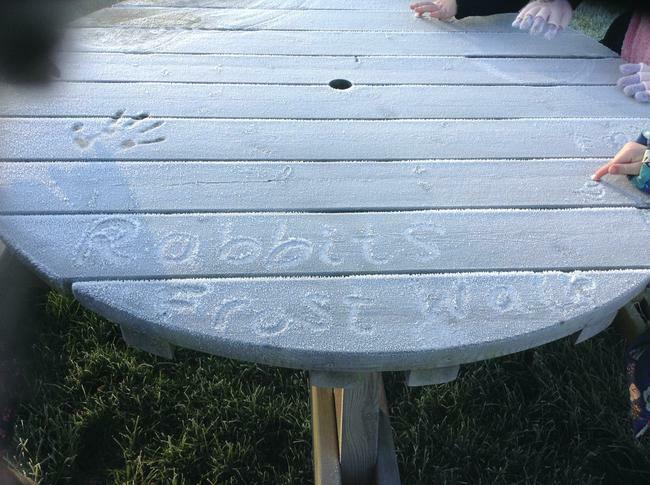 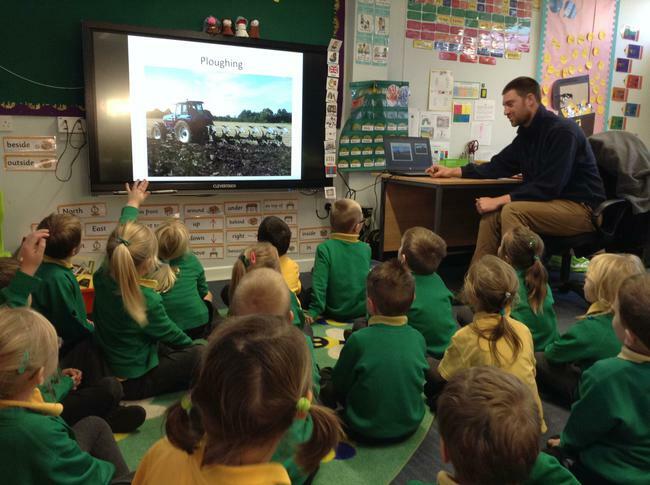 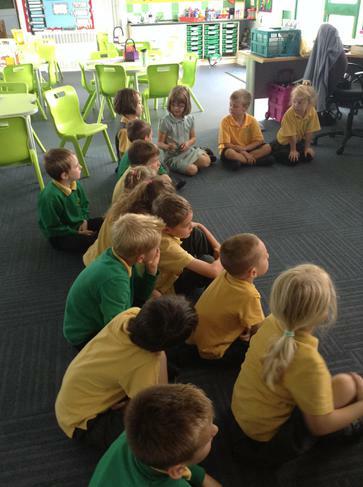 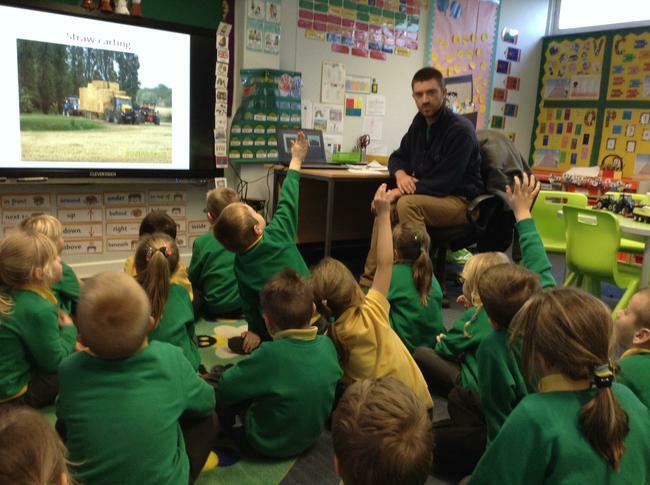 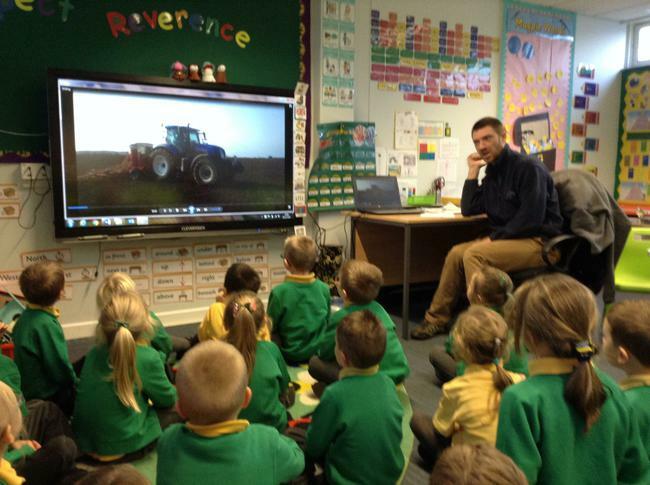 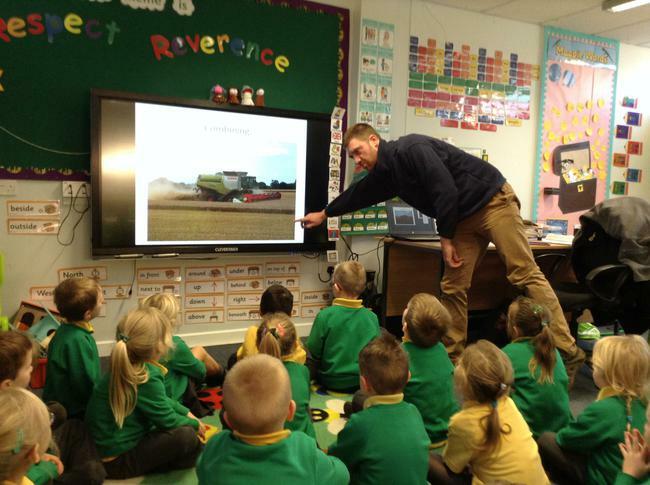 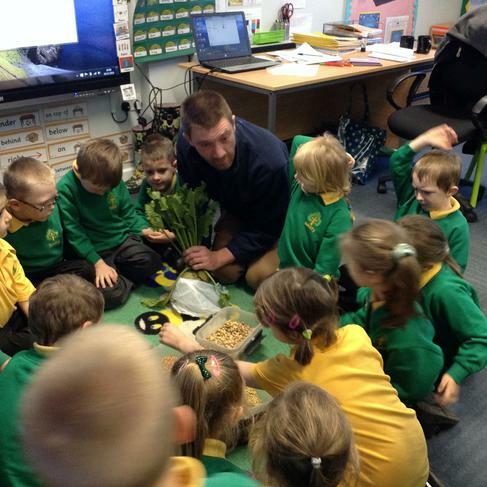 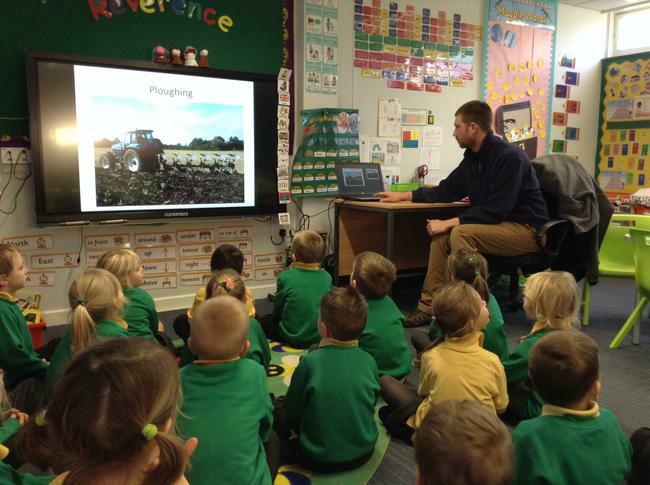 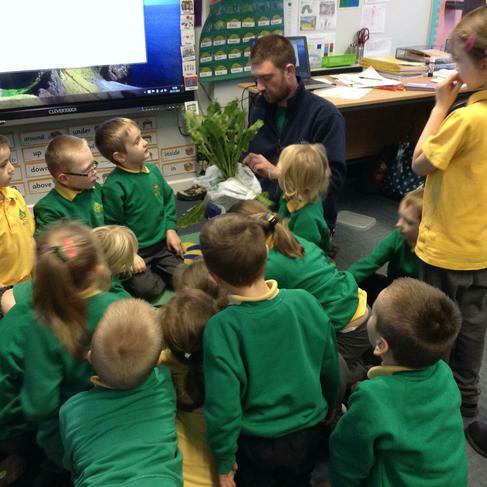 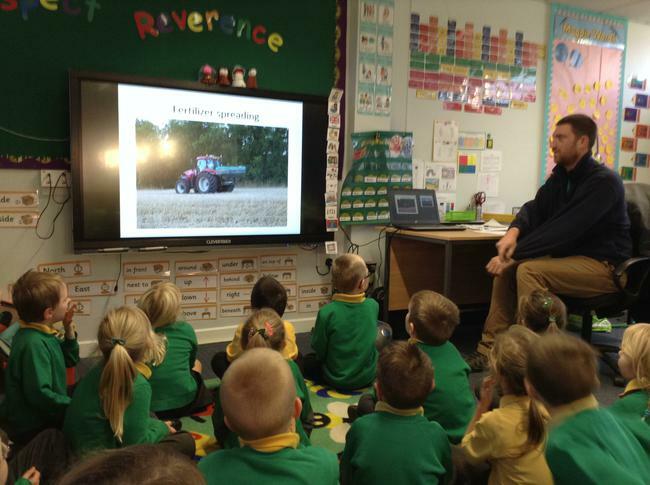 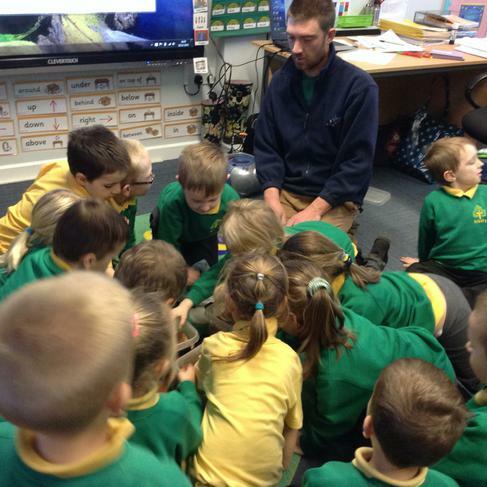 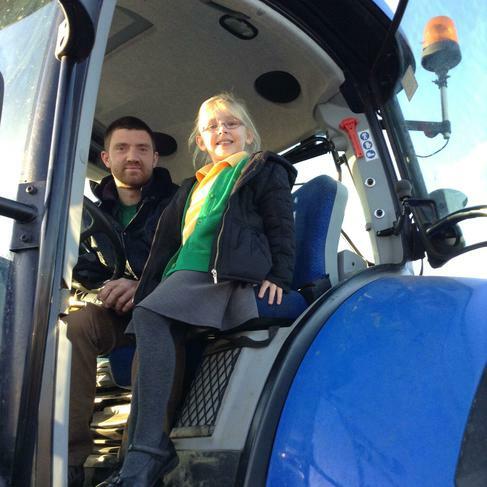 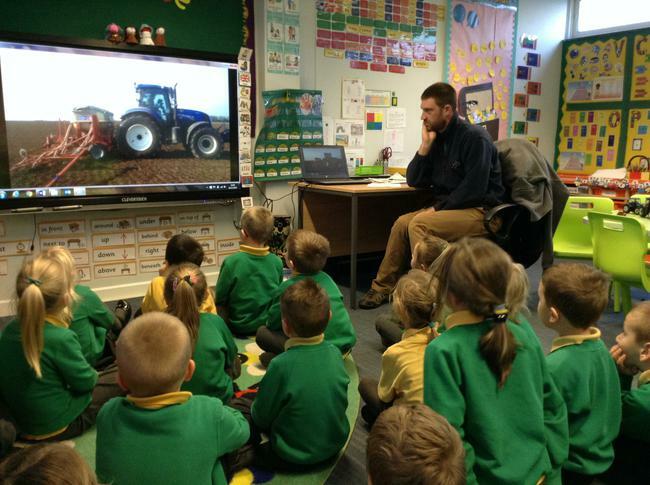 Just to keep you informed we have an student teacher in Rabbit Class this term. 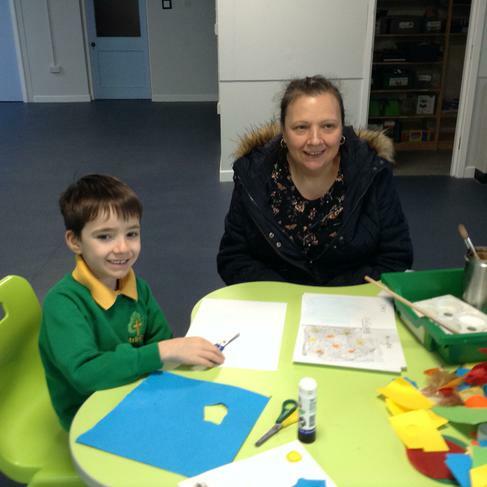 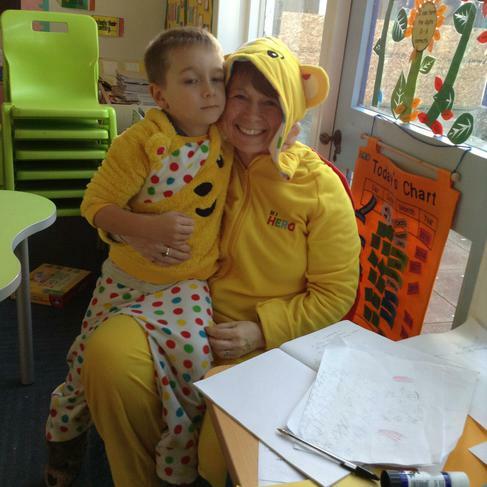 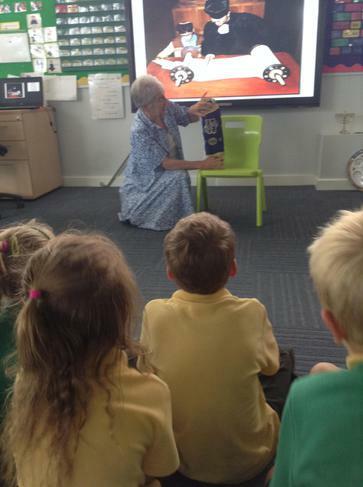 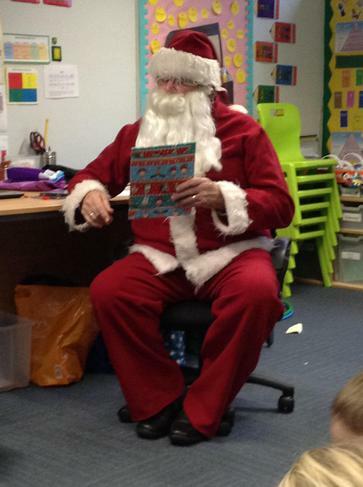 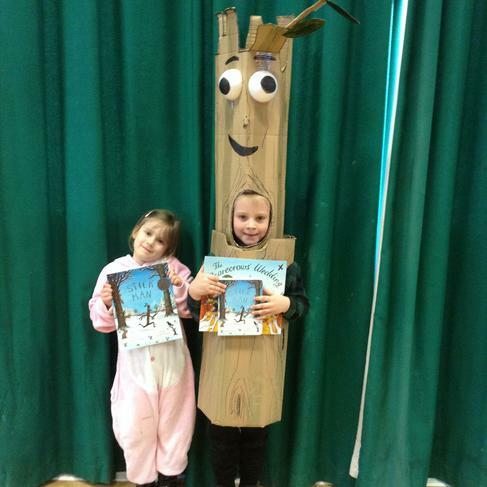 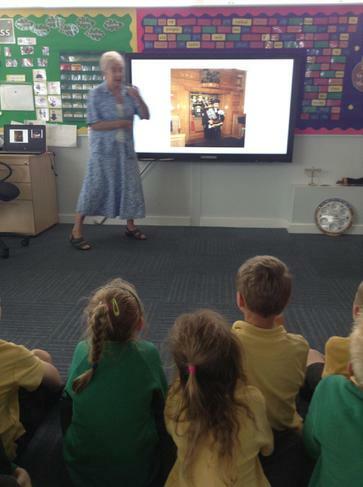 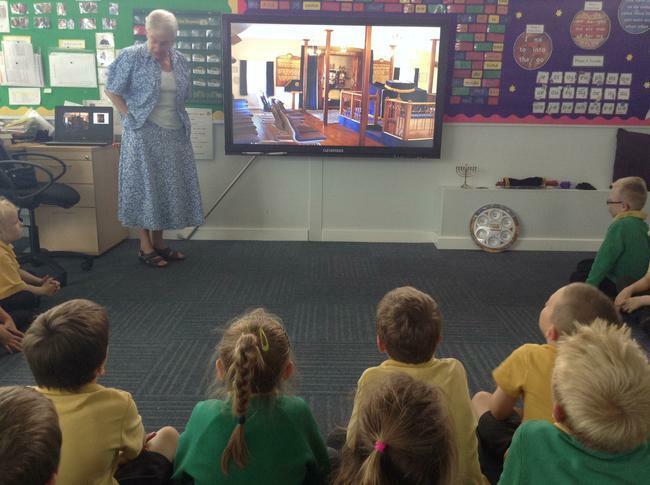 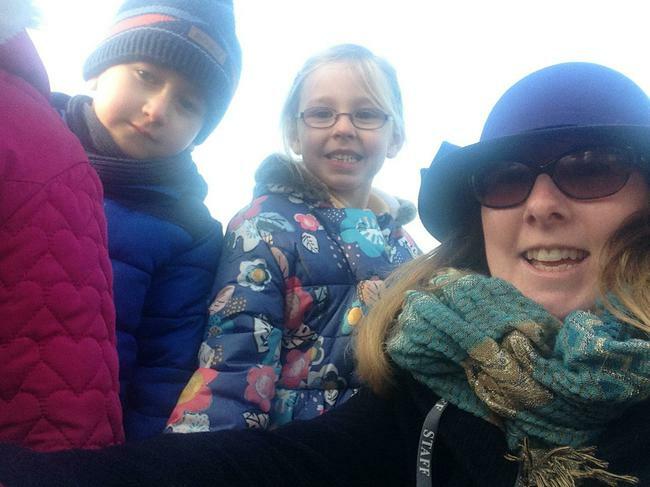 Mrs Appleby with be working alongside Mrs Bell and you may see her on a weekly/ daily basis. 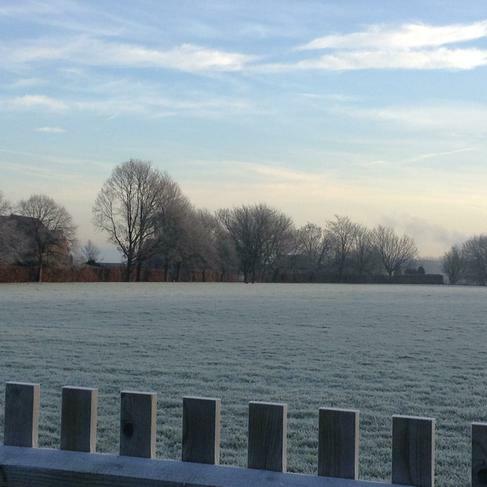 Reminders: Please make sure that your child's uniform and water bottles are clearly labelled. 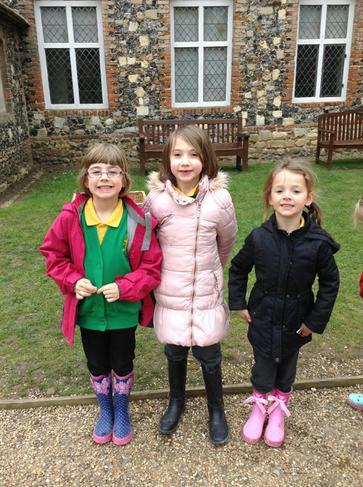 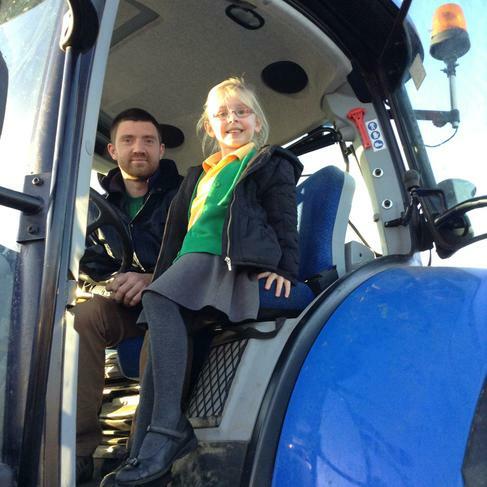 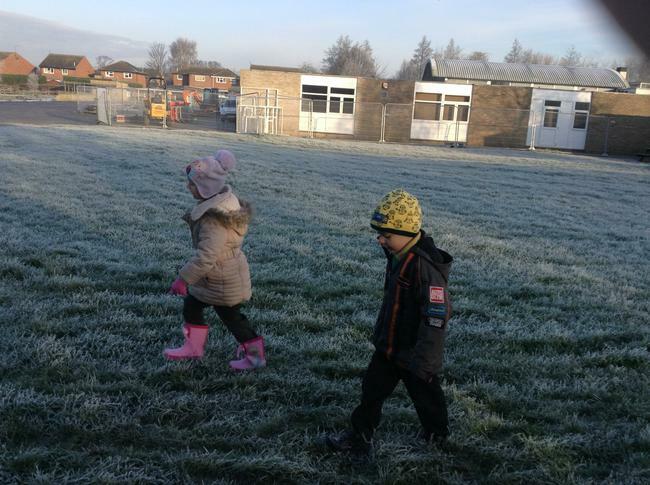 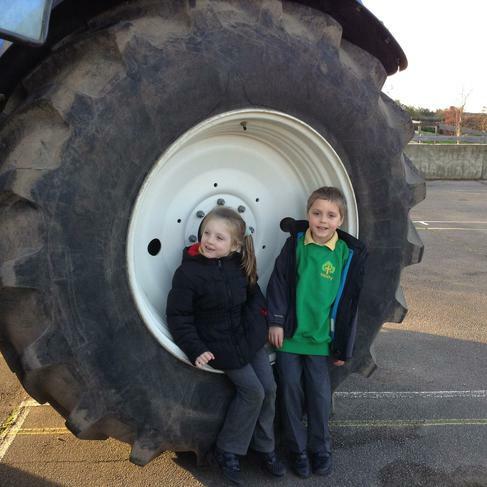 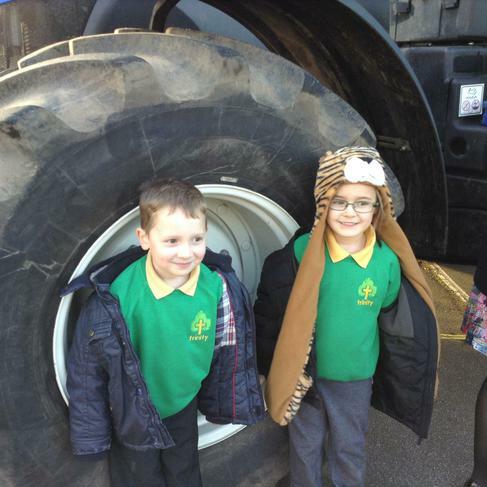 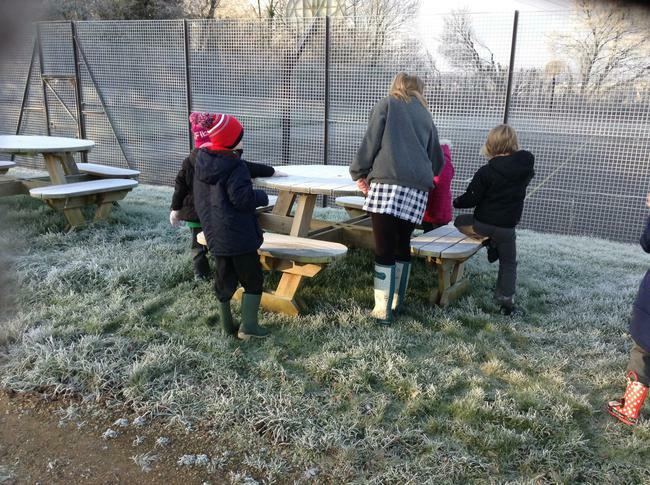 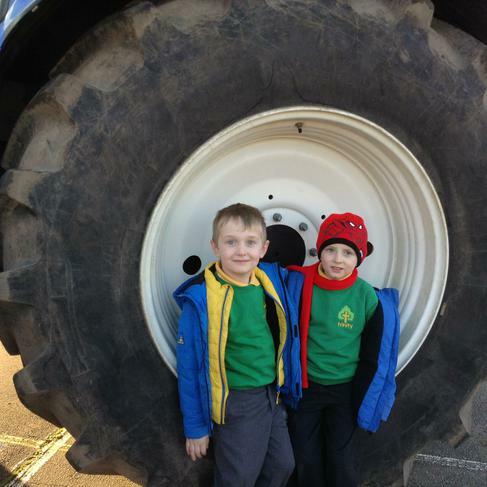 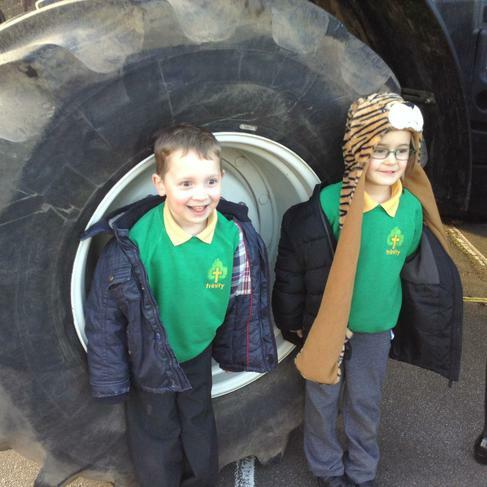 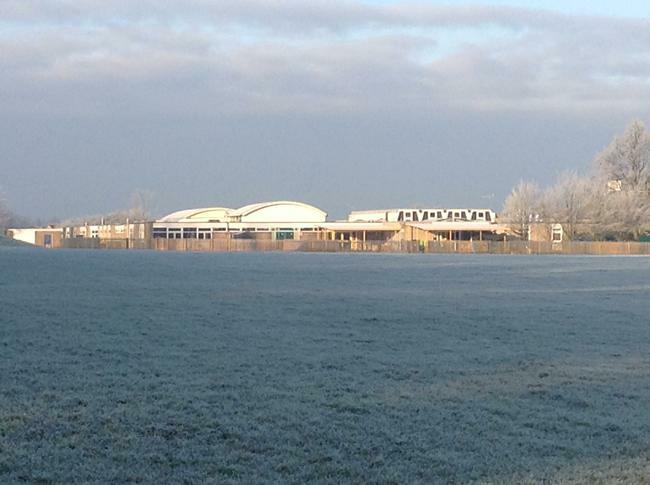 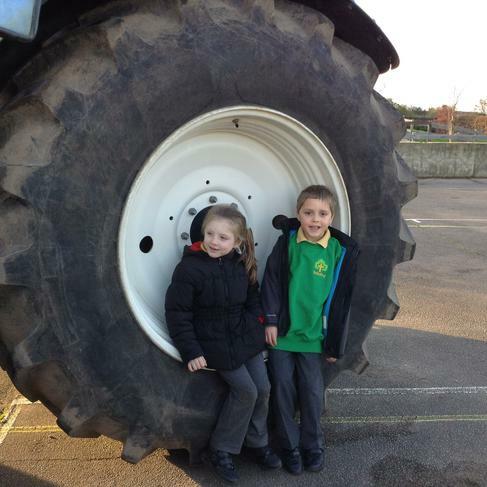 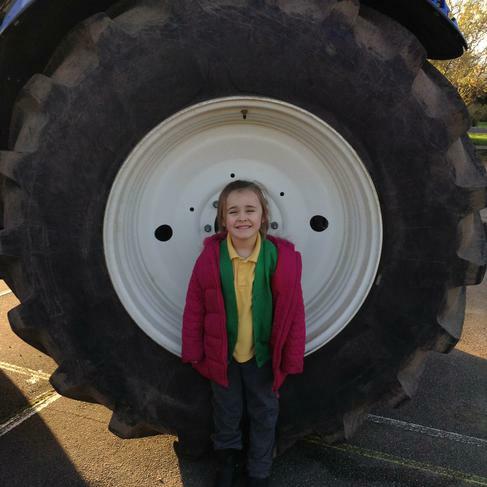 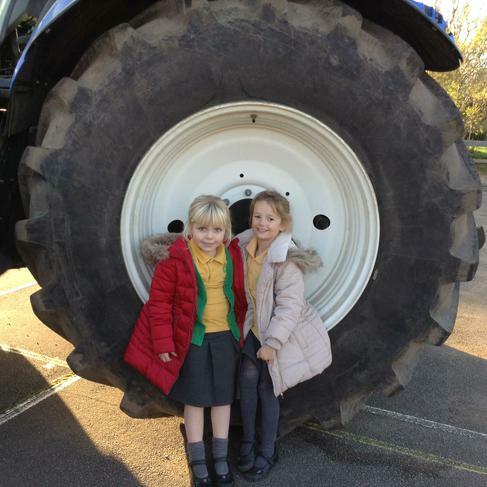 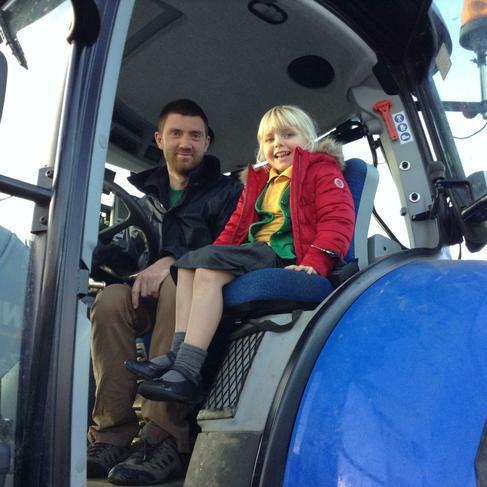 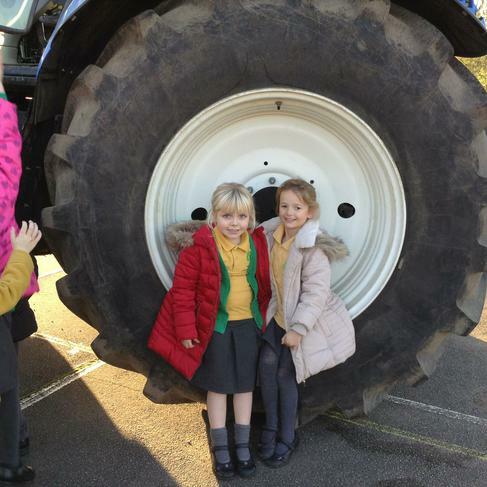 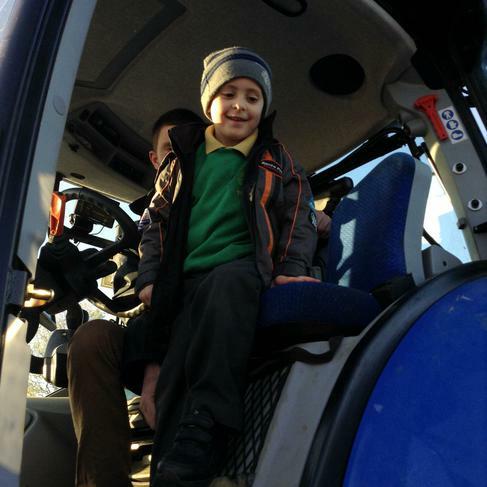 Wellie boots are needed for lunch times and outside learning, so please remember to bring a pair into school. 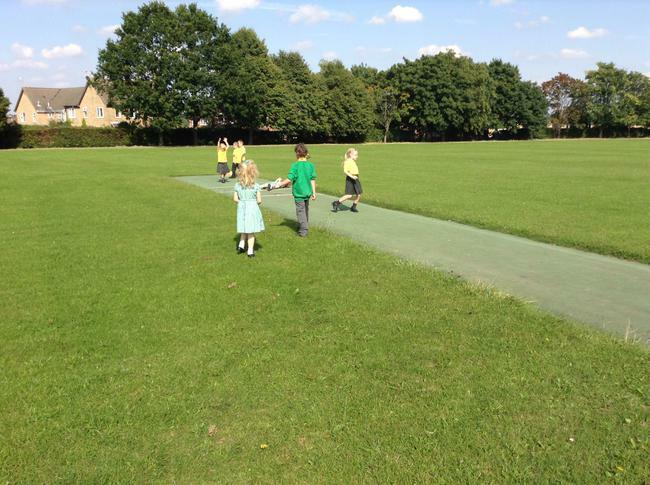 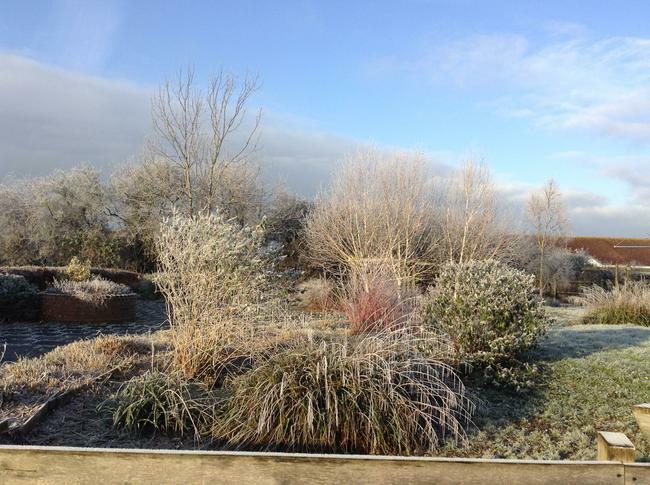 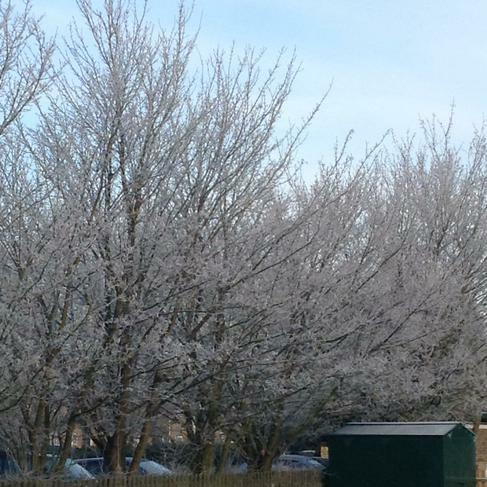 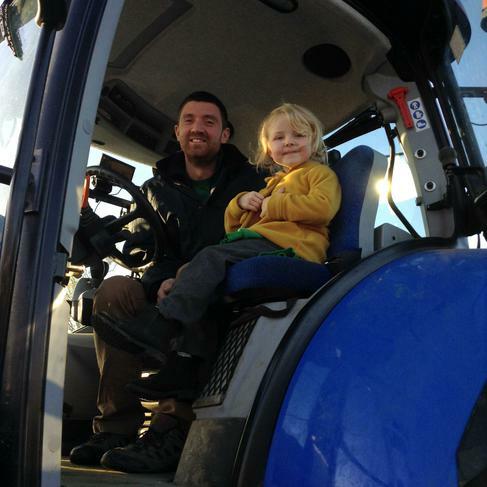 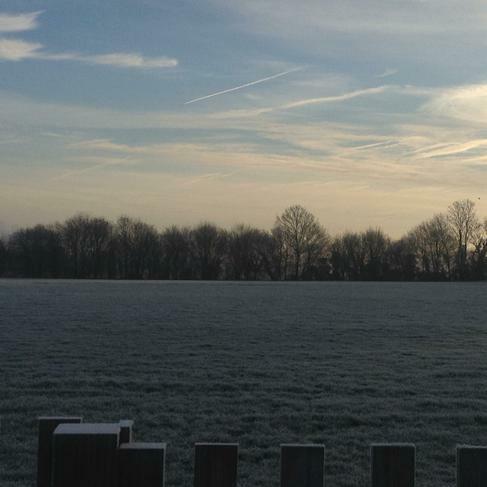 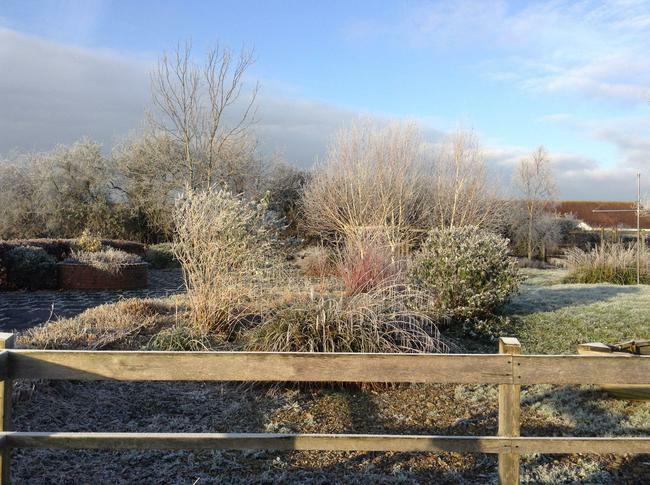 We will be using our fantastic grounds more often! 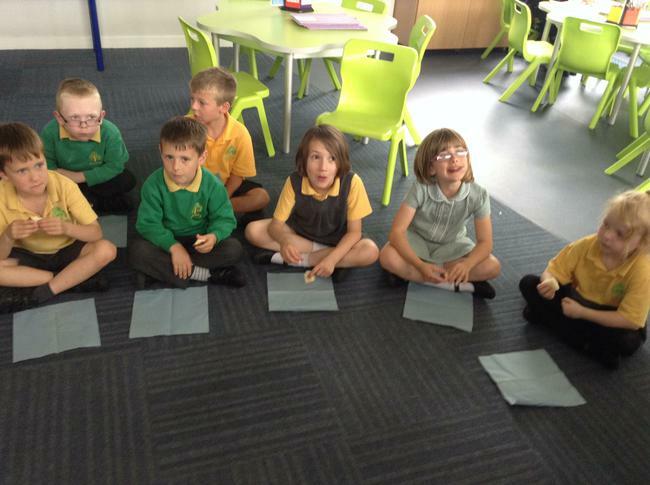 Spellings will be set on Monday 14th September and the children will be tested on this spellings the following week. 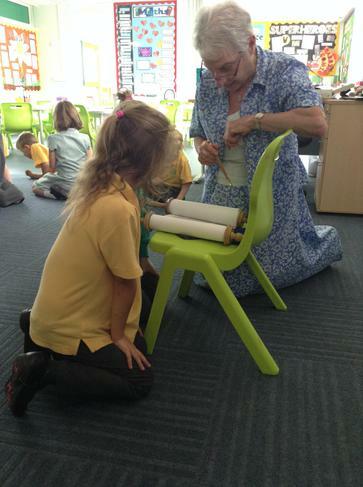 Spellings will be set weekly. 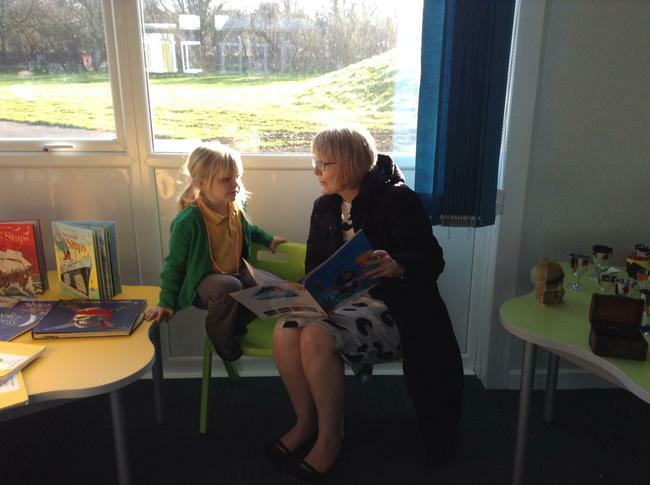 Remember, if you have any questions regarding the curriculum or about your child's school day please talk to me at the end of the day.